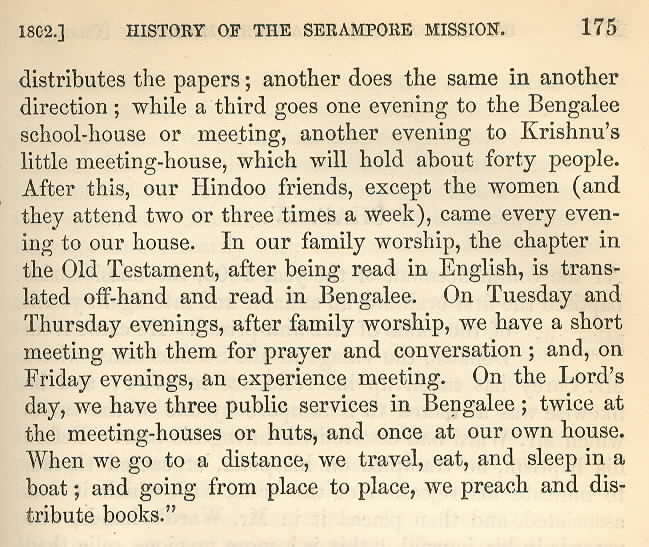 Embracing the History of the Serampore Mission. 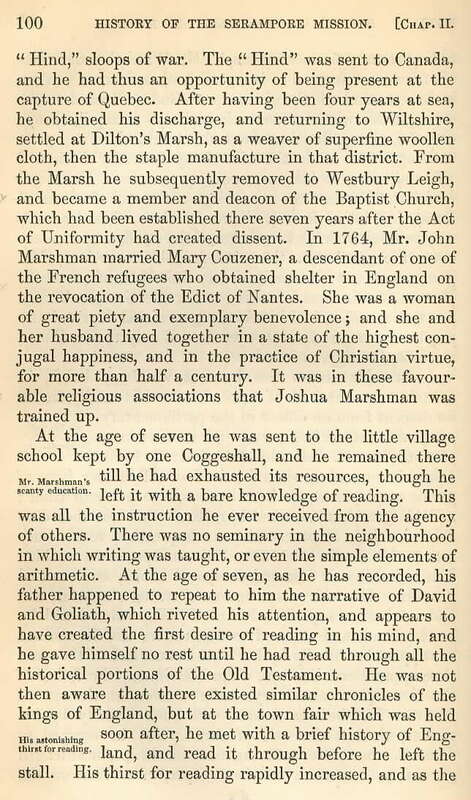 John Clark Marshman, son of Joshua and Hannah Marshman, was born in August, 1794. 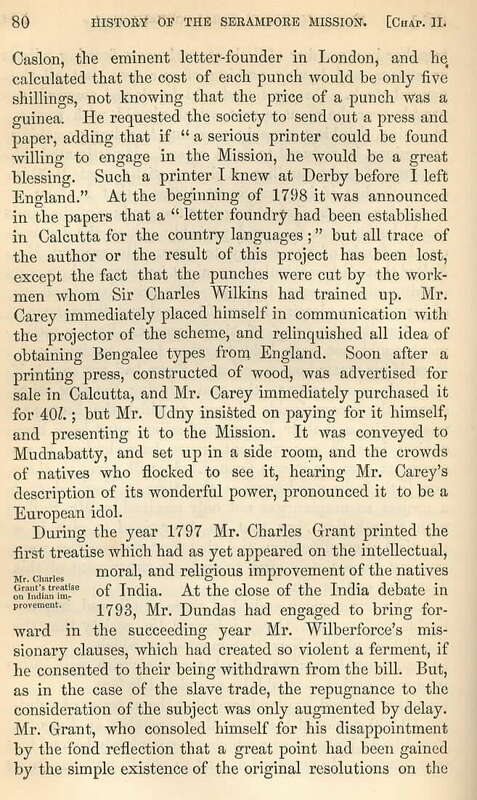 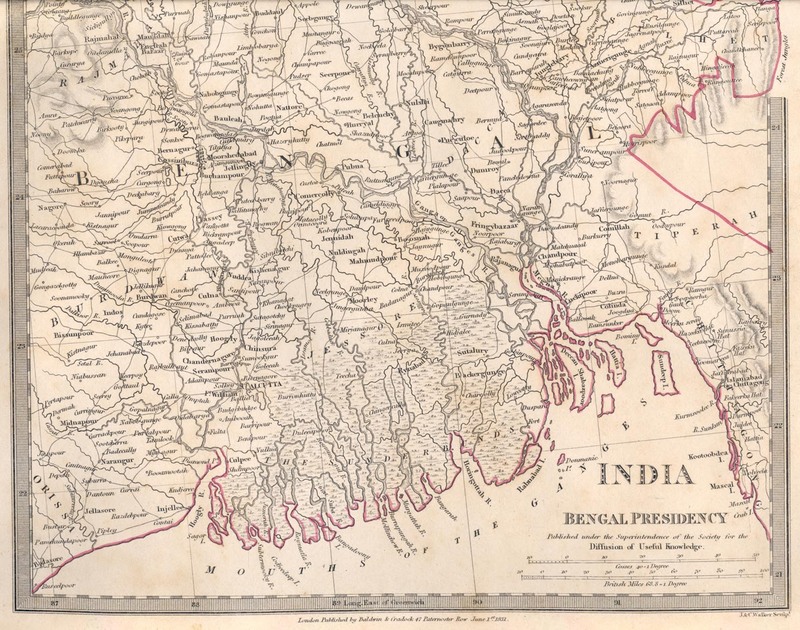 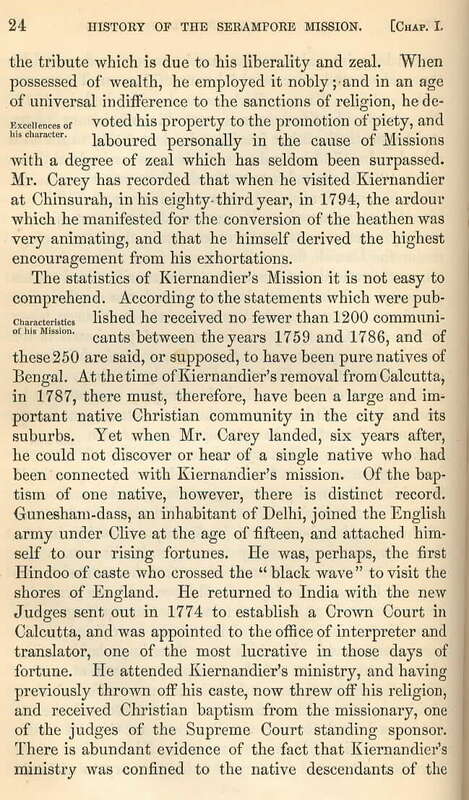 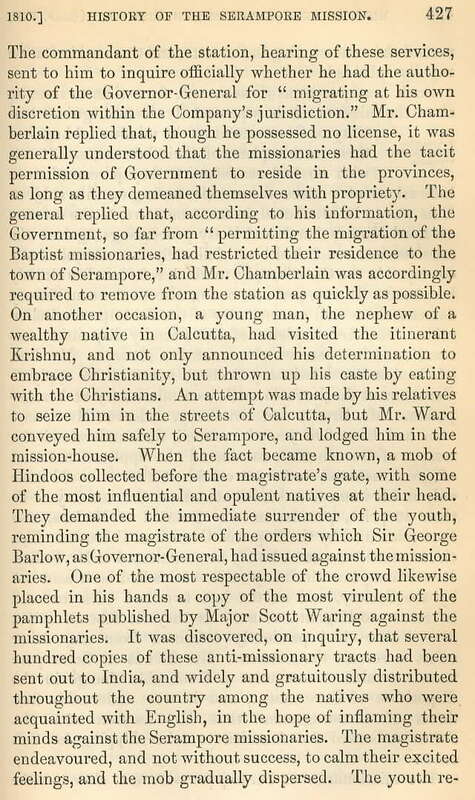 With his parents and William Ward in 1799, he traveled to Serampore, India, as they joined William Carey at the Serampore Mission. 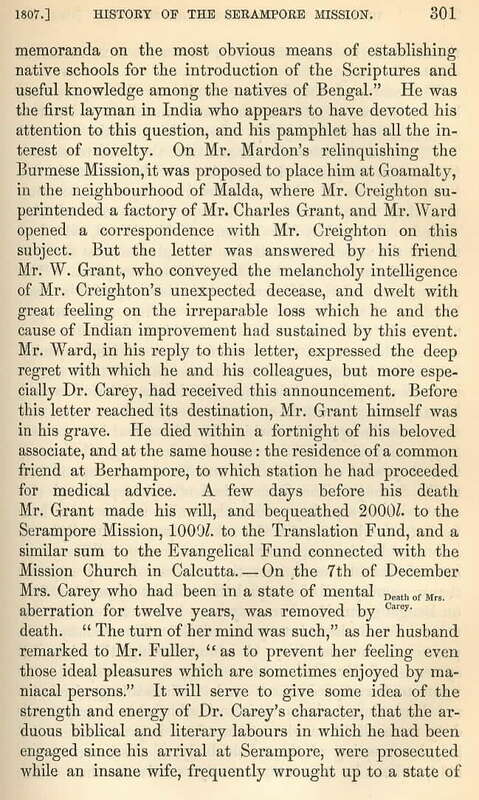 Carey, Marshman, and Ward later became known as the Serampore Trio. 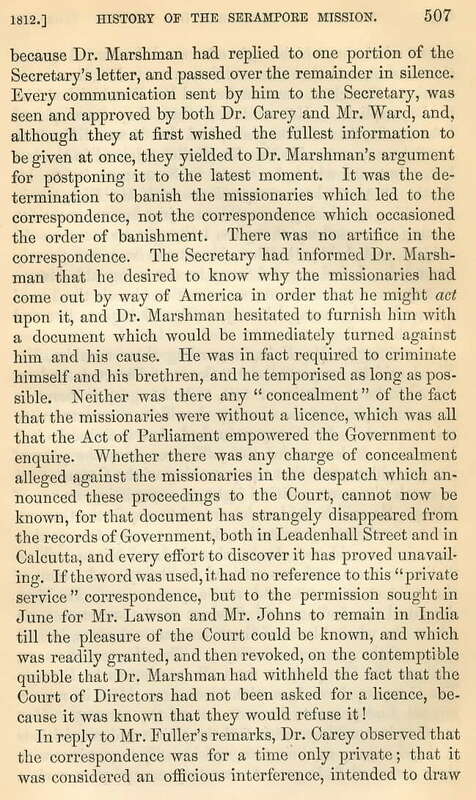 As a young man, John Clark Marshman helped direct his father's activities in India, and he aided the mission efforts in fund-raising. 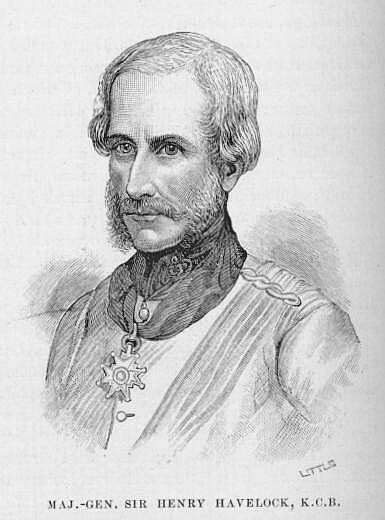 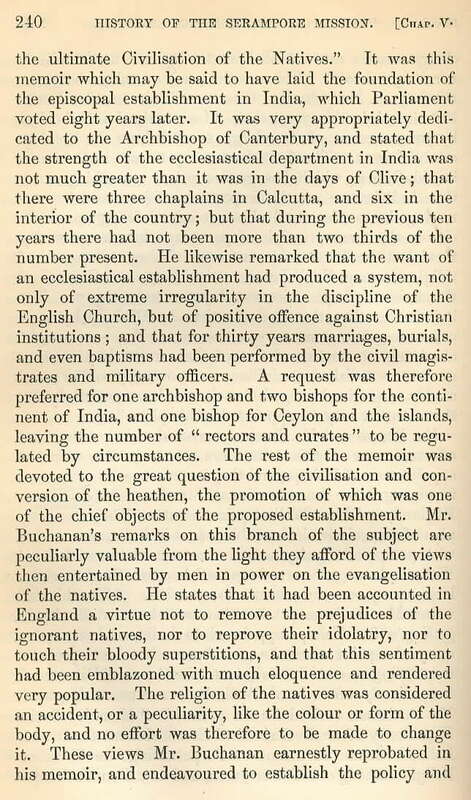 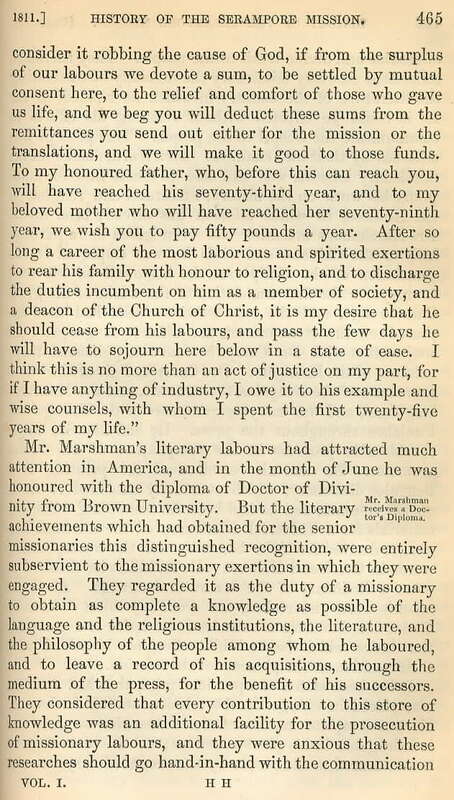 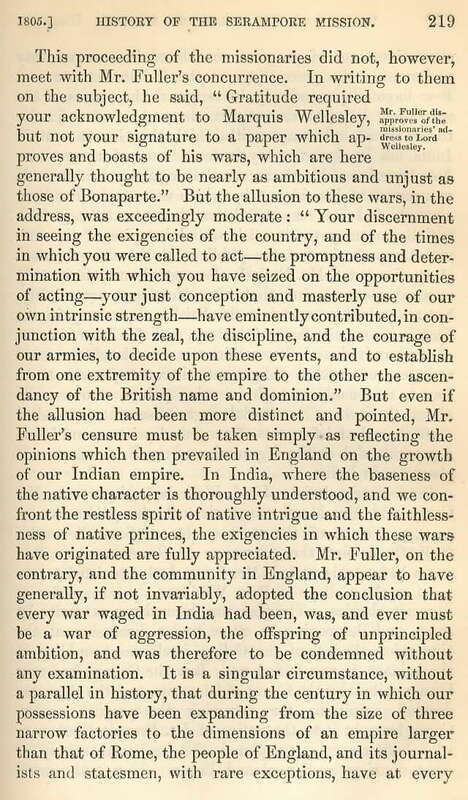 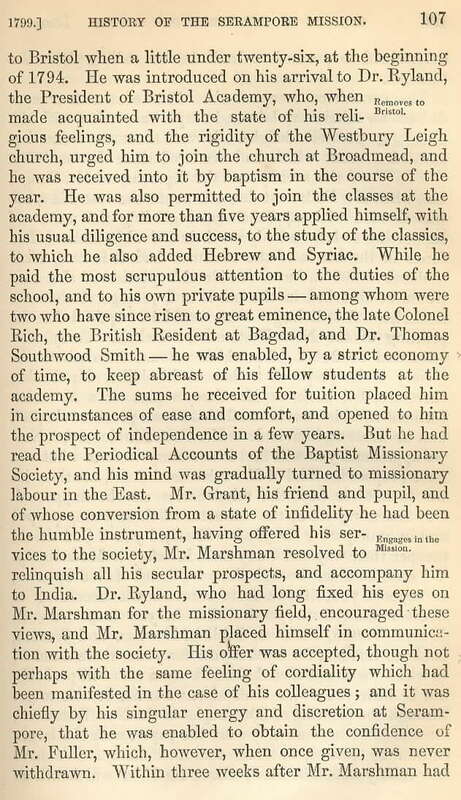 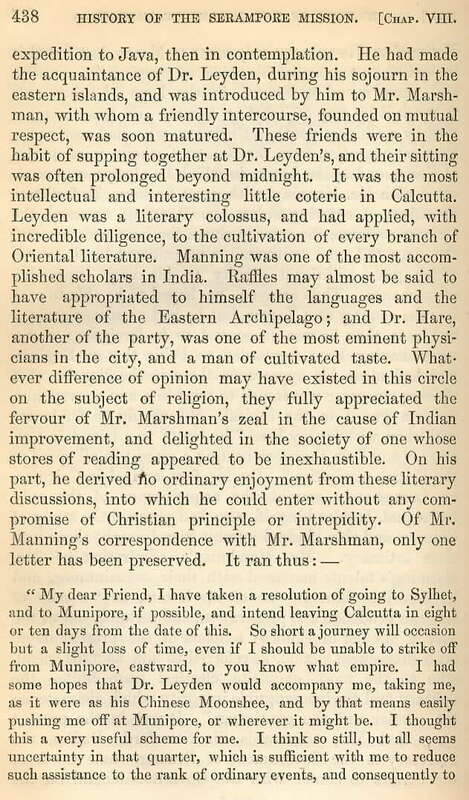 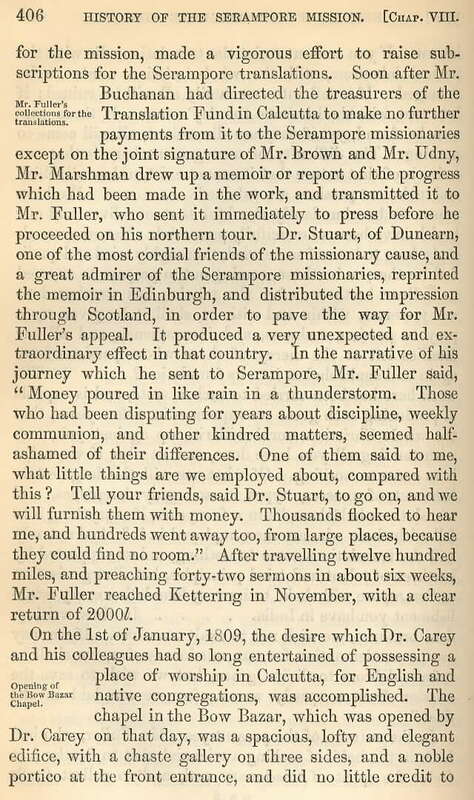 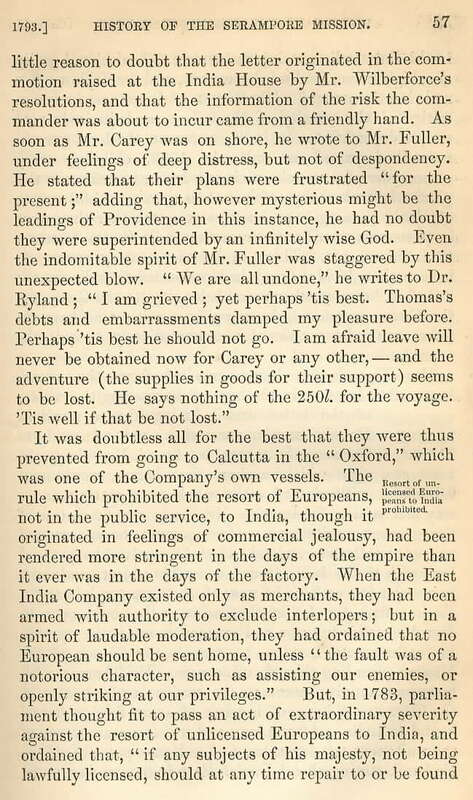 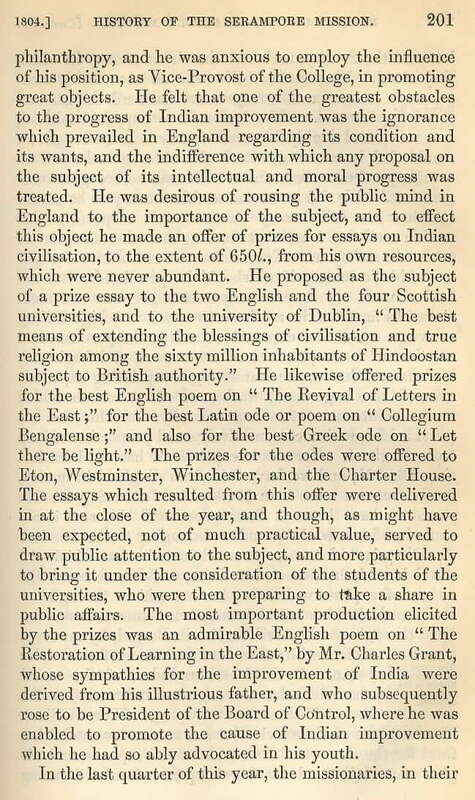 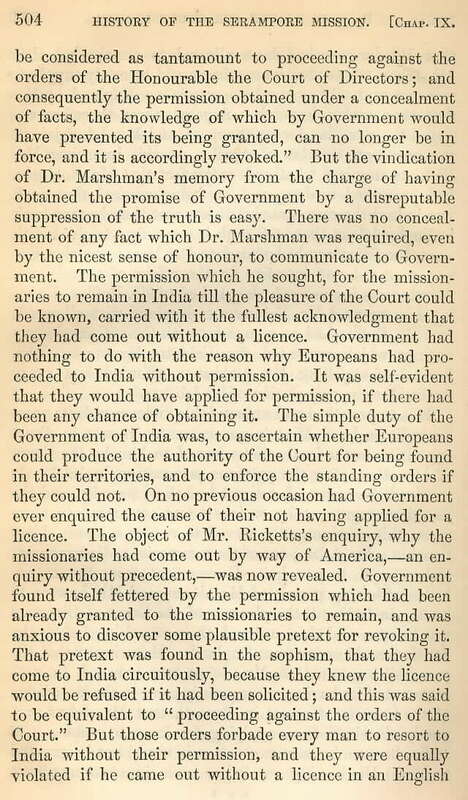 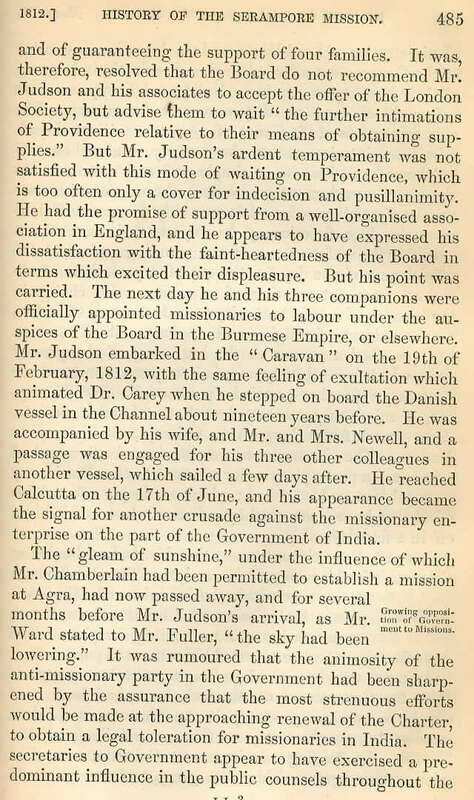 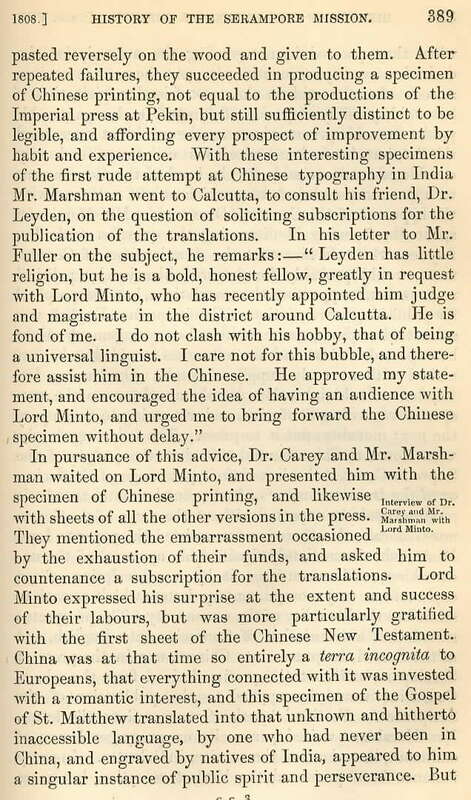 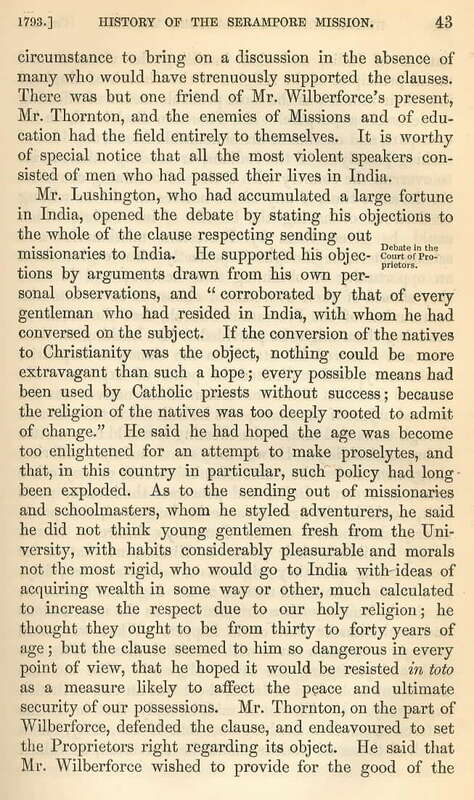 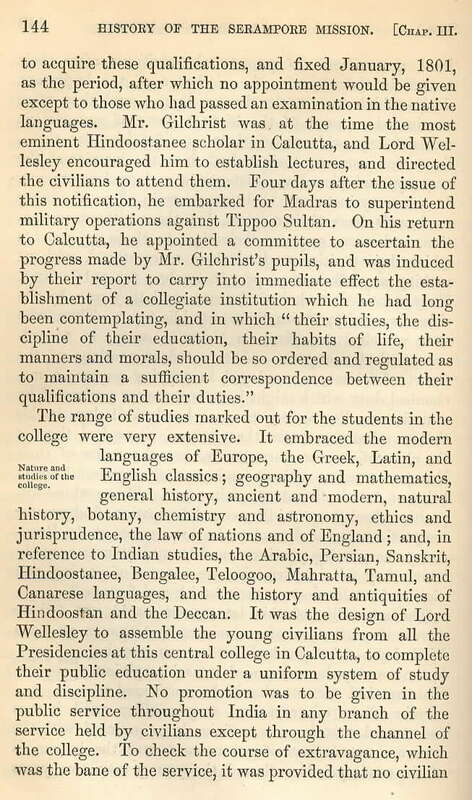 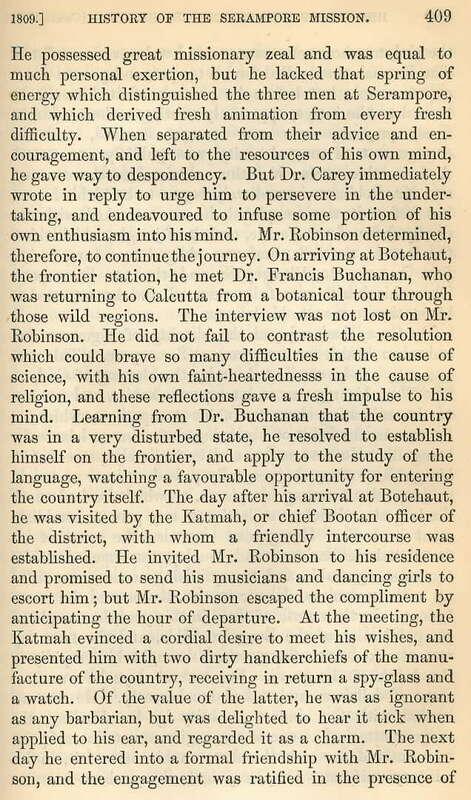 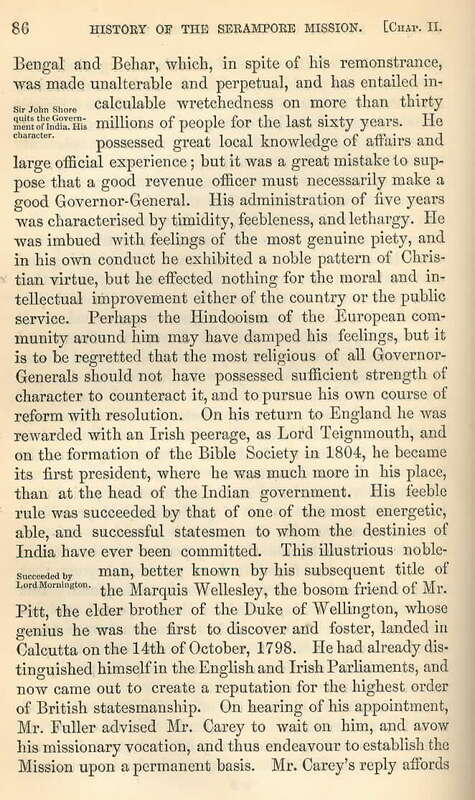 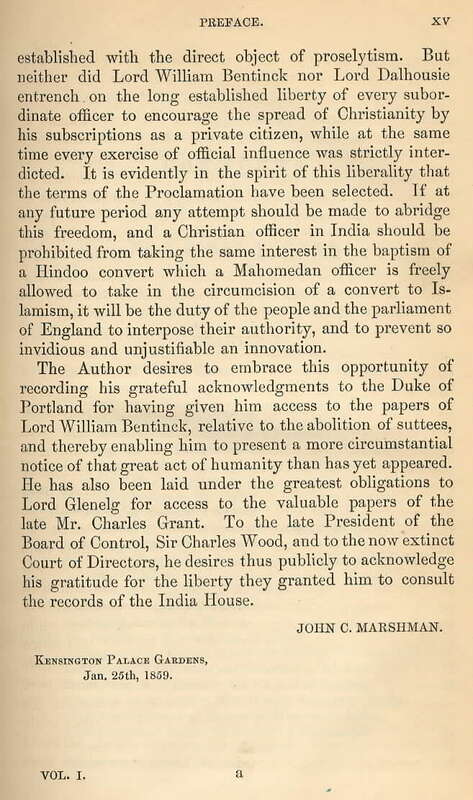 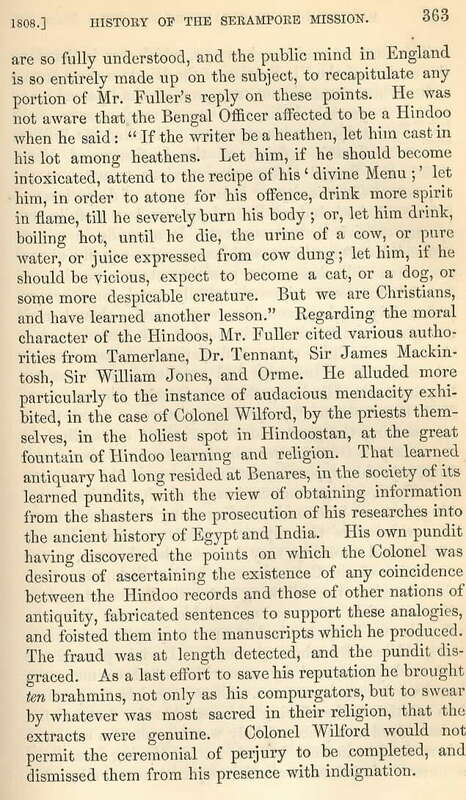 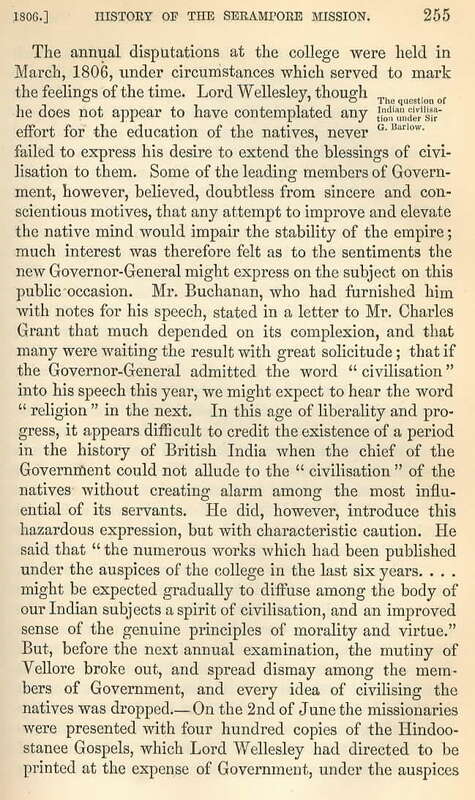 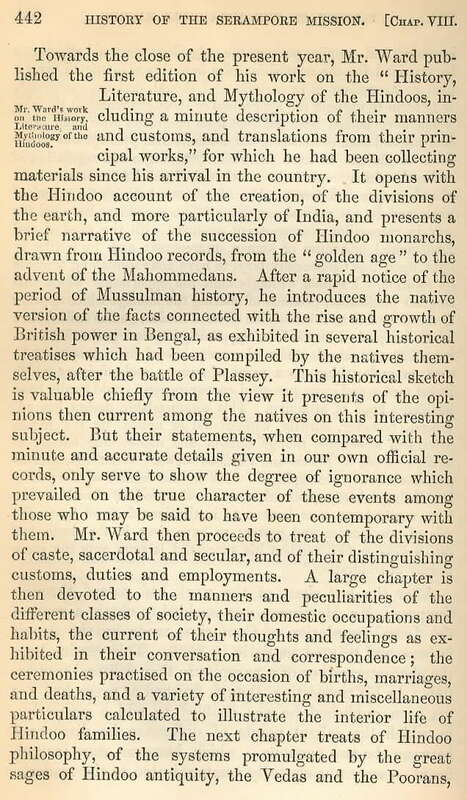 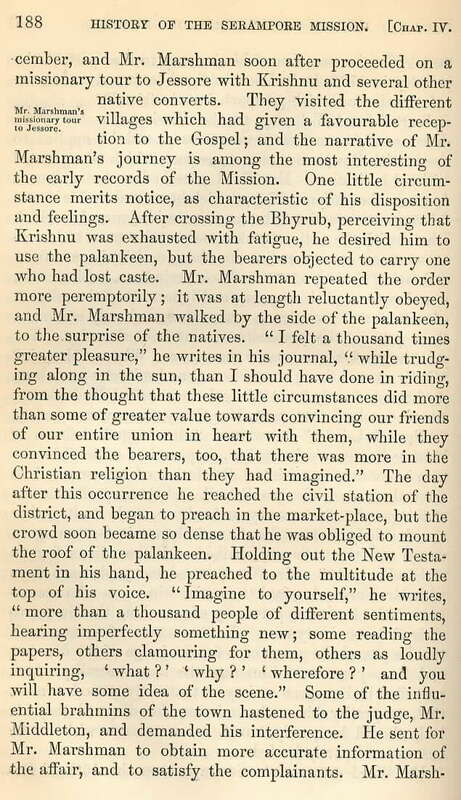 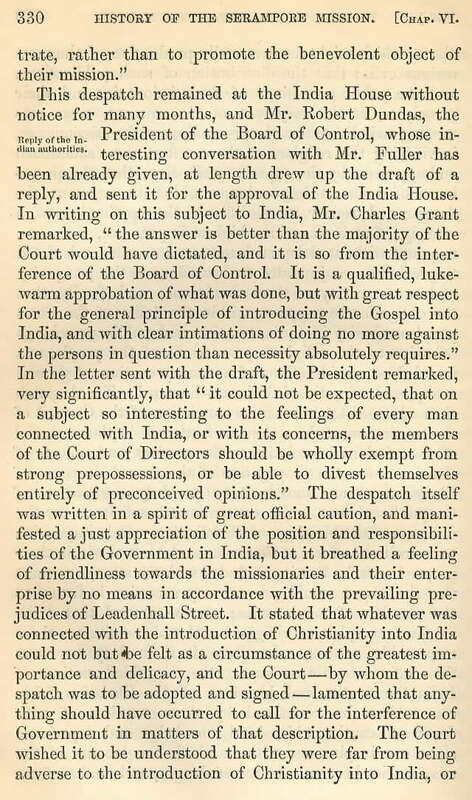 Several of John Clark Marshman's accomplishments in India were outstanding. 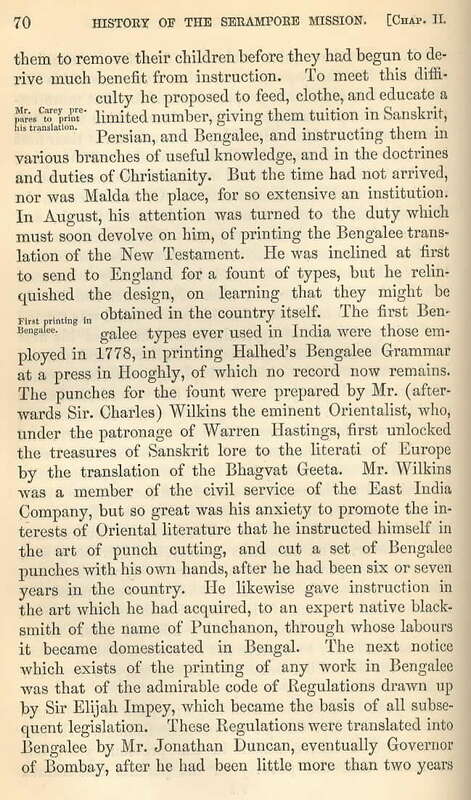 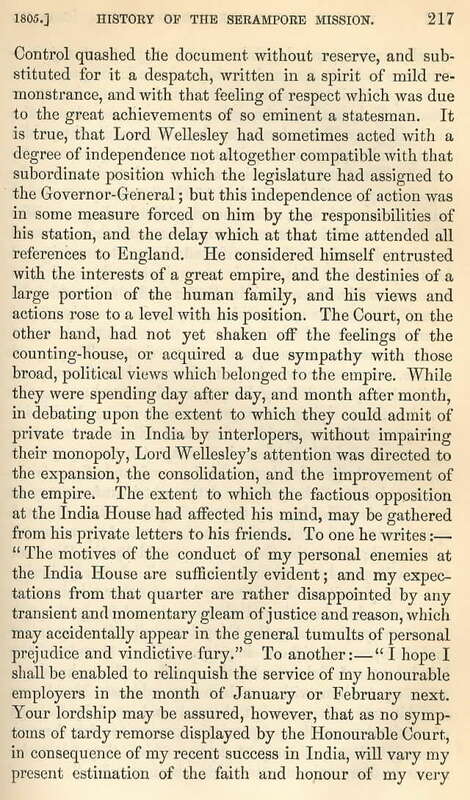 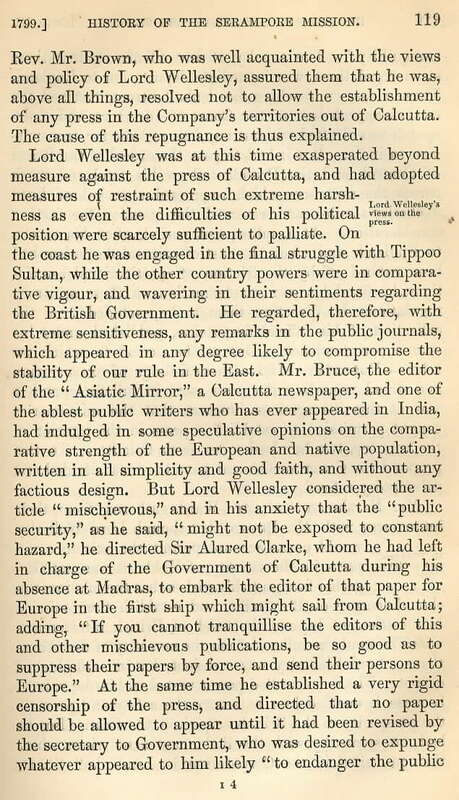 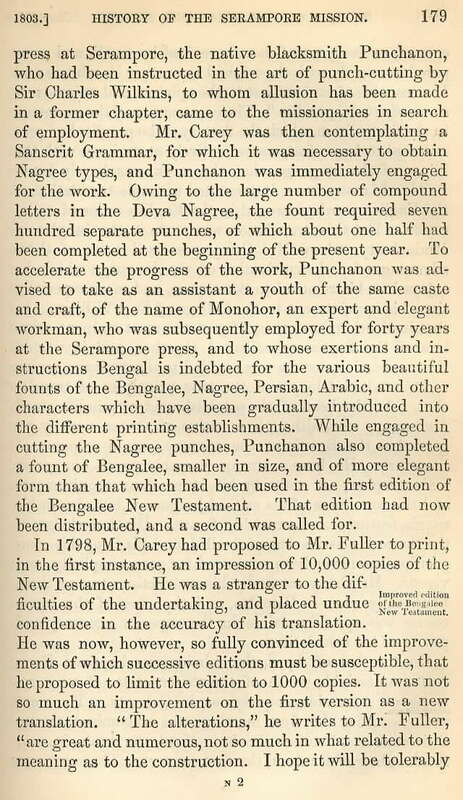 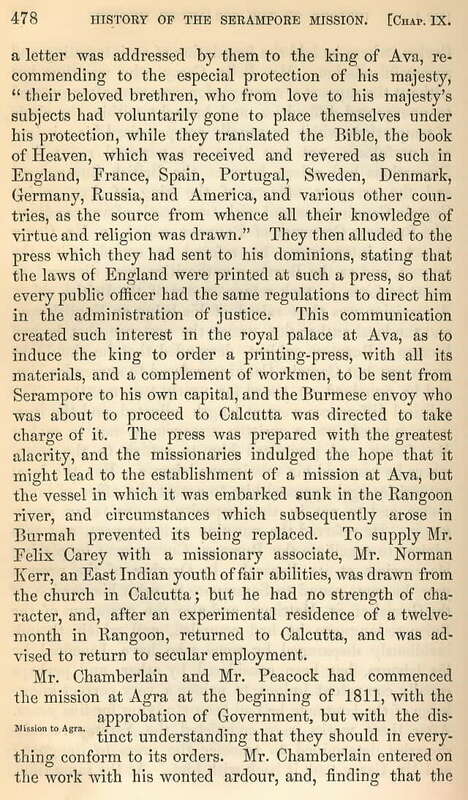 He established the first newspaper in Bengali (i.e., "Sumachar Durpun") and, with his father, the first English magazine in India, "The Friend of India" (1818). 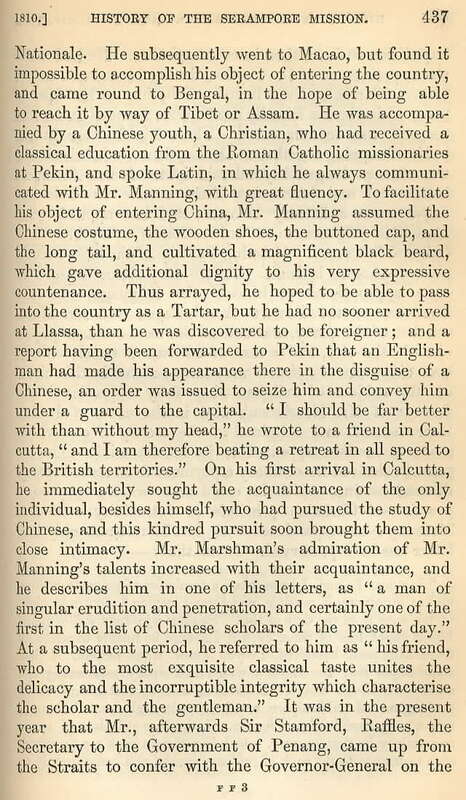 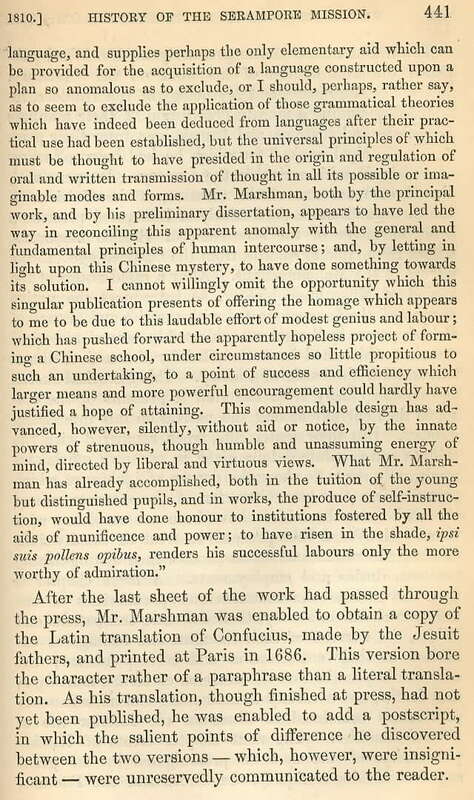 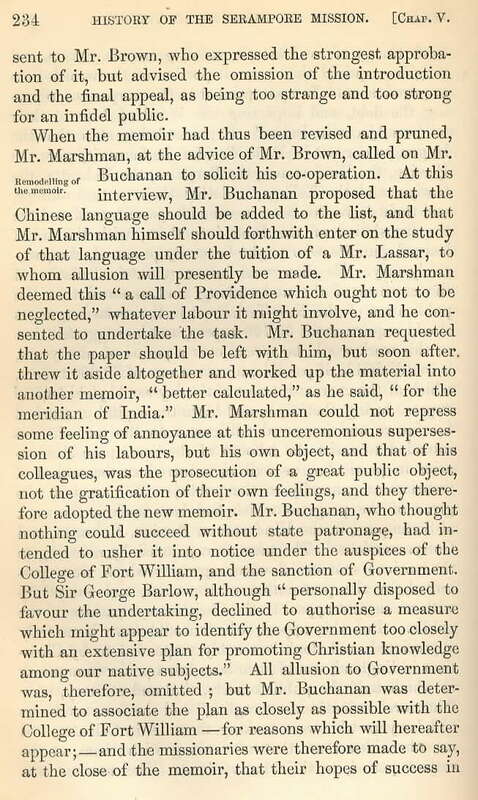 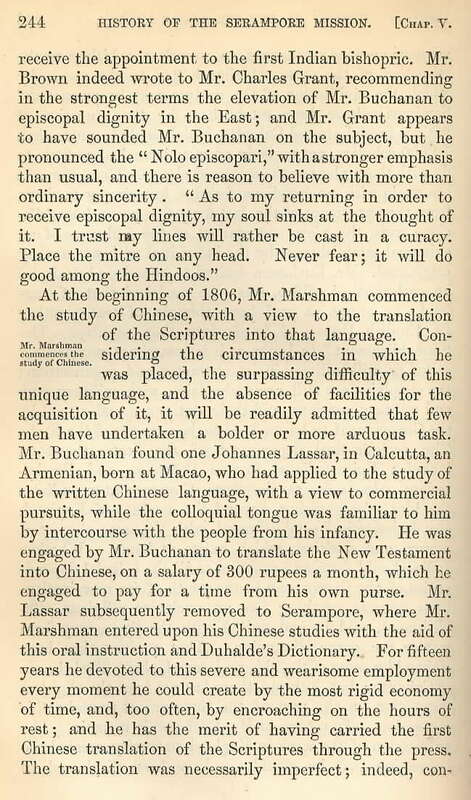 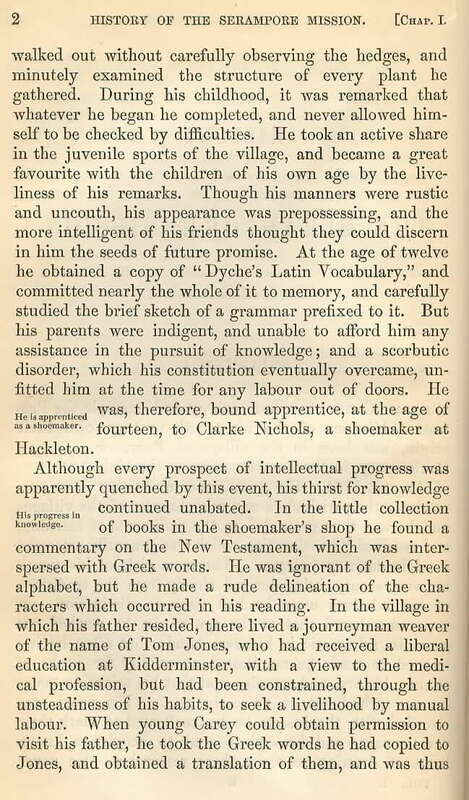 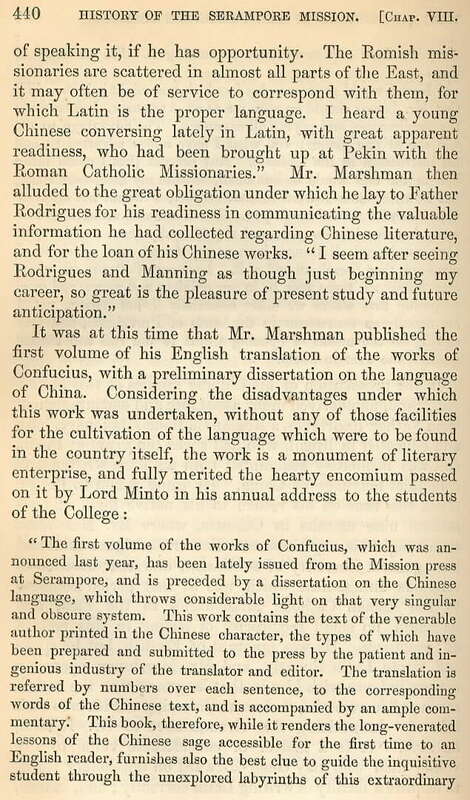 Marshman distinguished himself as an oriental scholar after having learned Chinese, Sanskrit, and Persian. 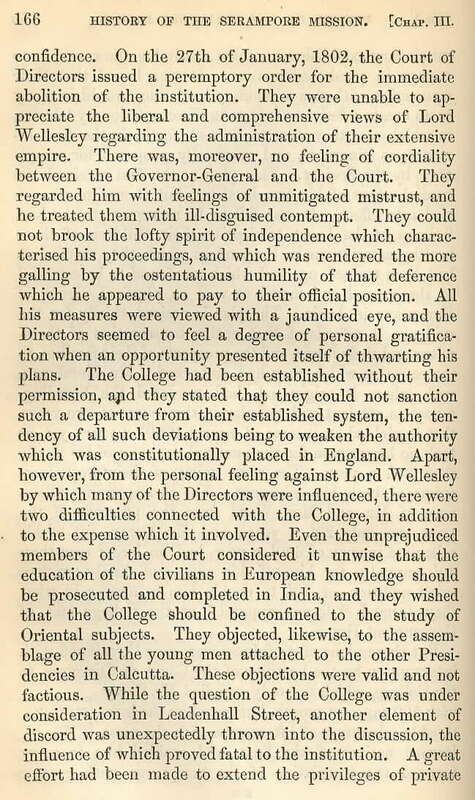 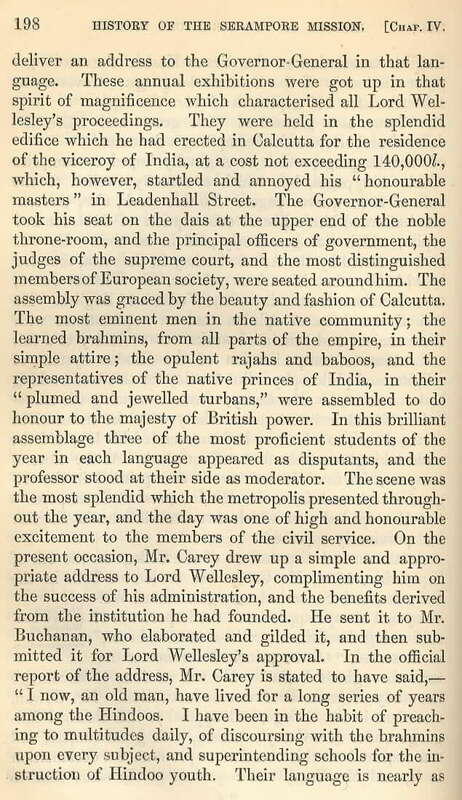 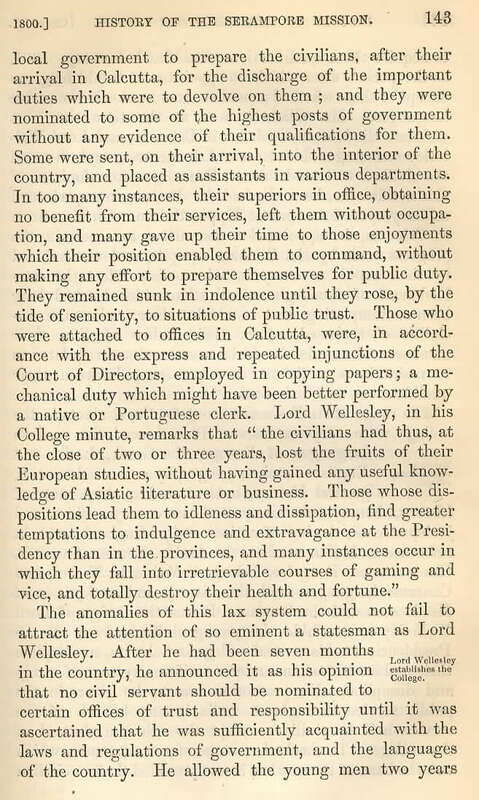 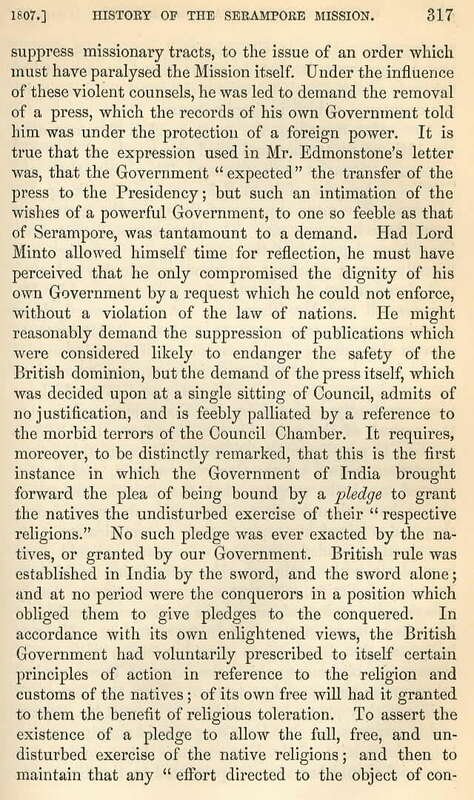 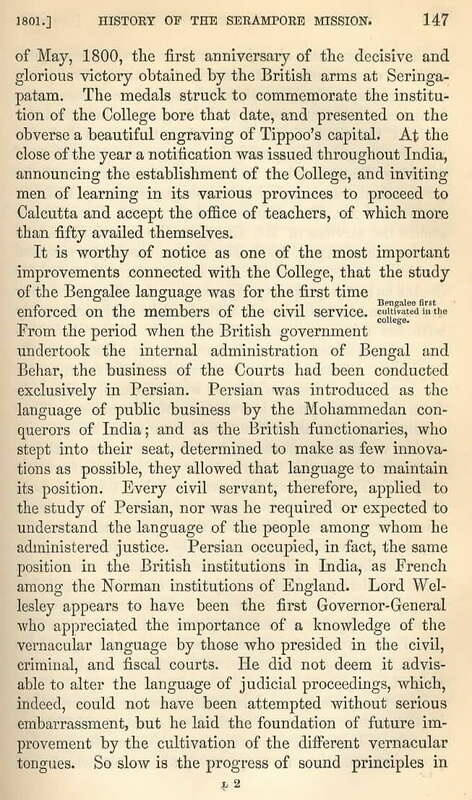 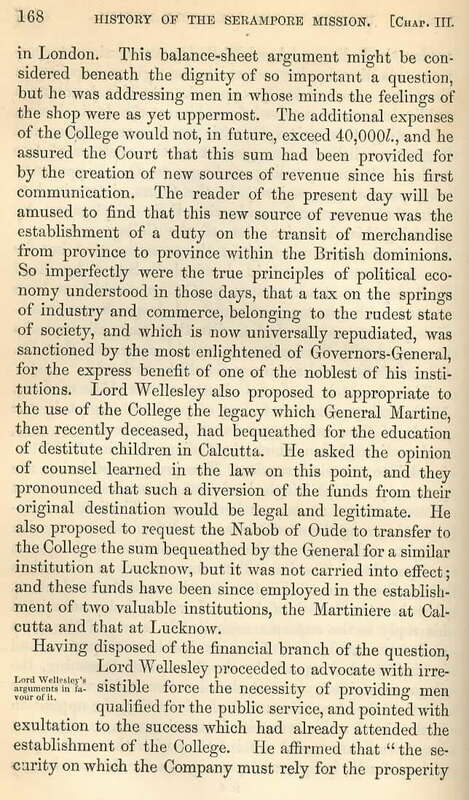 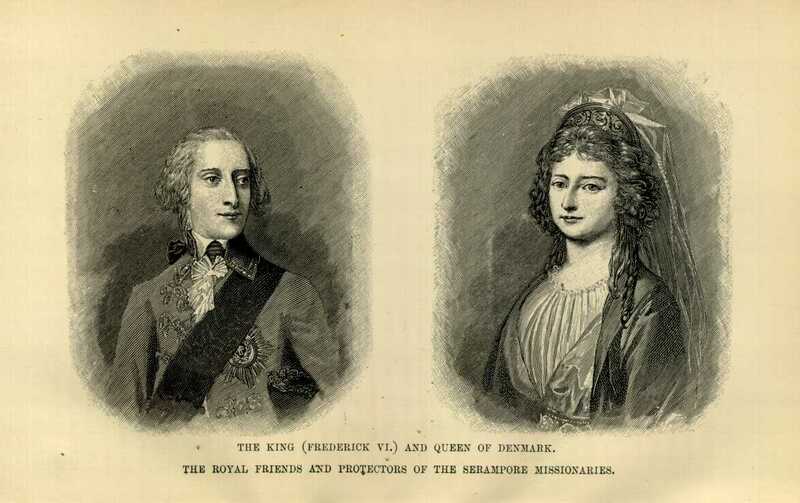 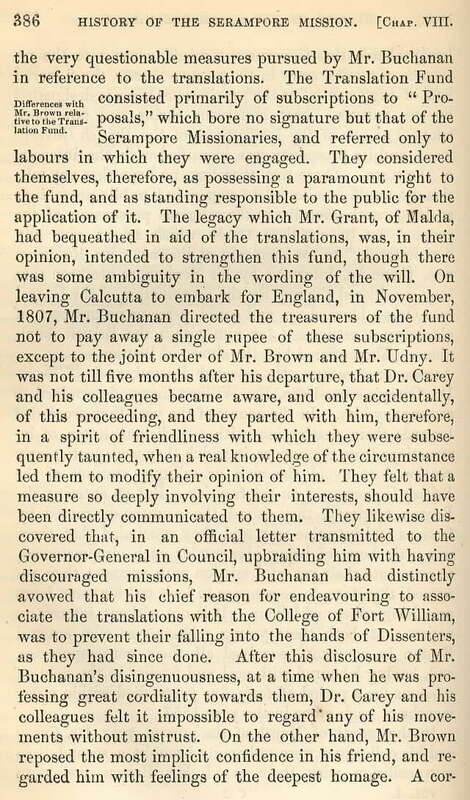 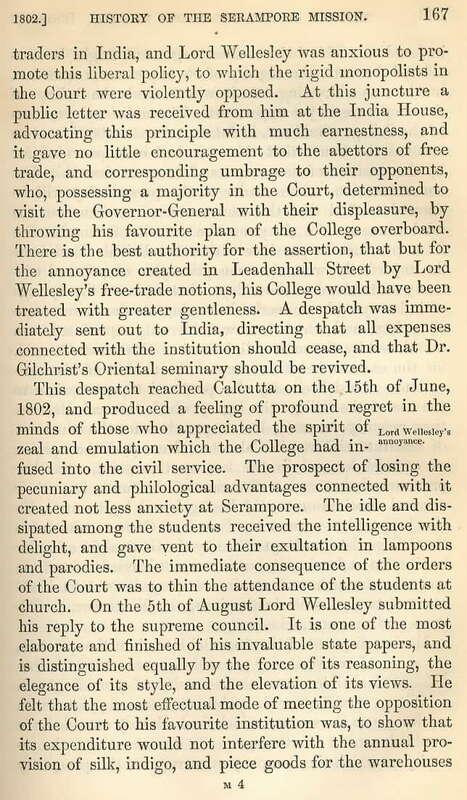 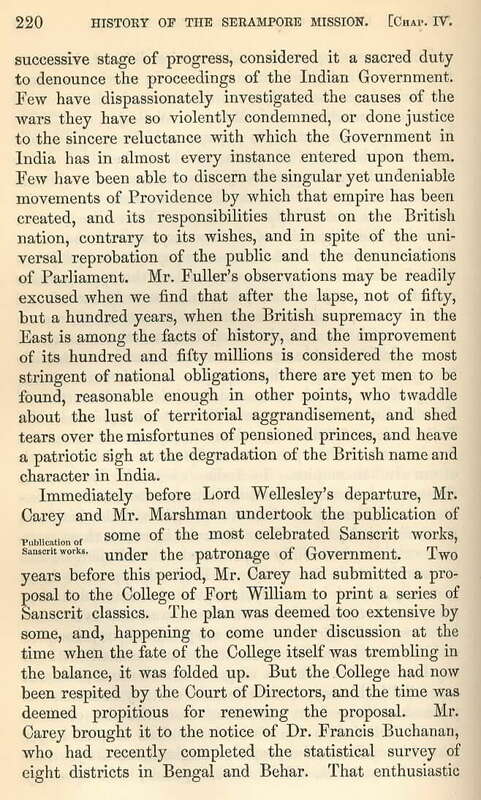 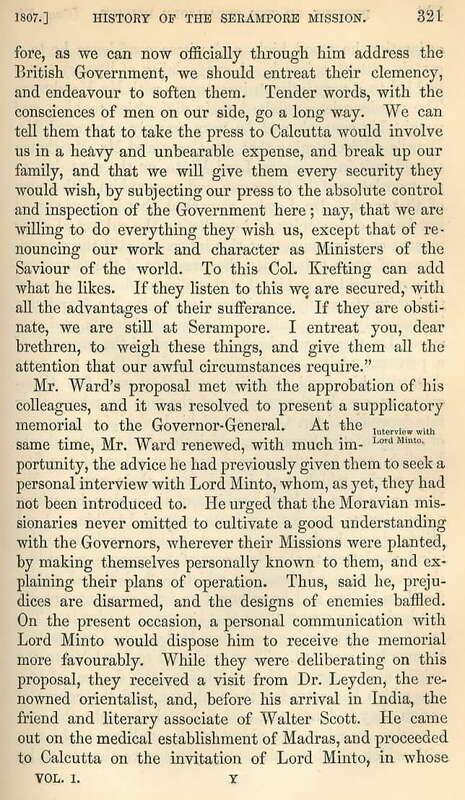 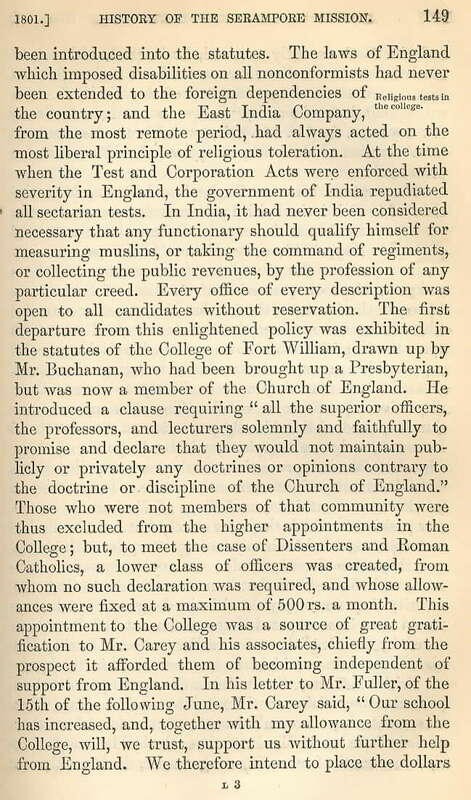 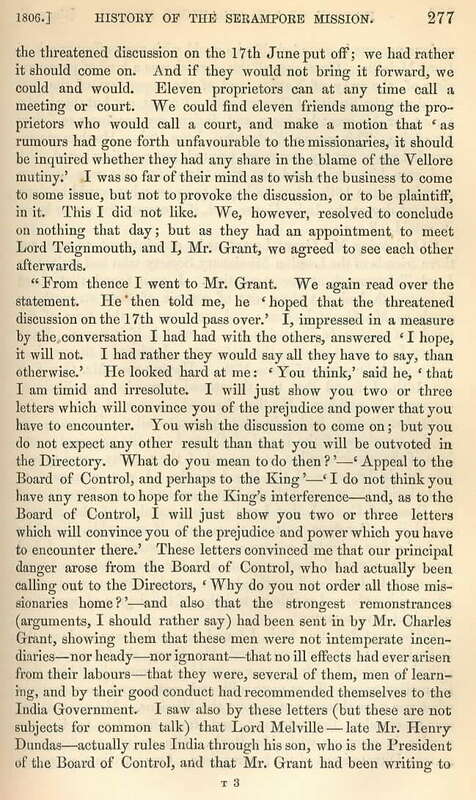 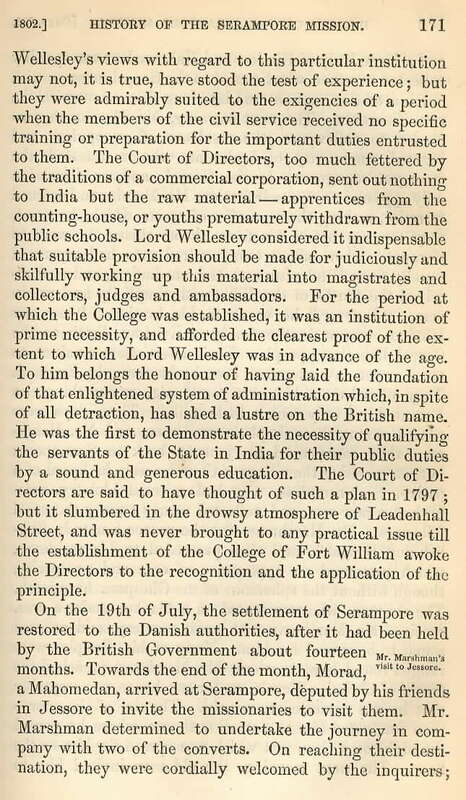 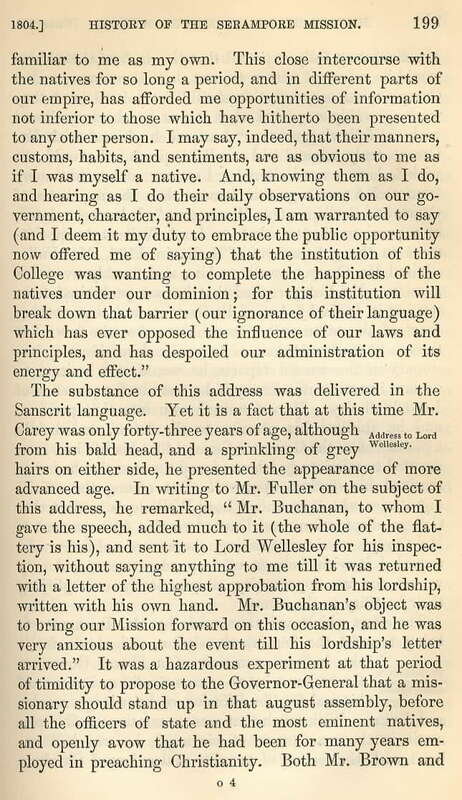 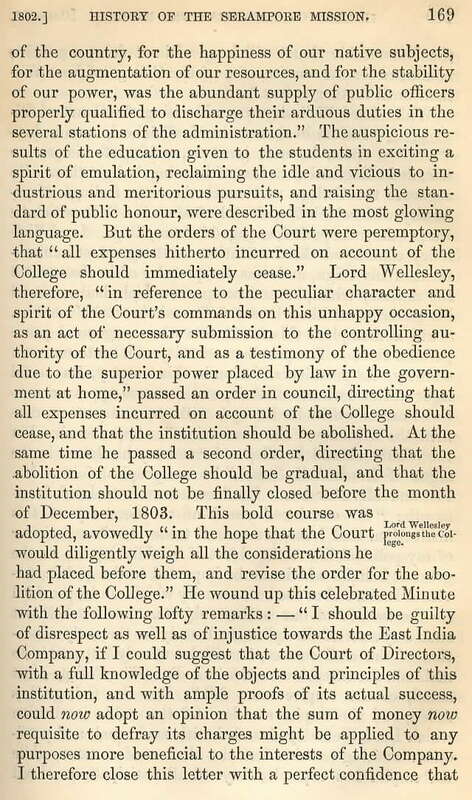 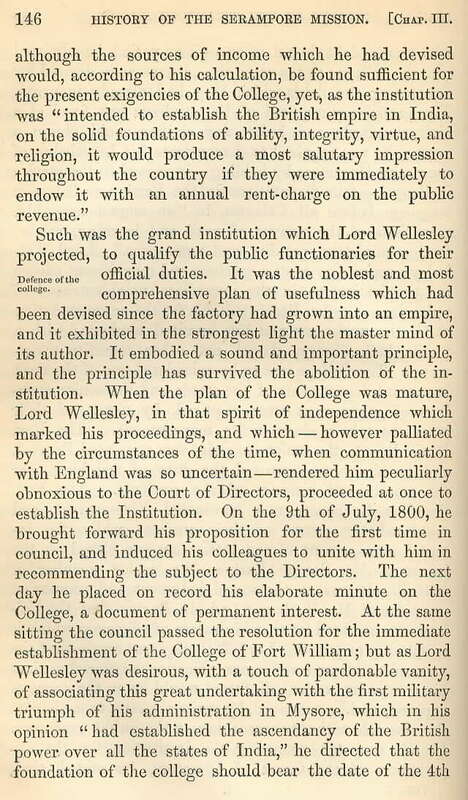 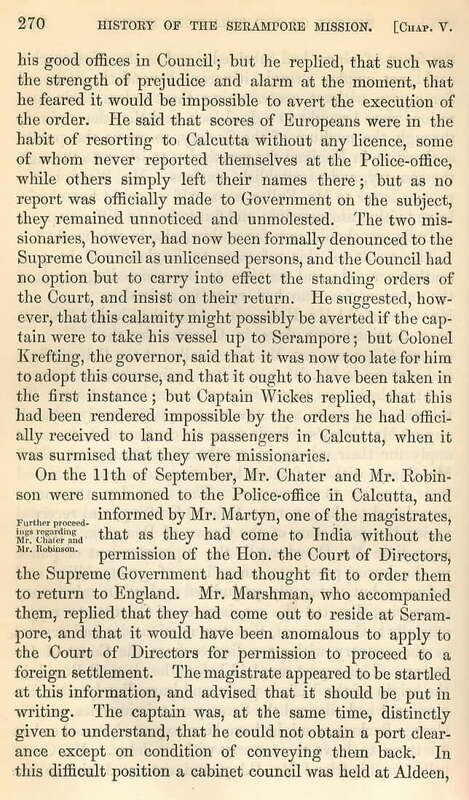 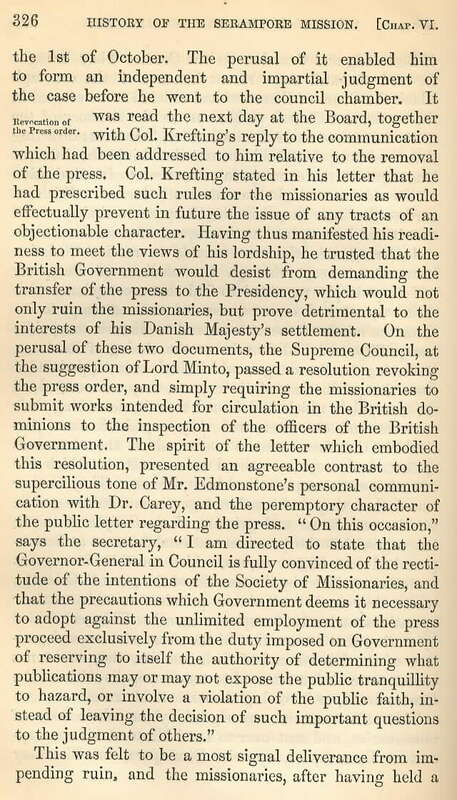 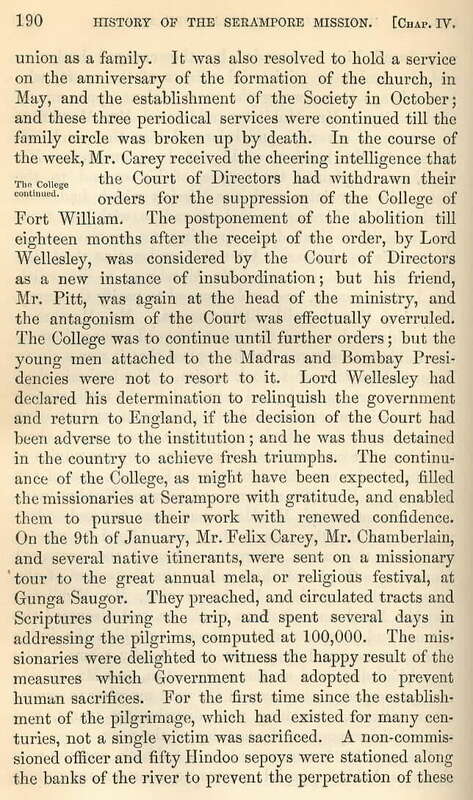 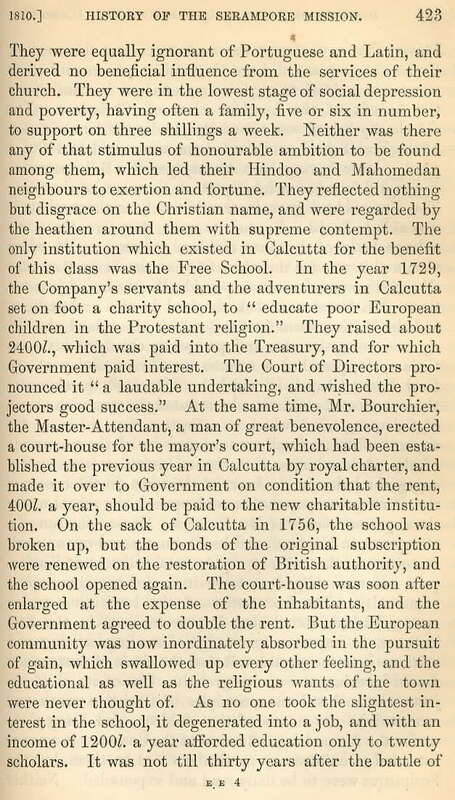 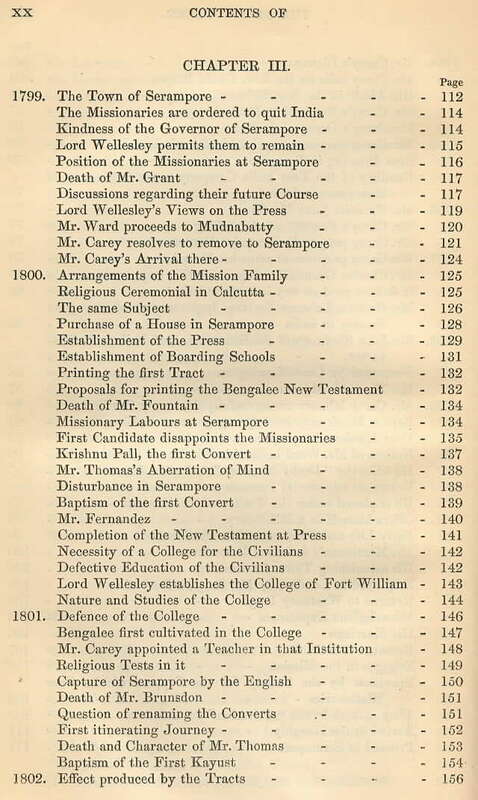 On February 23, 1827, King Frederick VI appointed William Carey, Joshua Marshman, and John Clark Marshman as members of the first Council of Serampore College, an educational institution which King Frederick incorporated under Danish authority. 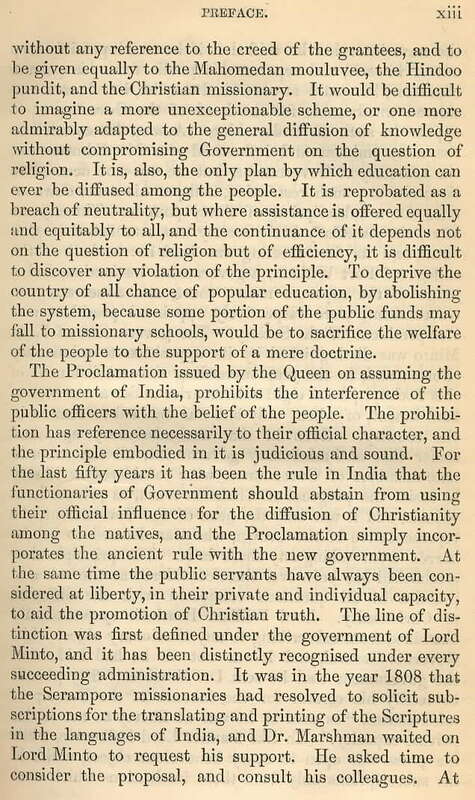 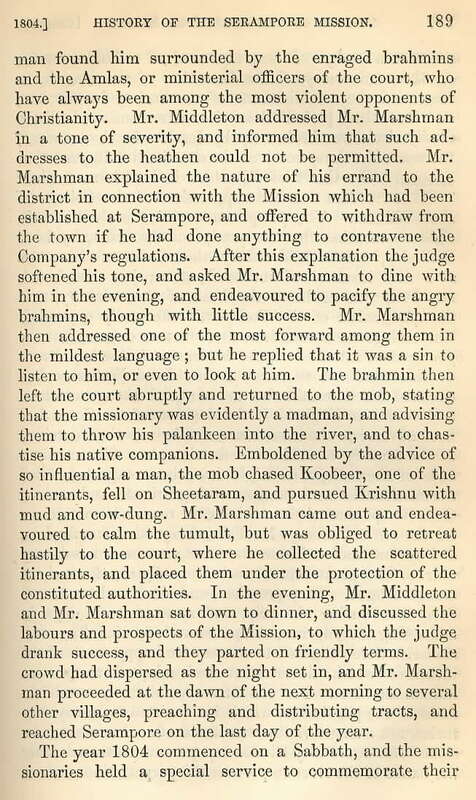 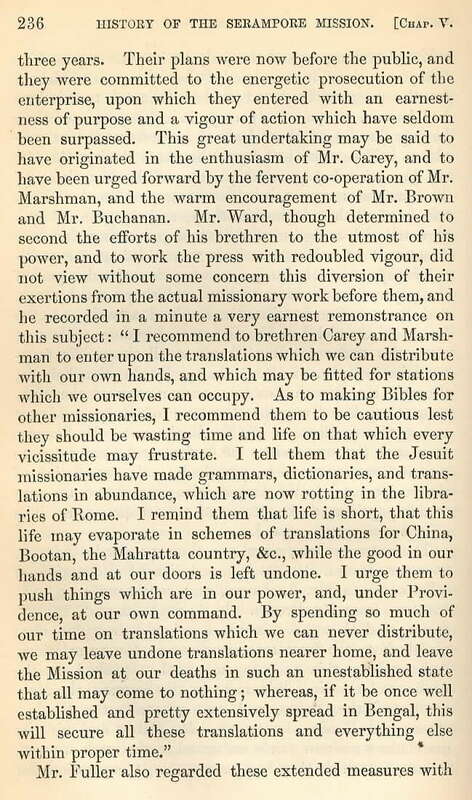 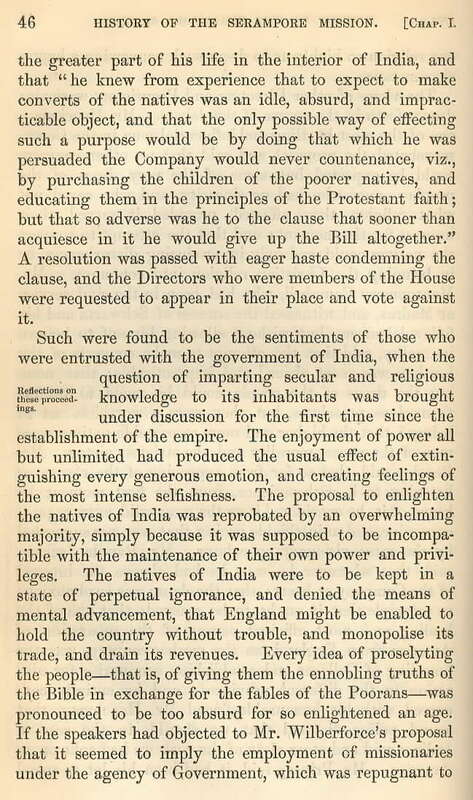 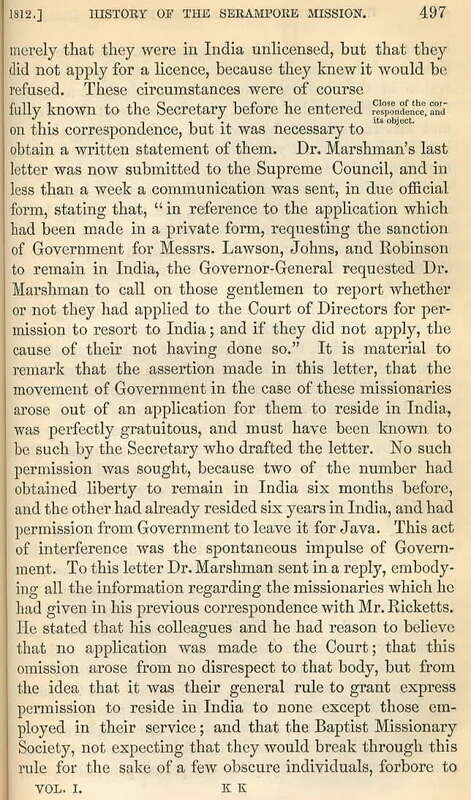 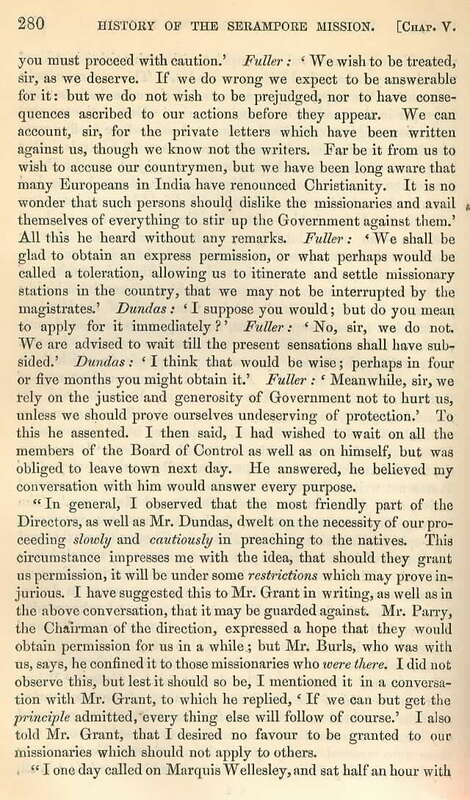 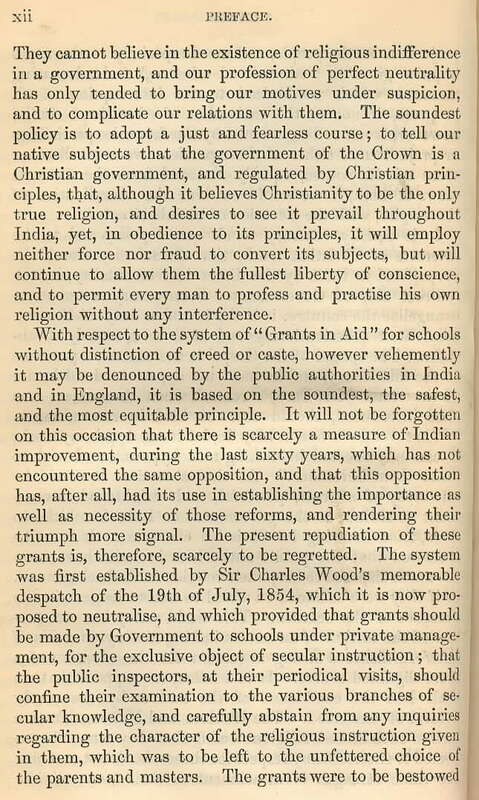 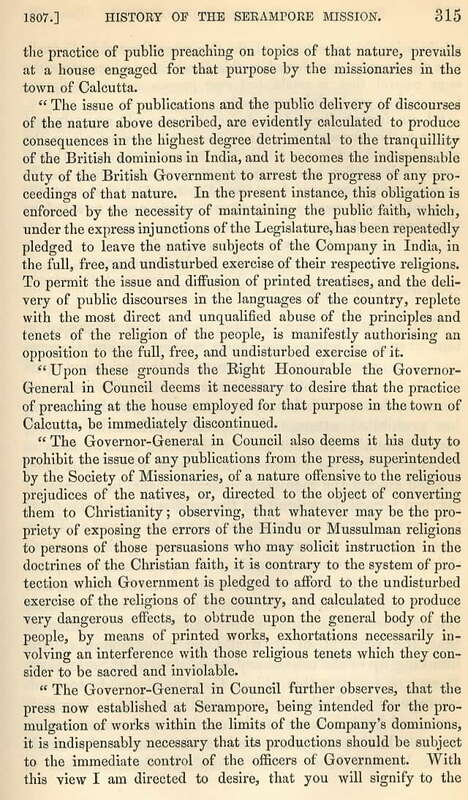 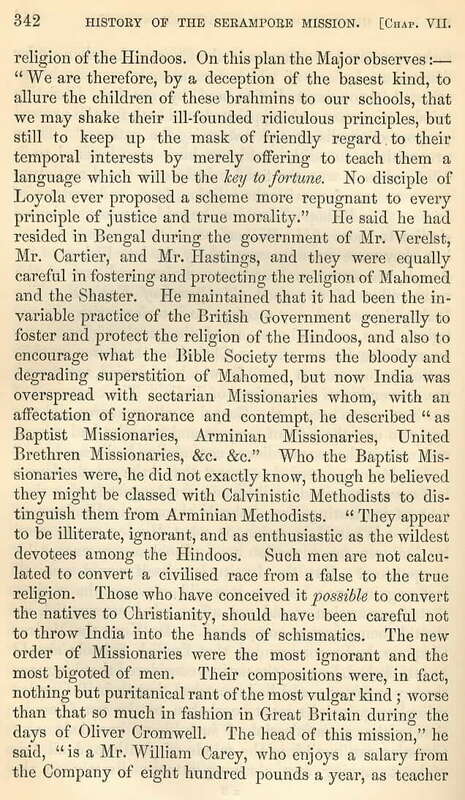 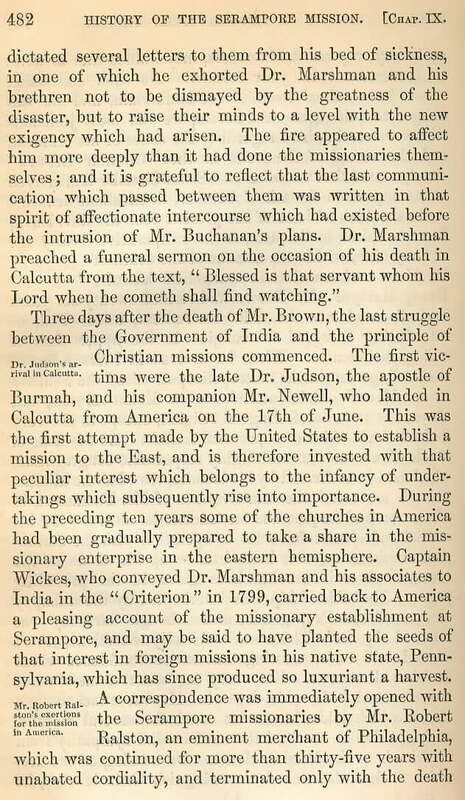 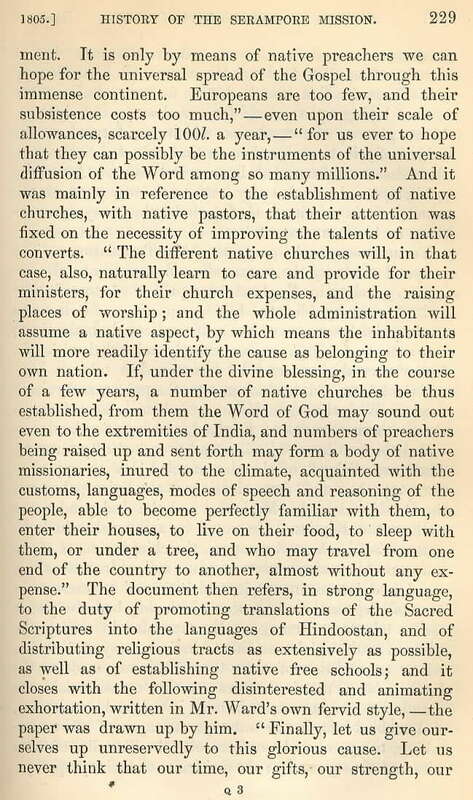 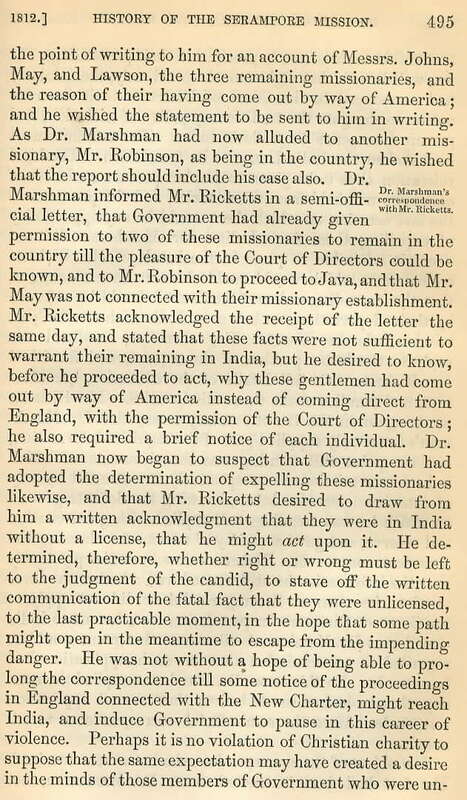 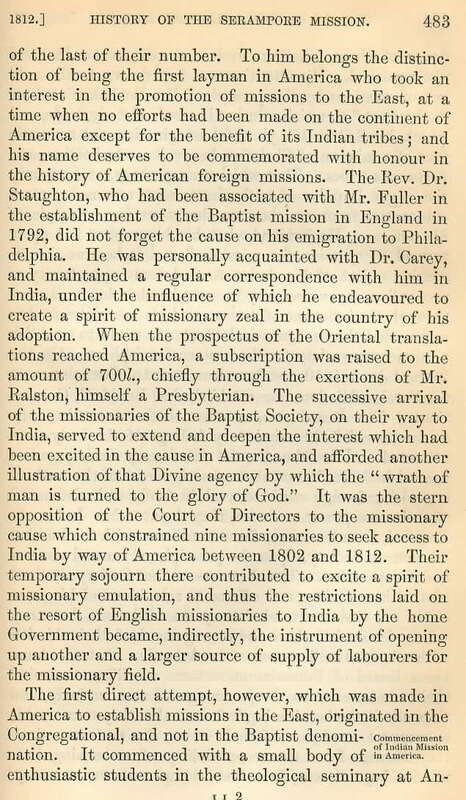 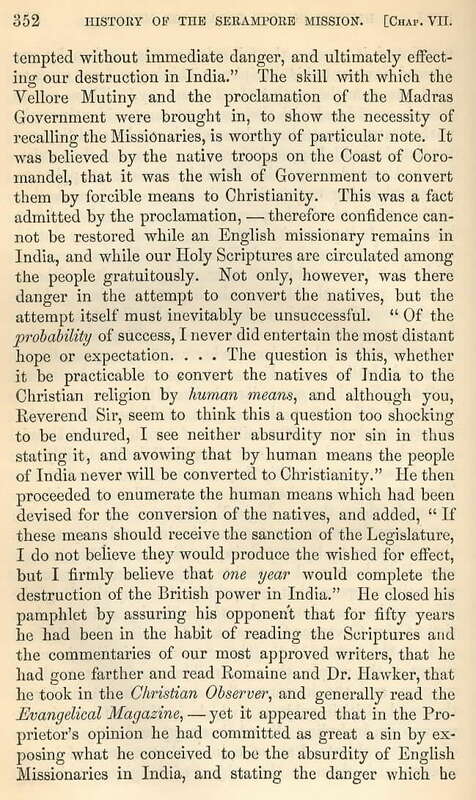 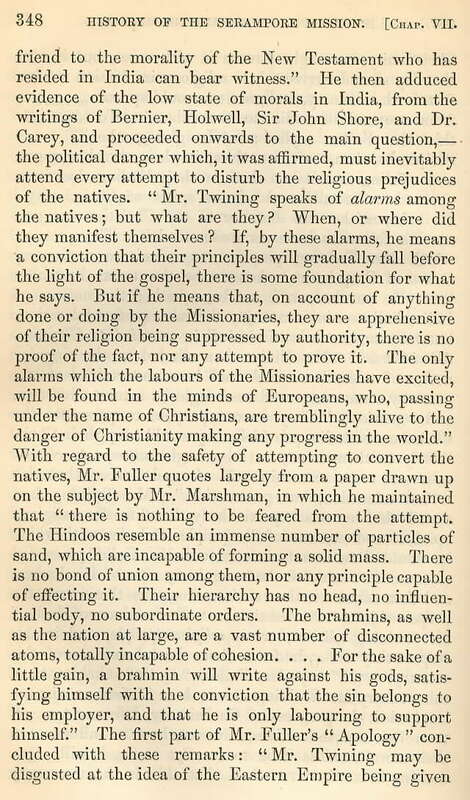 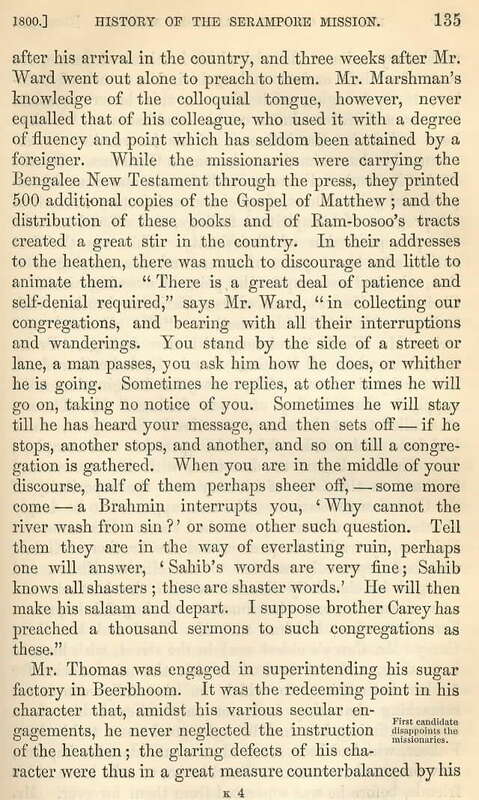 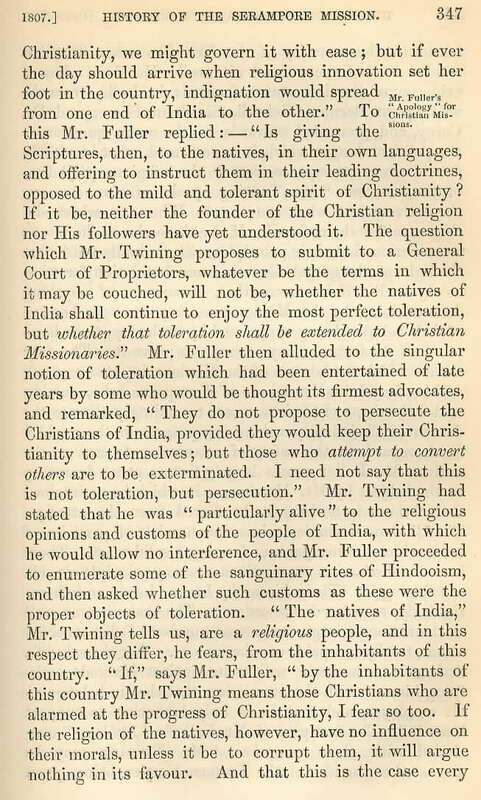 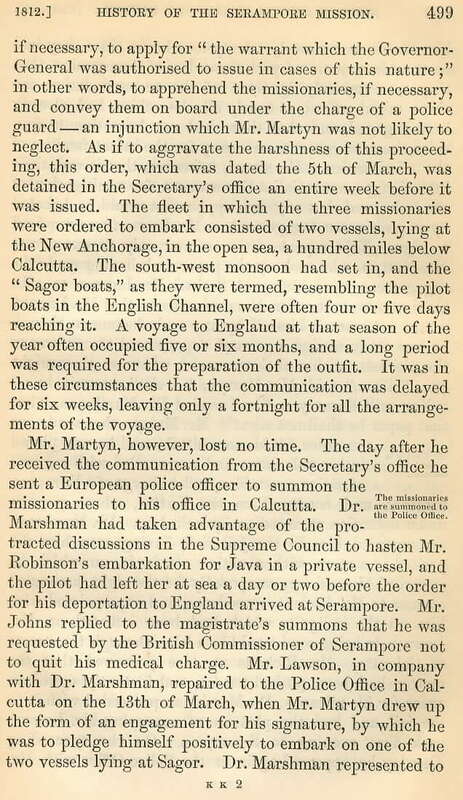 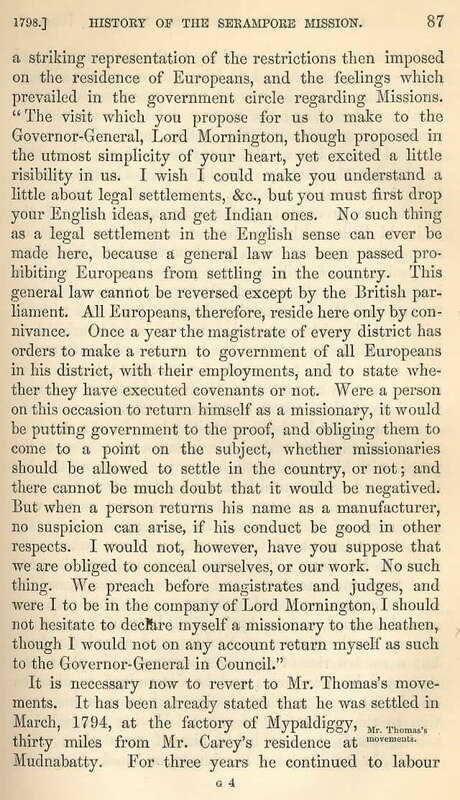 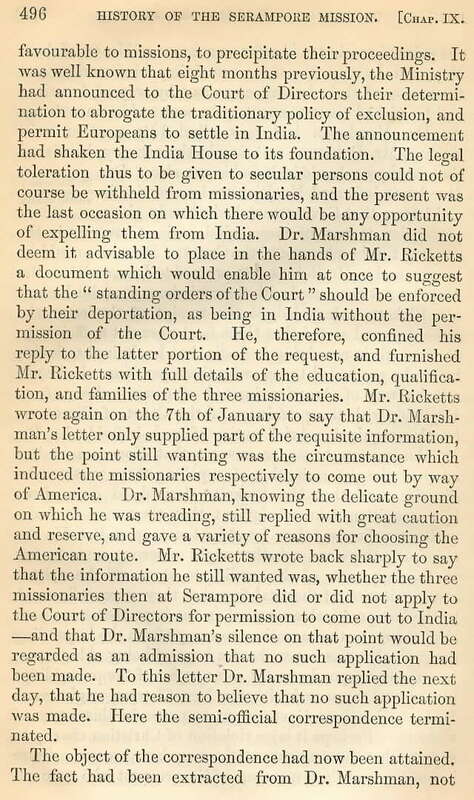 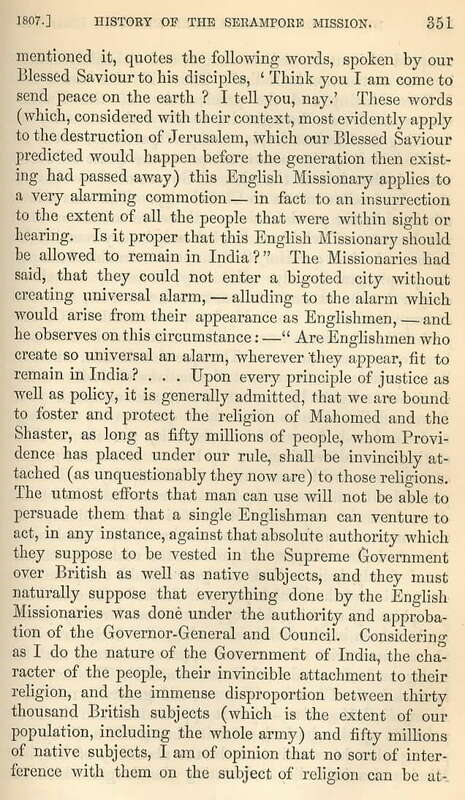 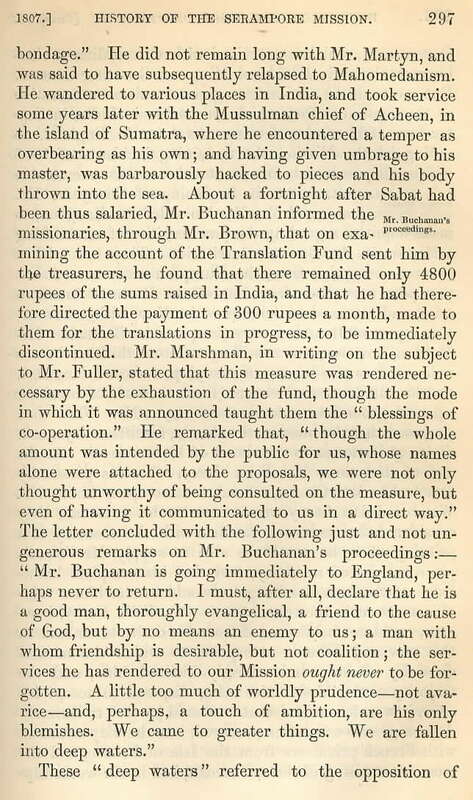 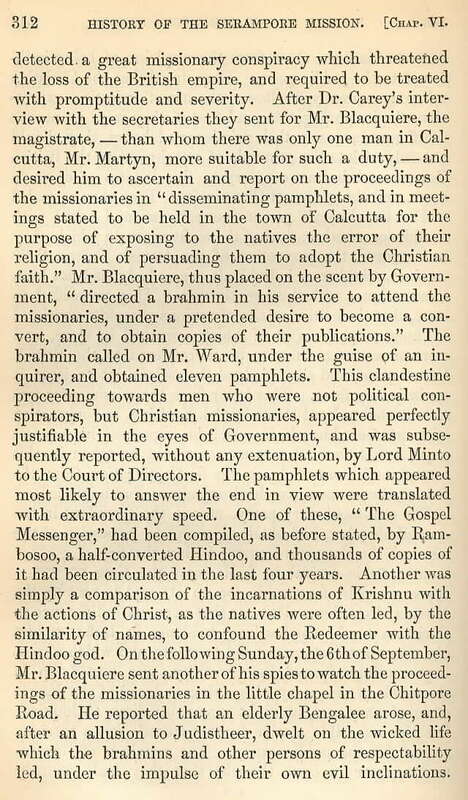 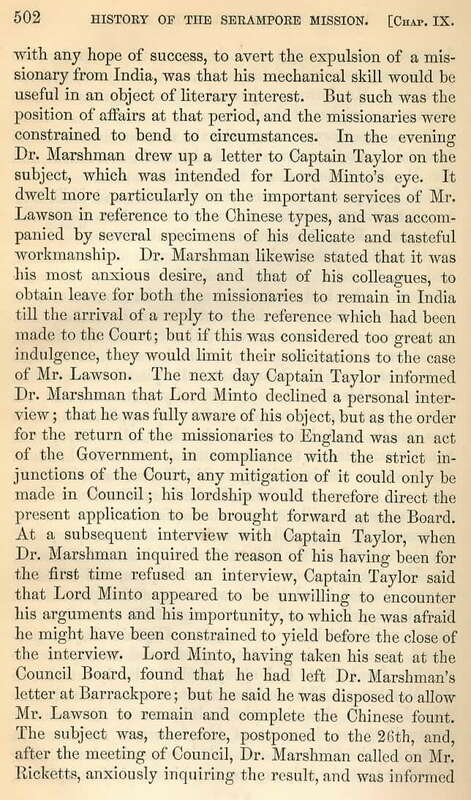 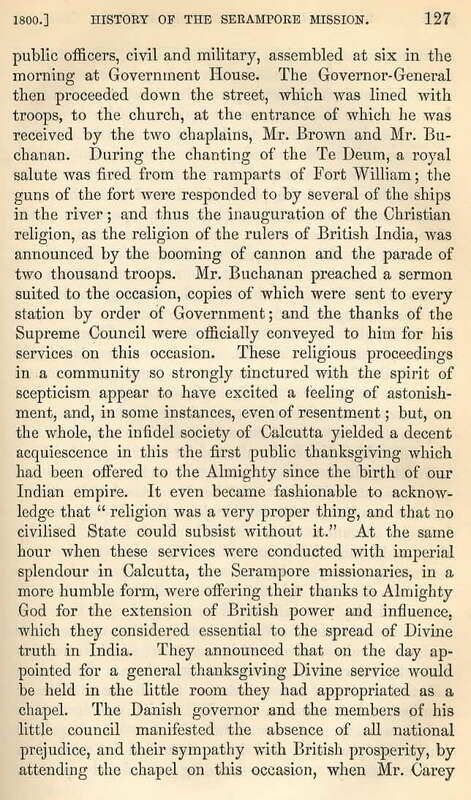 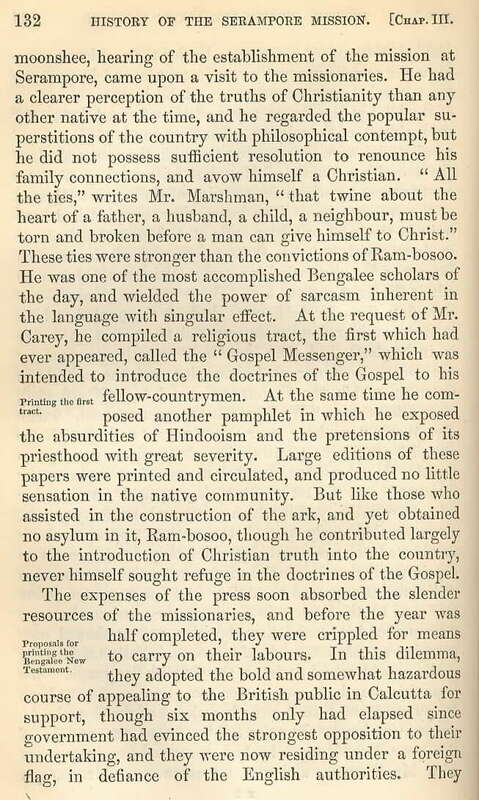 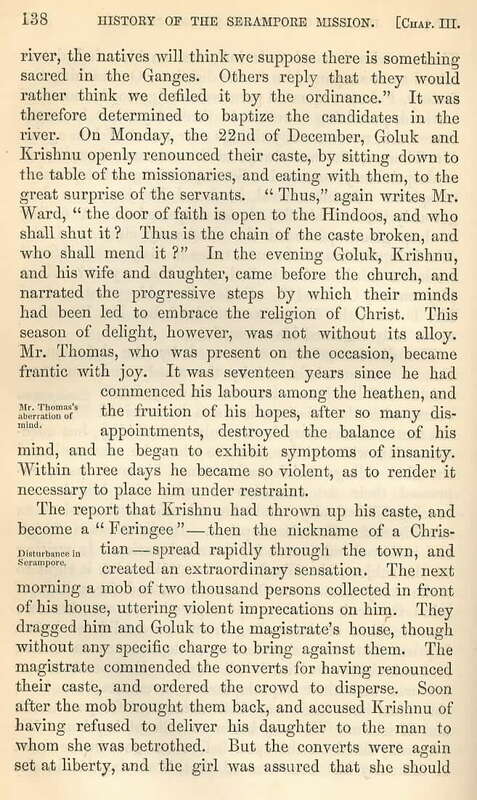 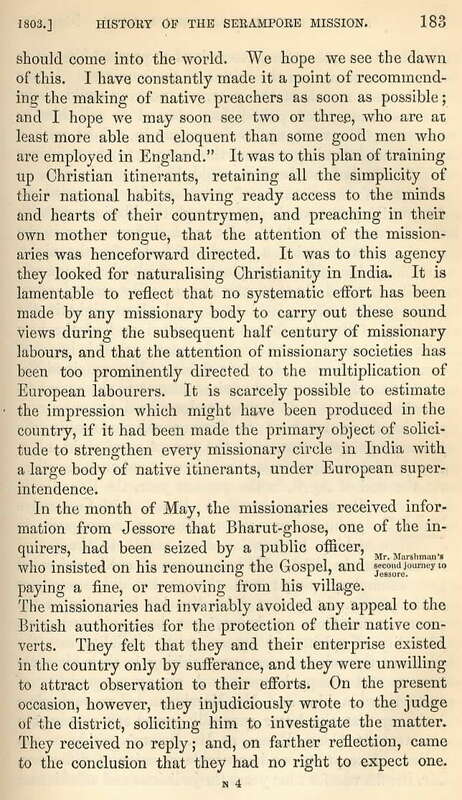 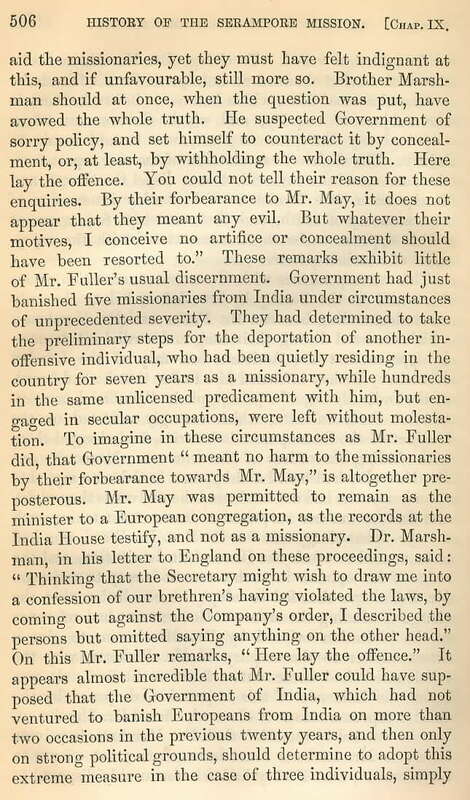 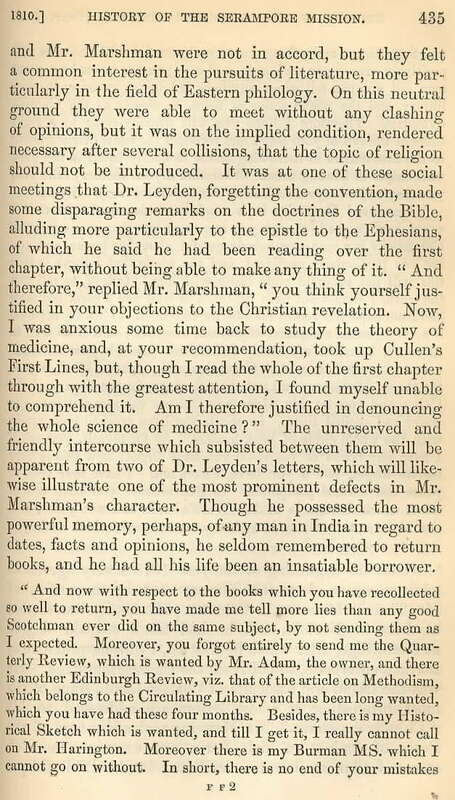 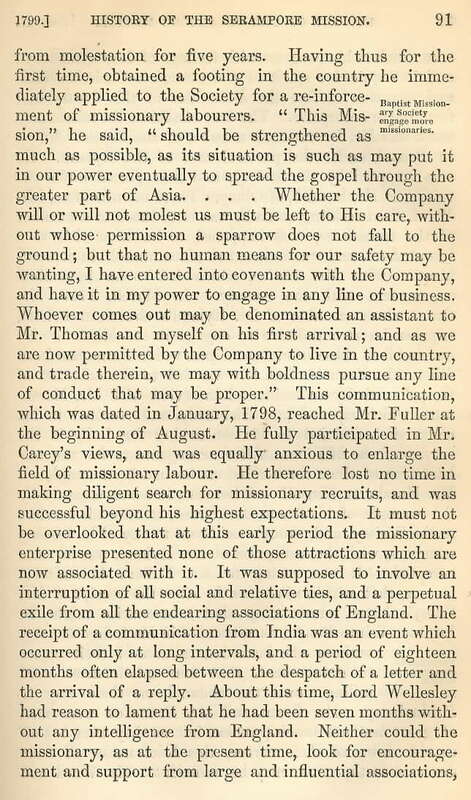 Continually supporting the cause of education in India, Marshman accepted a position as an official translator in India for the British government, and incurred the ire of fellow missionaries. 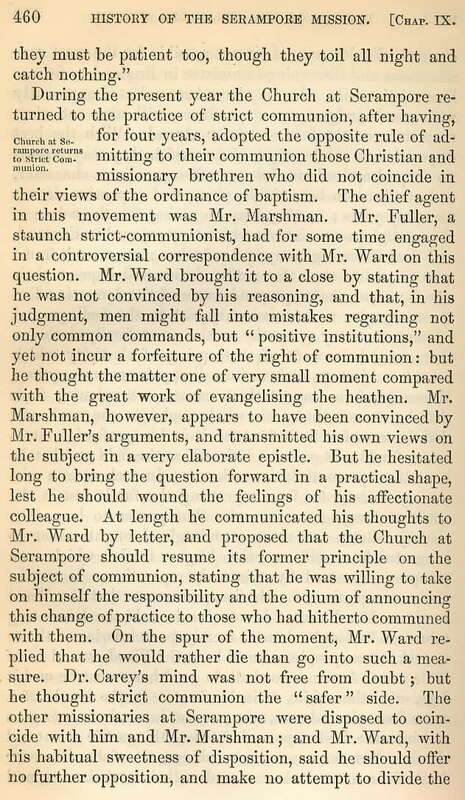 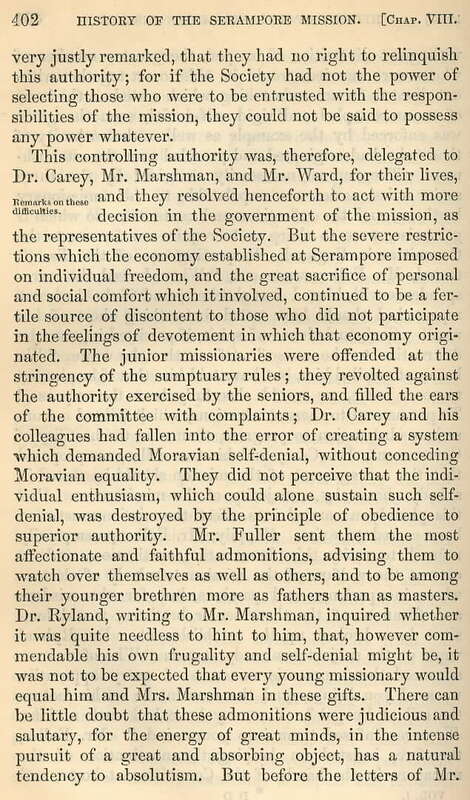 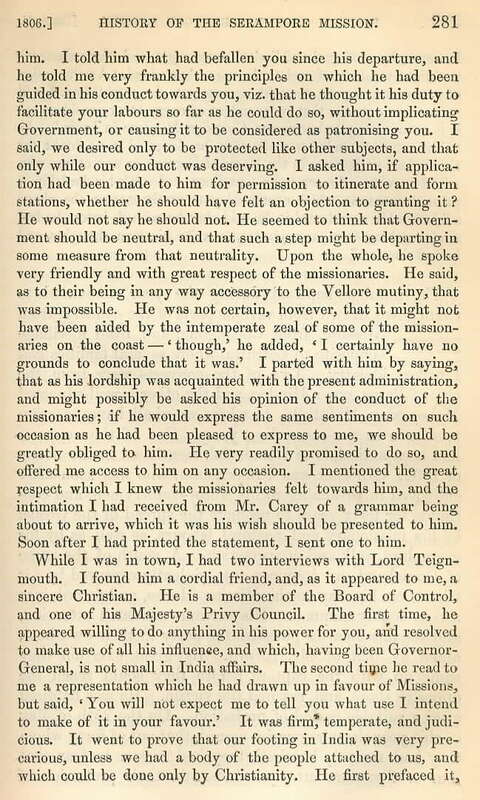 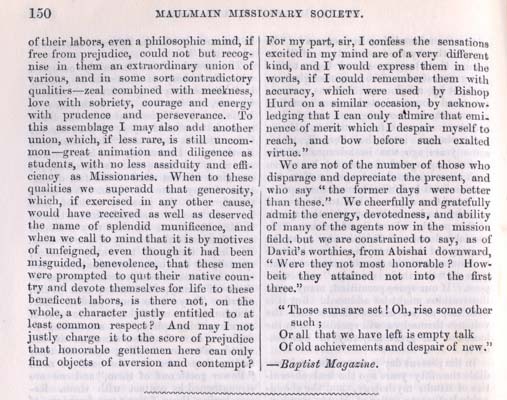 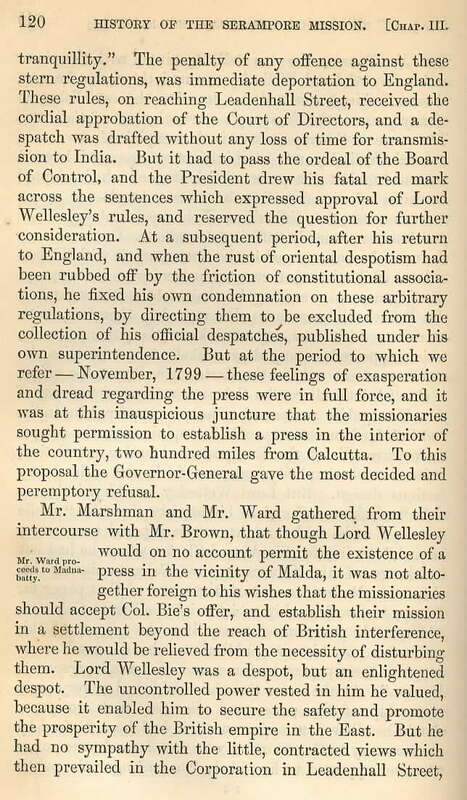 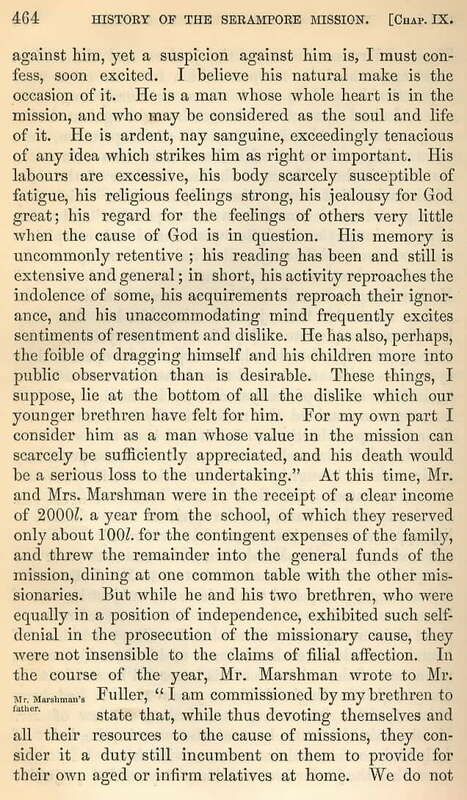 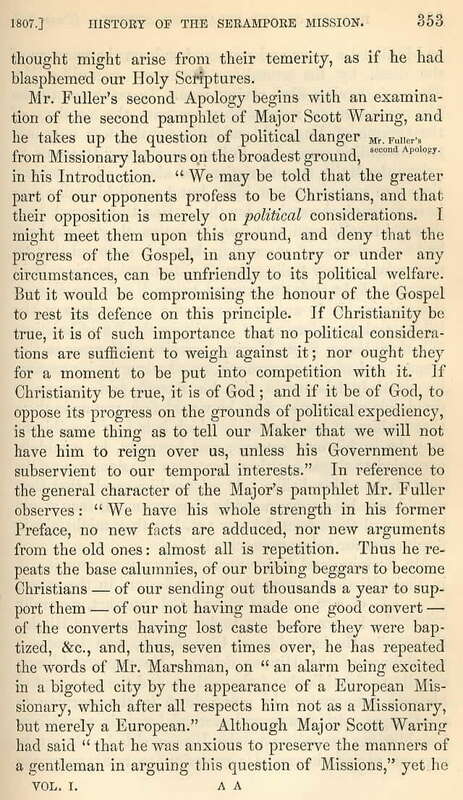 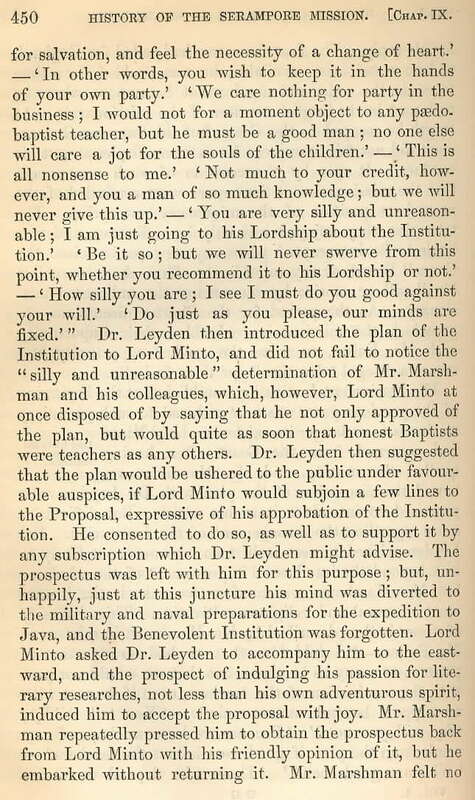 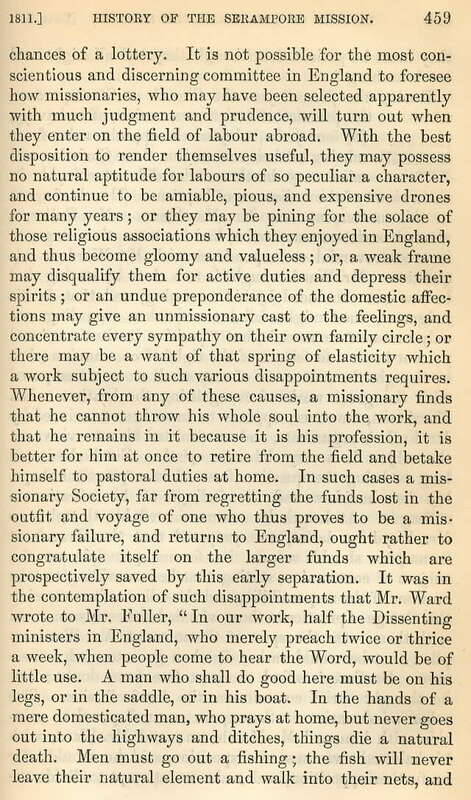 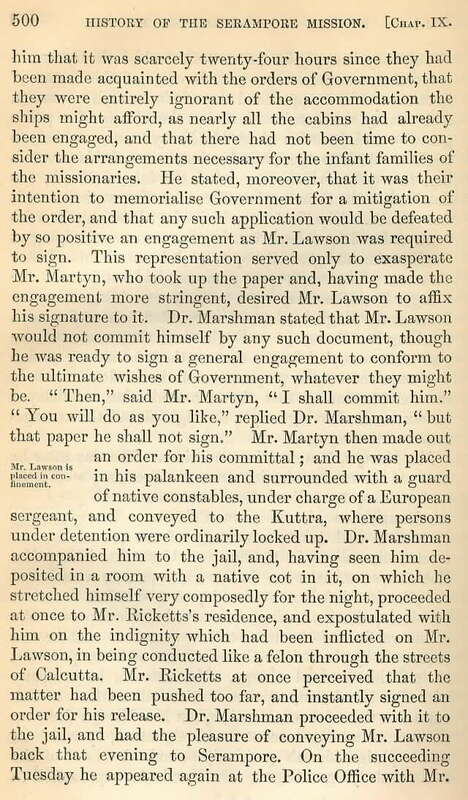 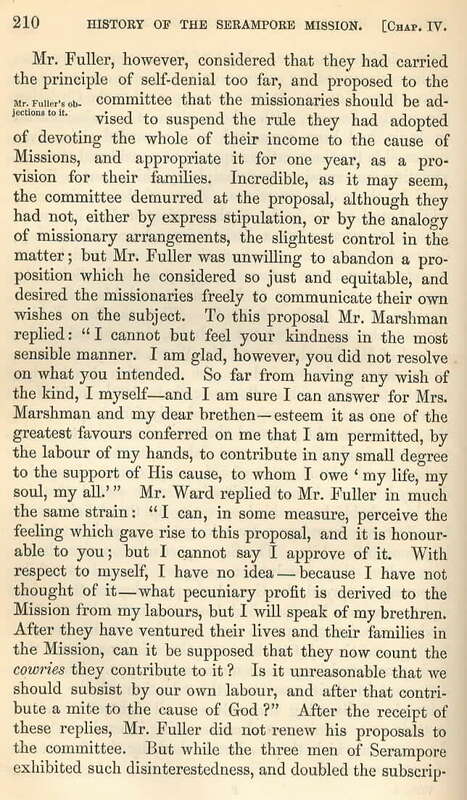 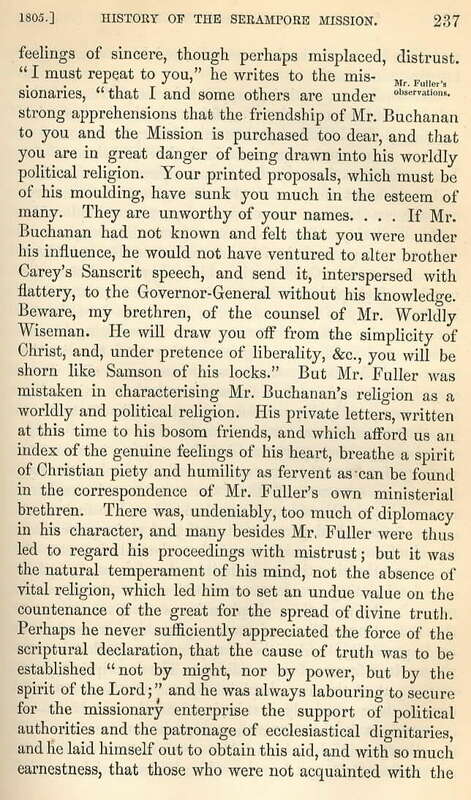 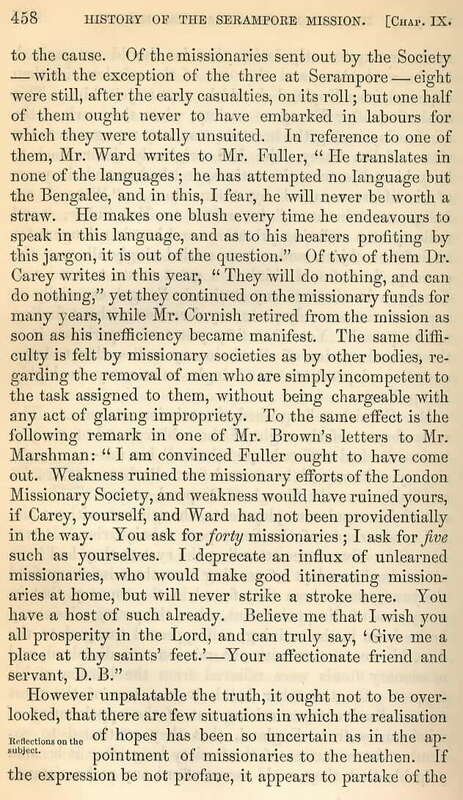 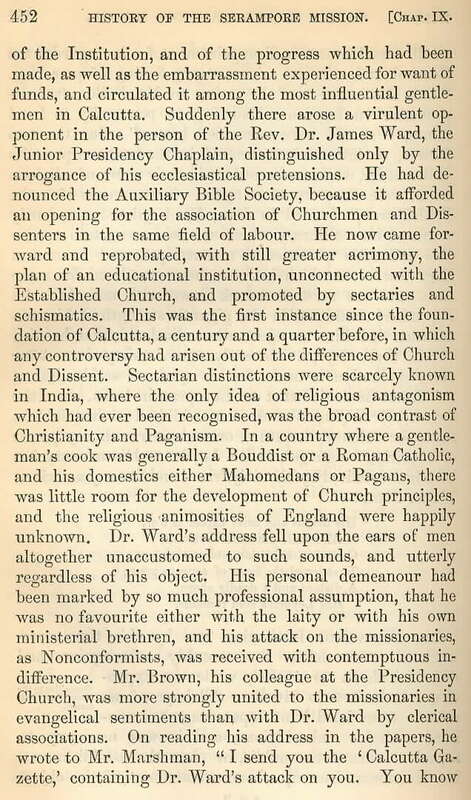 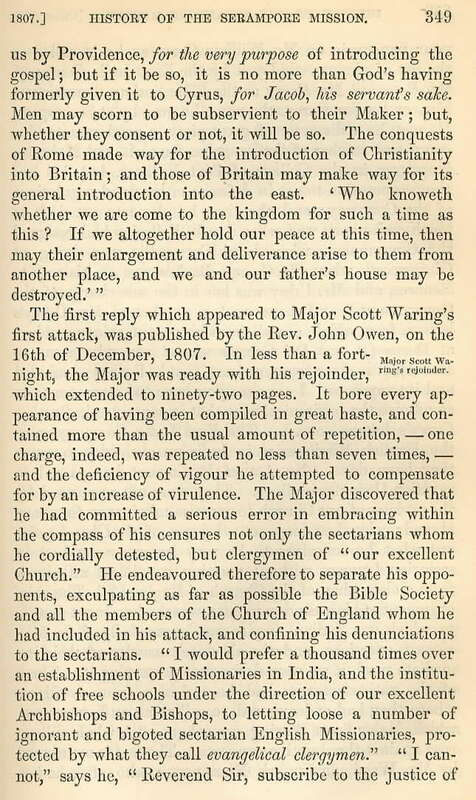 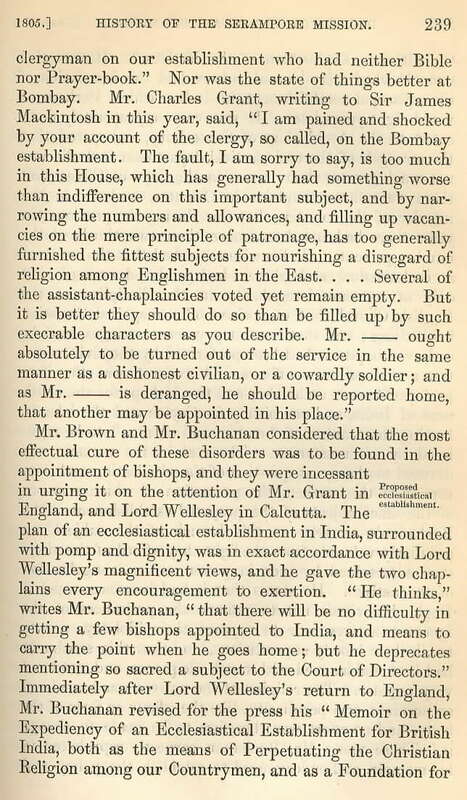 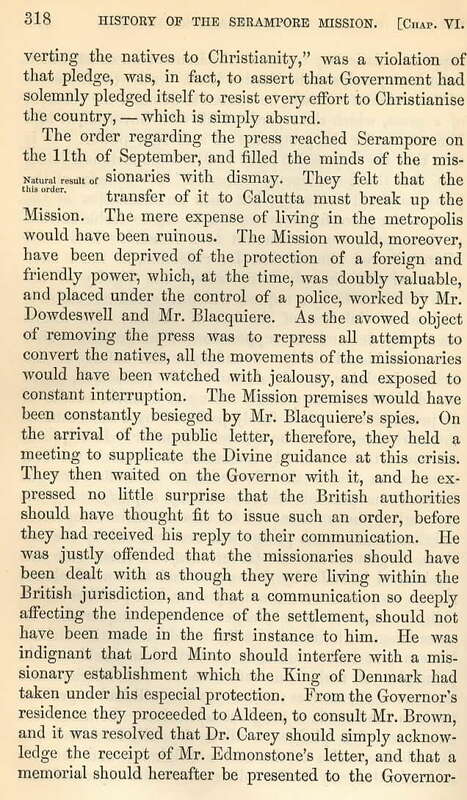 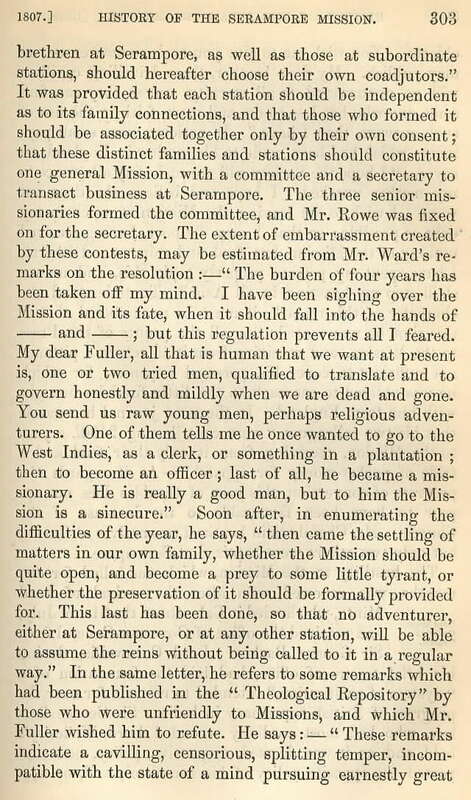 Receiving much criticism from other missionaries for taking a governmental position, Marshman resigned his position in 1852 and returned to Great Britain. 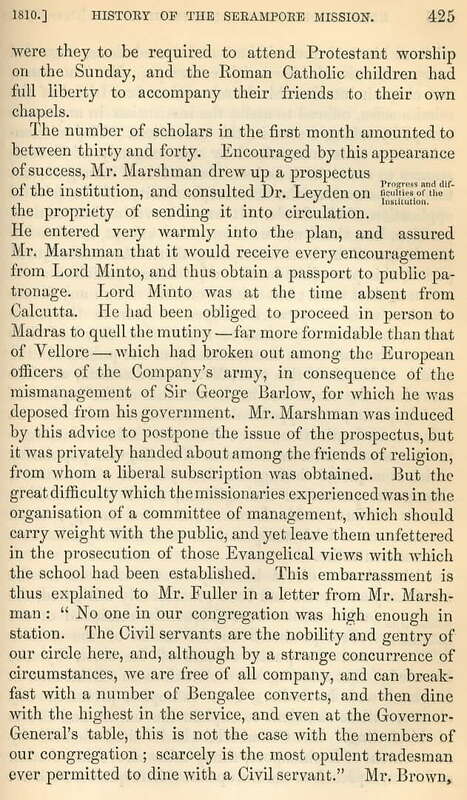 In Britain, Marshman stood for a seat in Parliament on three different occasions (1857, 1859, and 1861), but he lost all three elections. 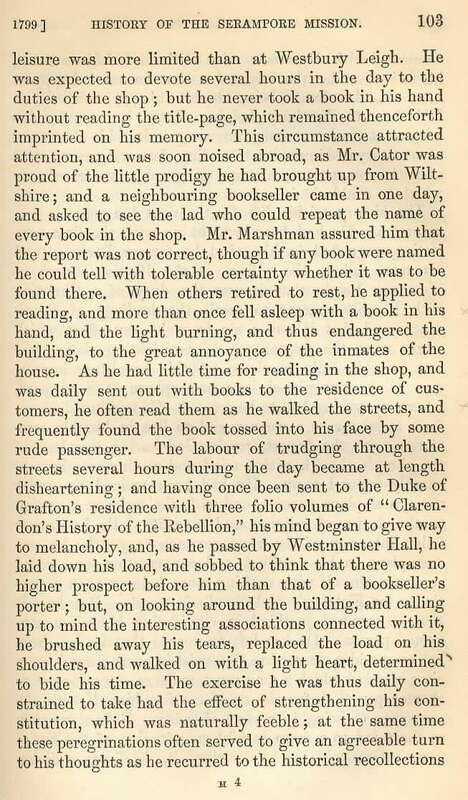 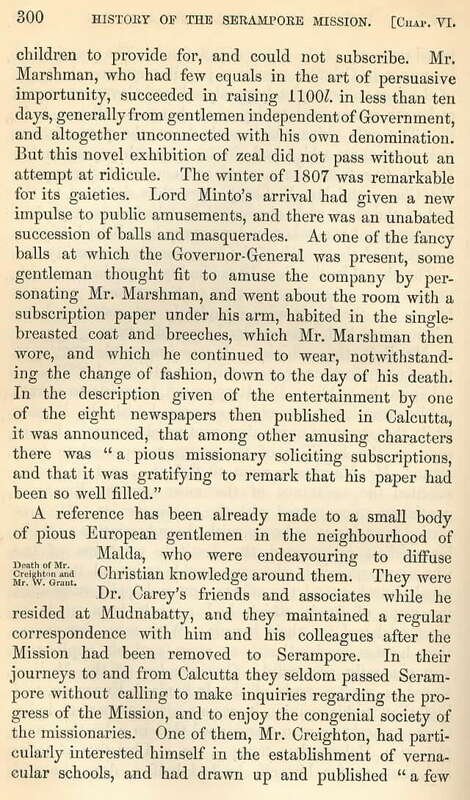 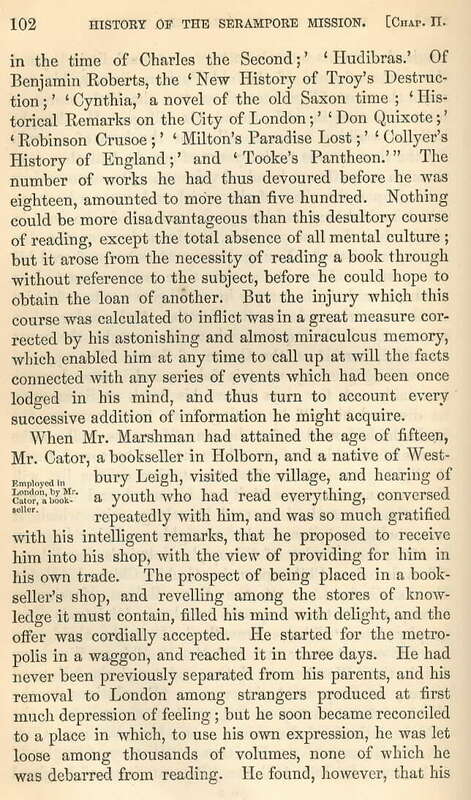 On July 8, 1877, Marshman died in London. 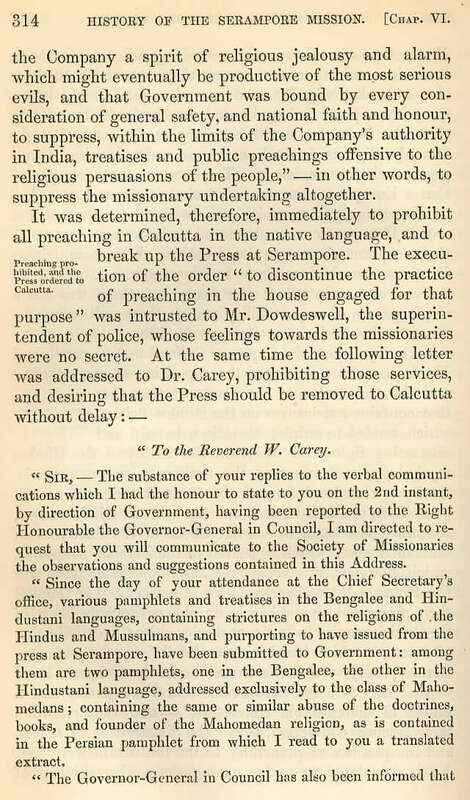 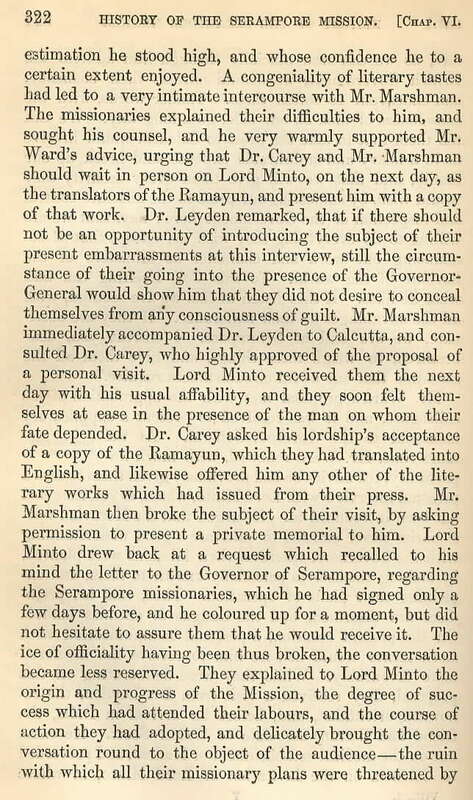 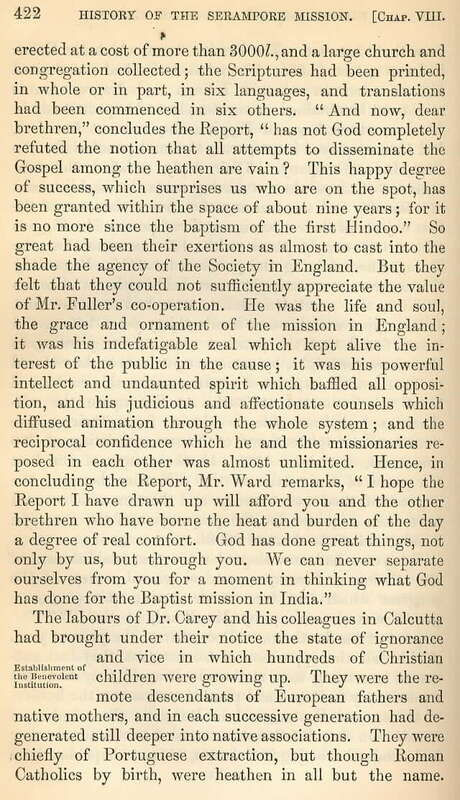 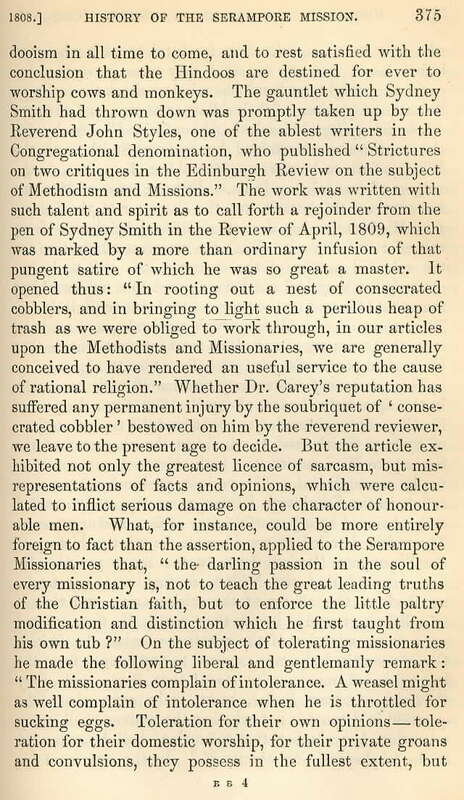 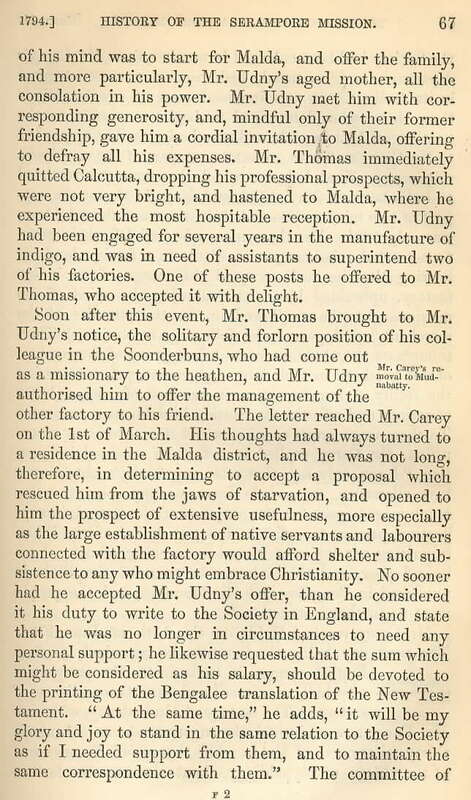 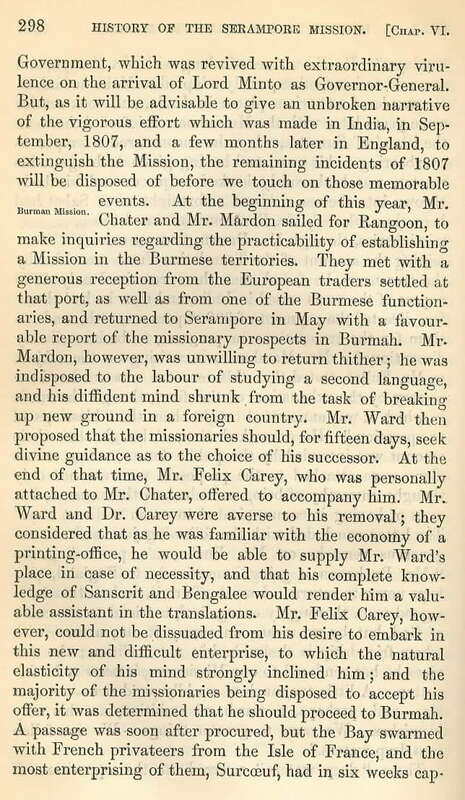 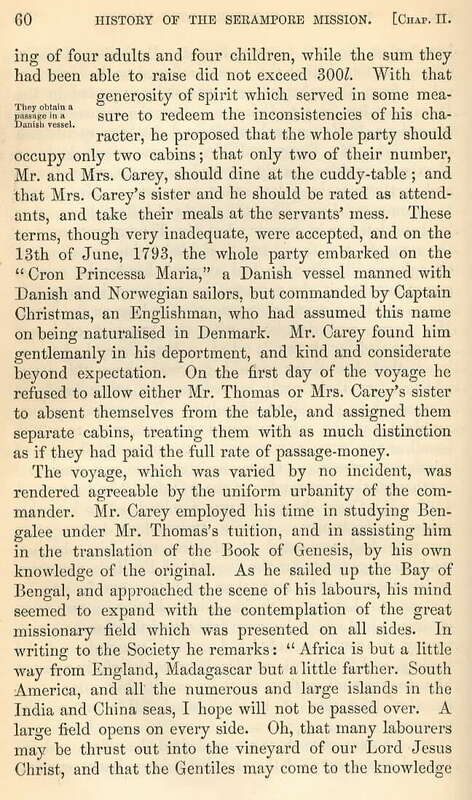 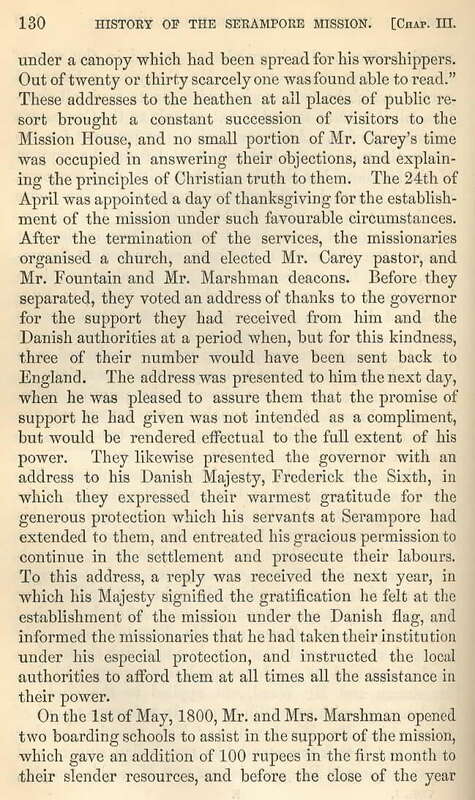 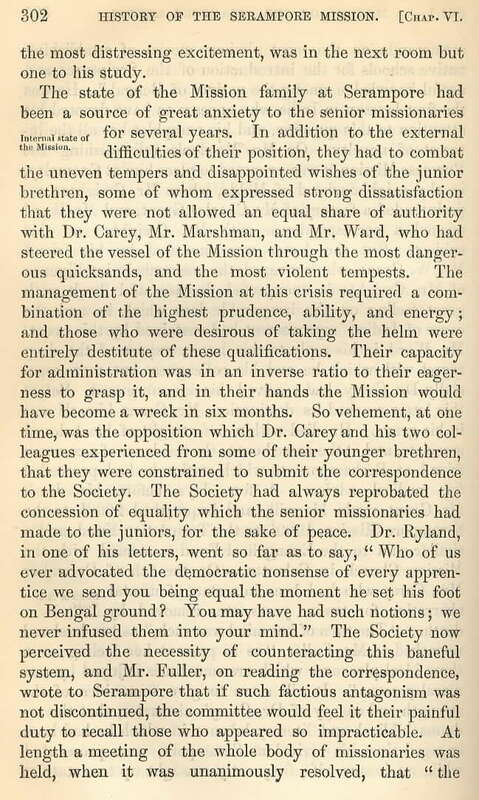 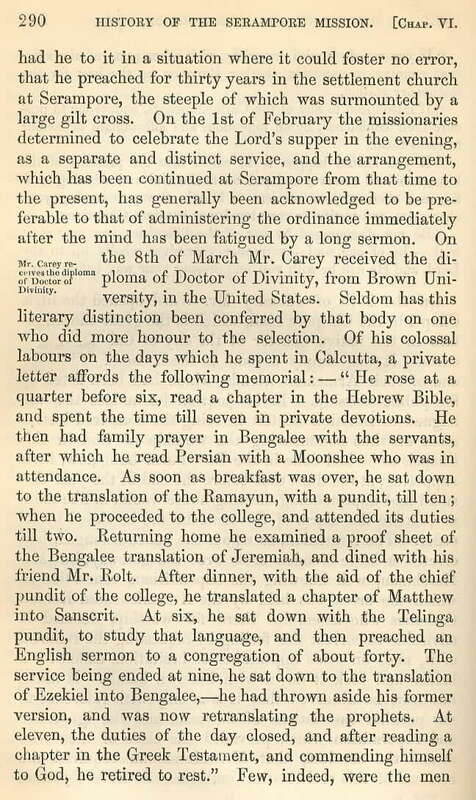 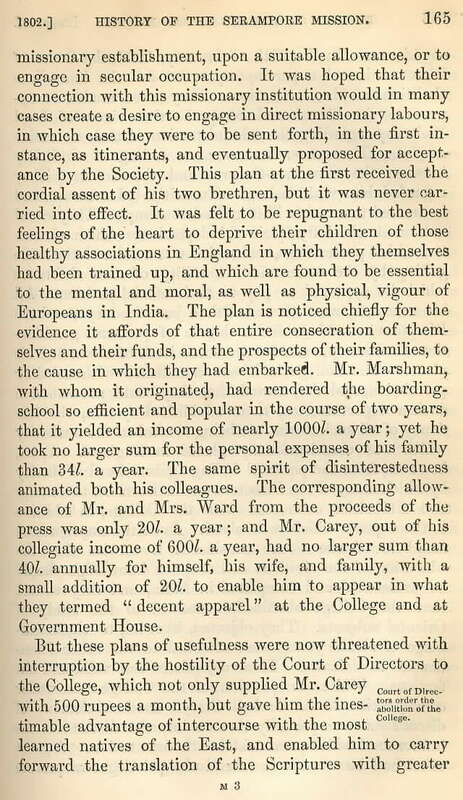 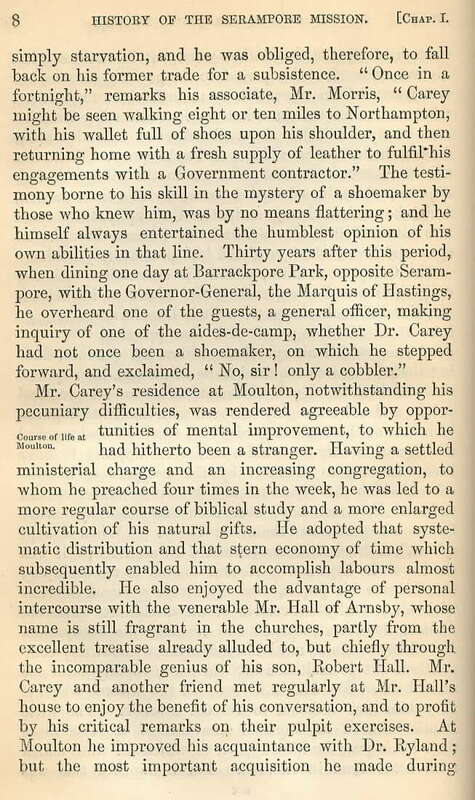 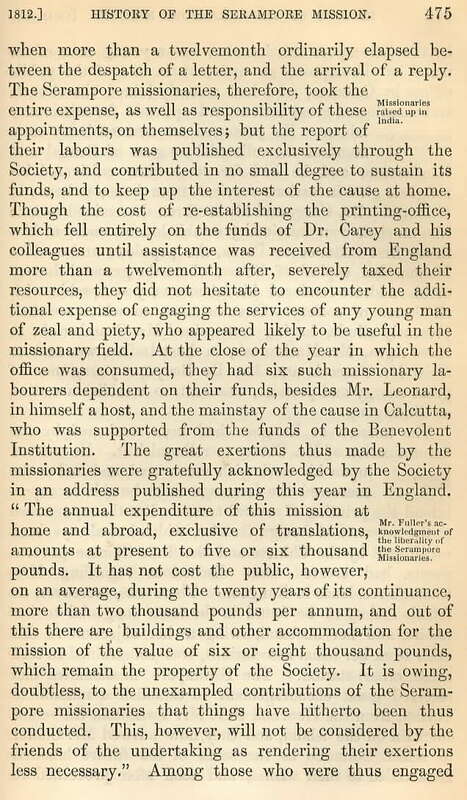 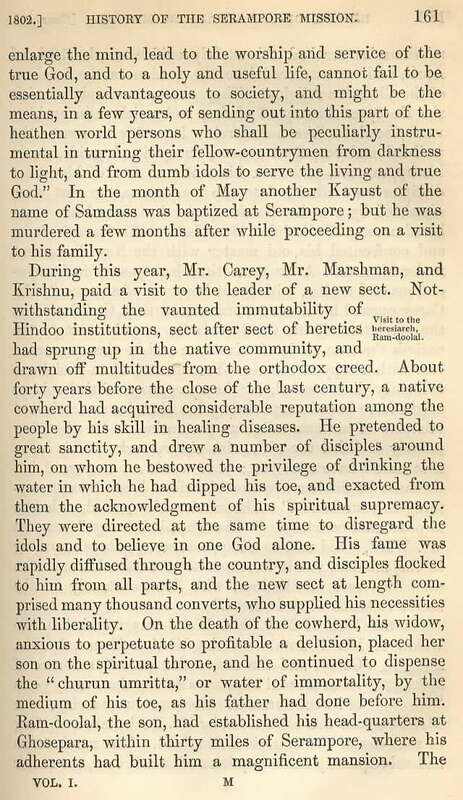 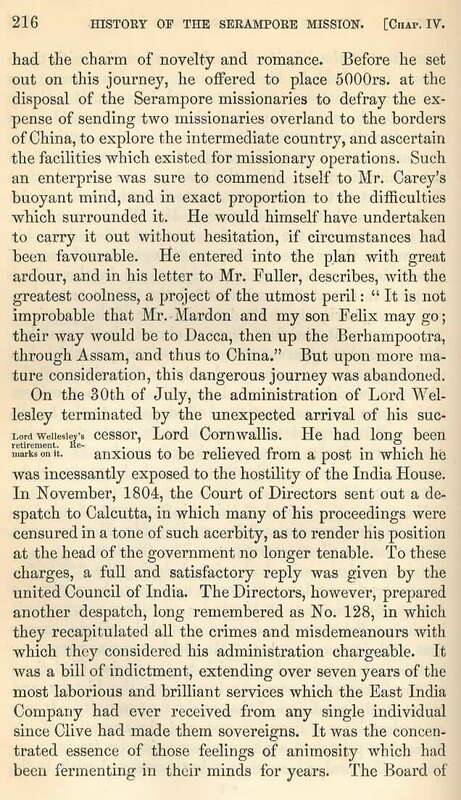 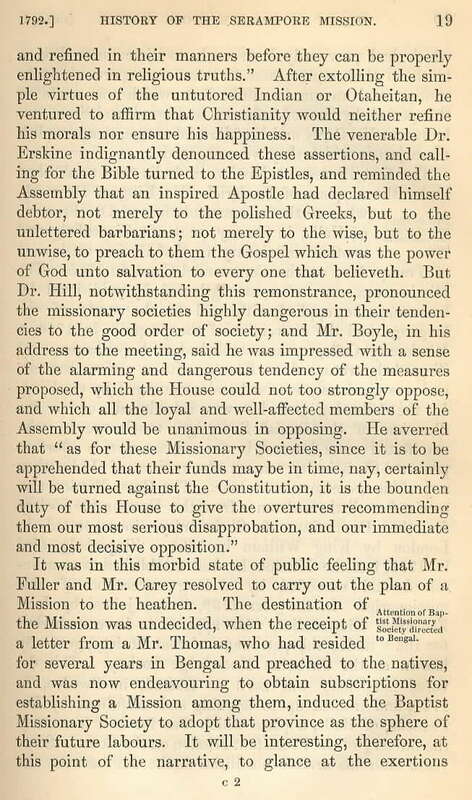 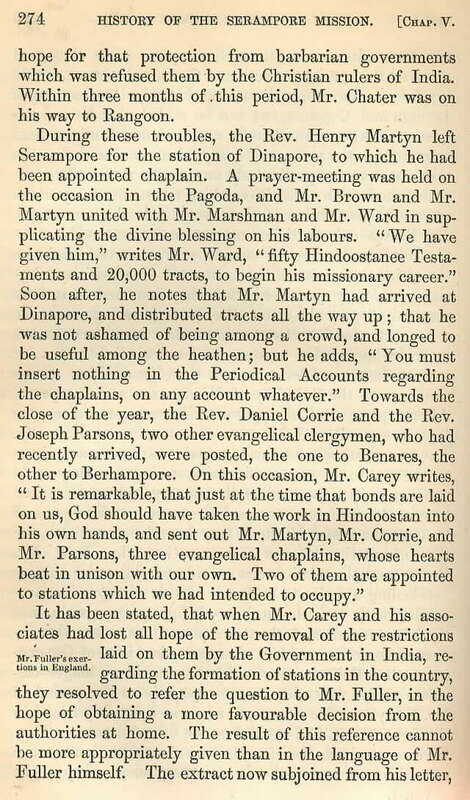 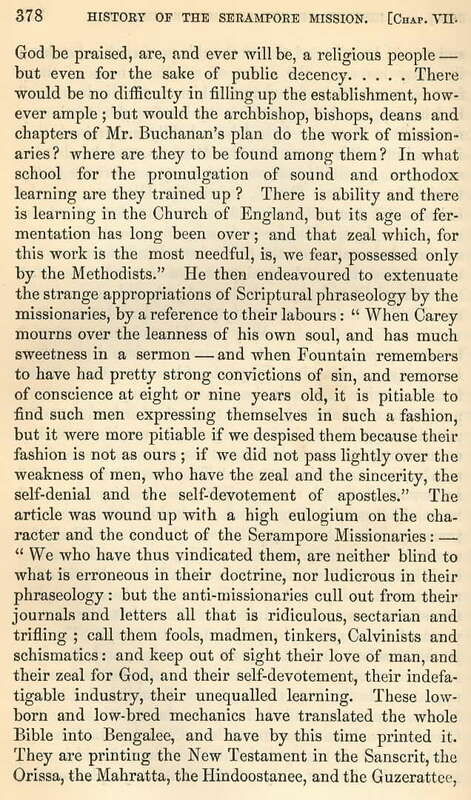 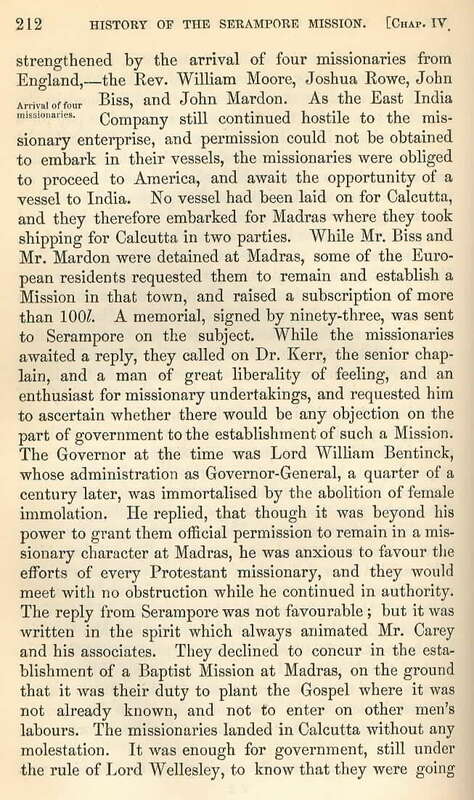 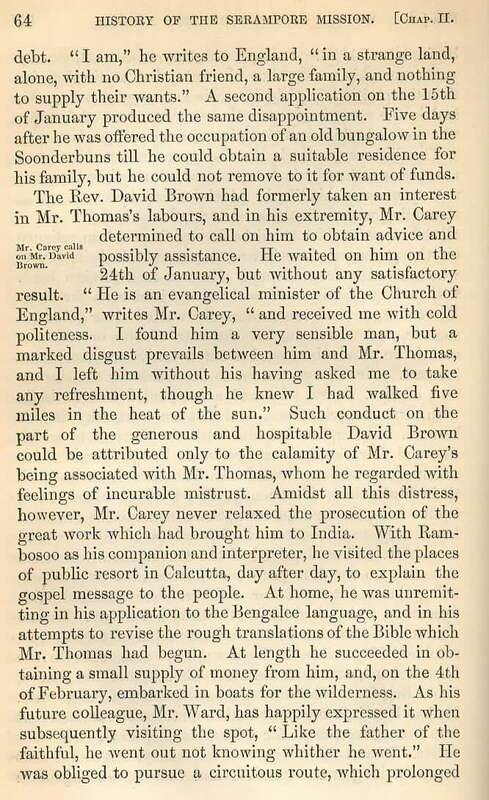 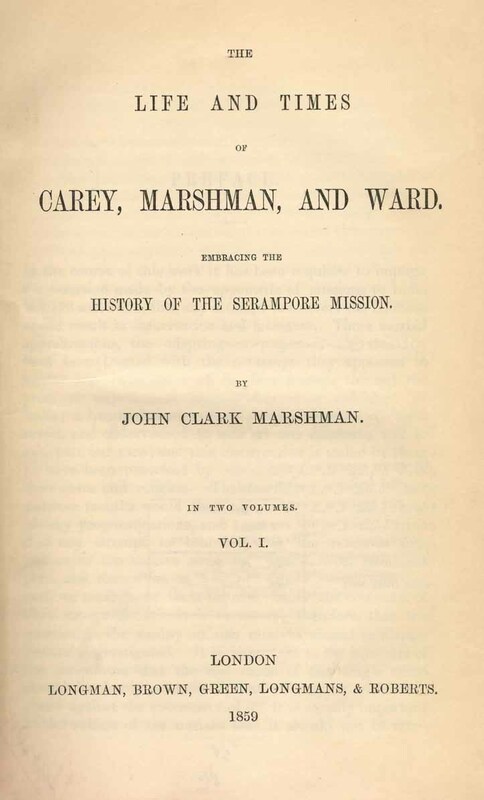 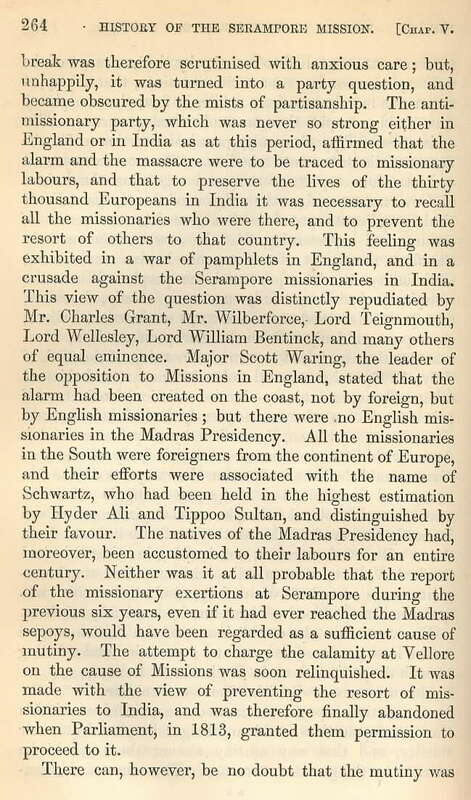 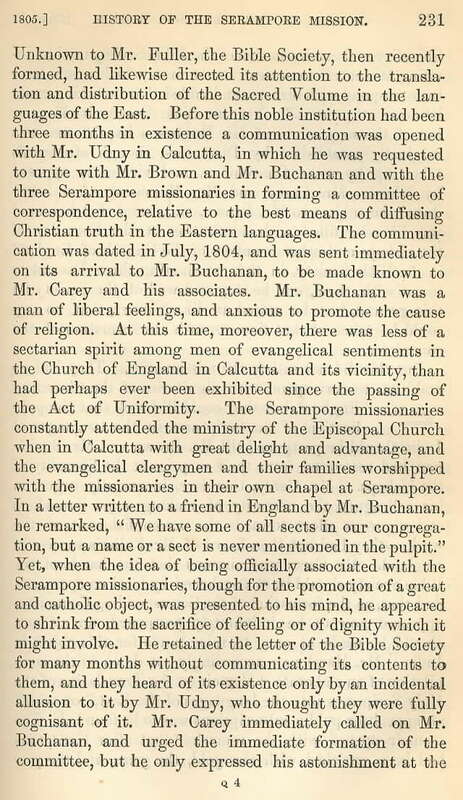 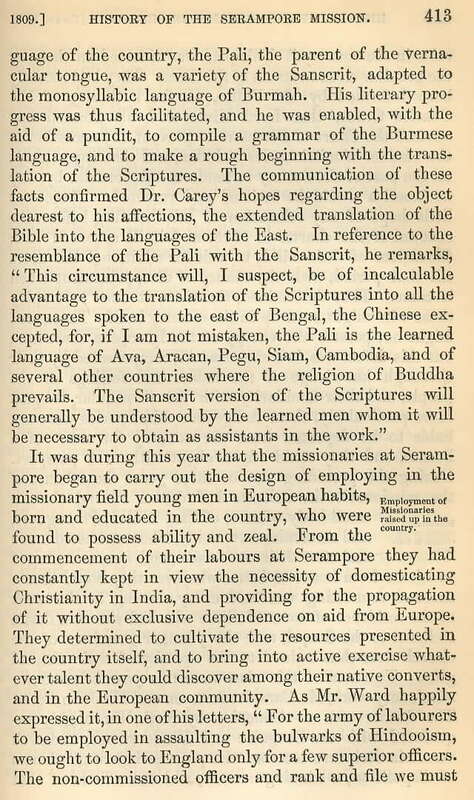 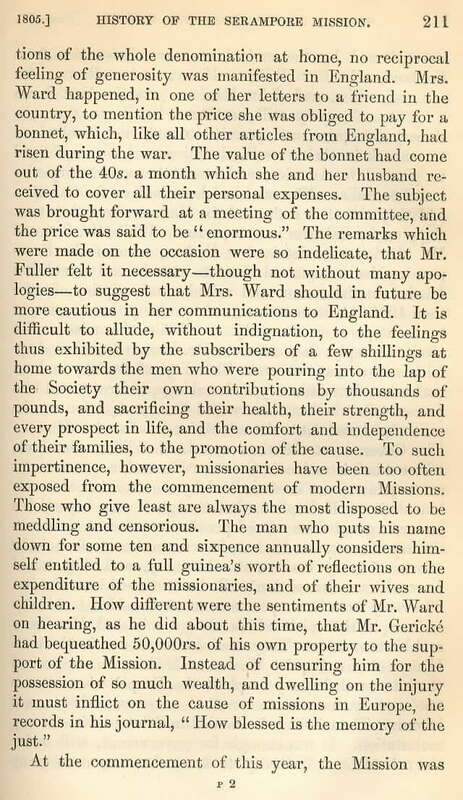 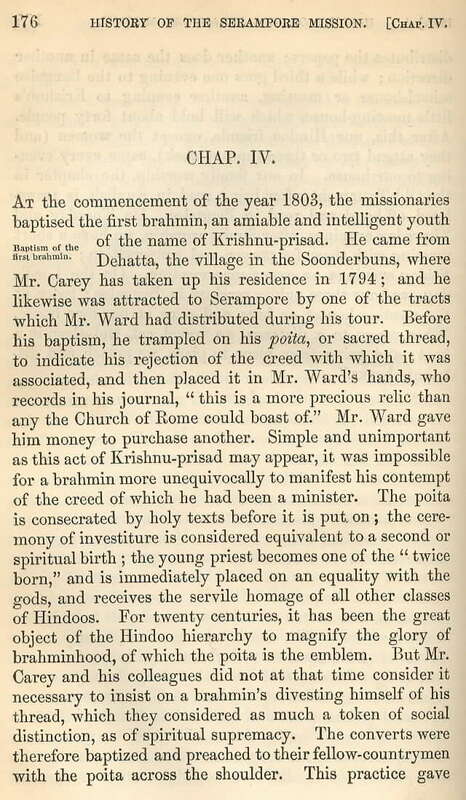 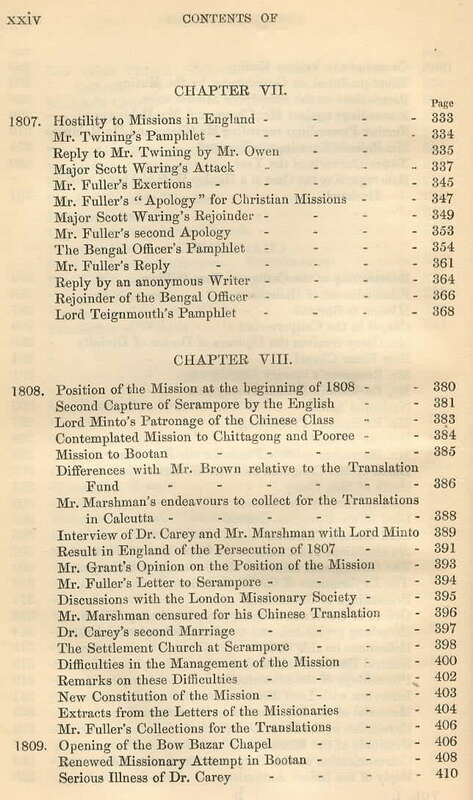 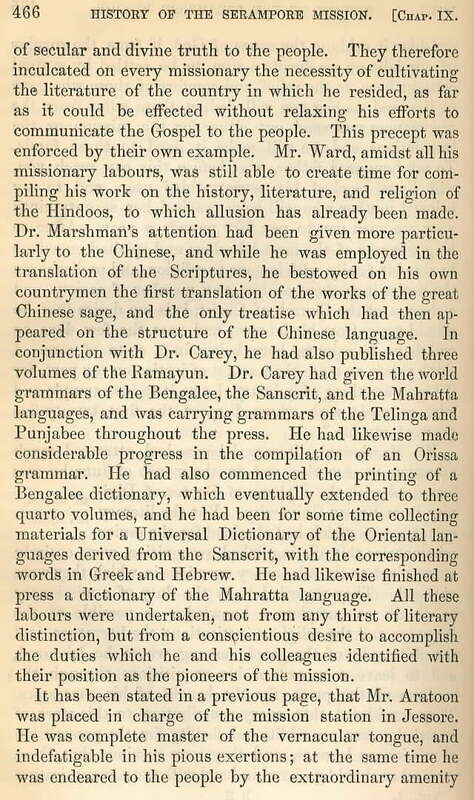 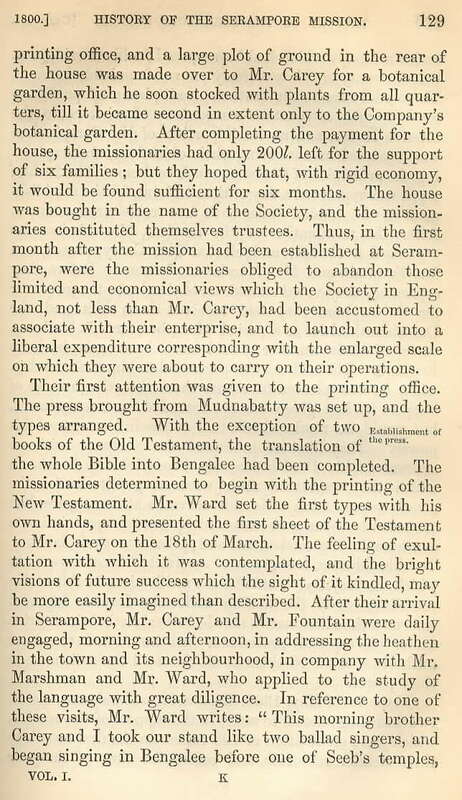 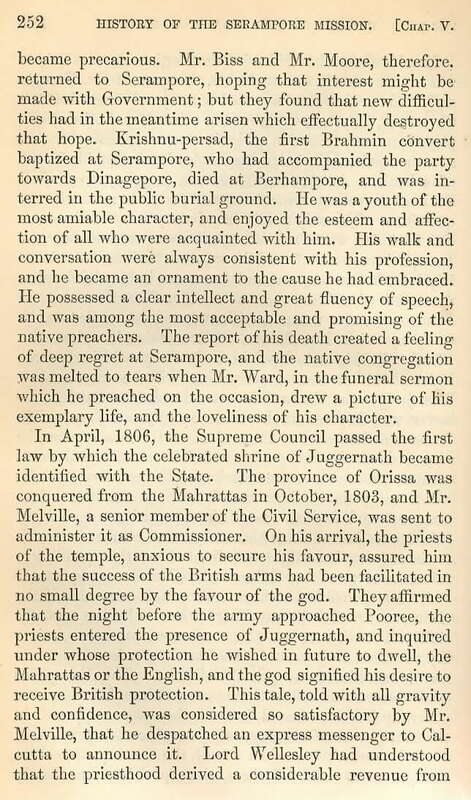 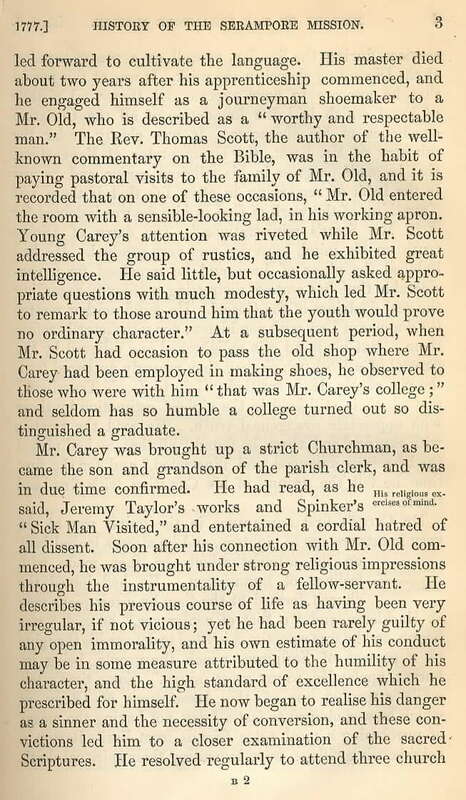 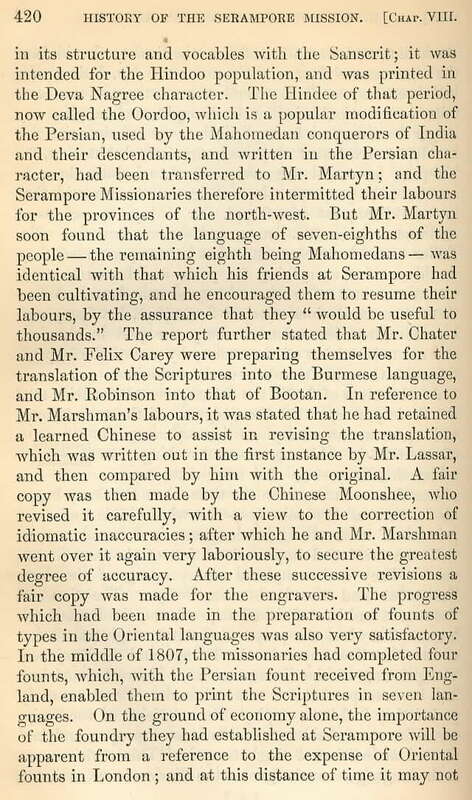 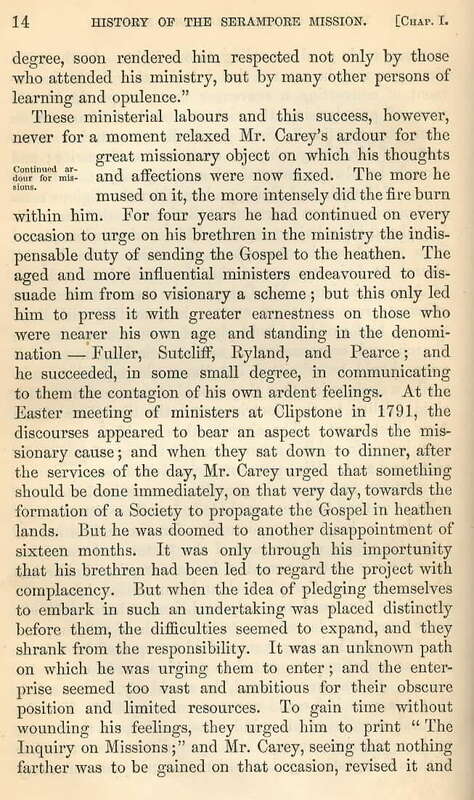 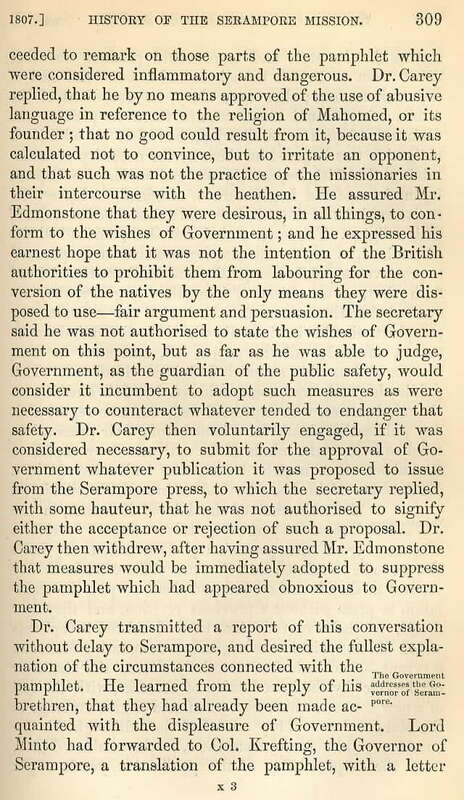 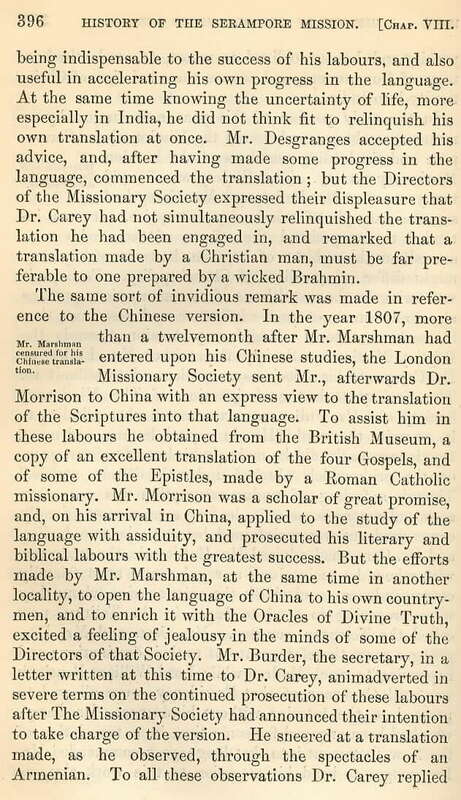 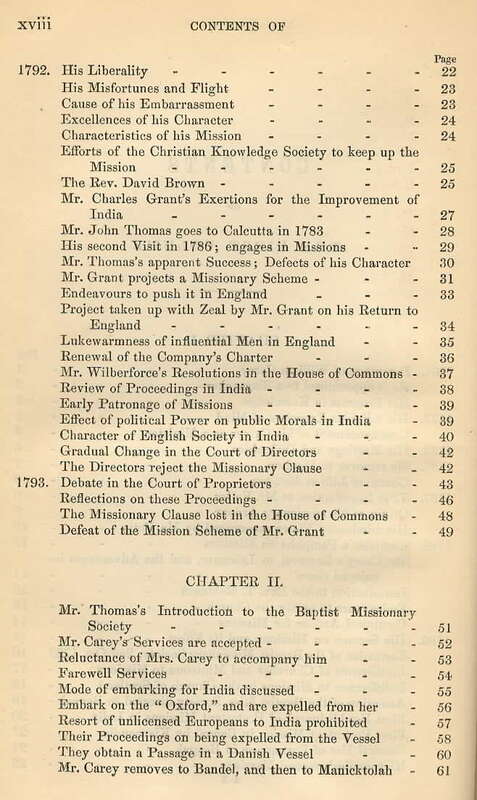 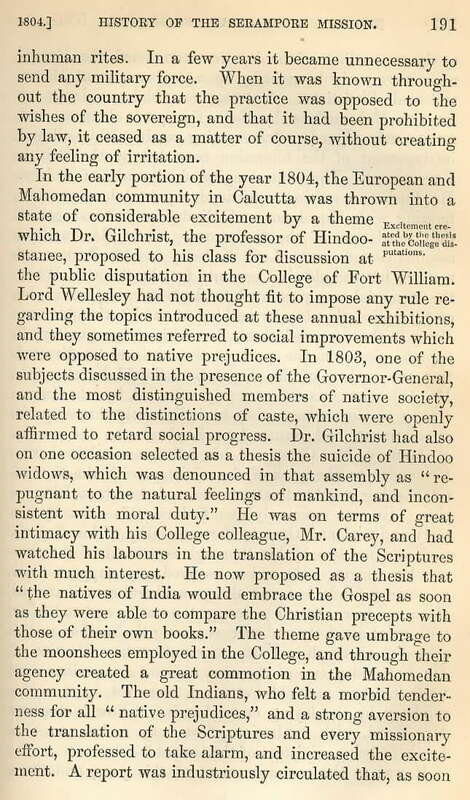 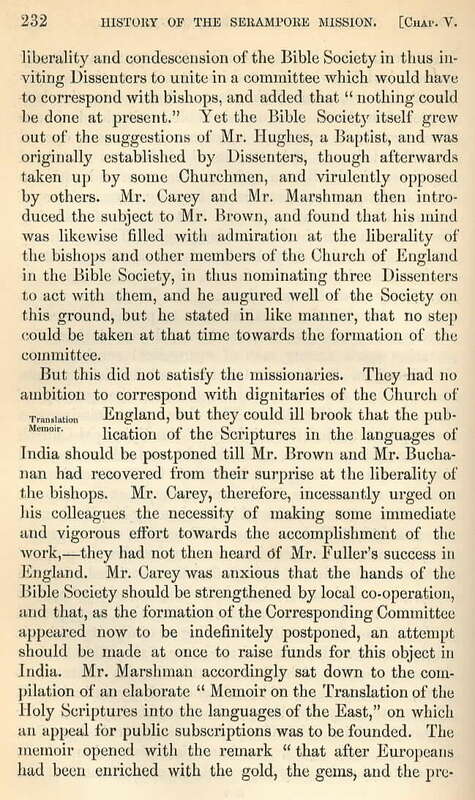 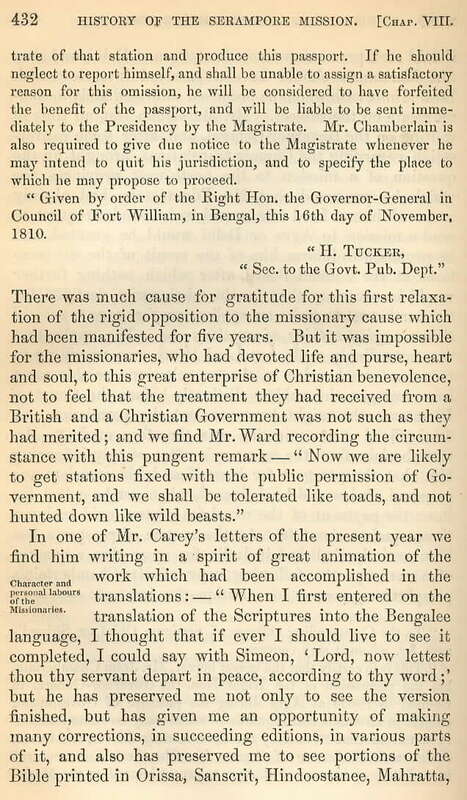 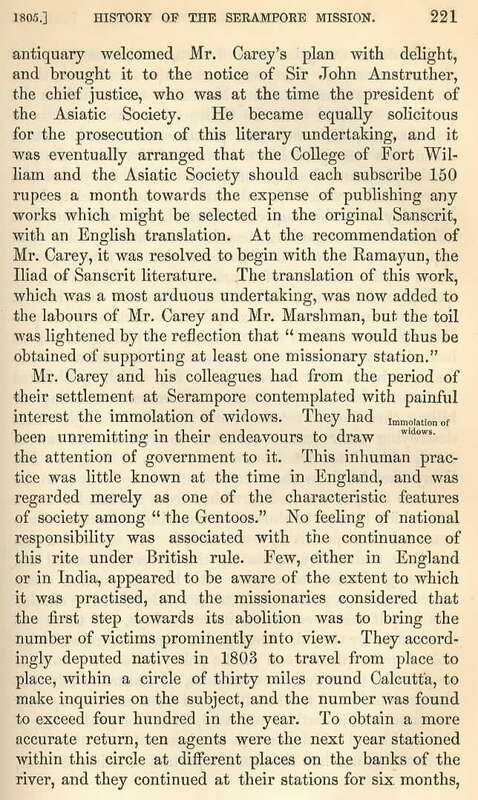 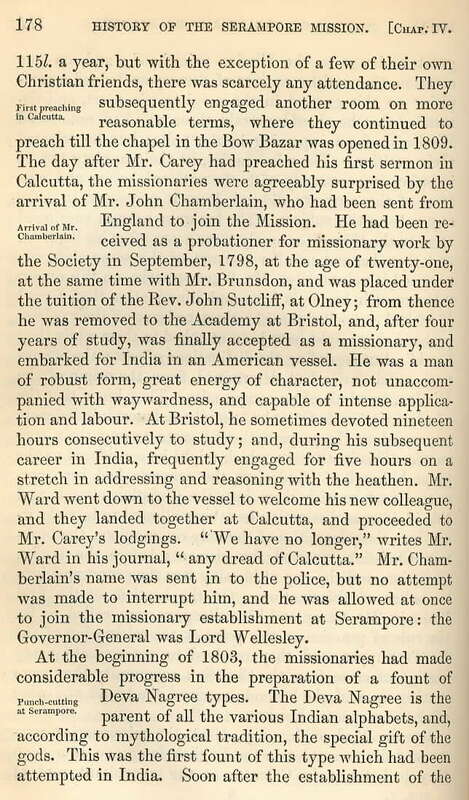 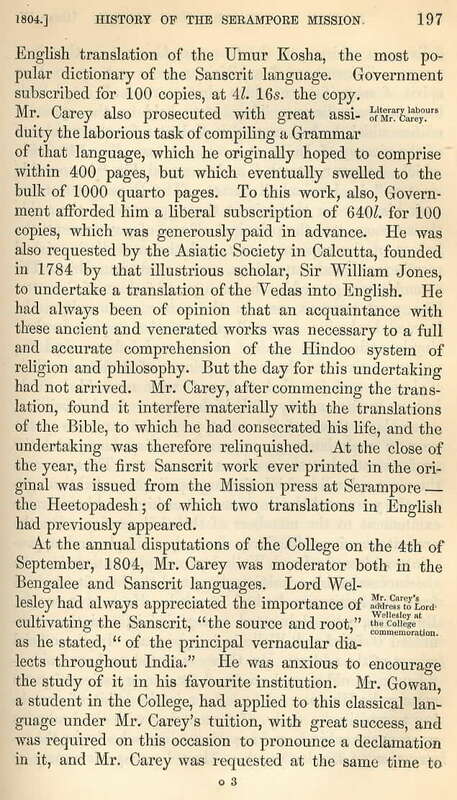 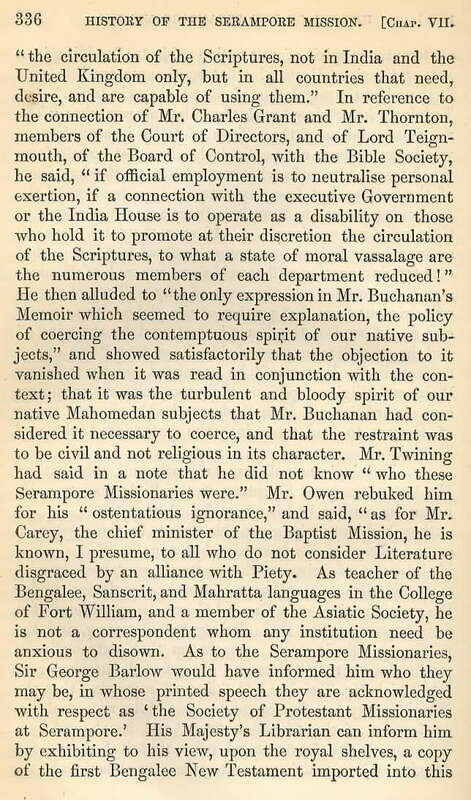 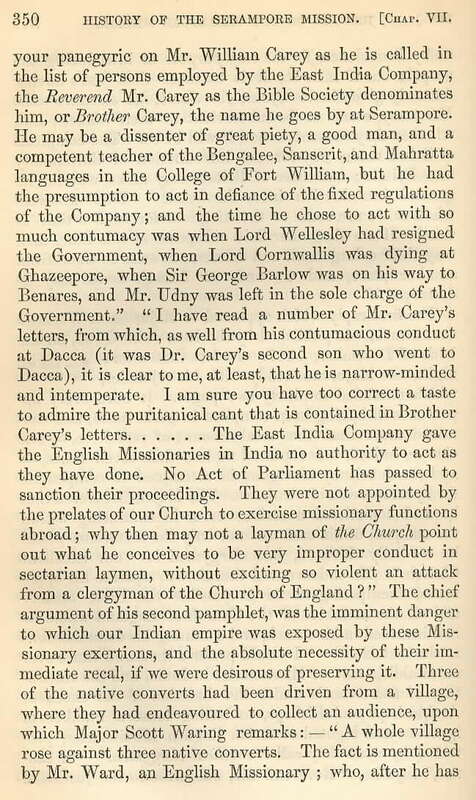 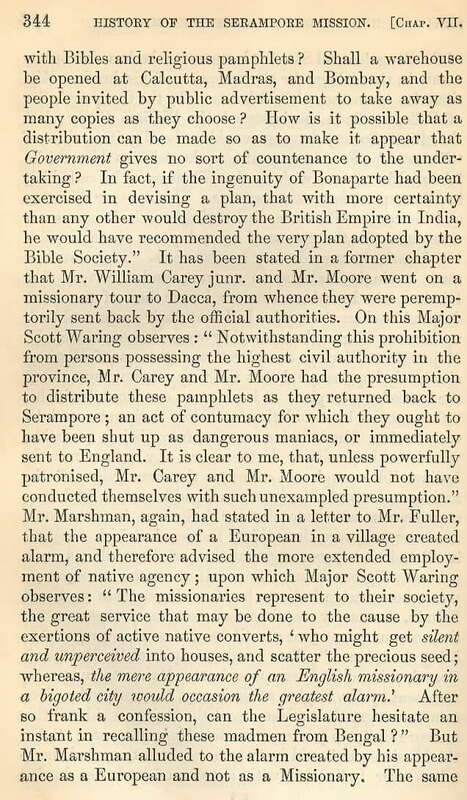 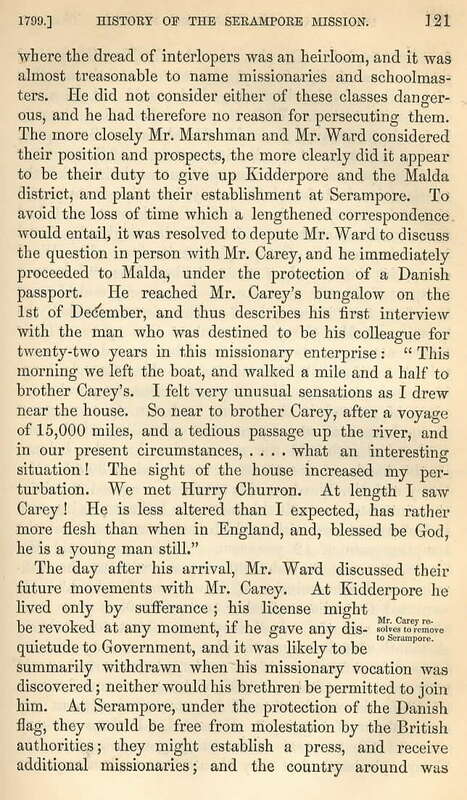 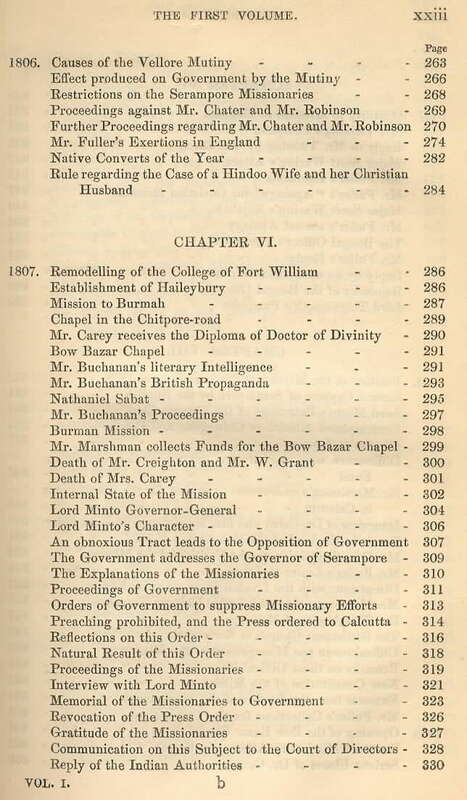 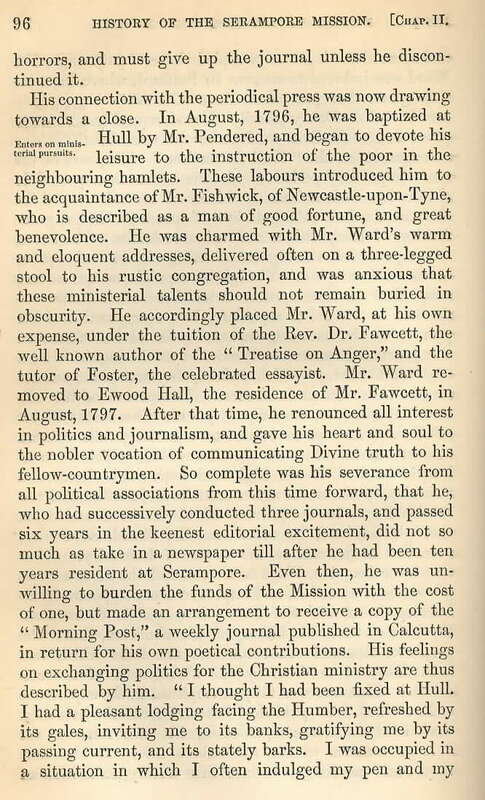 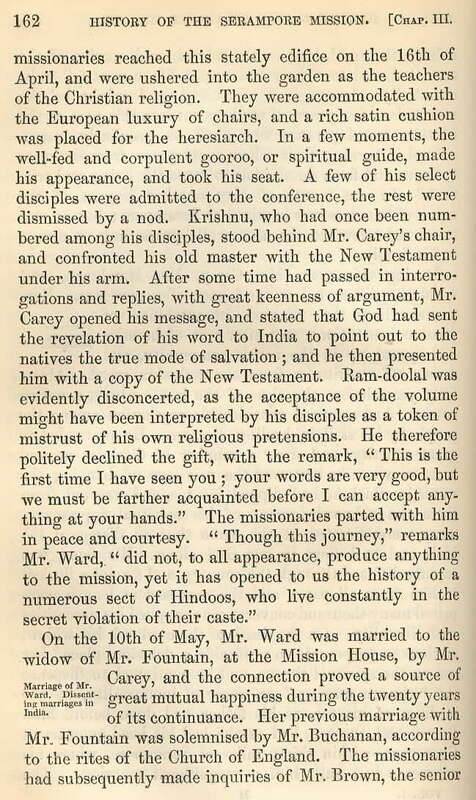 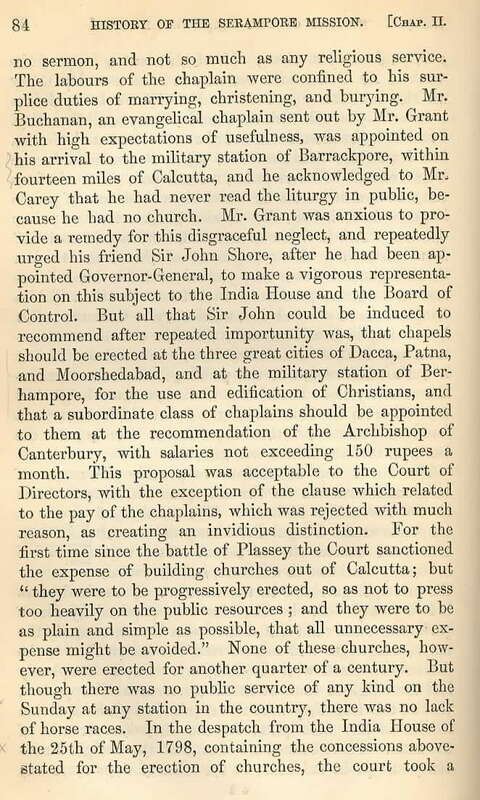 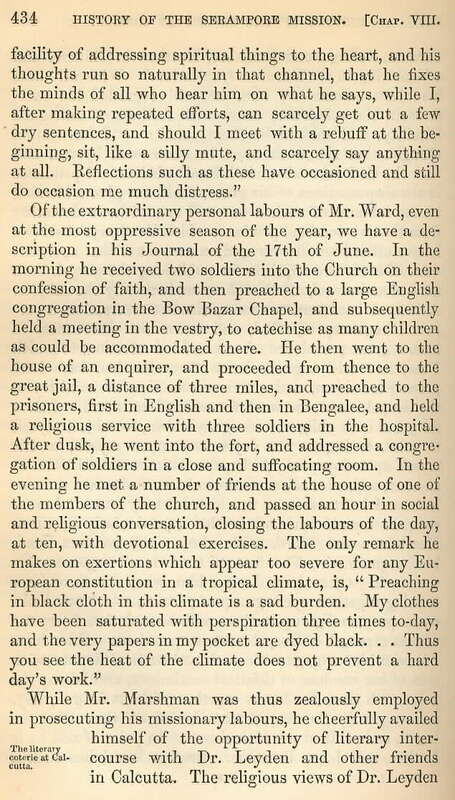 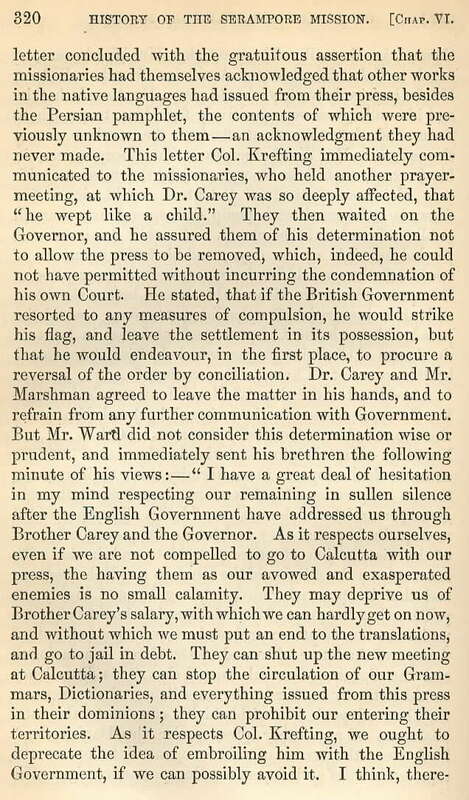 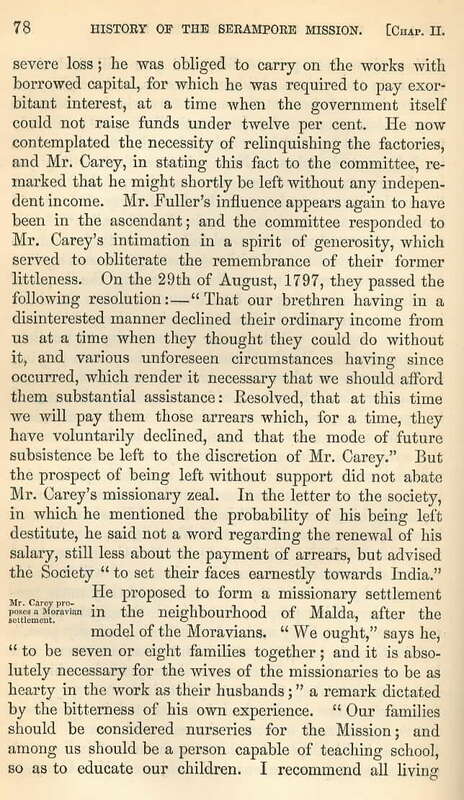 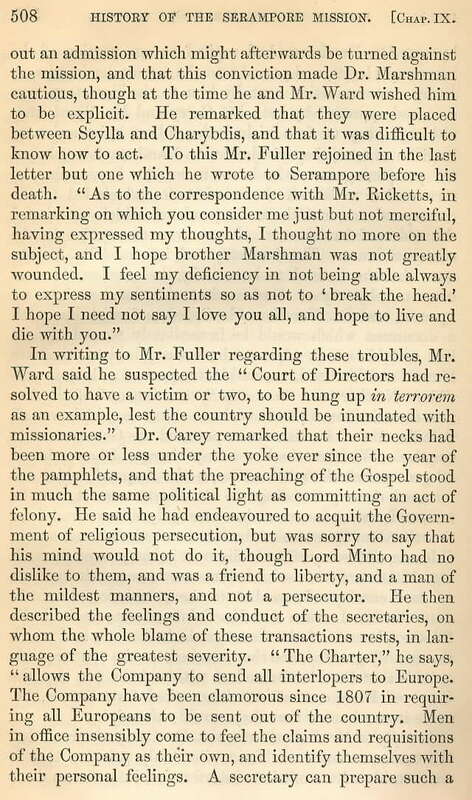 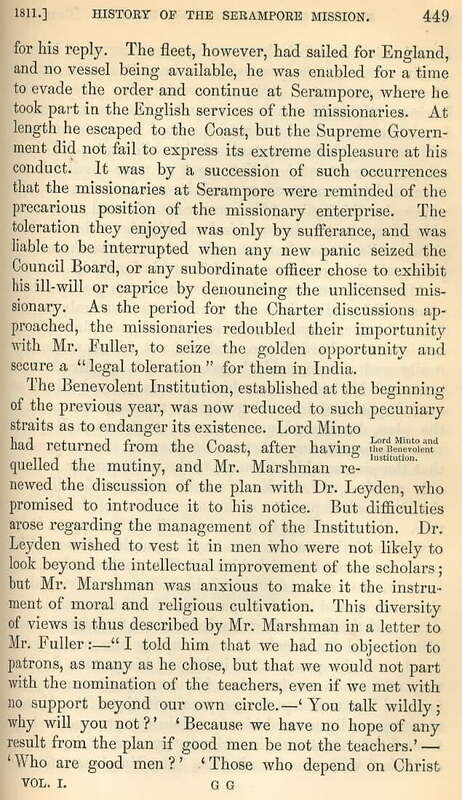 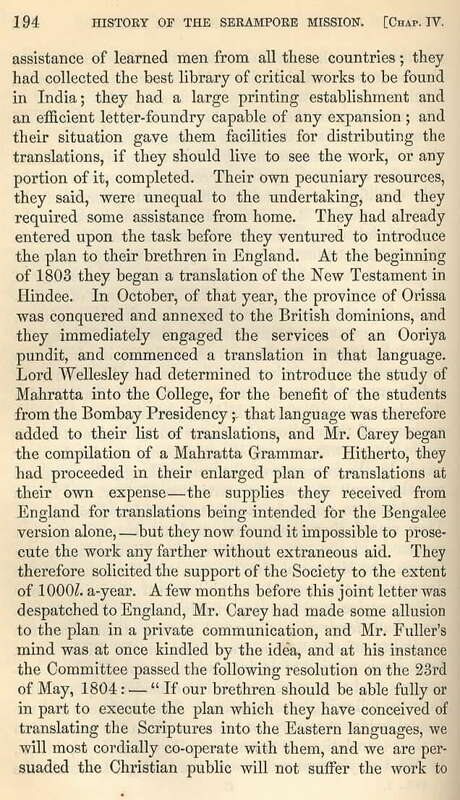 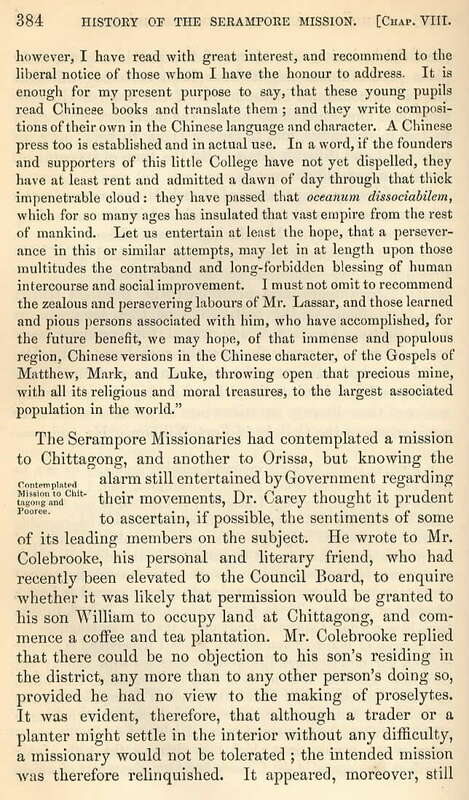 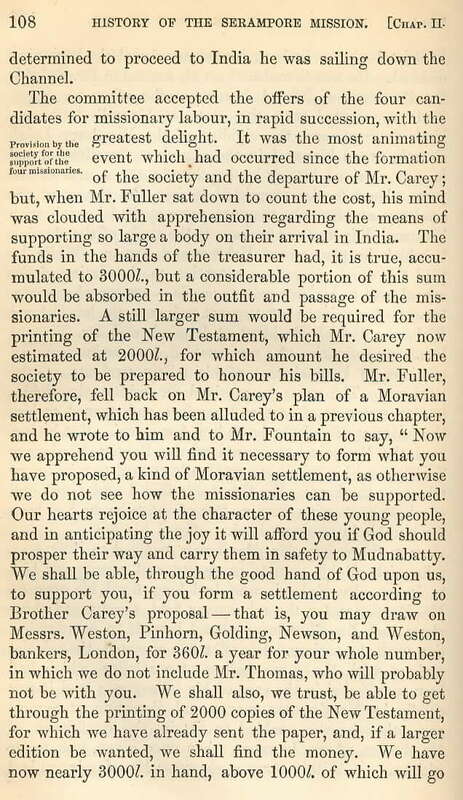 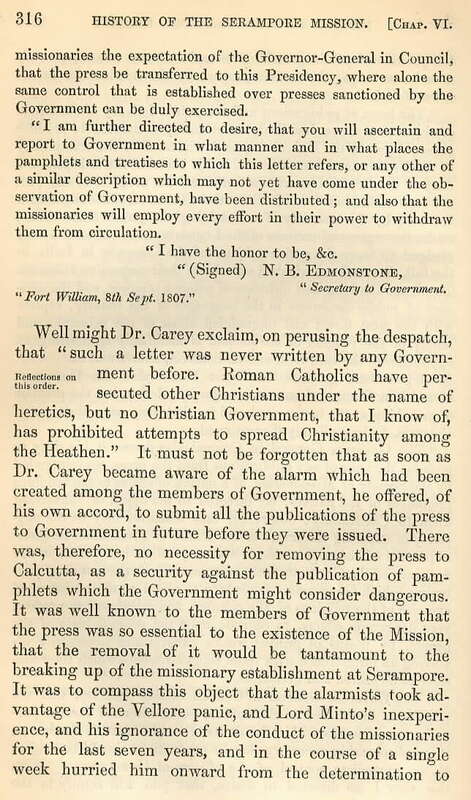 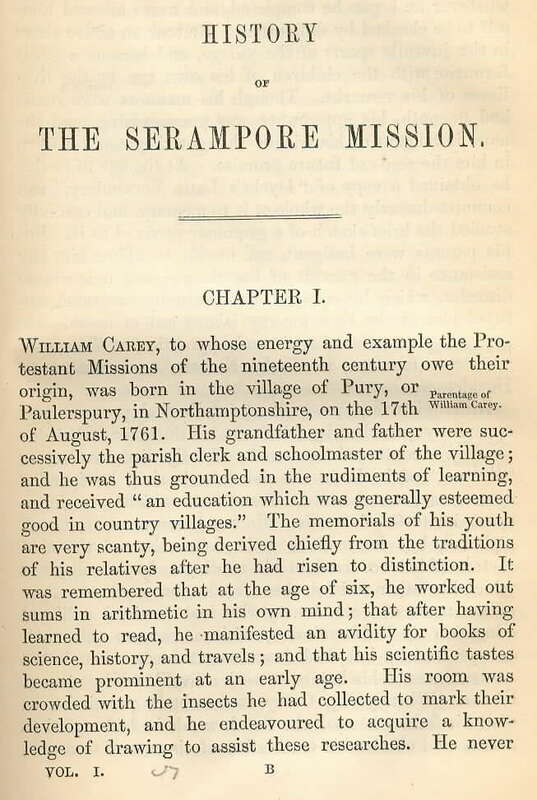 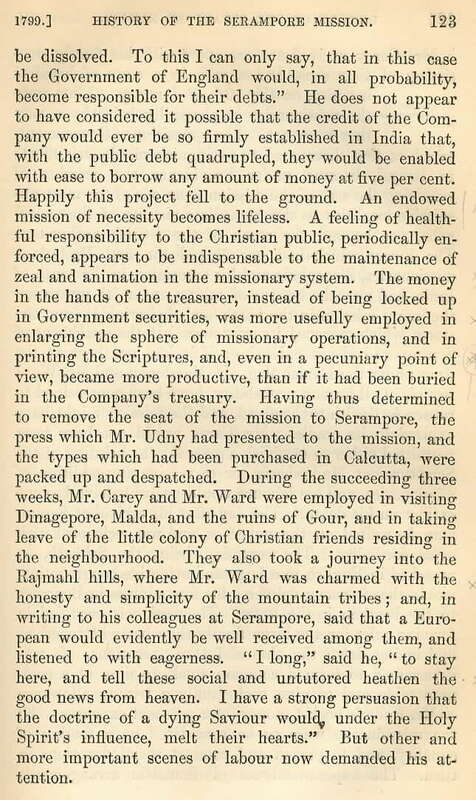 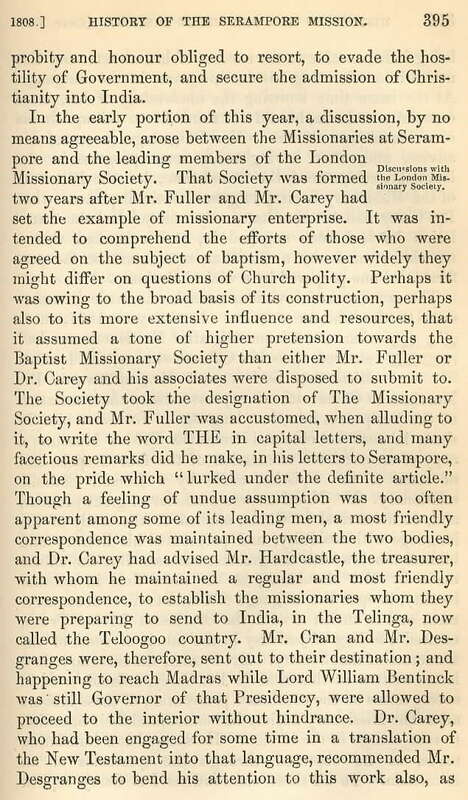 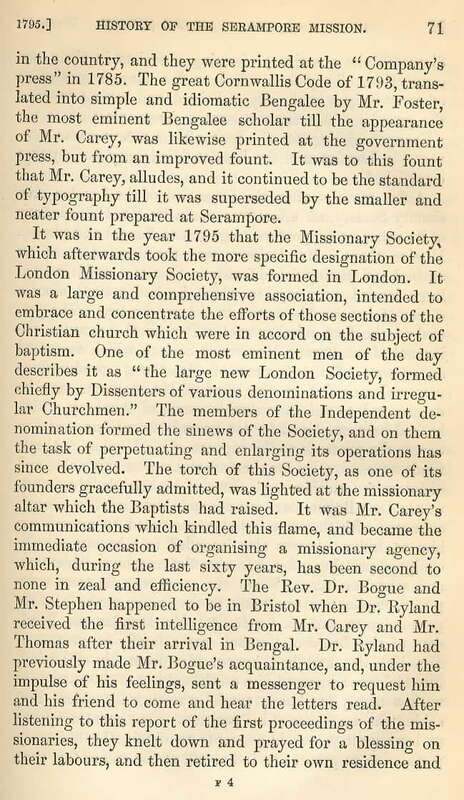 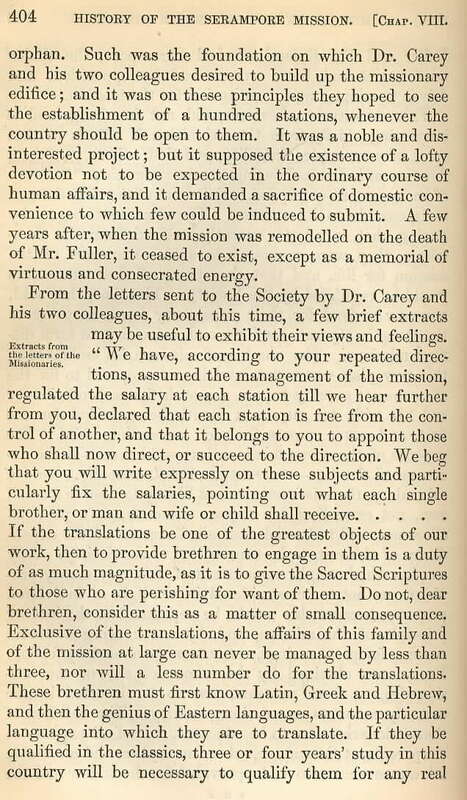 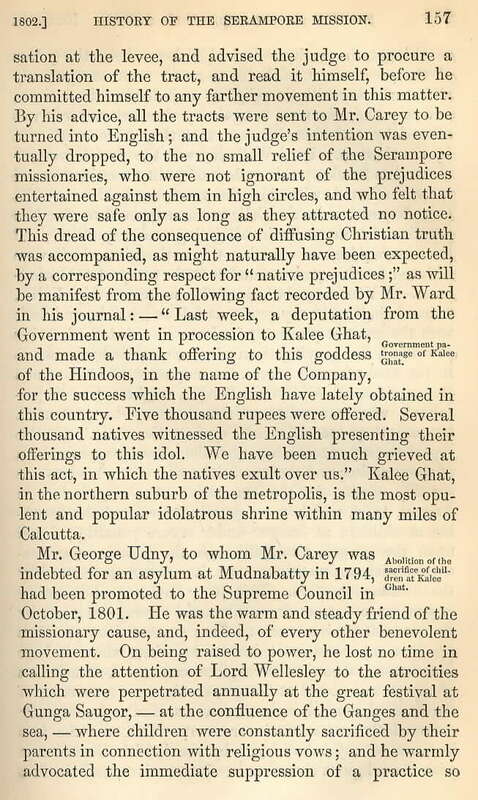 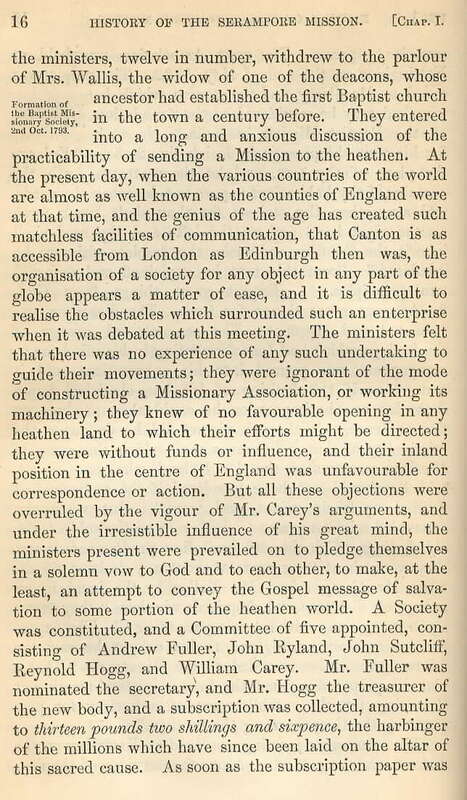 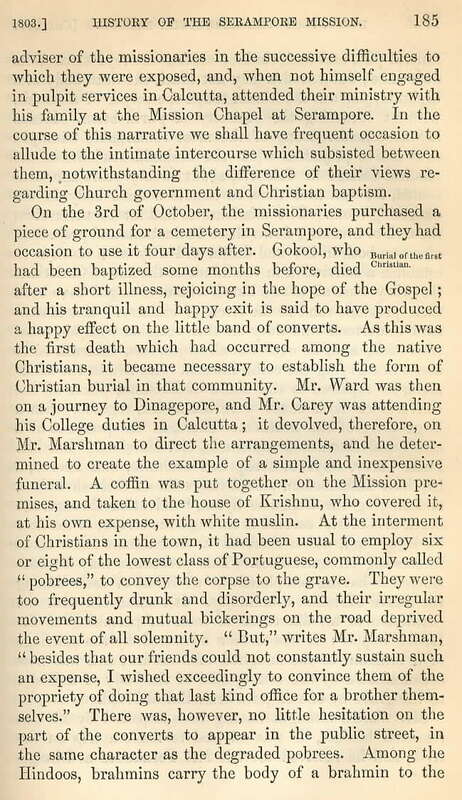 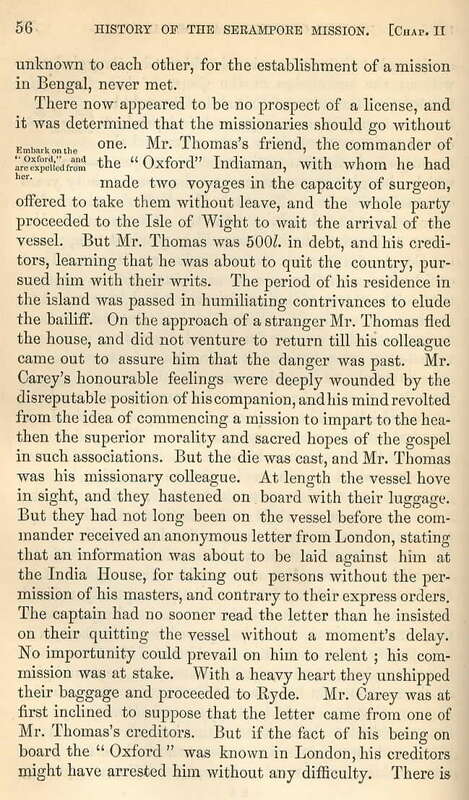 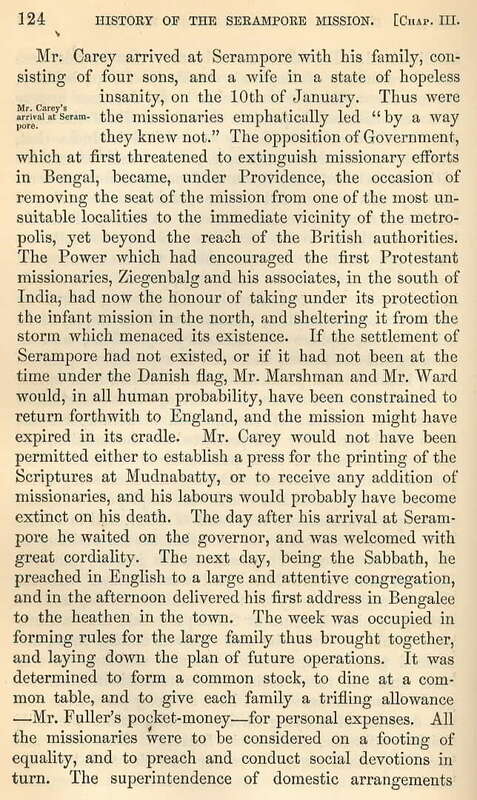 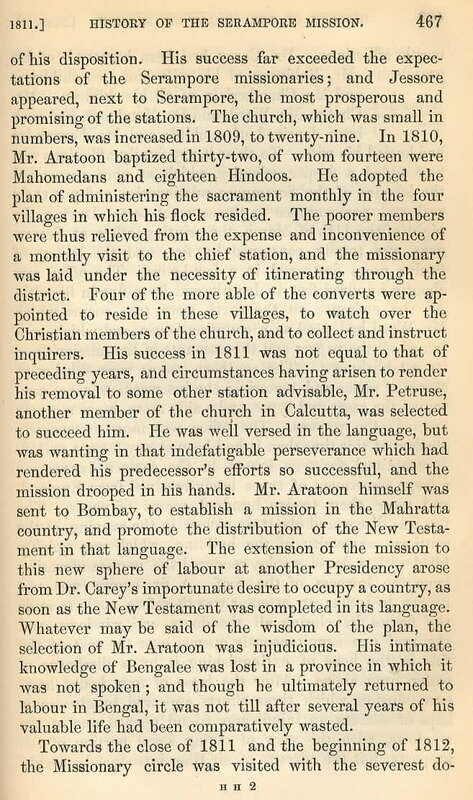 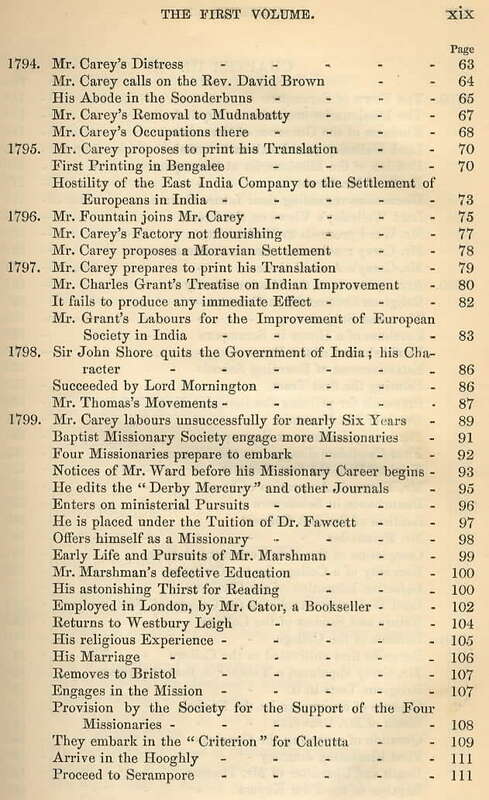 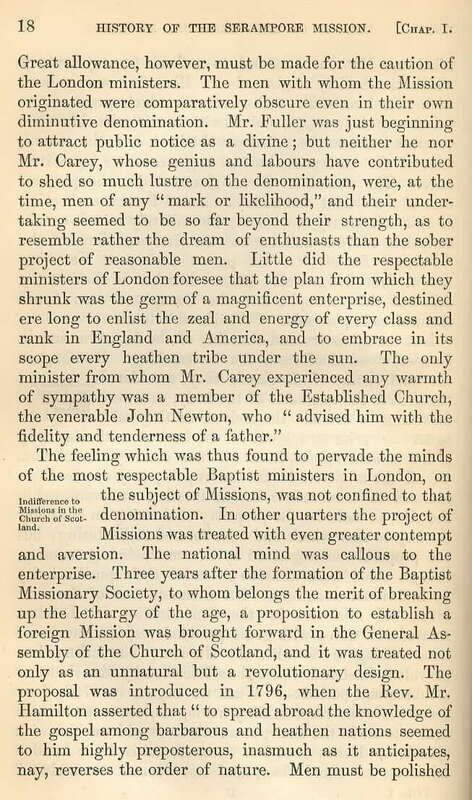 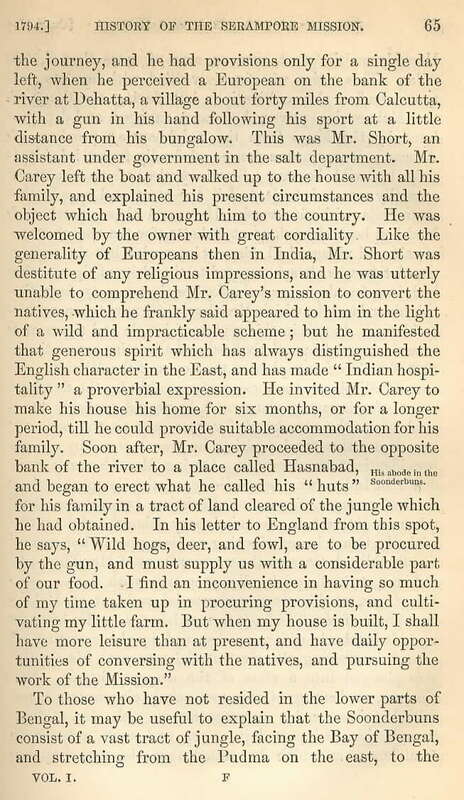 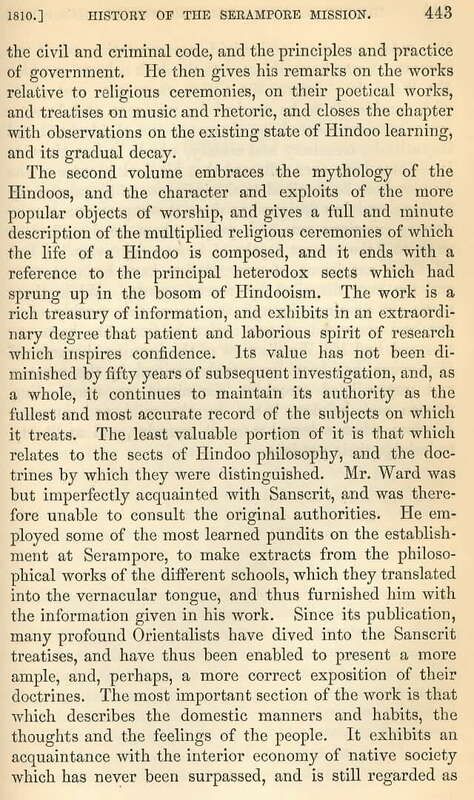 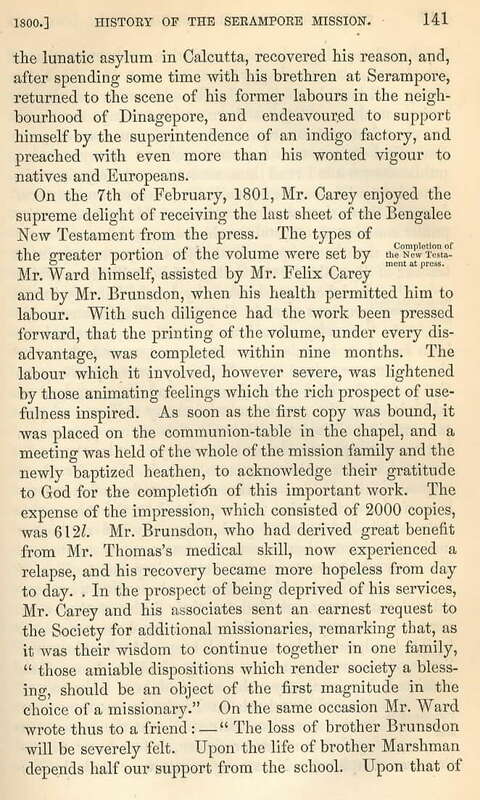 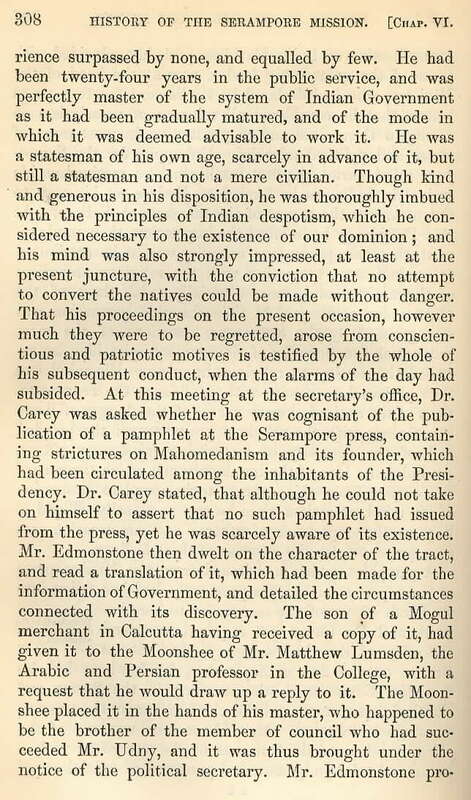 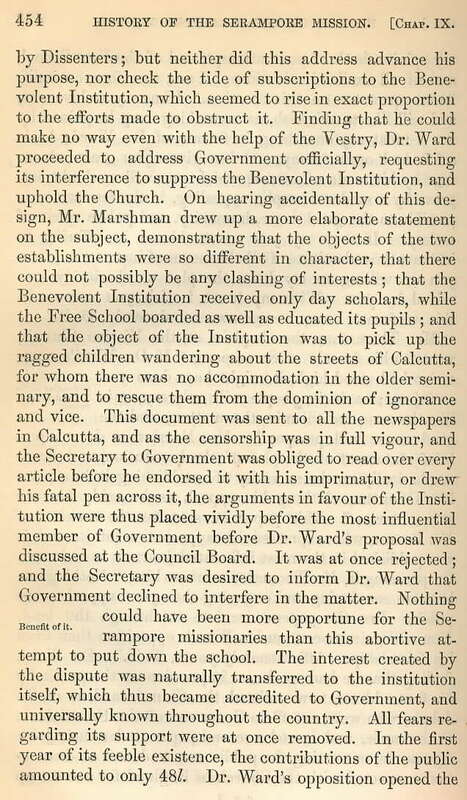 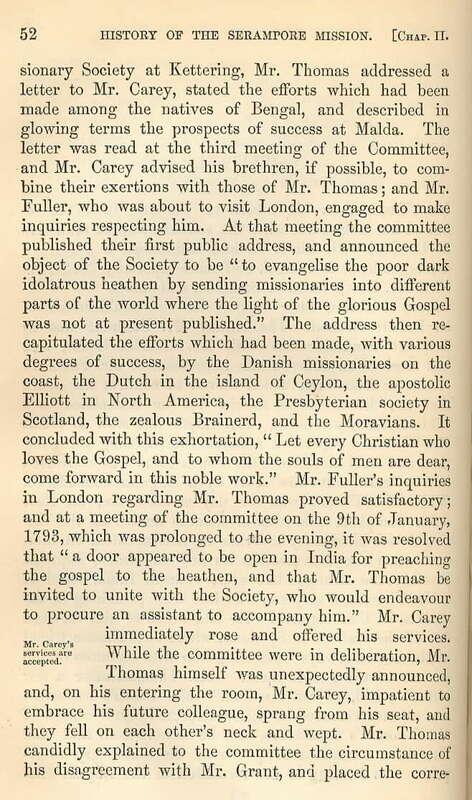 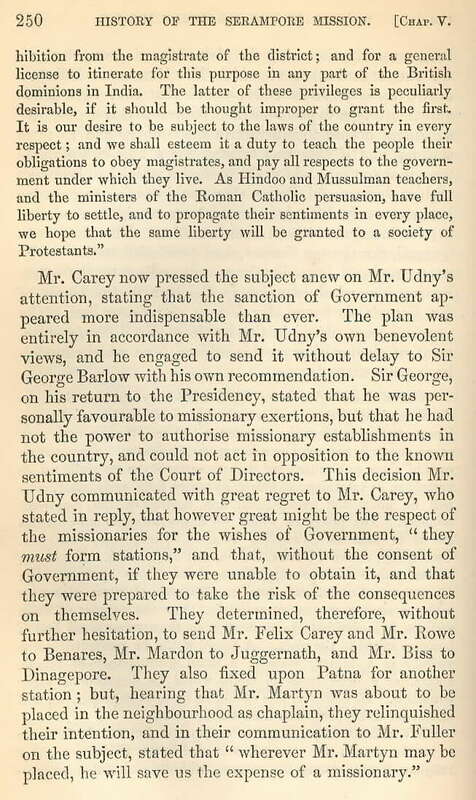 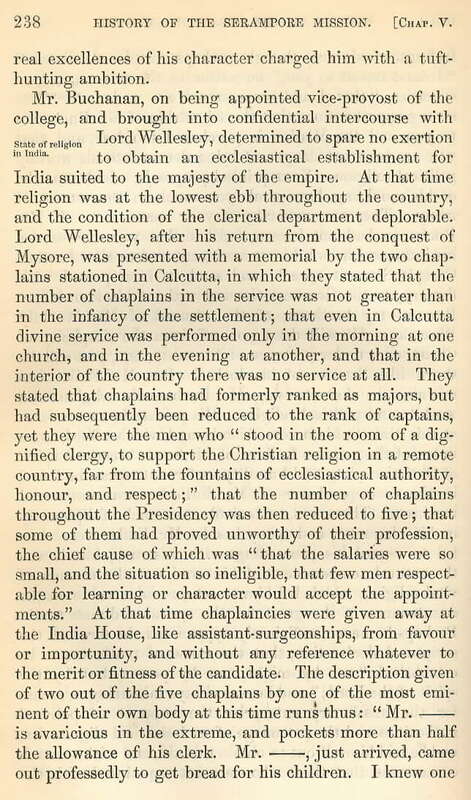 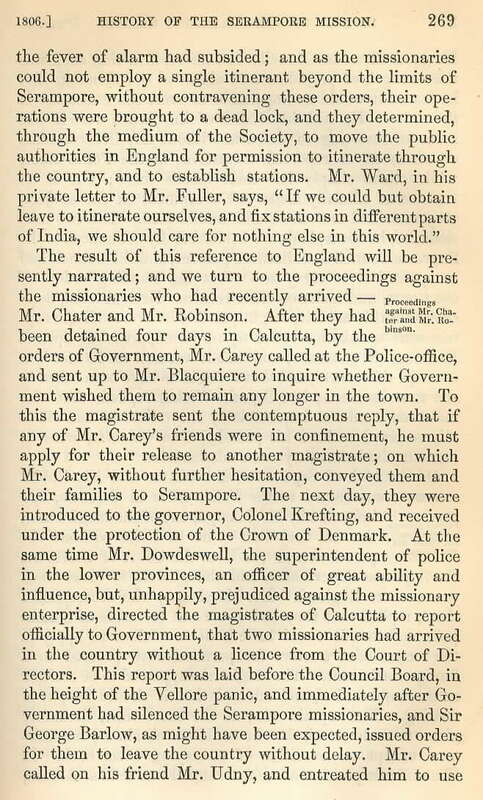 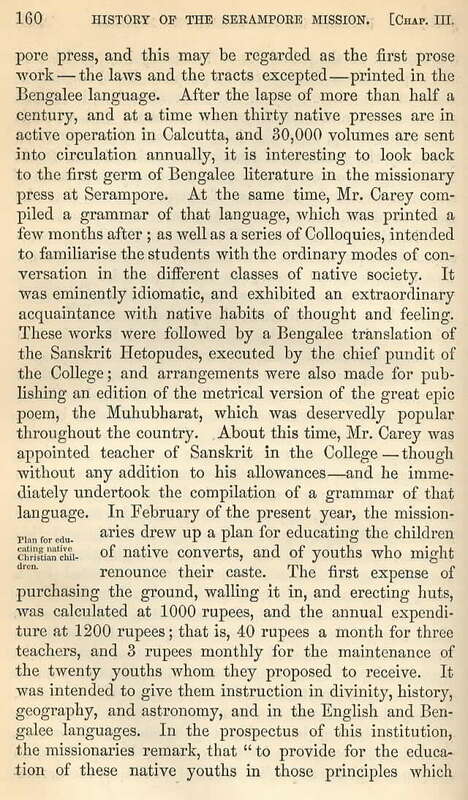 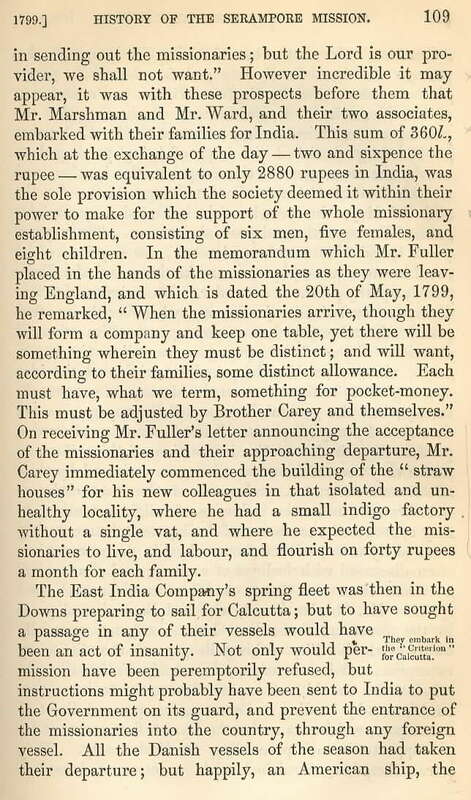 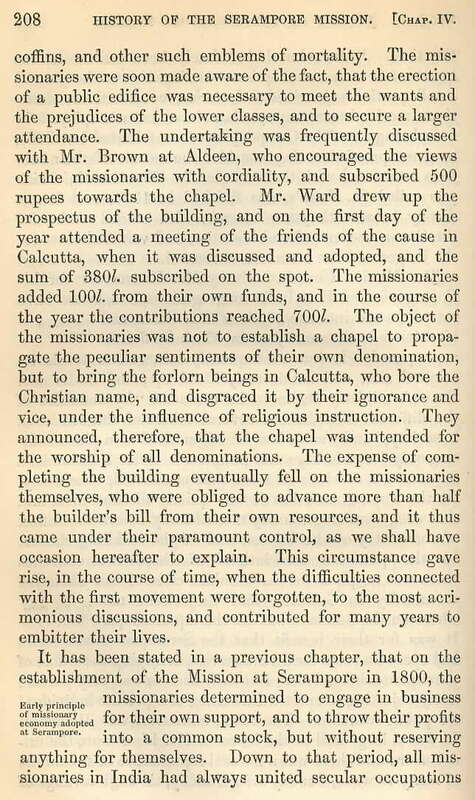 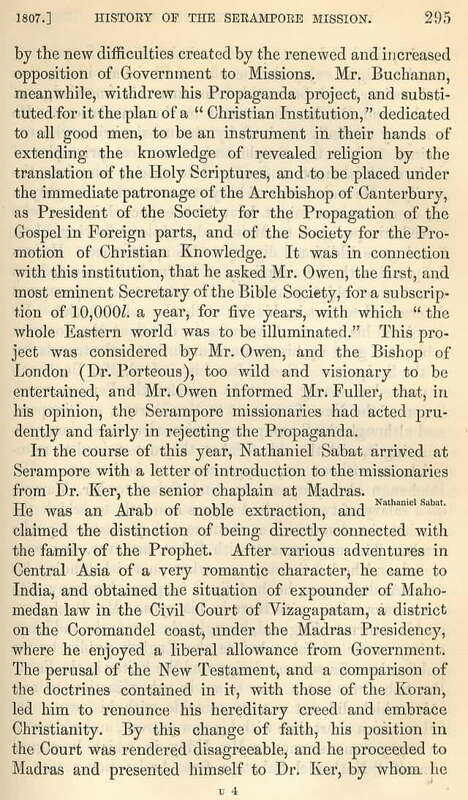 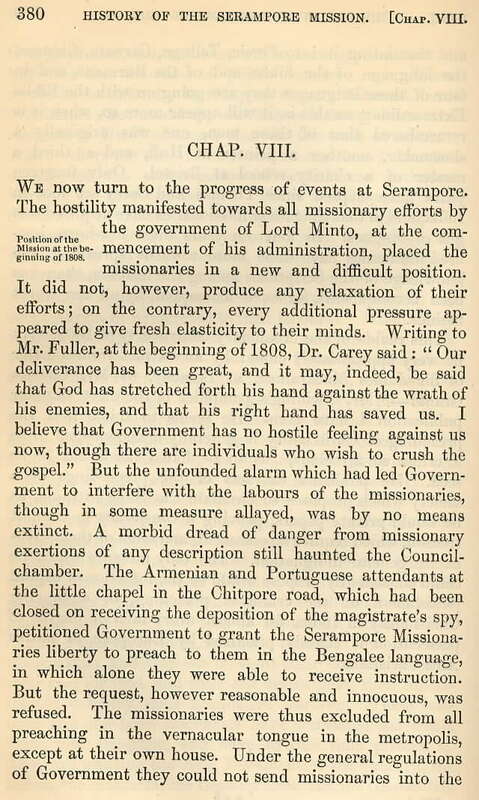 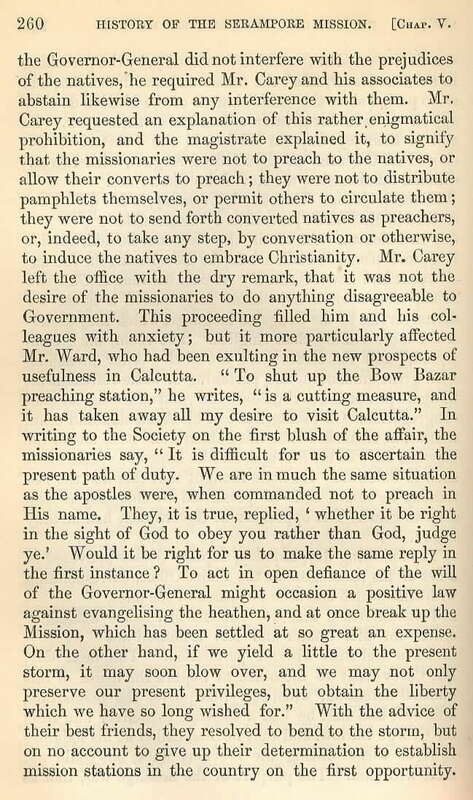 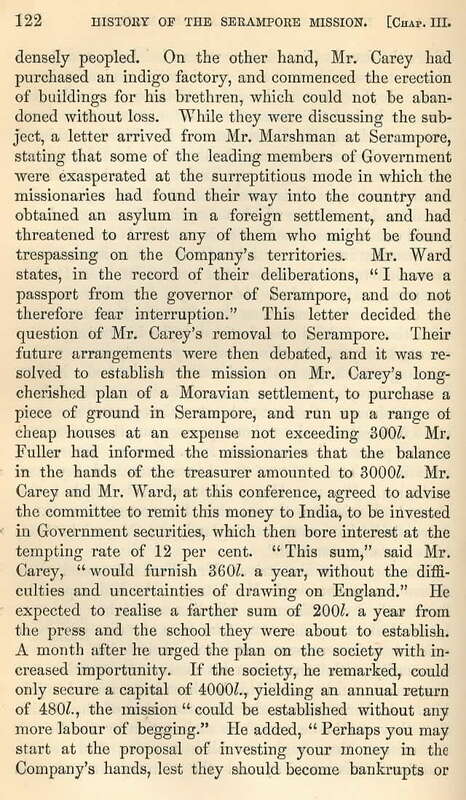 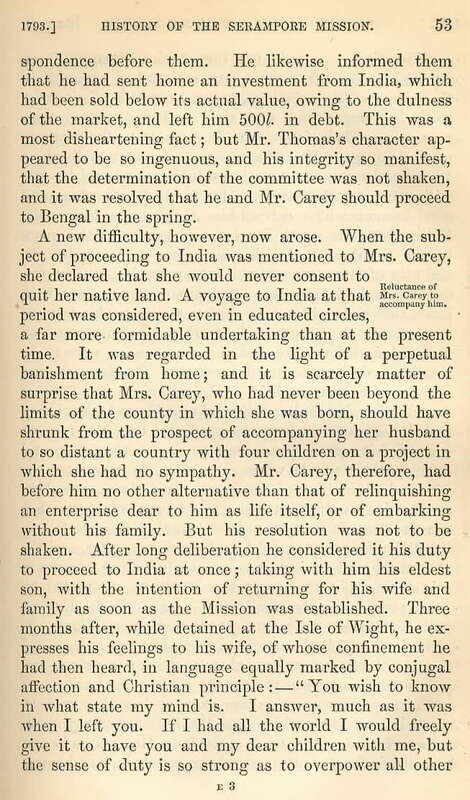 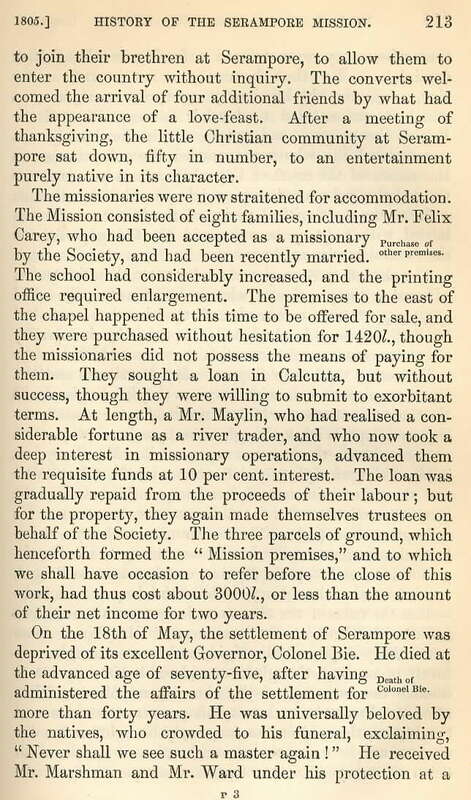 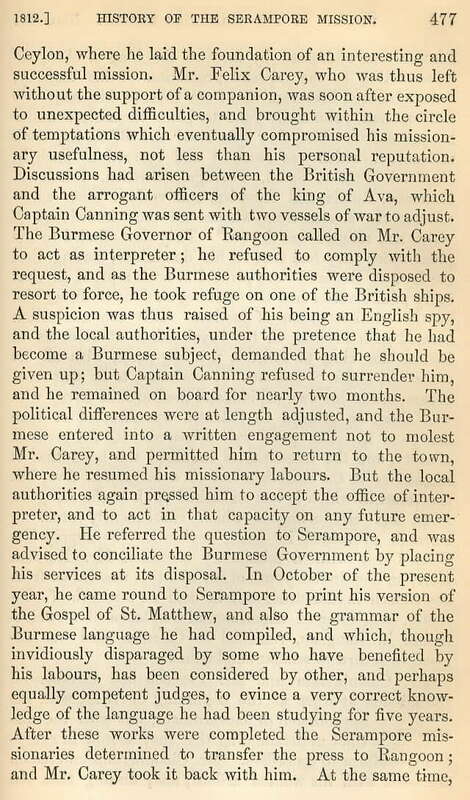 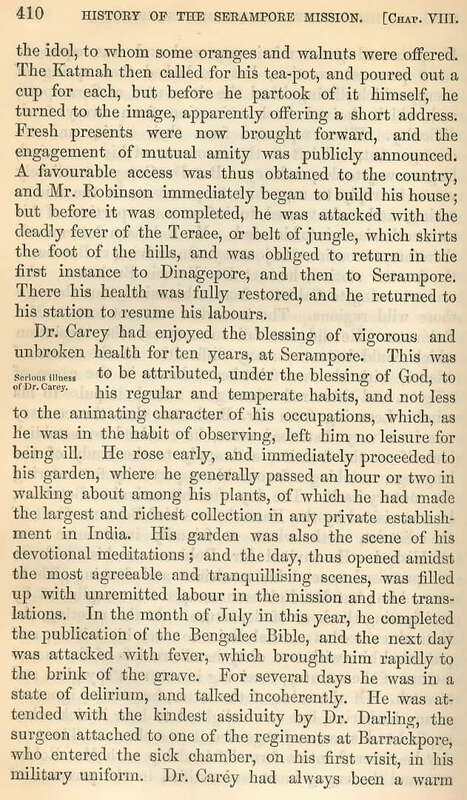 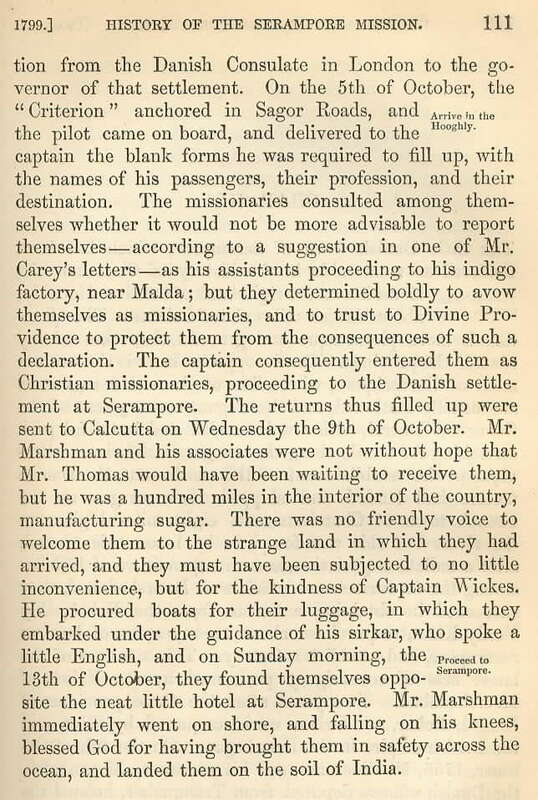 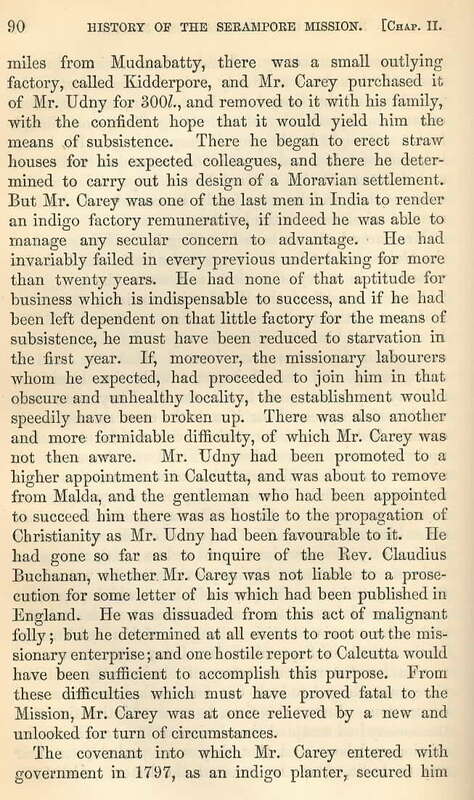 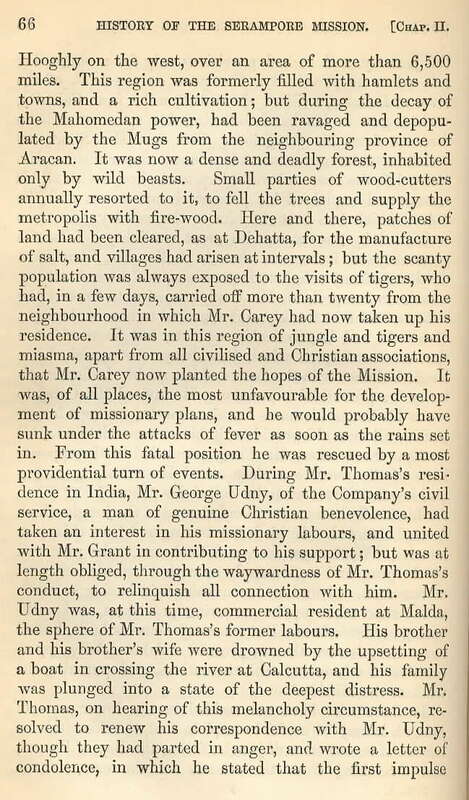 Following below is the full-text presentation of The Life and Times of Carey, Marshman, and Ward Embracing the History of the Serampore Mission, 2 vols. 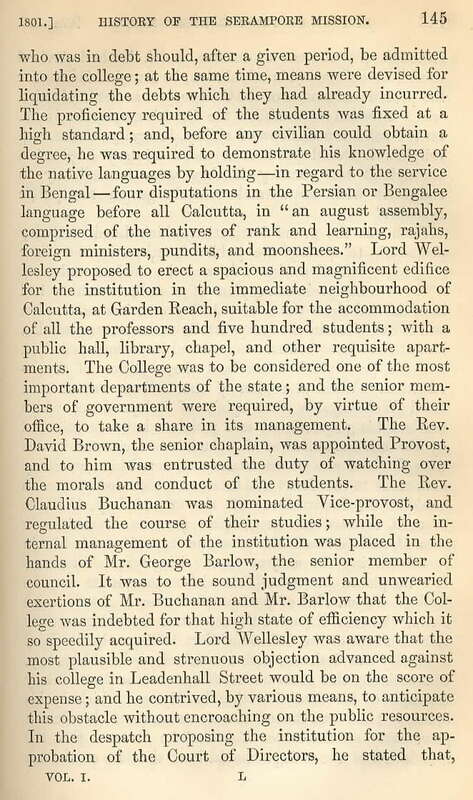 (London: Longman, Brown, Green, Longmans & Roberts, 1859). 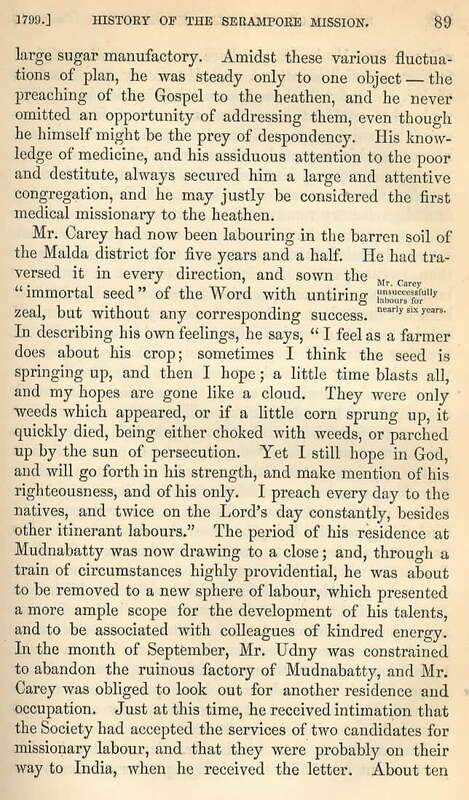 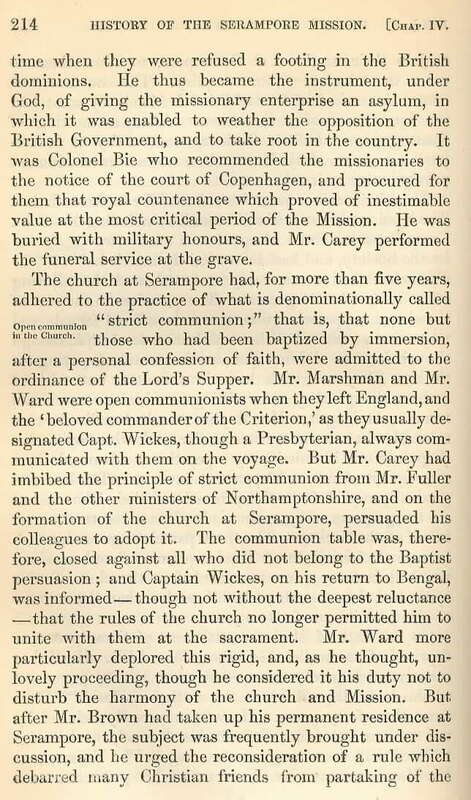 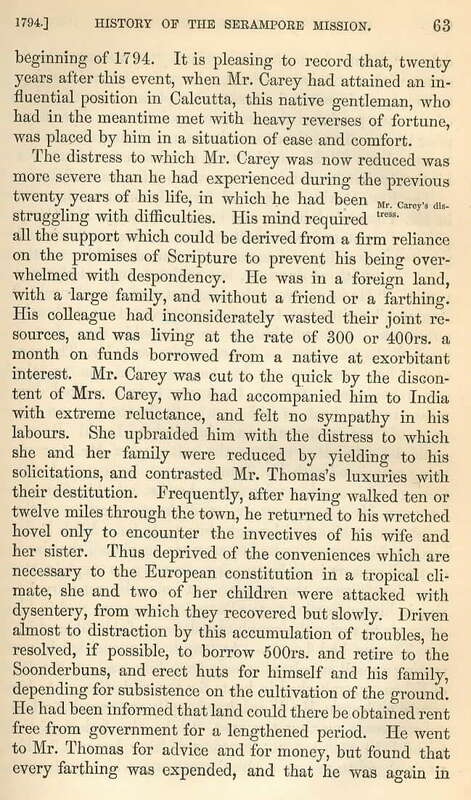 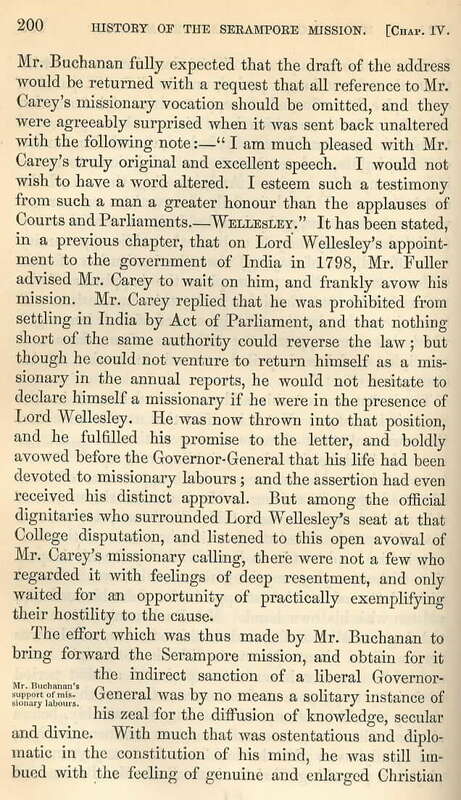 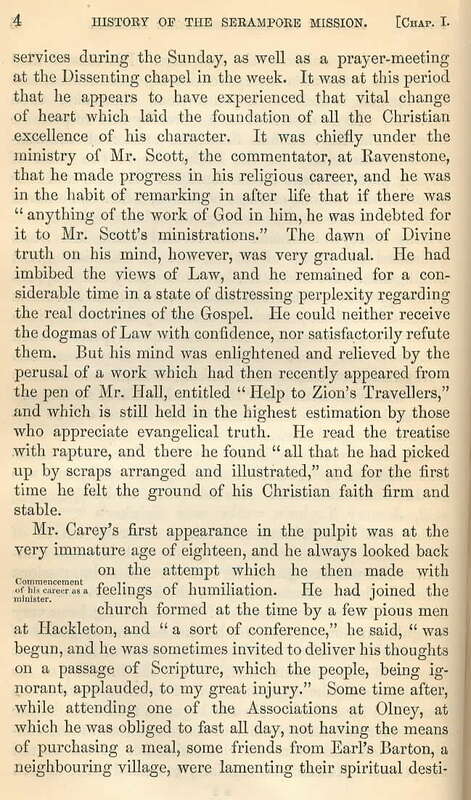 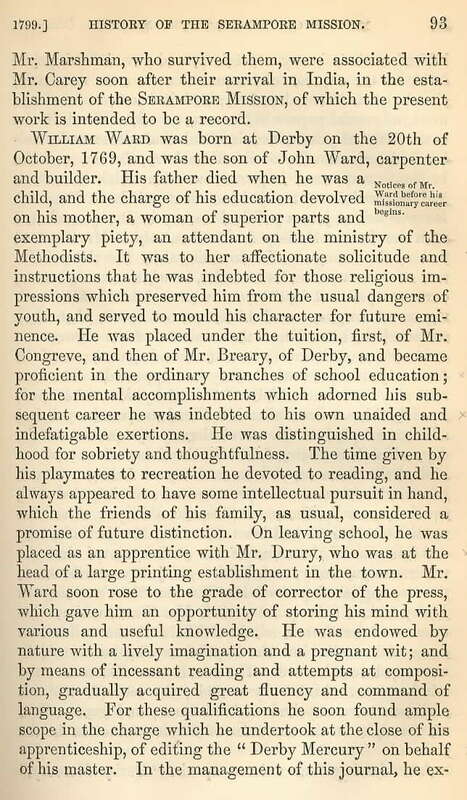 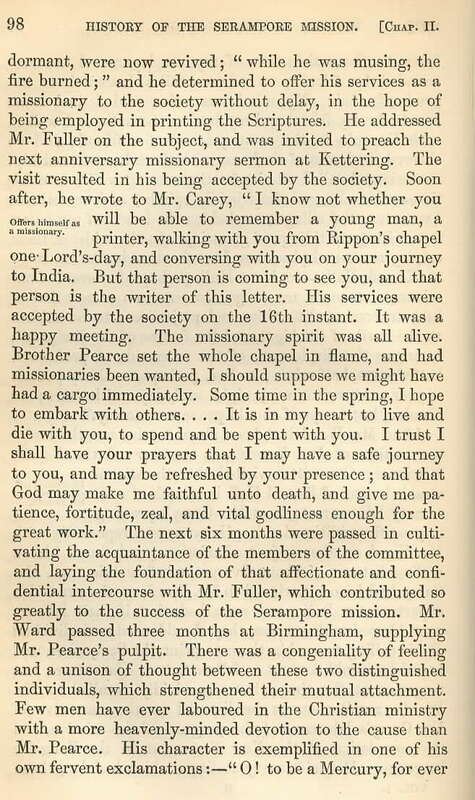 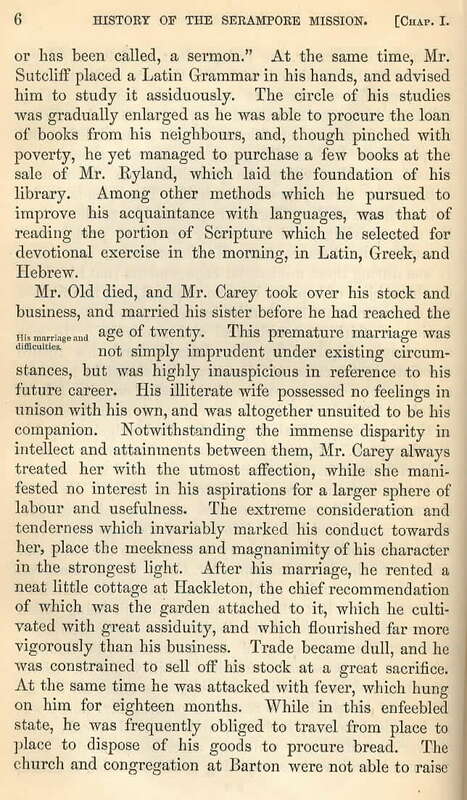 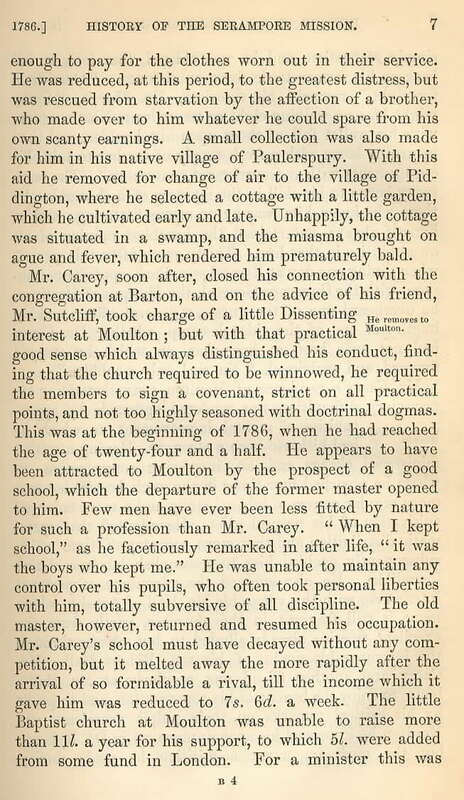 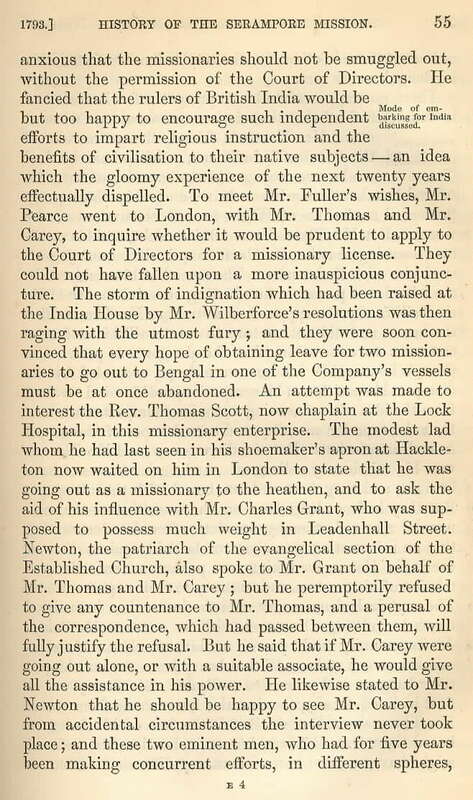 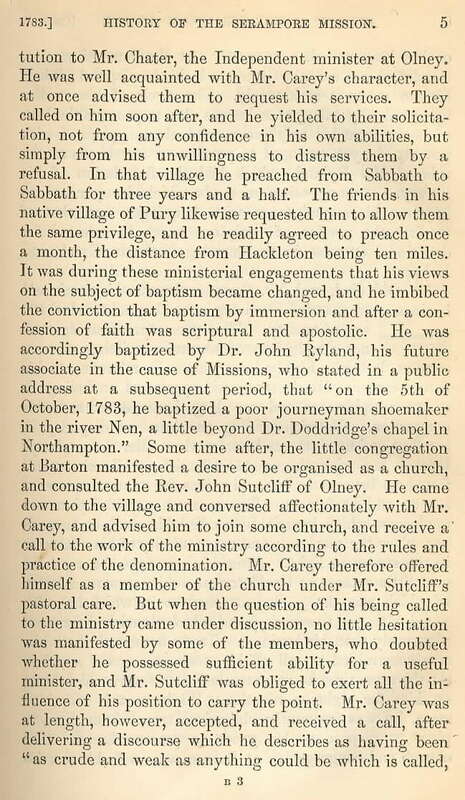 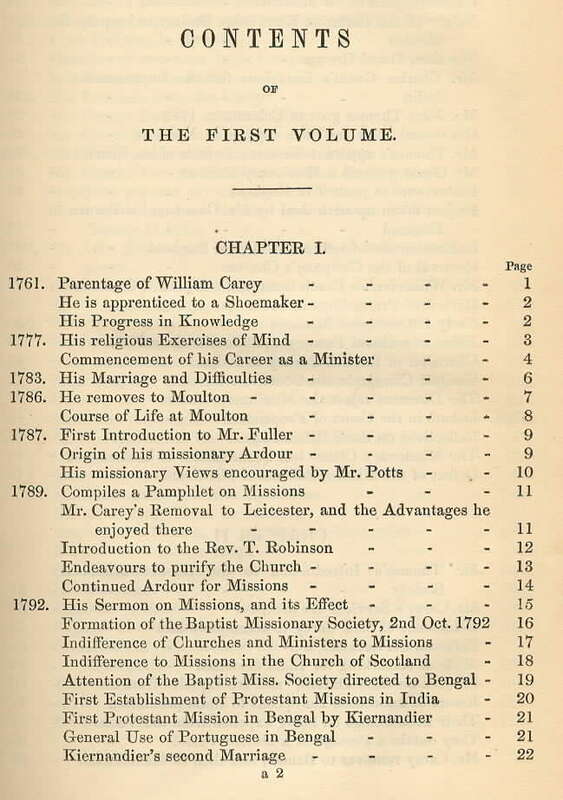 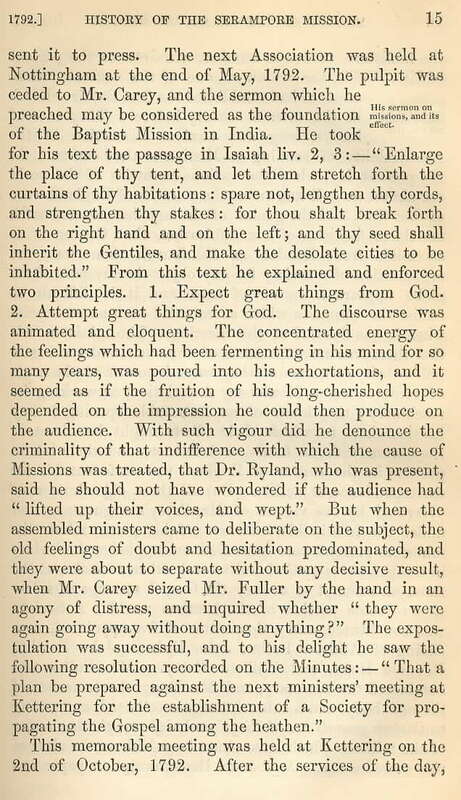 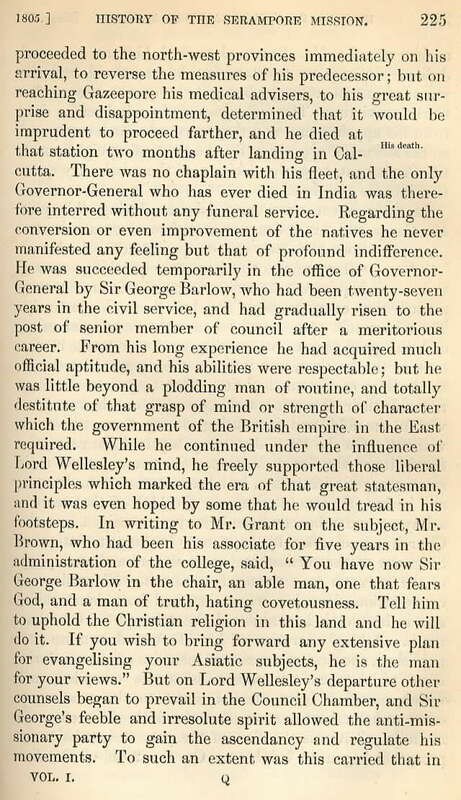 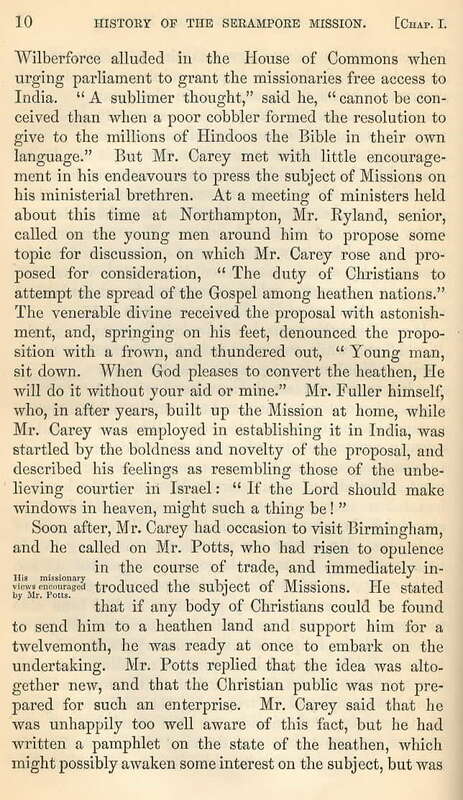 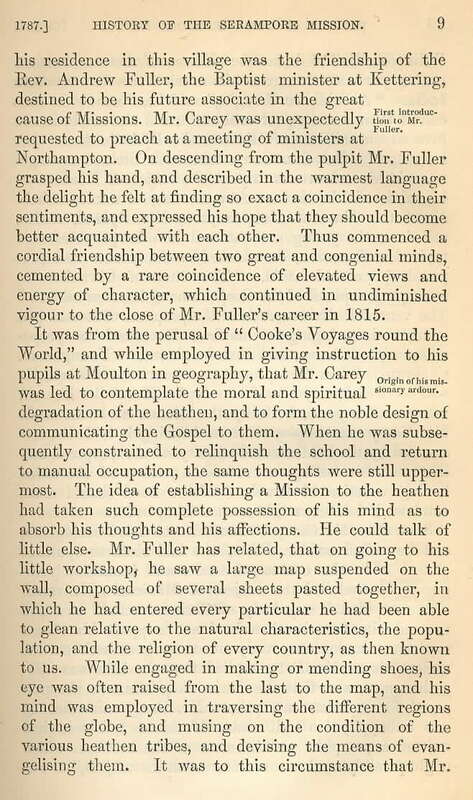 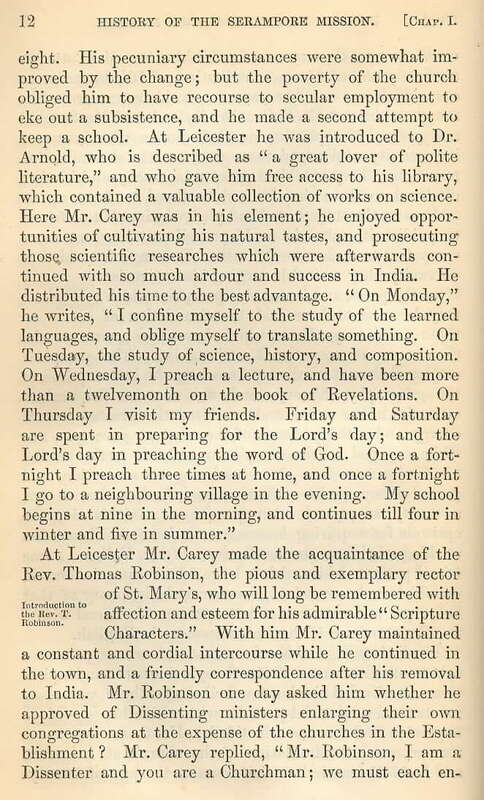 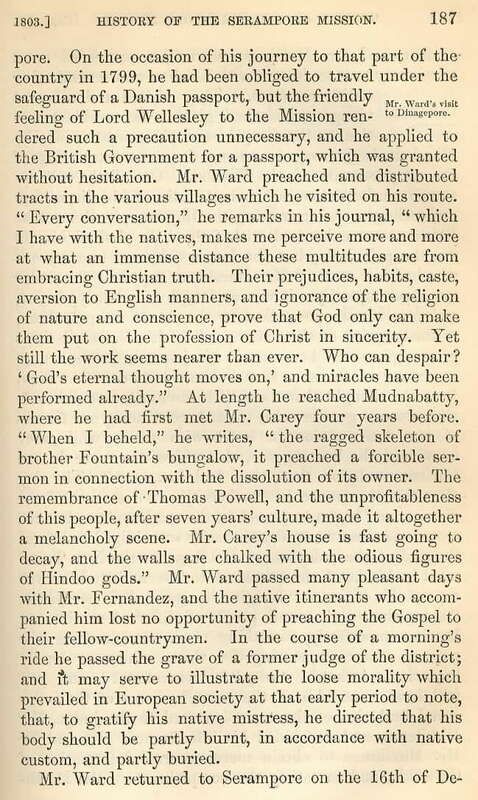 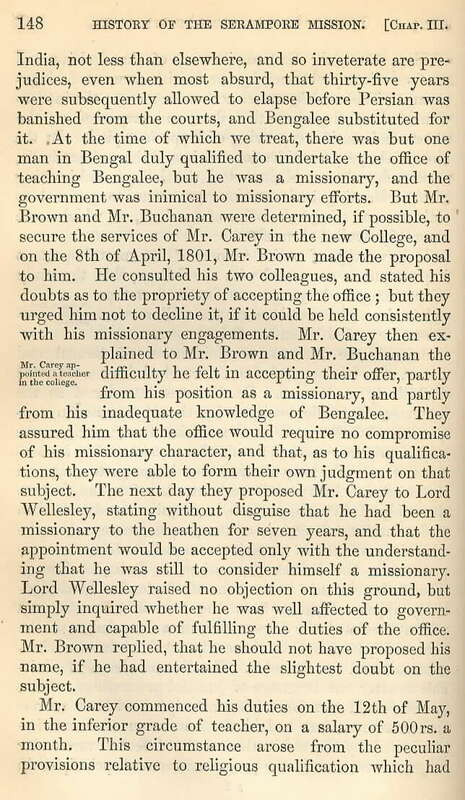 pages located on "William Carey's Legacy." 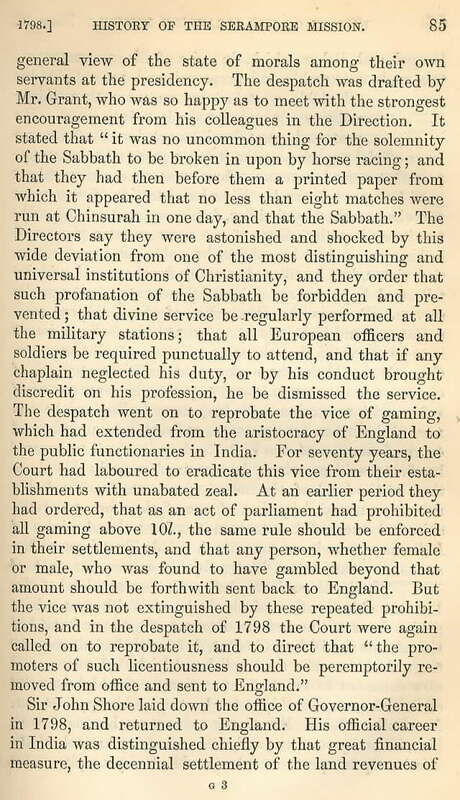 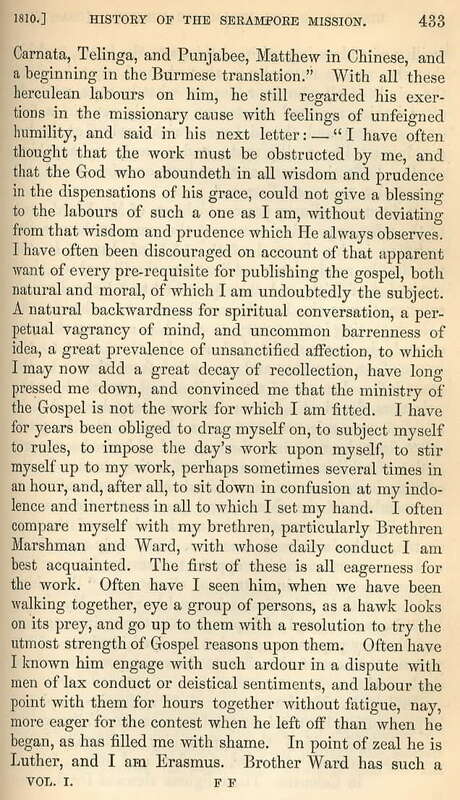 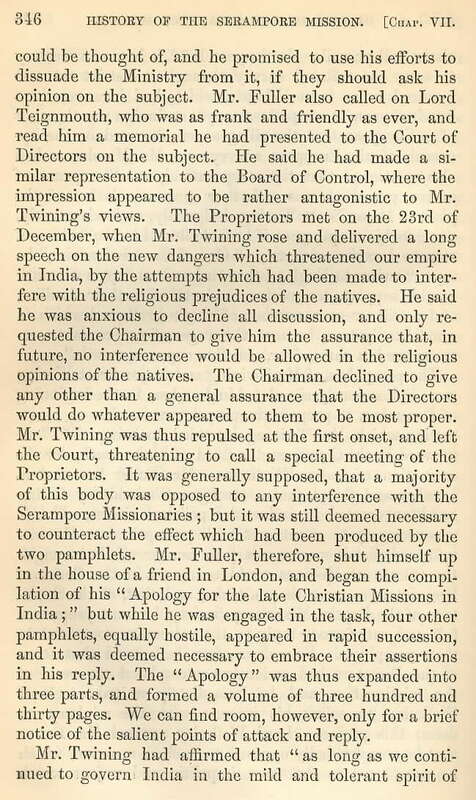 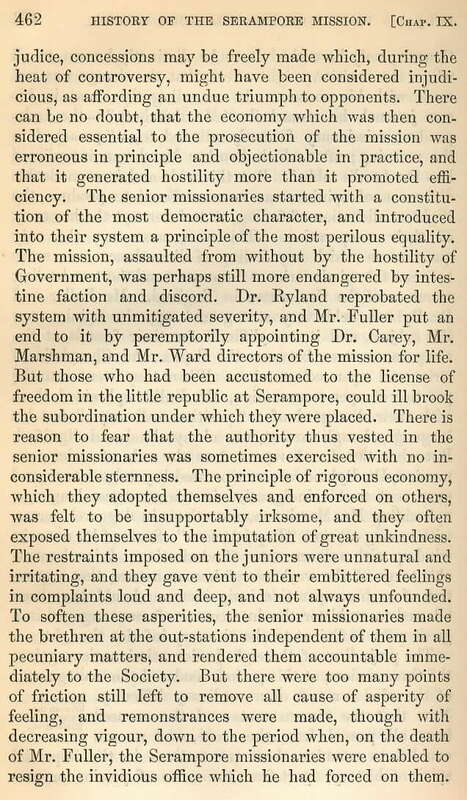 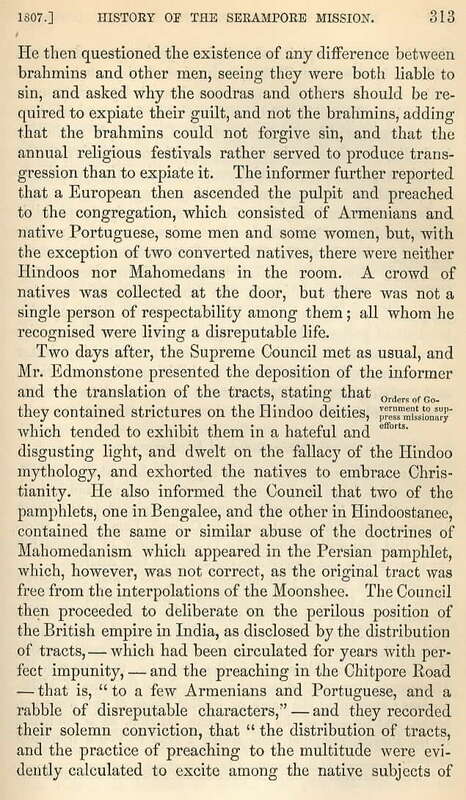 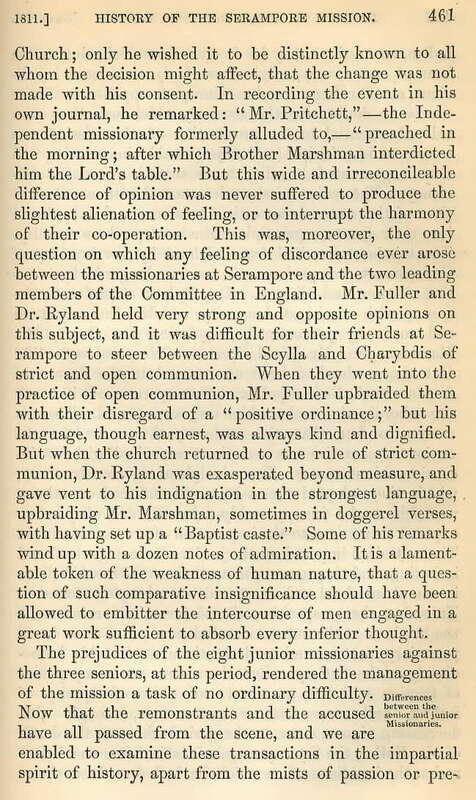 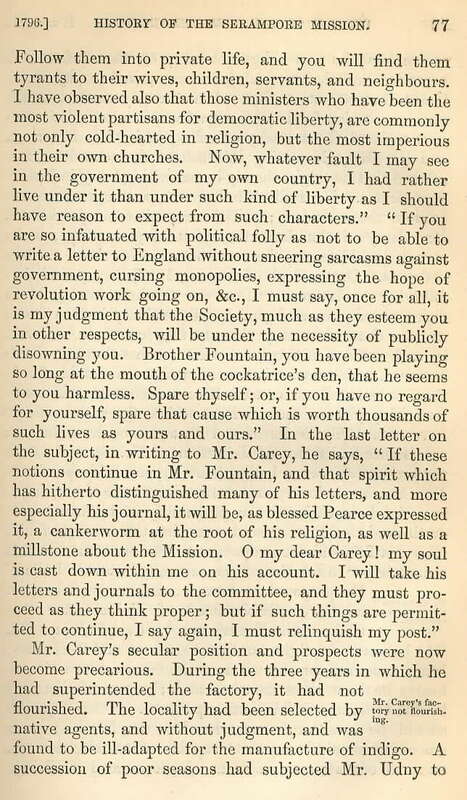 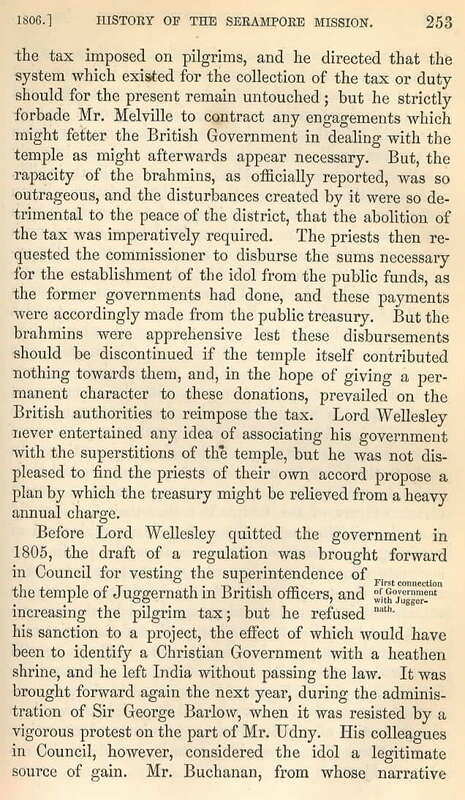 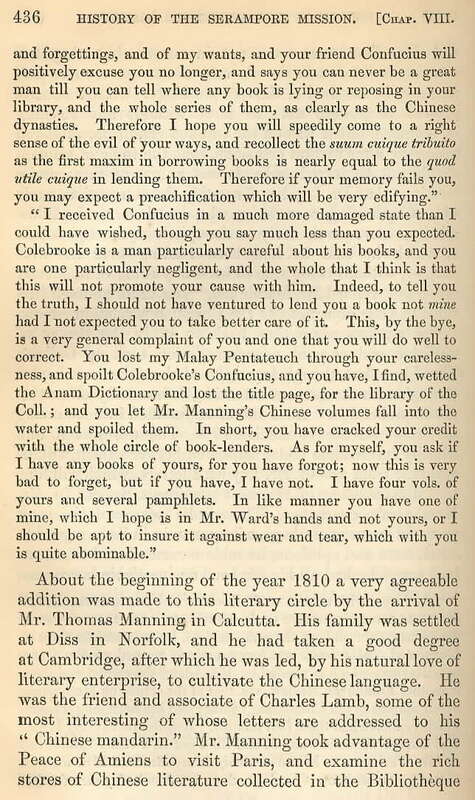 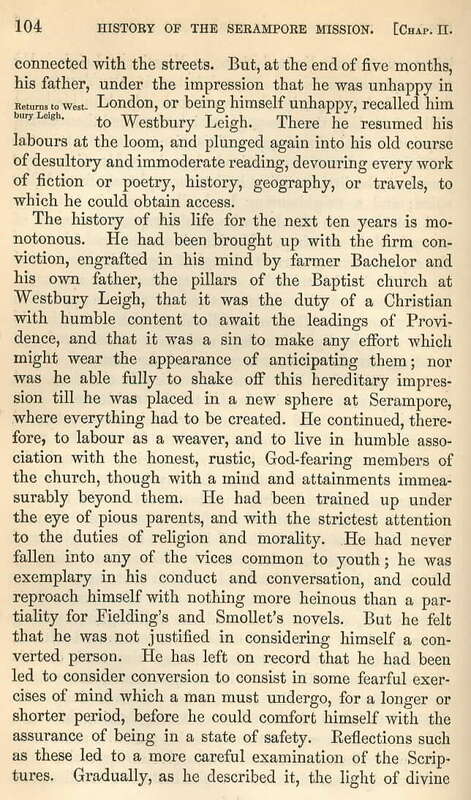 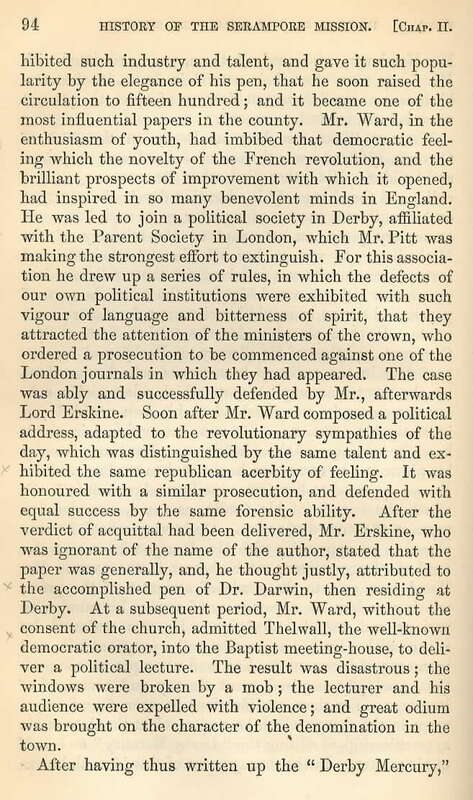 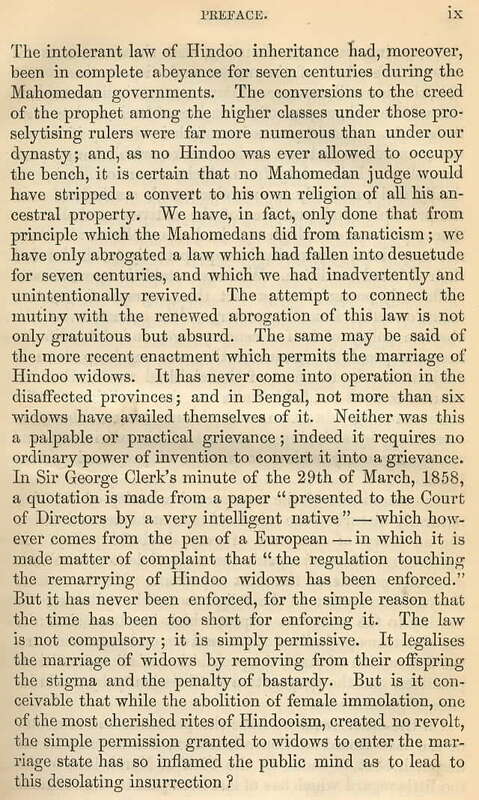 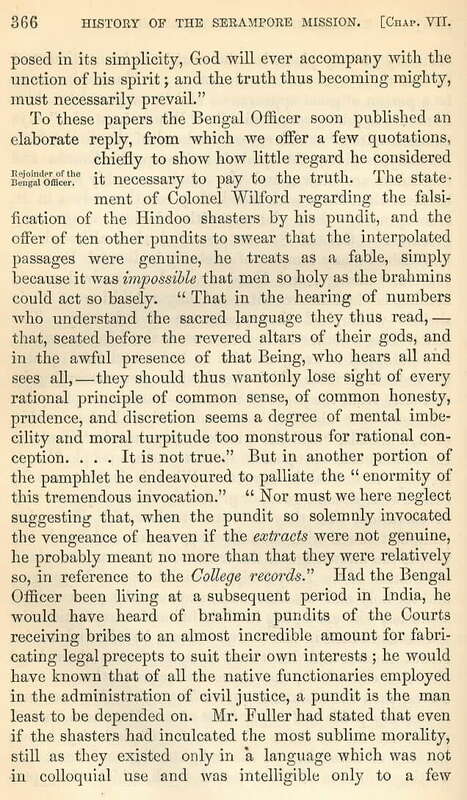 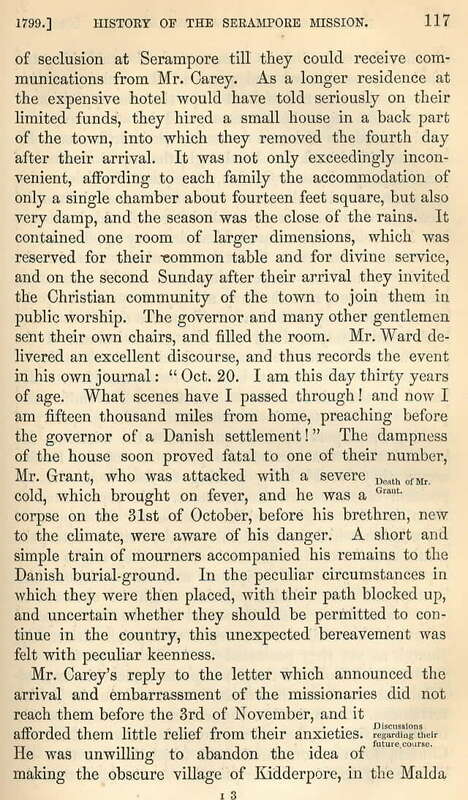 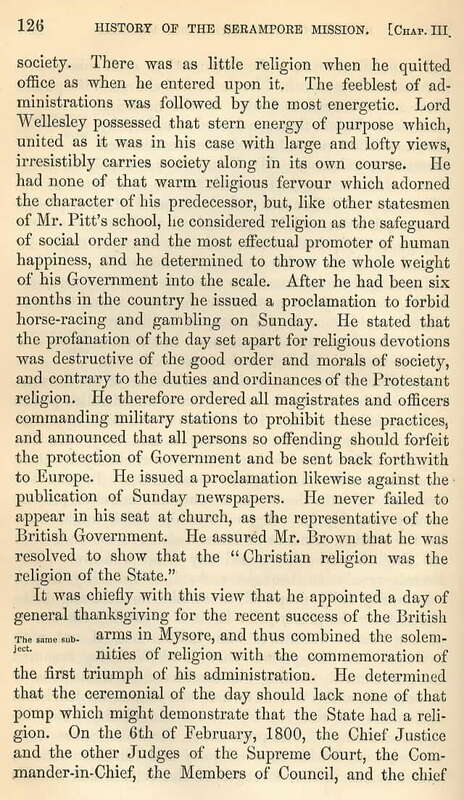 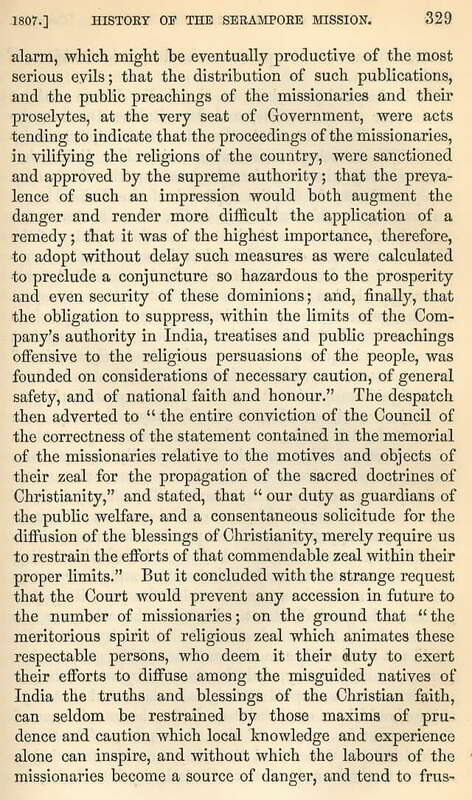 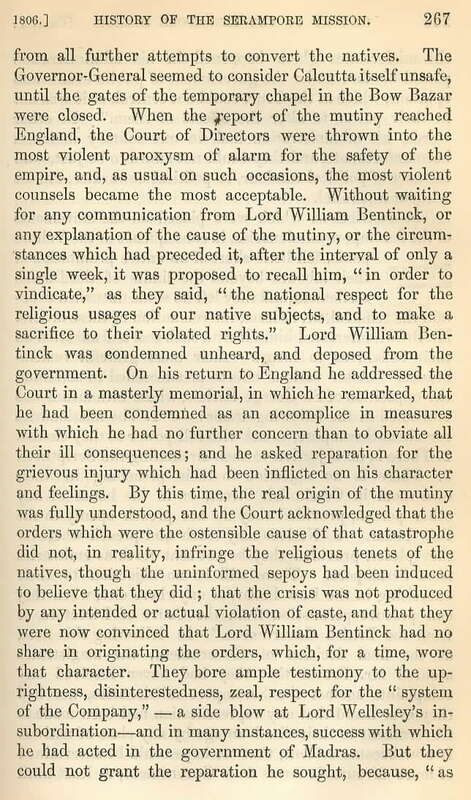 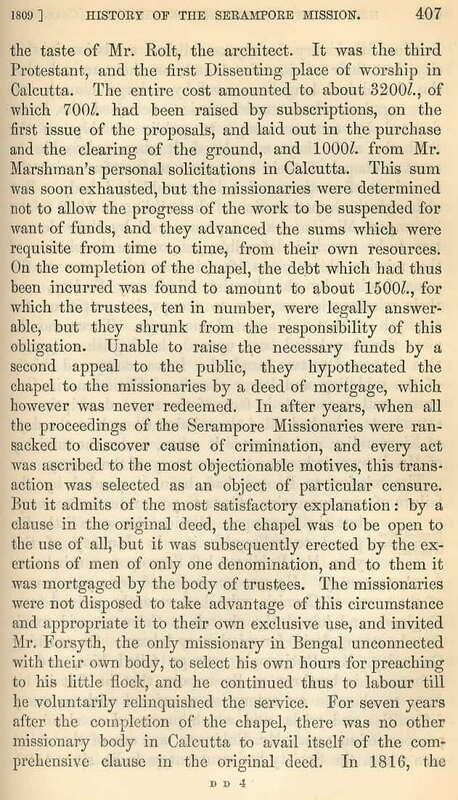 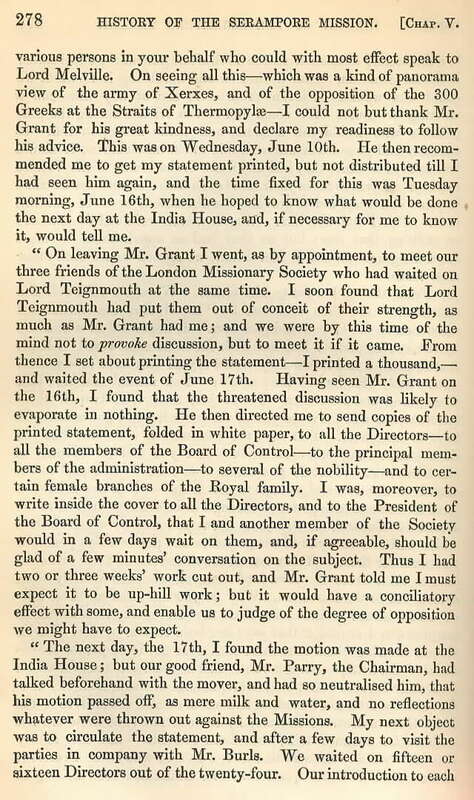 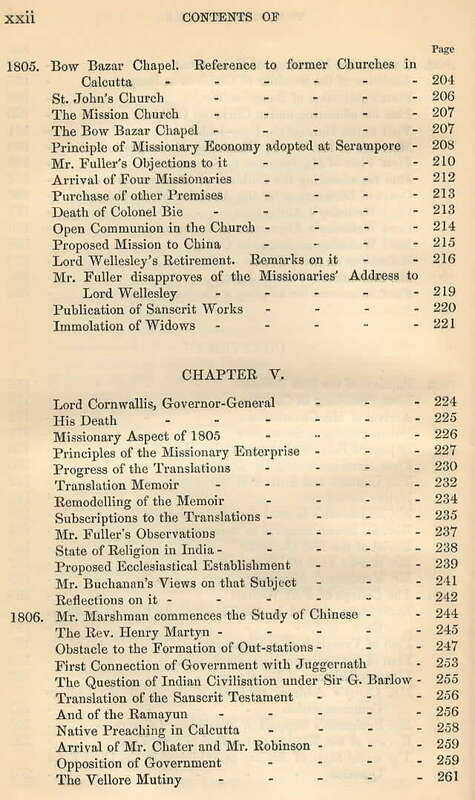 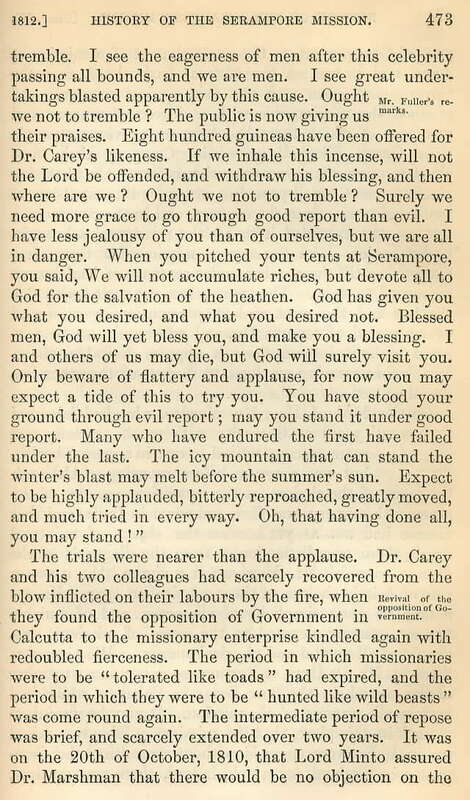 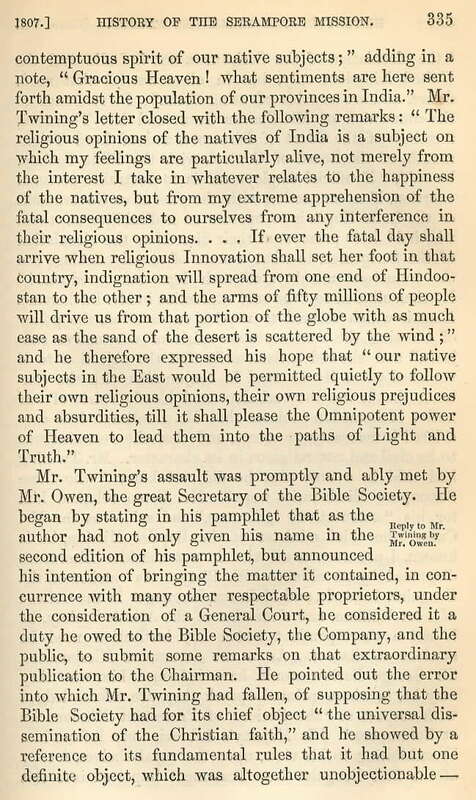 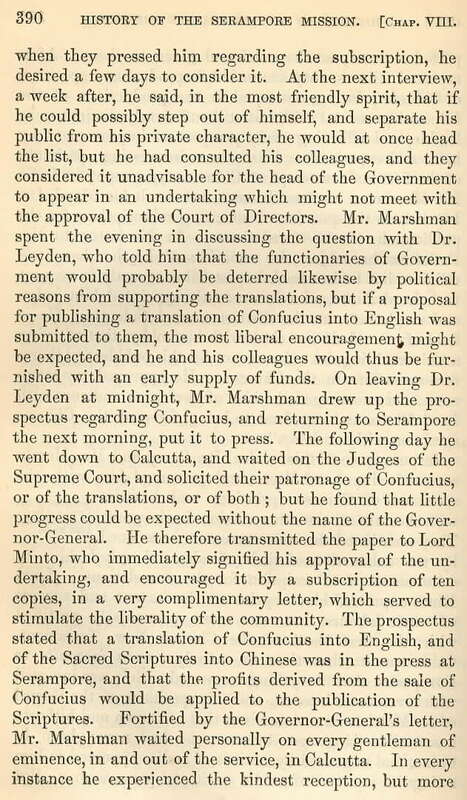 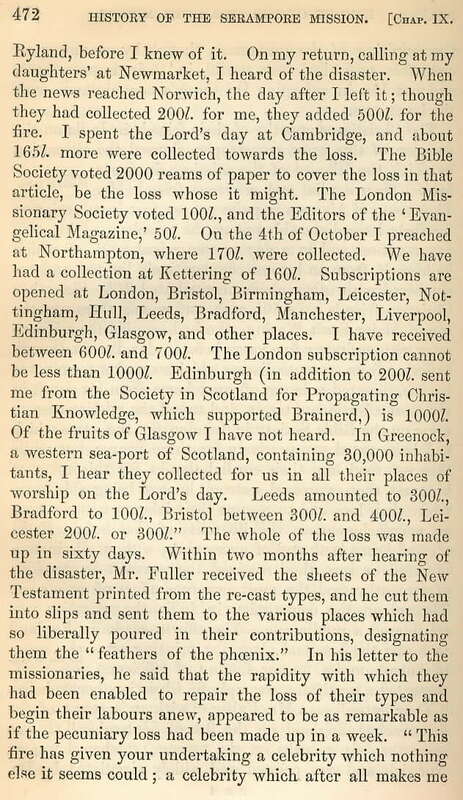 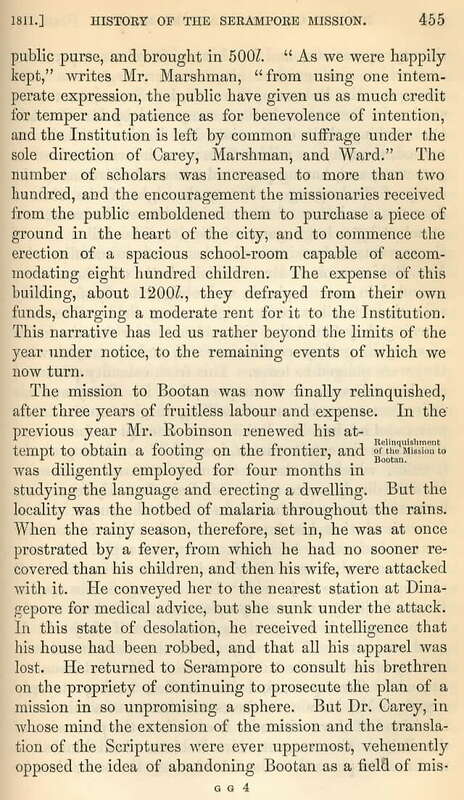 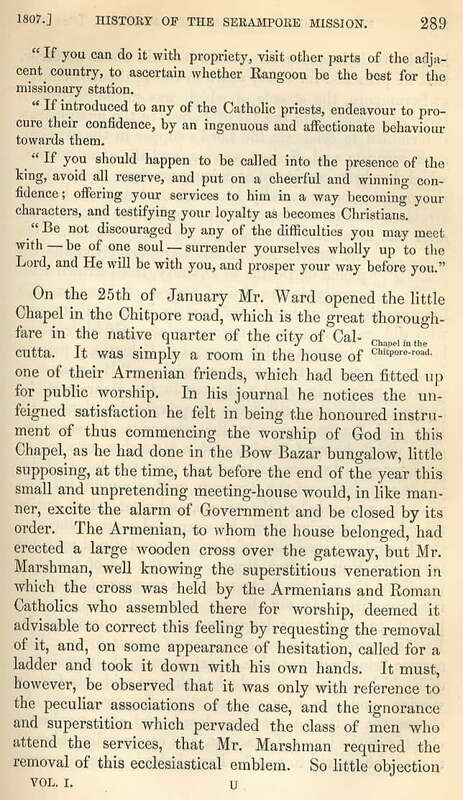 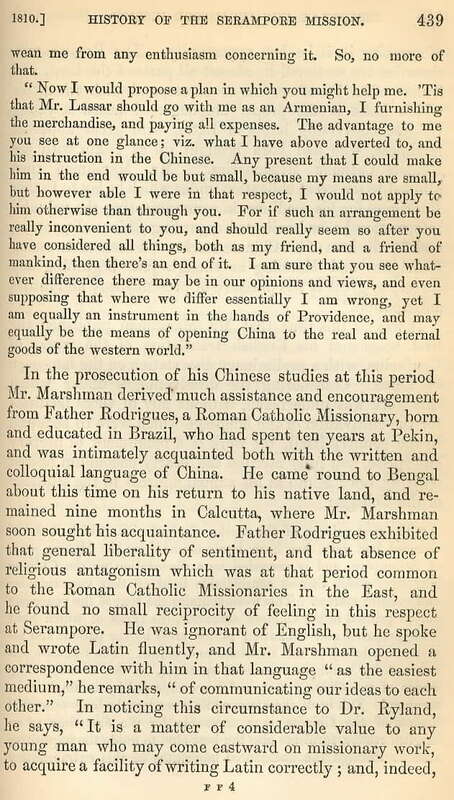 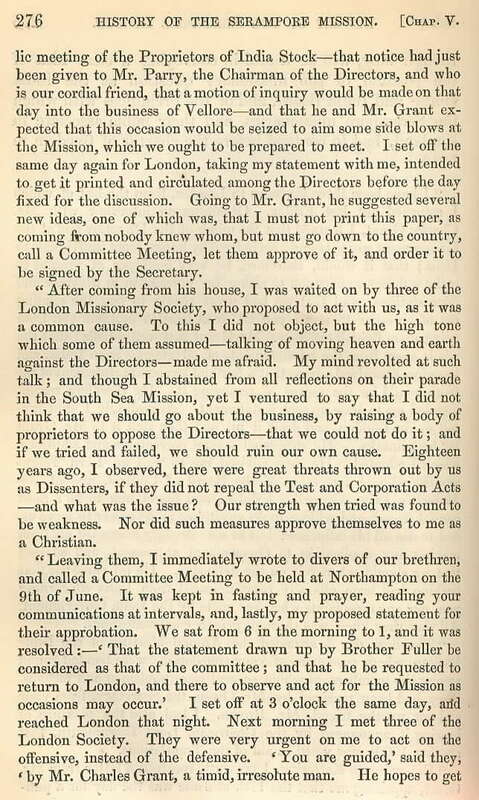 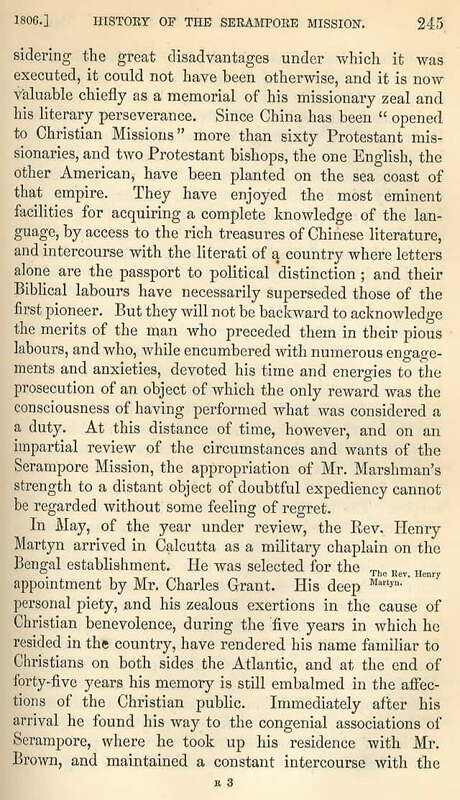 In May, 1859, The Oriental Baptist, vol. 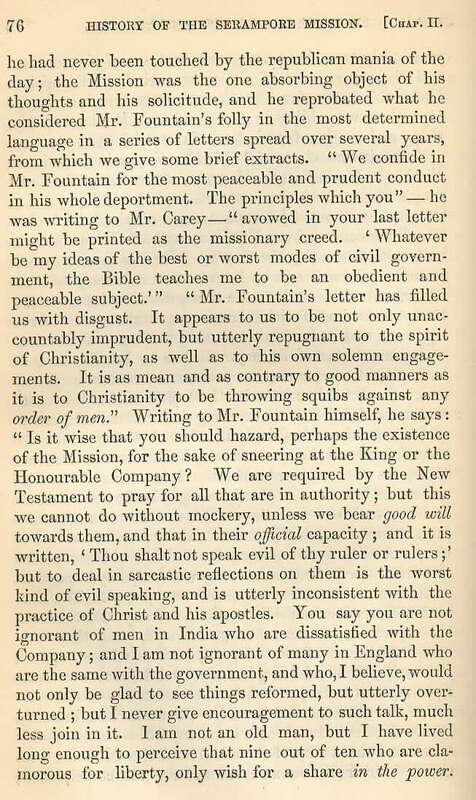 XIII, no. 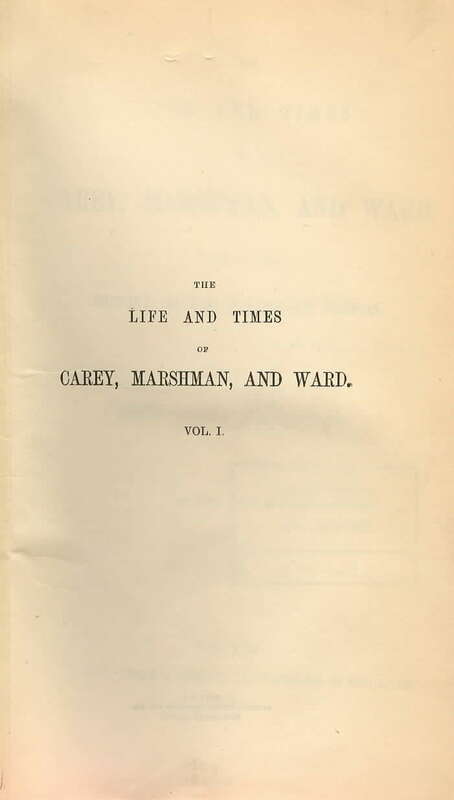 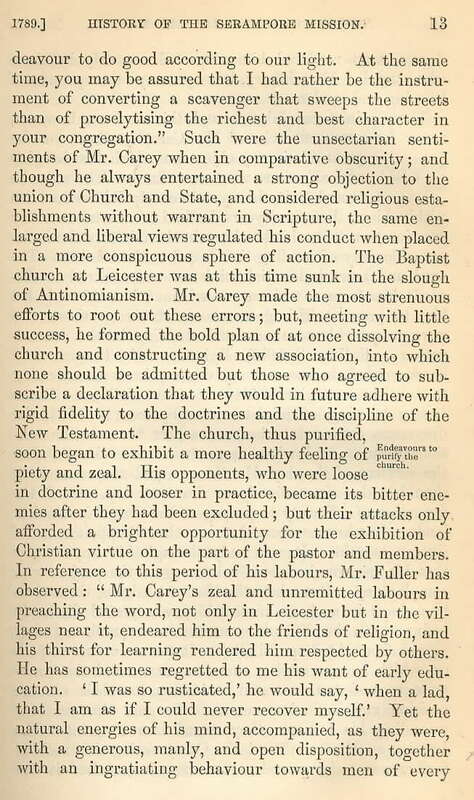 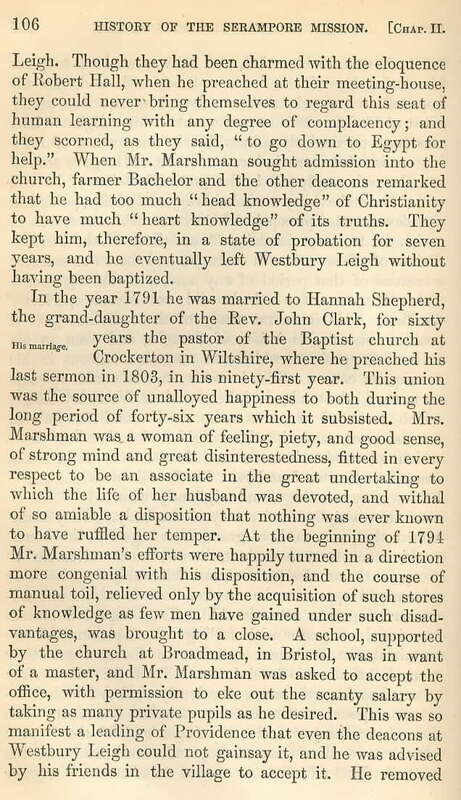 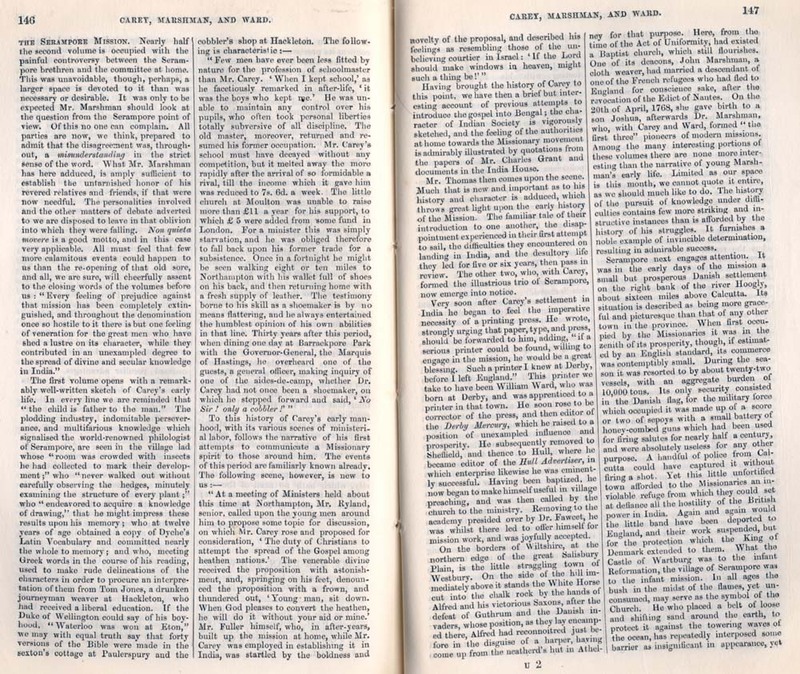 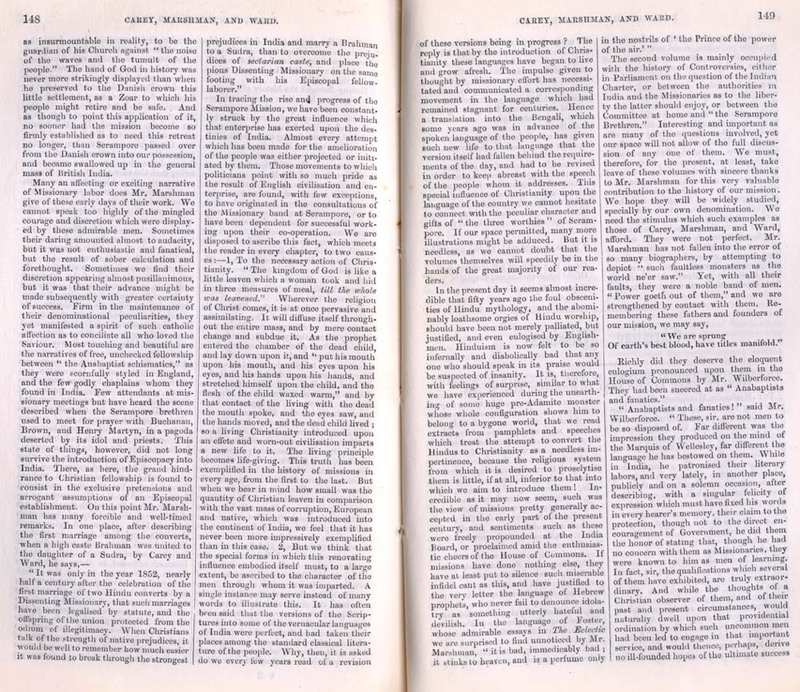 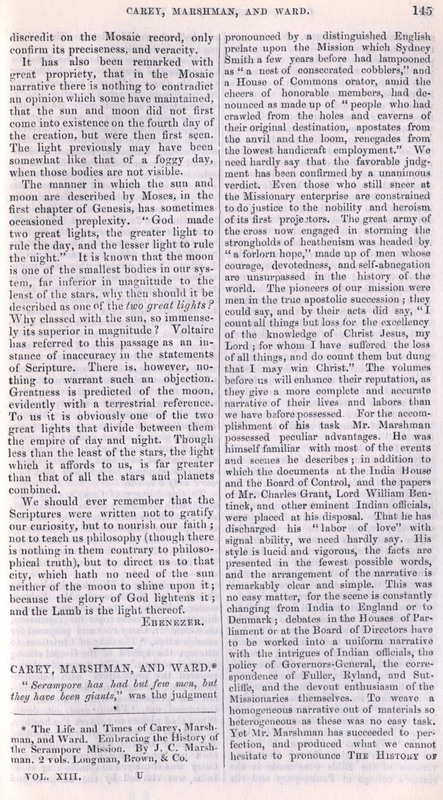 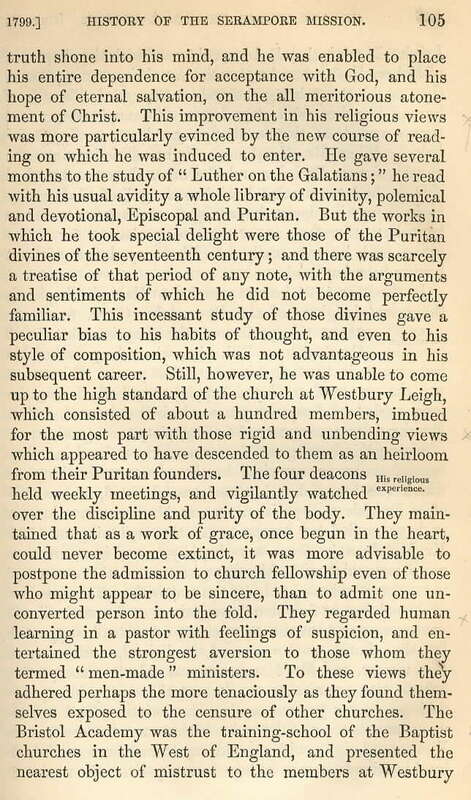 149, reprinted a review from the Baptist Magazine of John Clark Marshman's, The Life and Times of Carey, Marshman, and Ward. 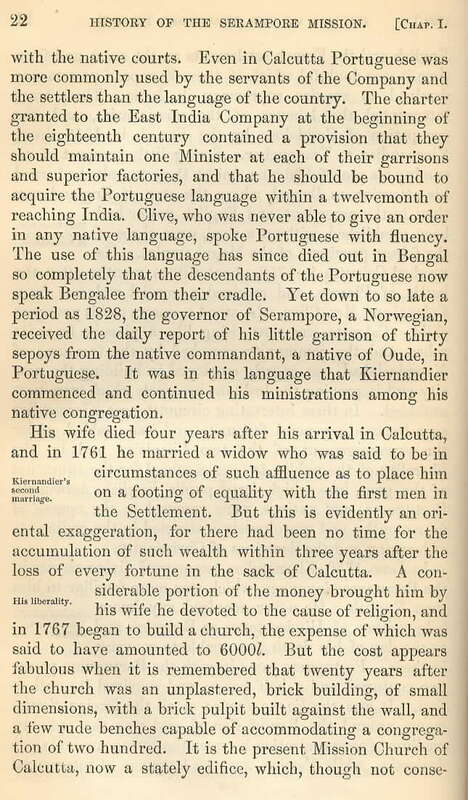 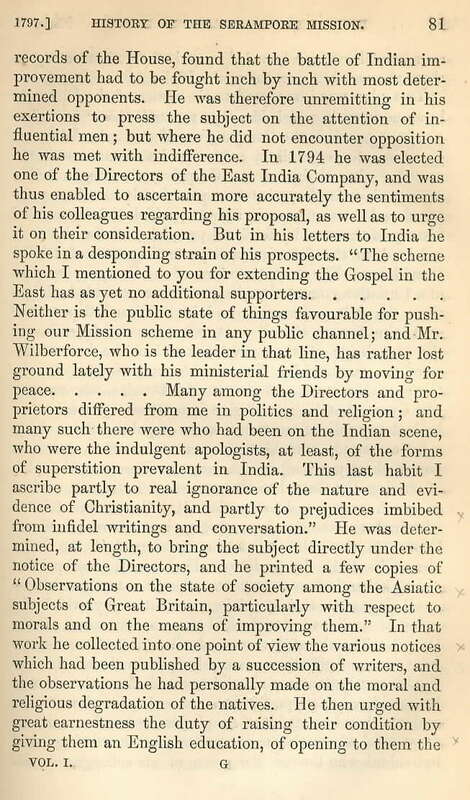 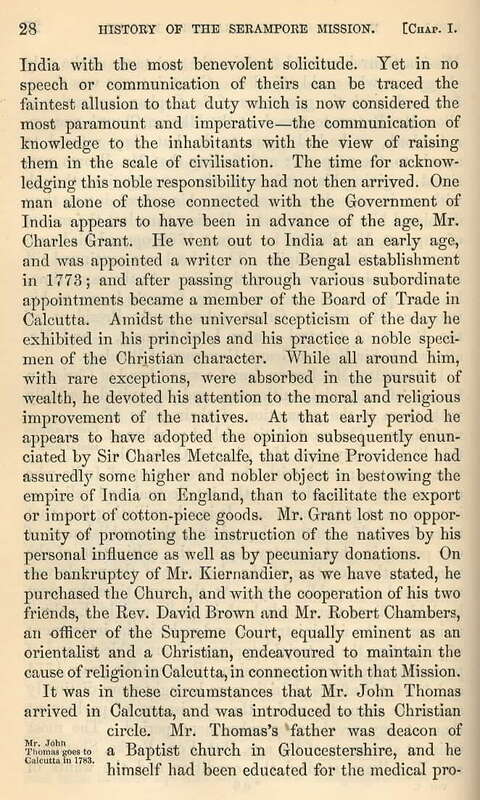 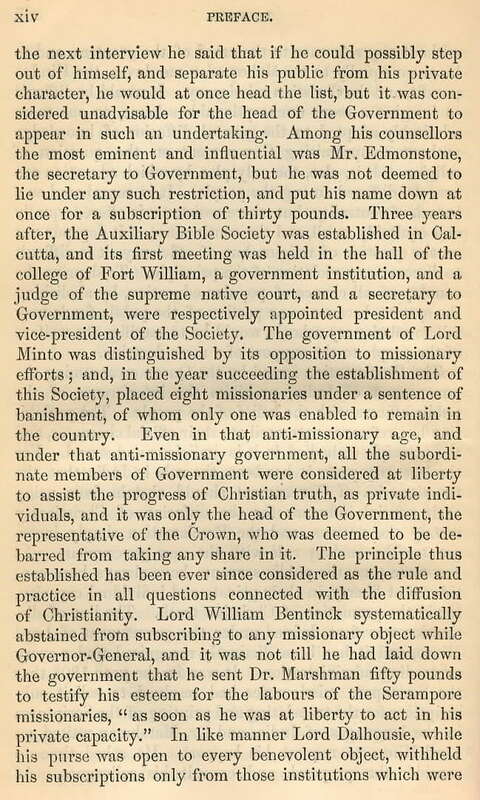 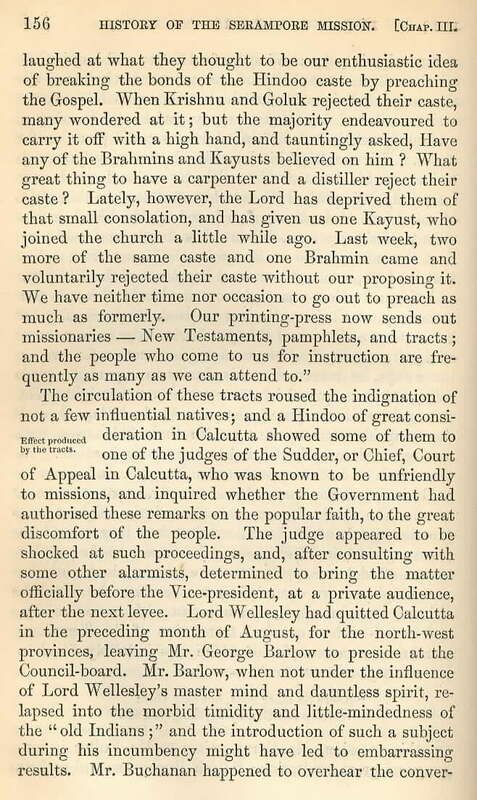 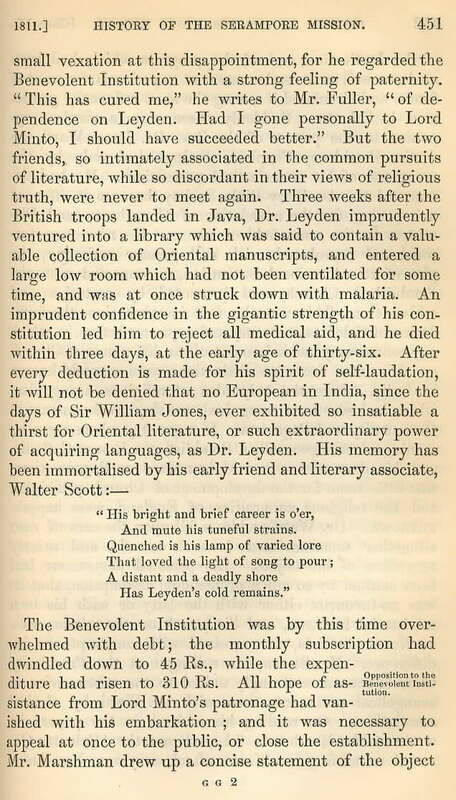 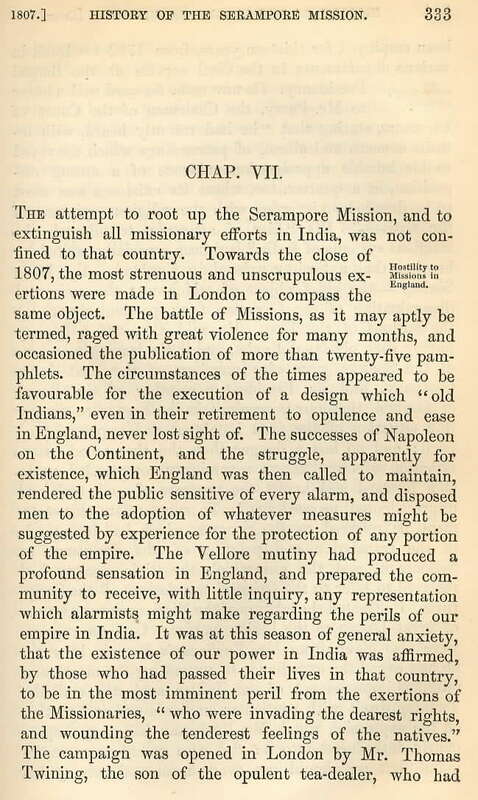 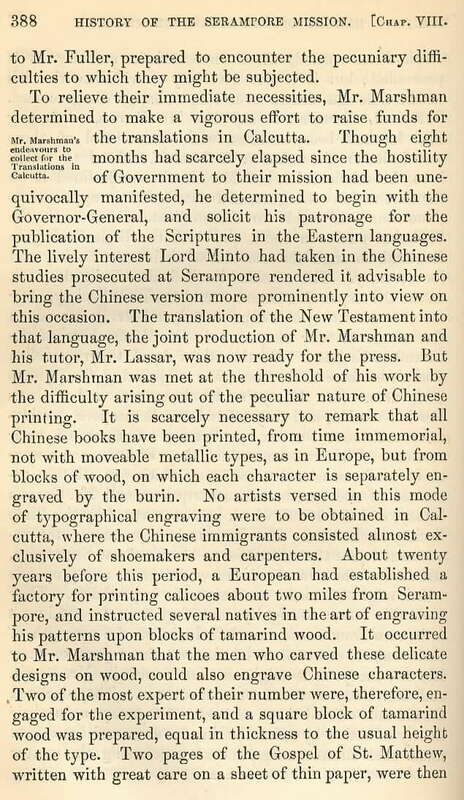 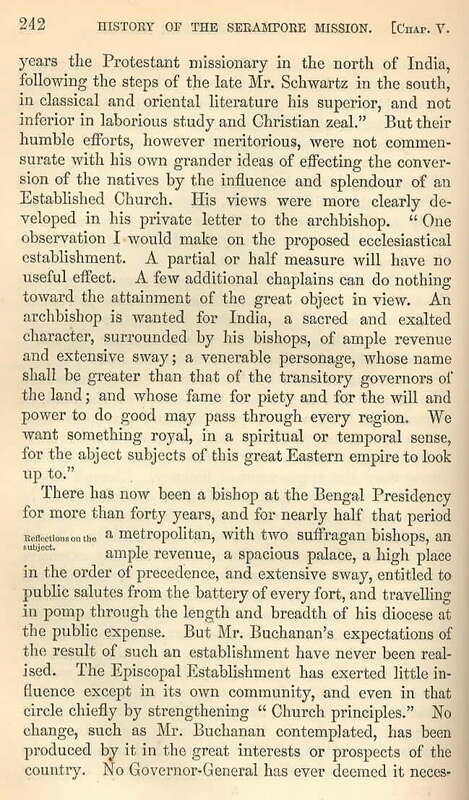 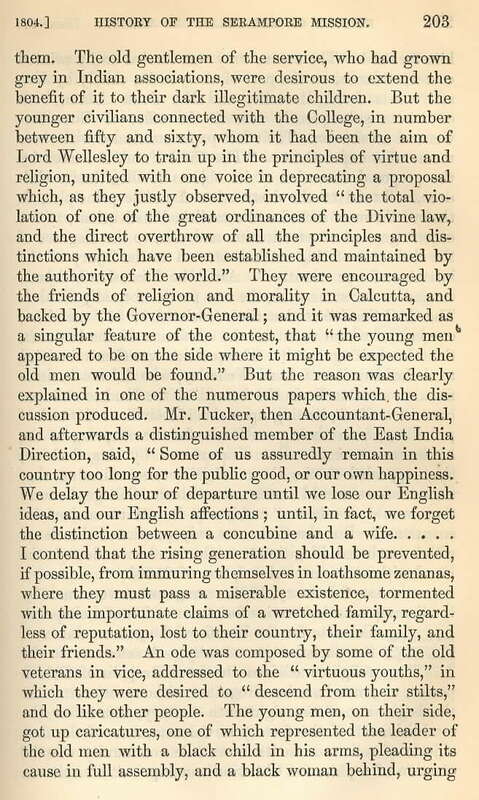 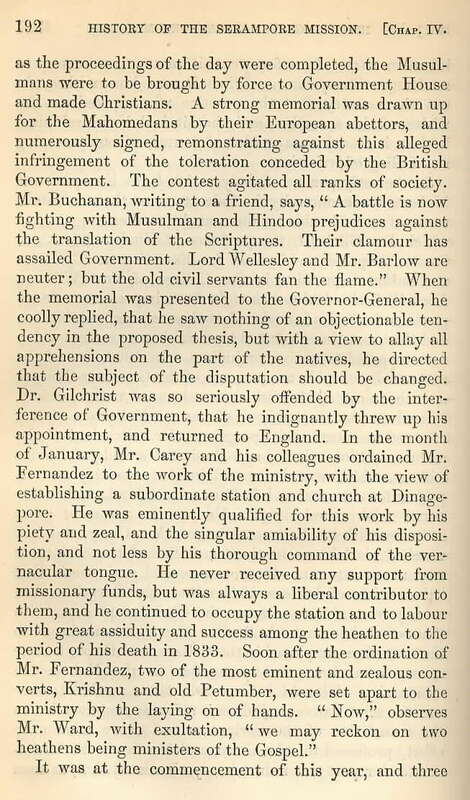 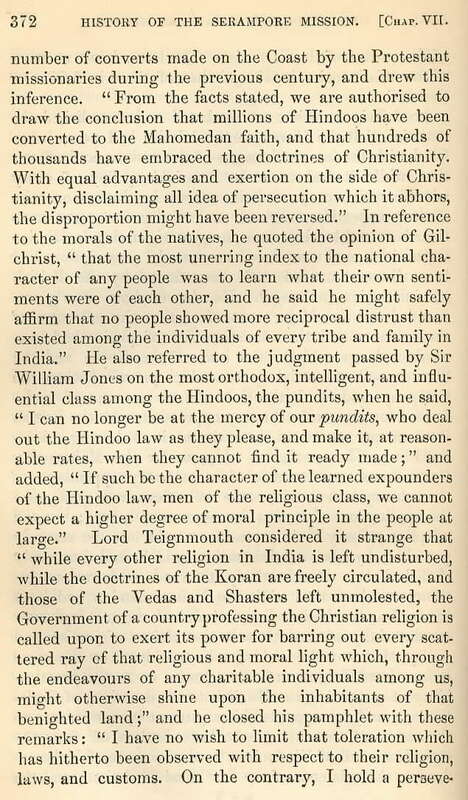 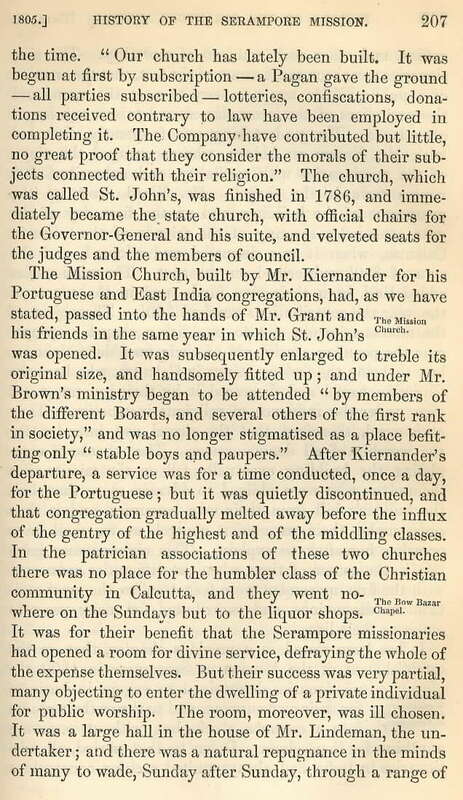 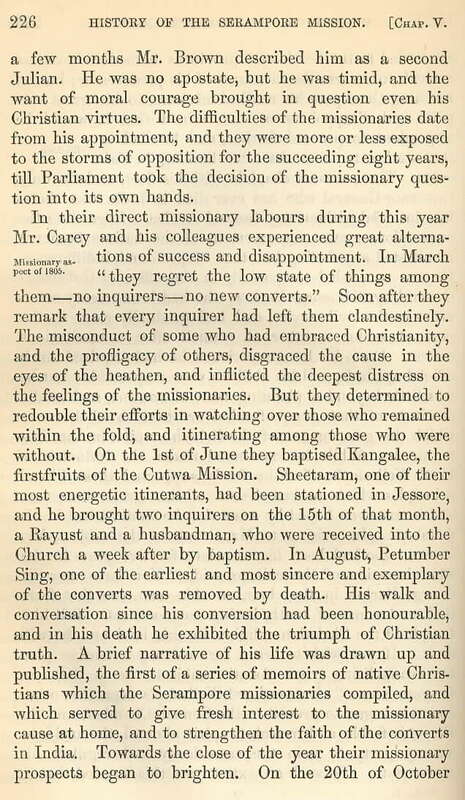 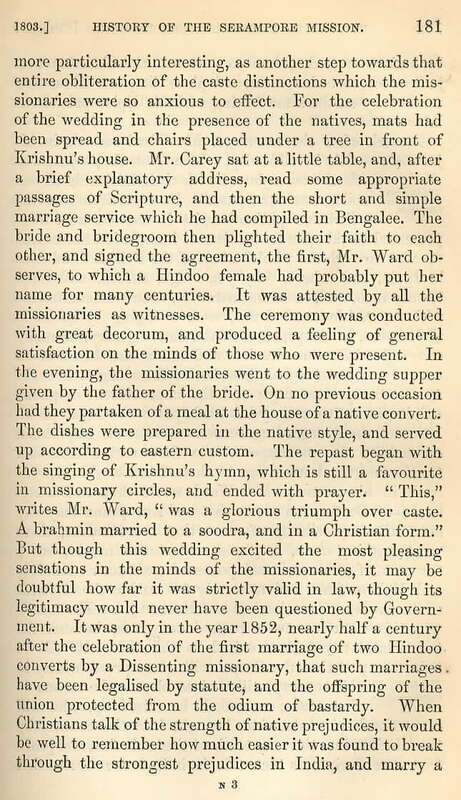 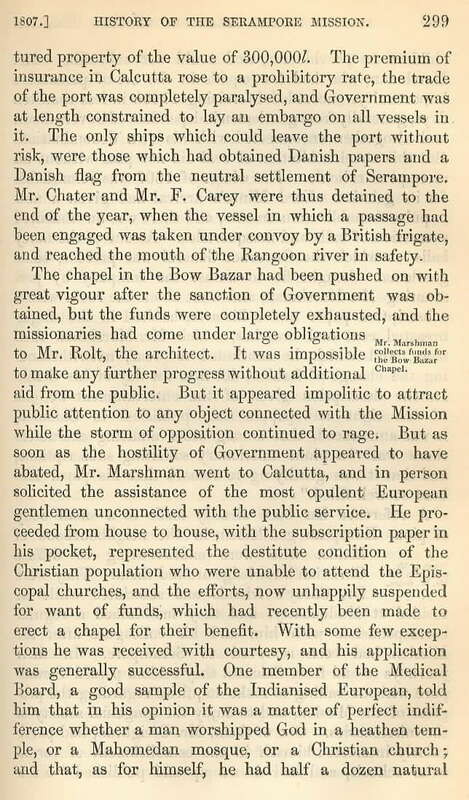 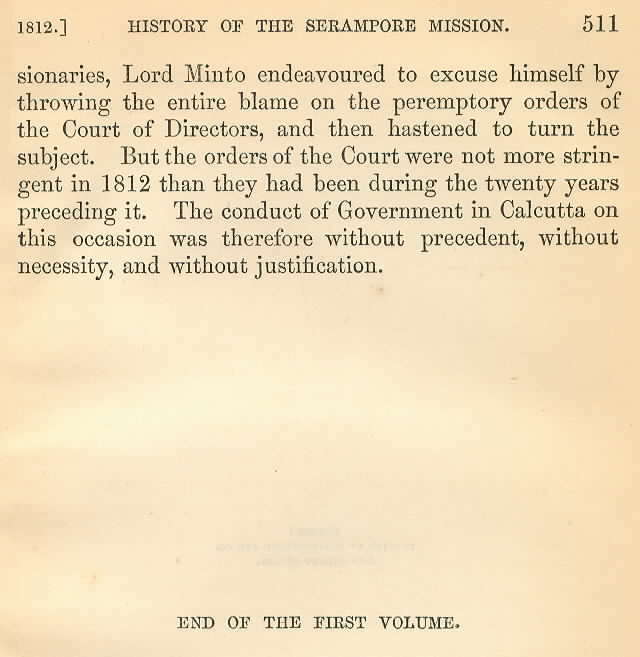 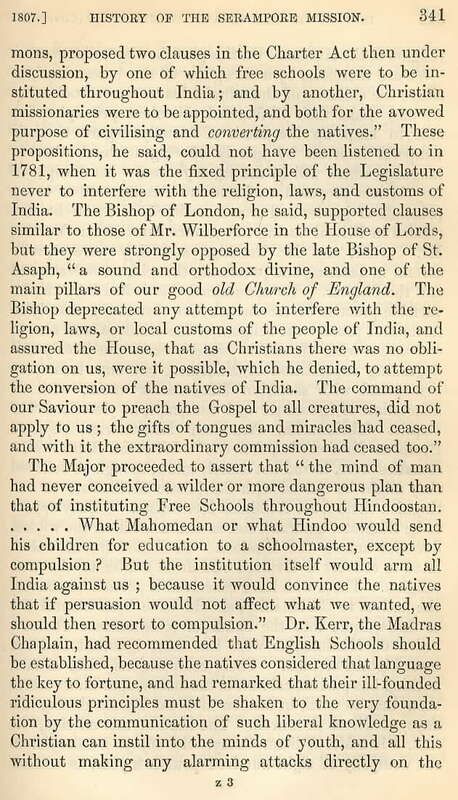 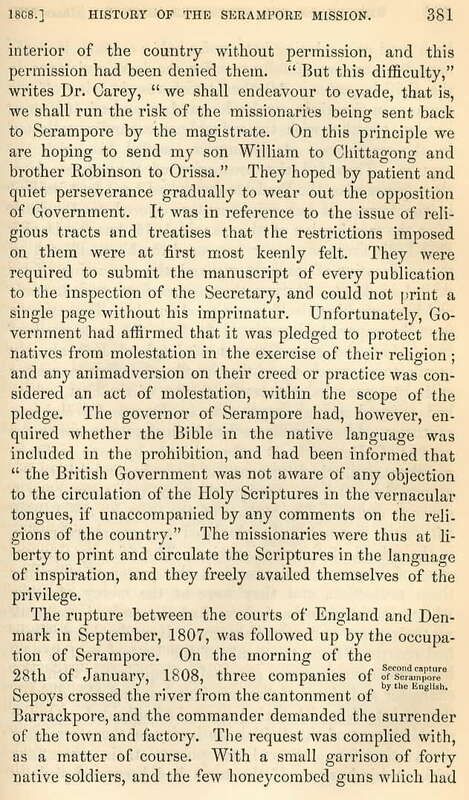 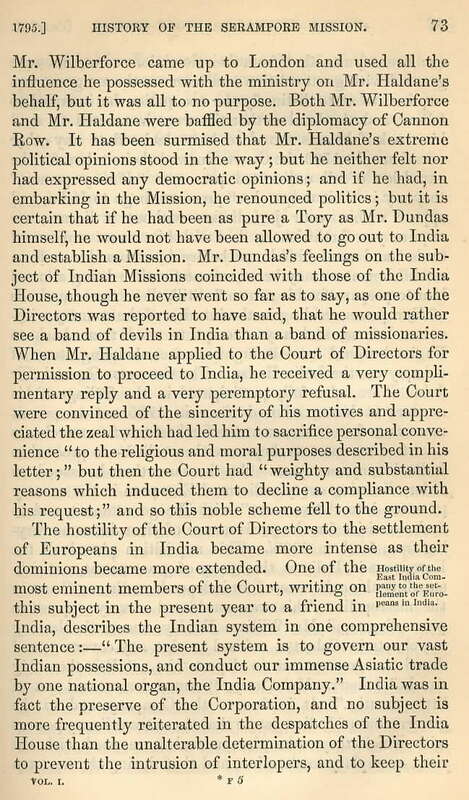 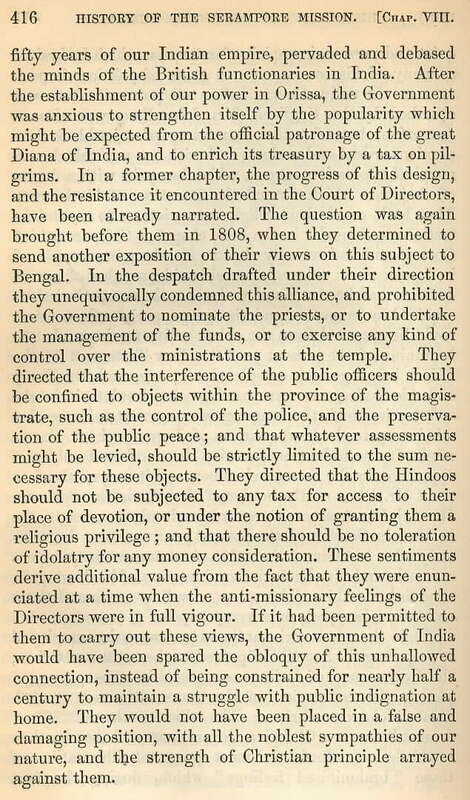 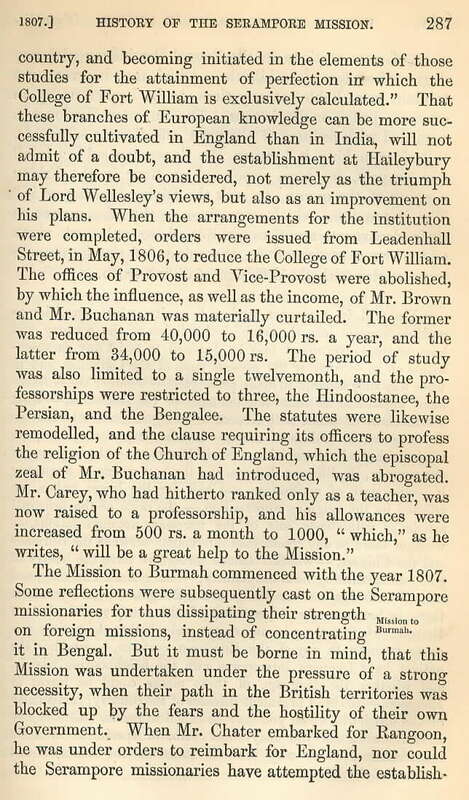 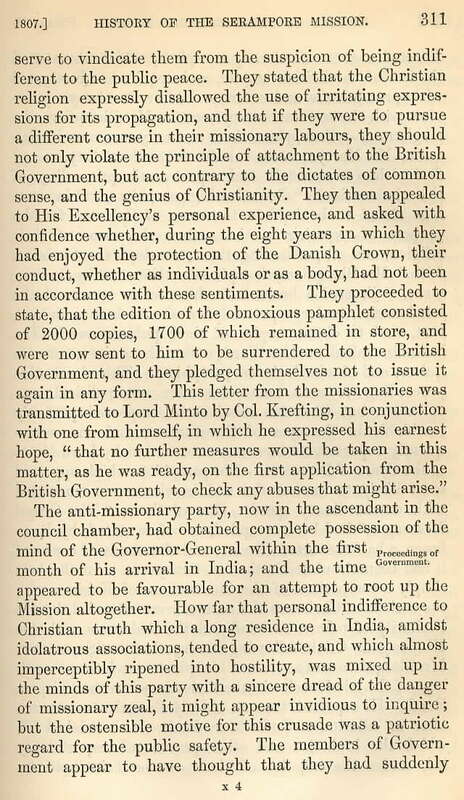 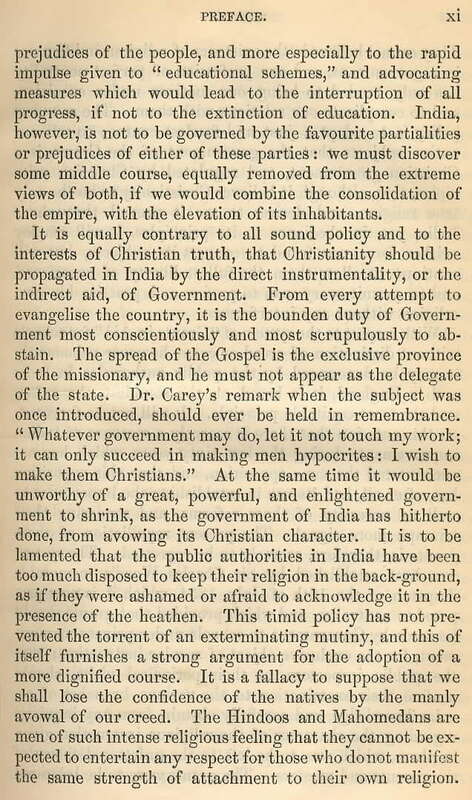 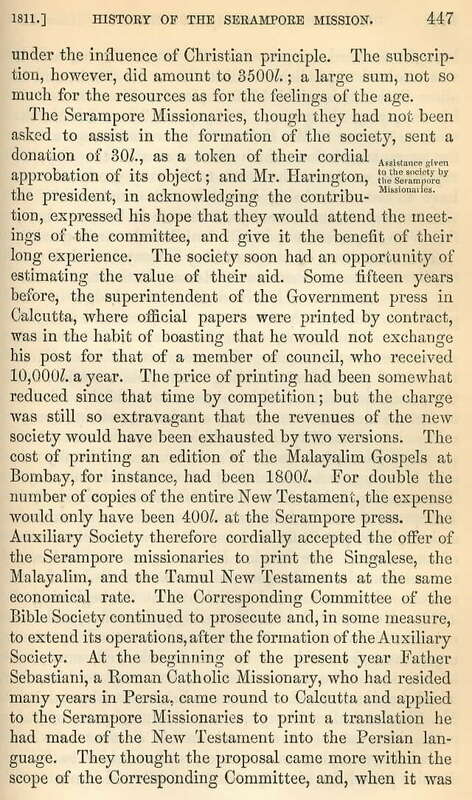 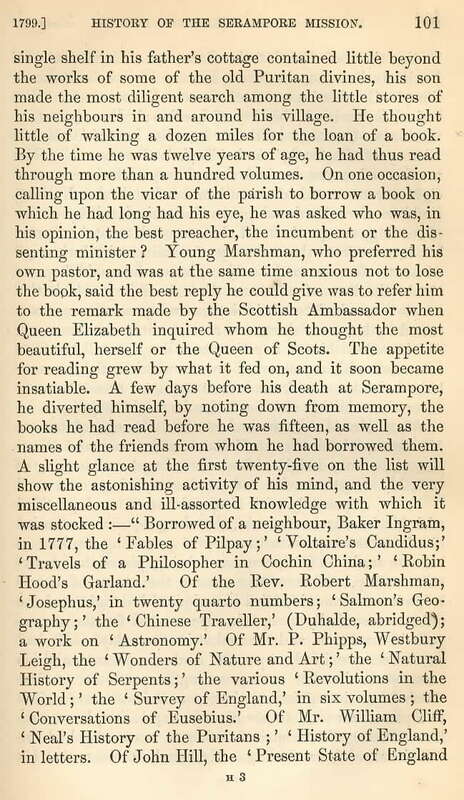 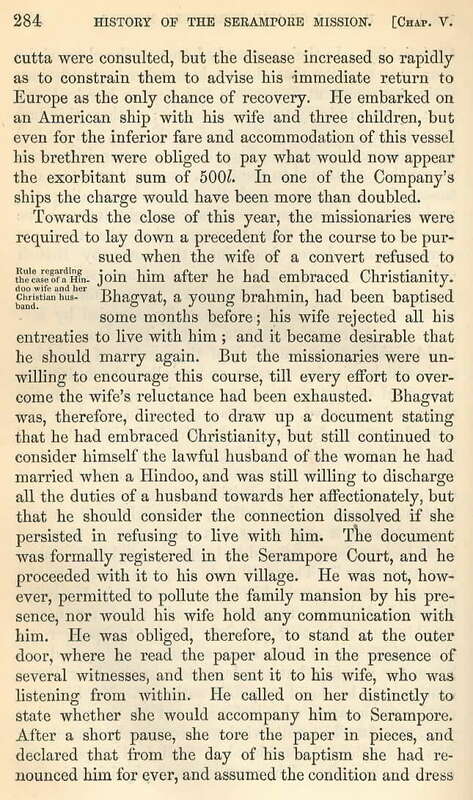 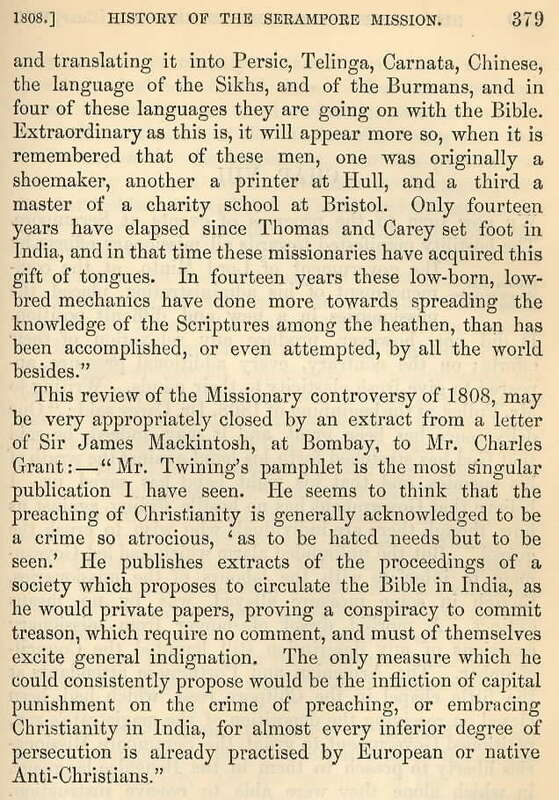 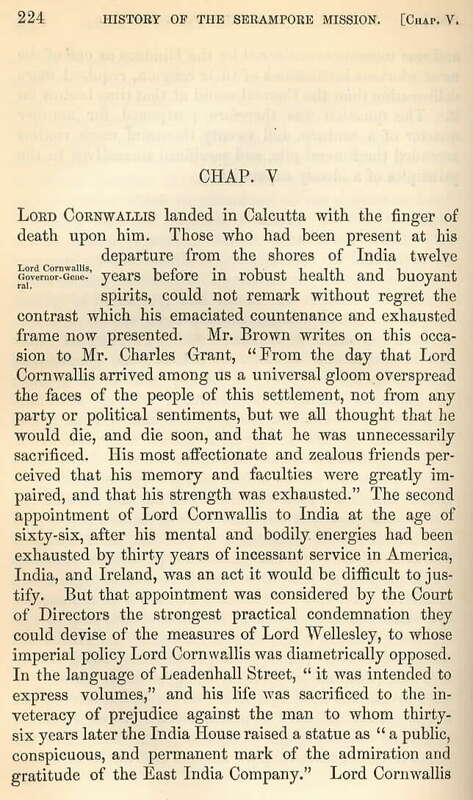 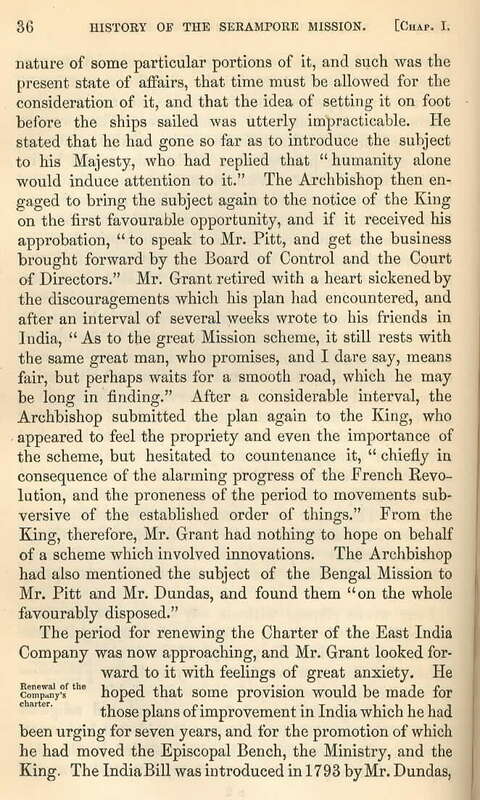 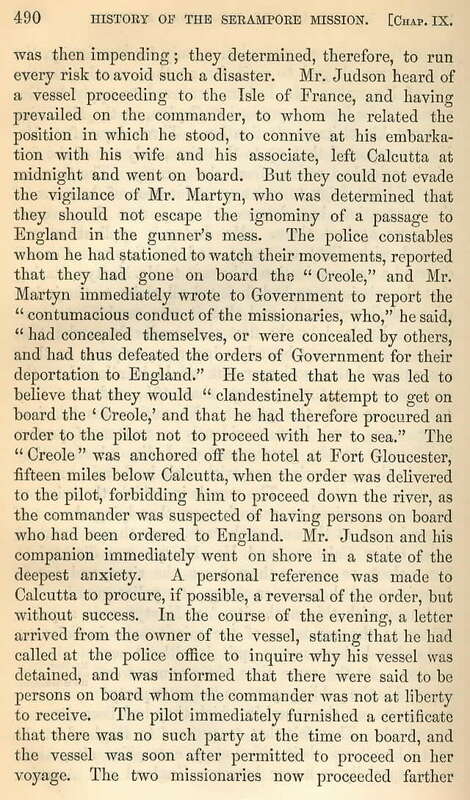 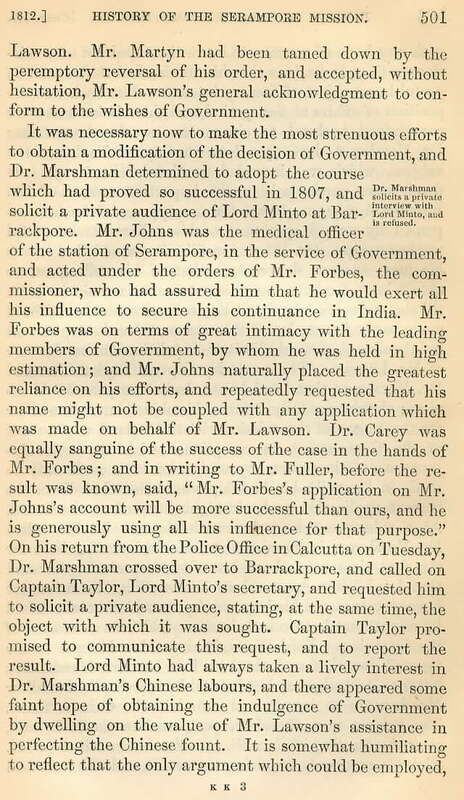 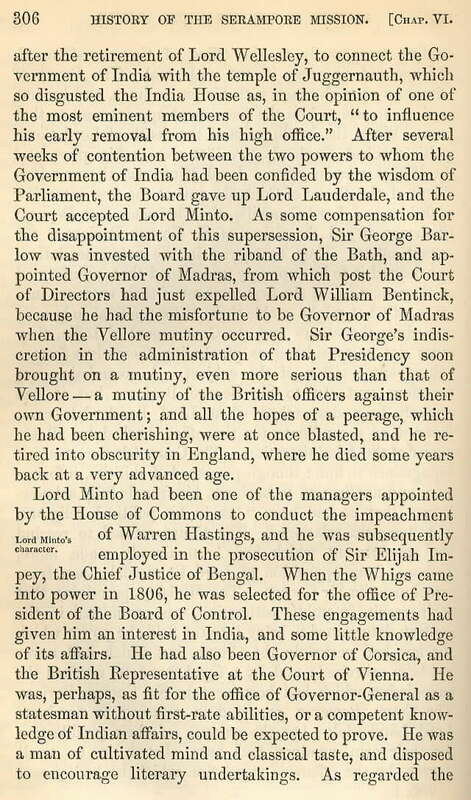 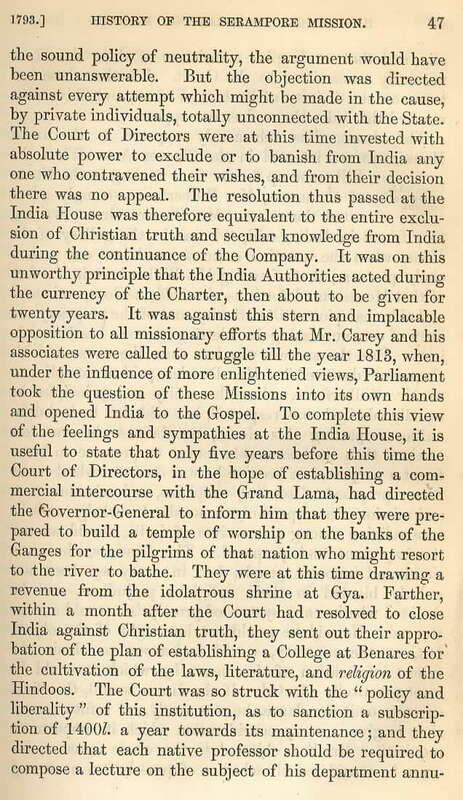 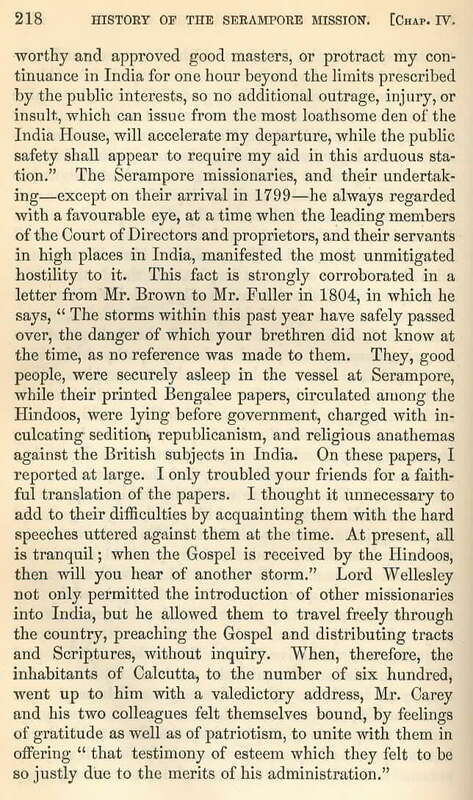 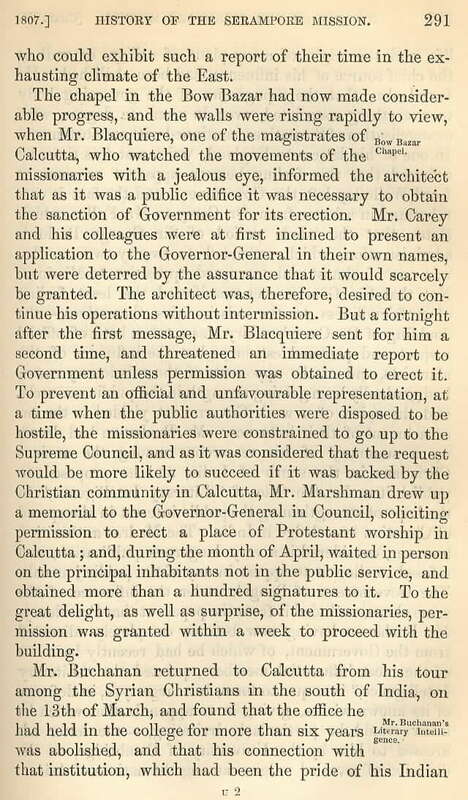 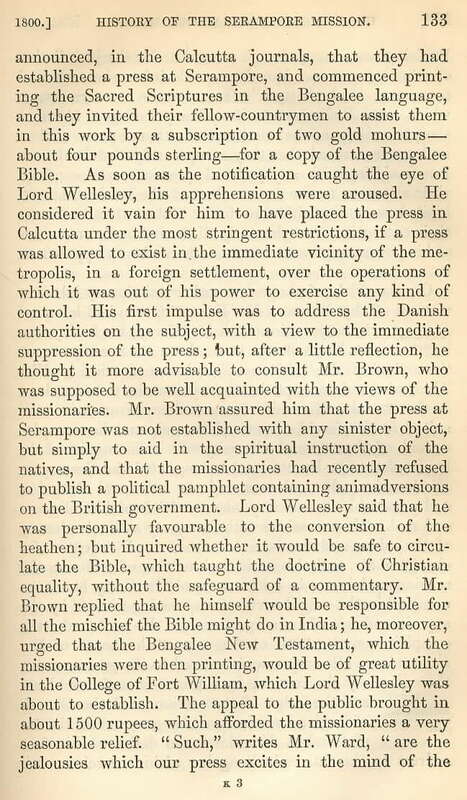 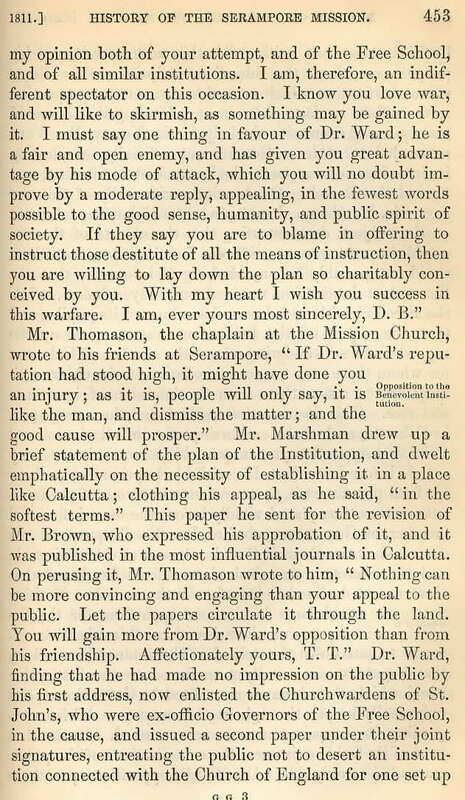 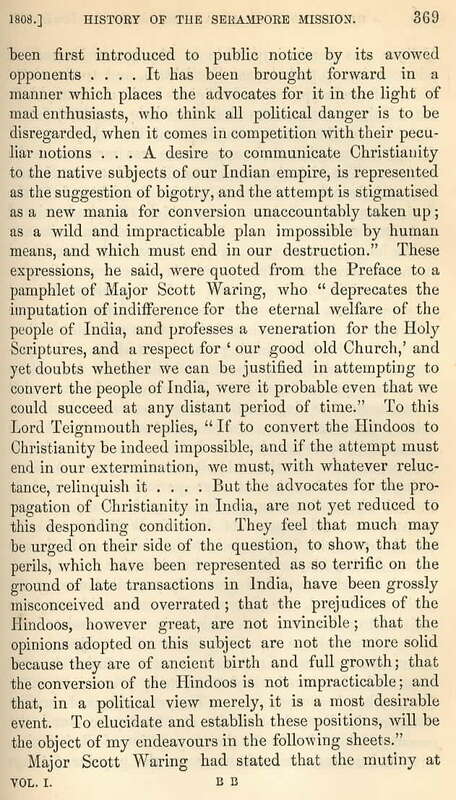 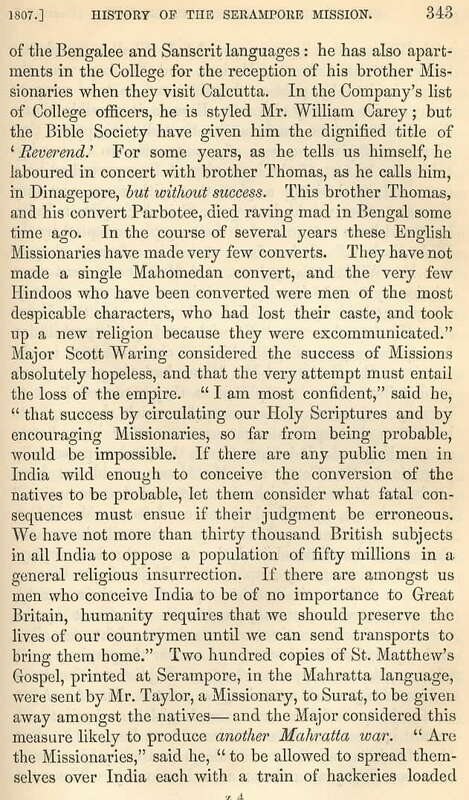 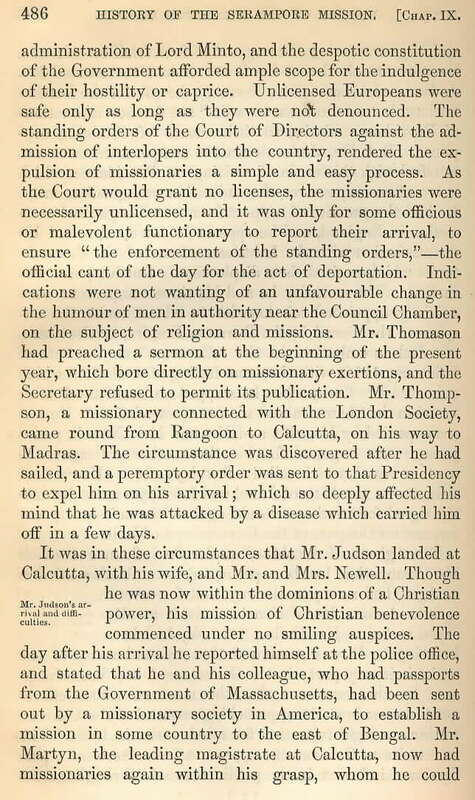 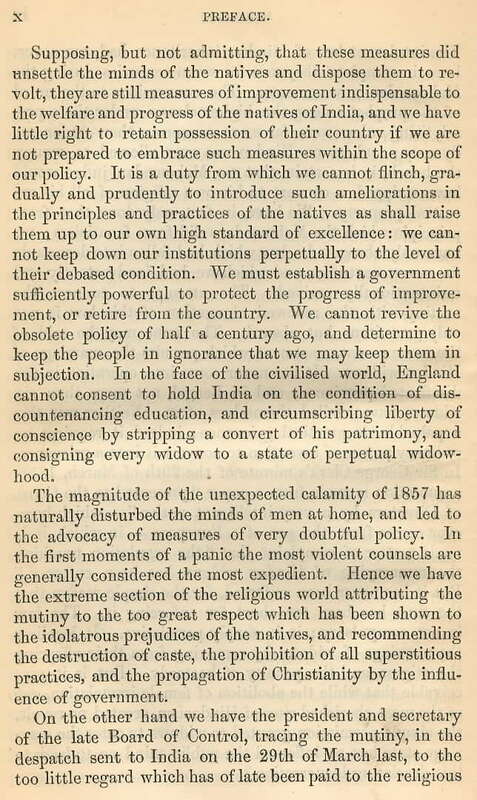 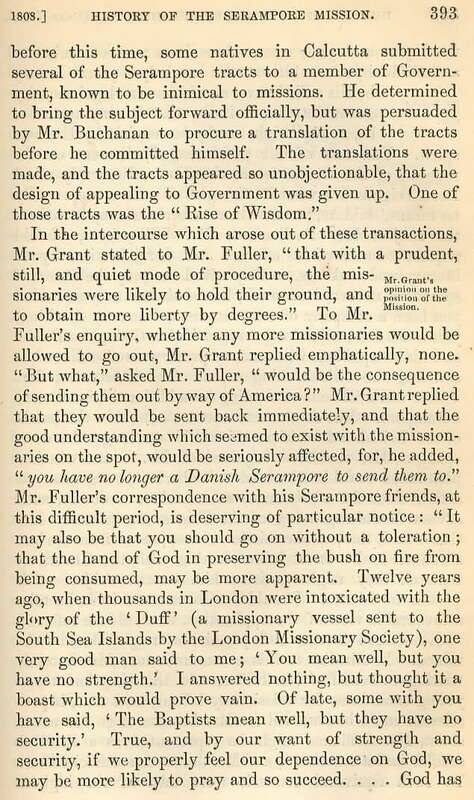 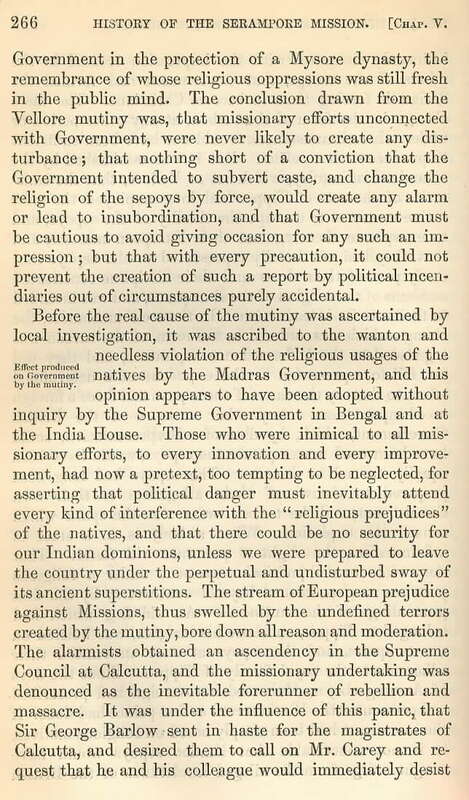 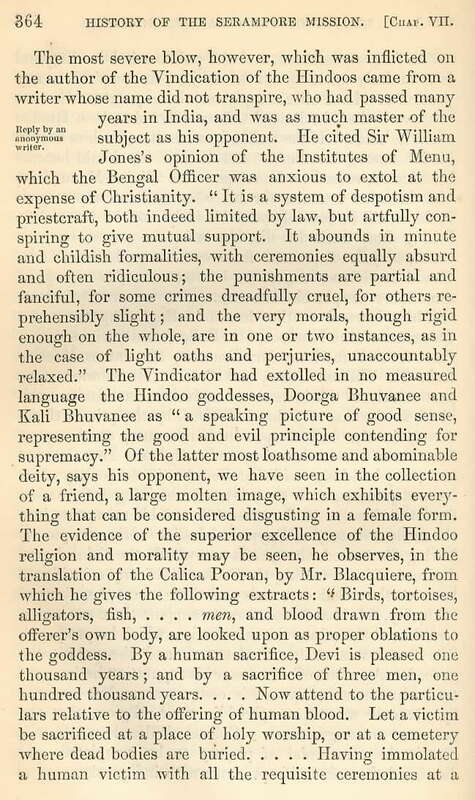 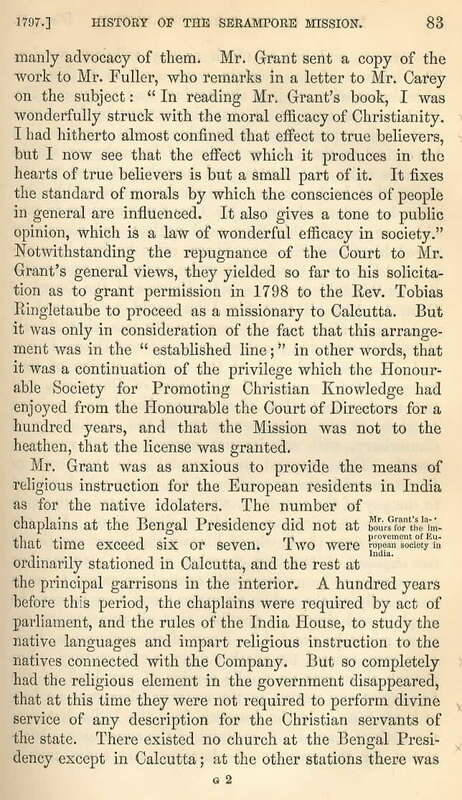 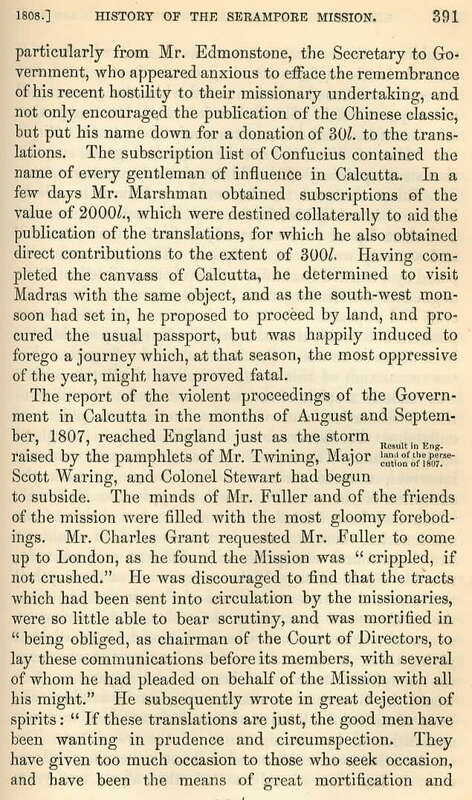 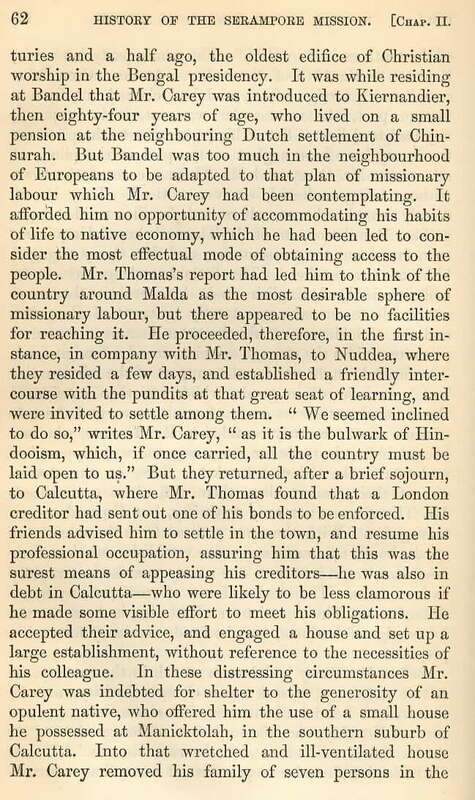 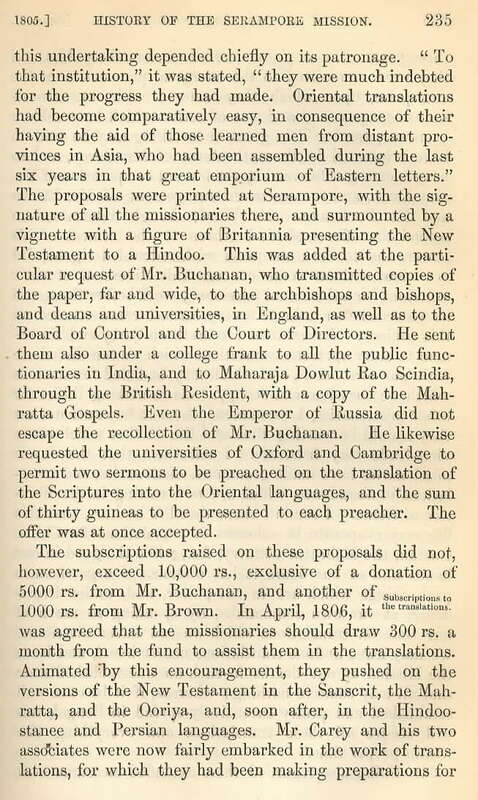 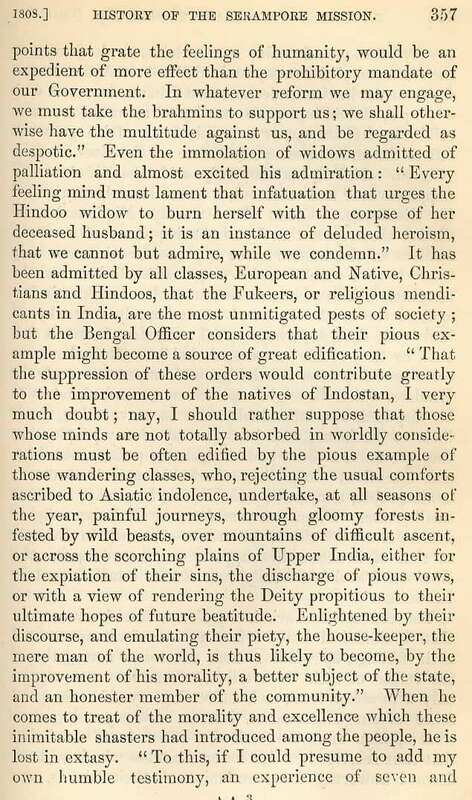 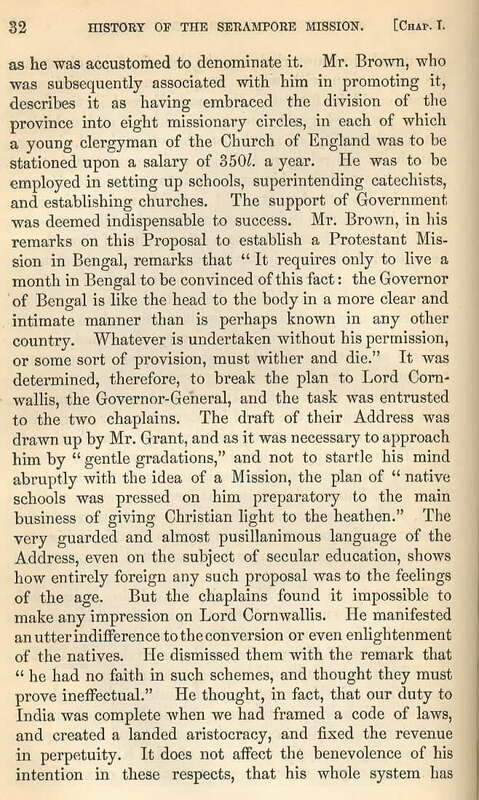 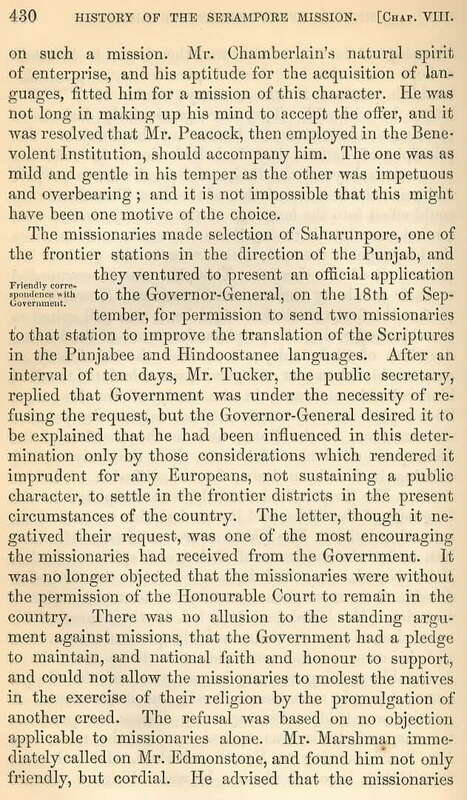 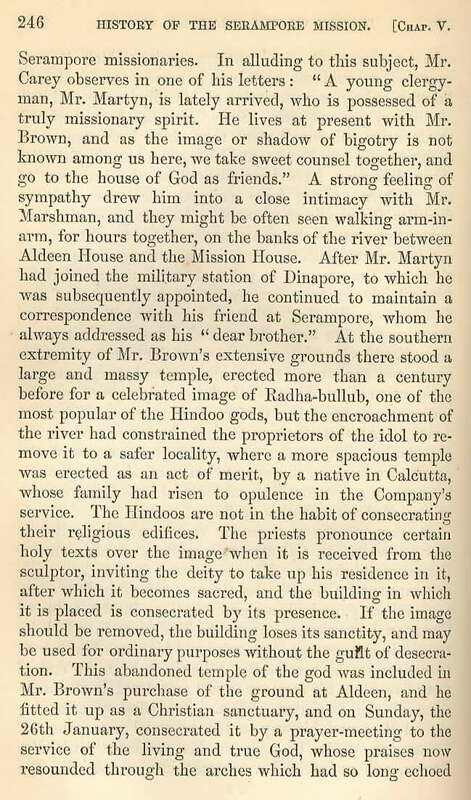 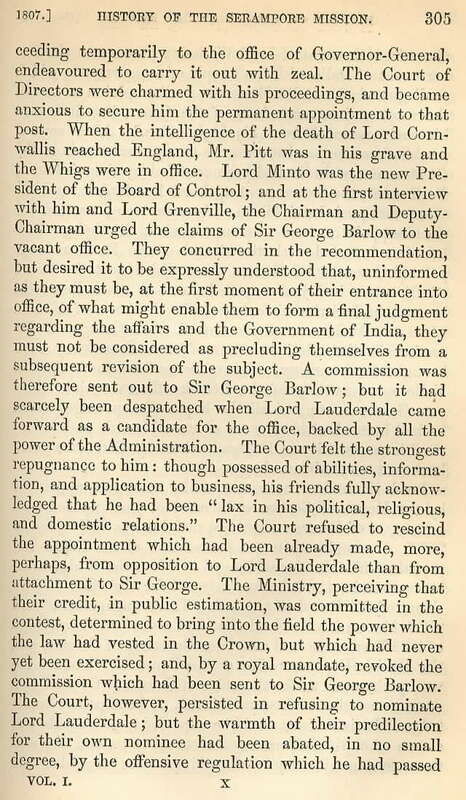 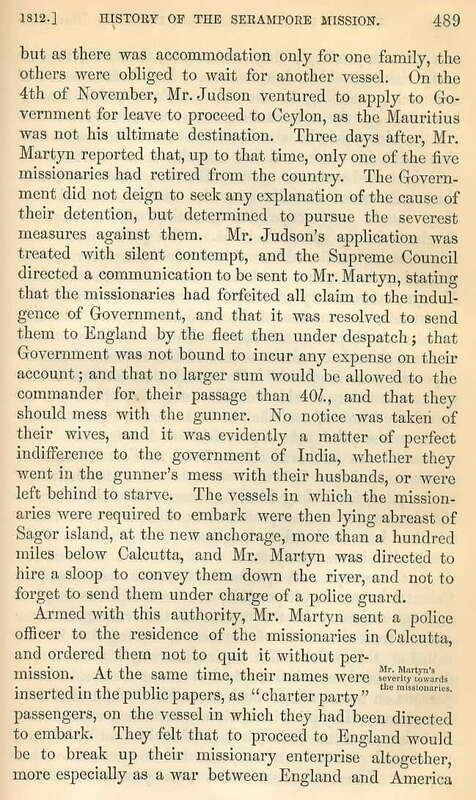 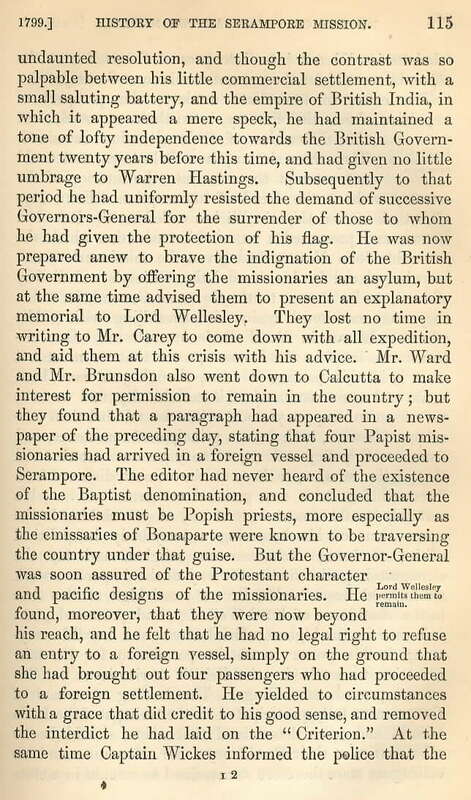 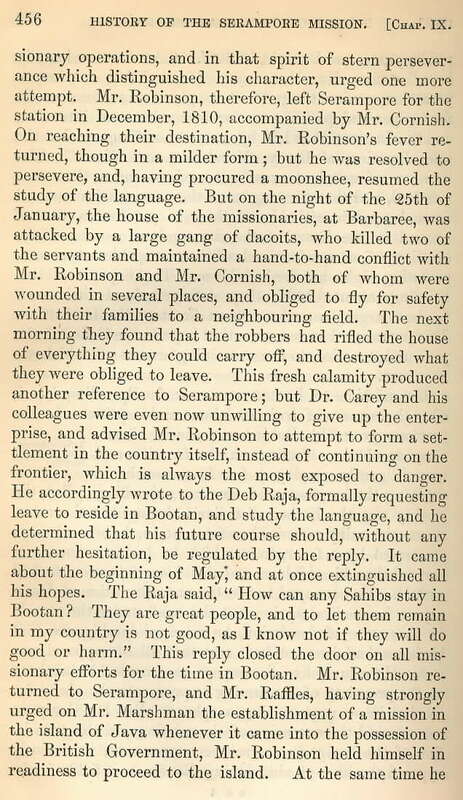 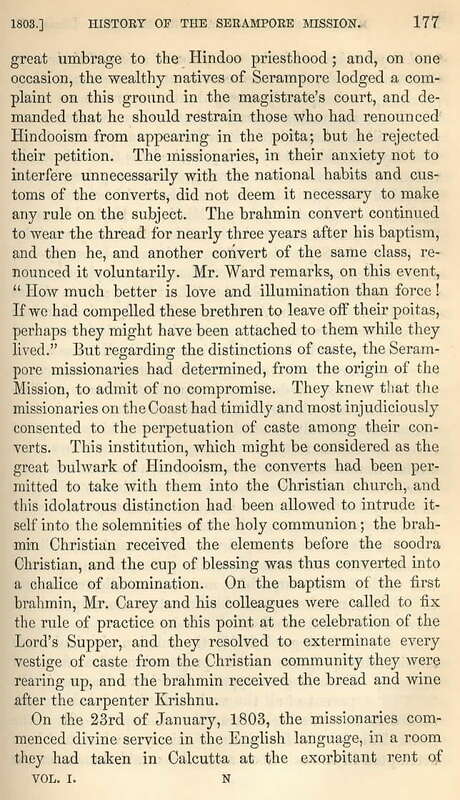 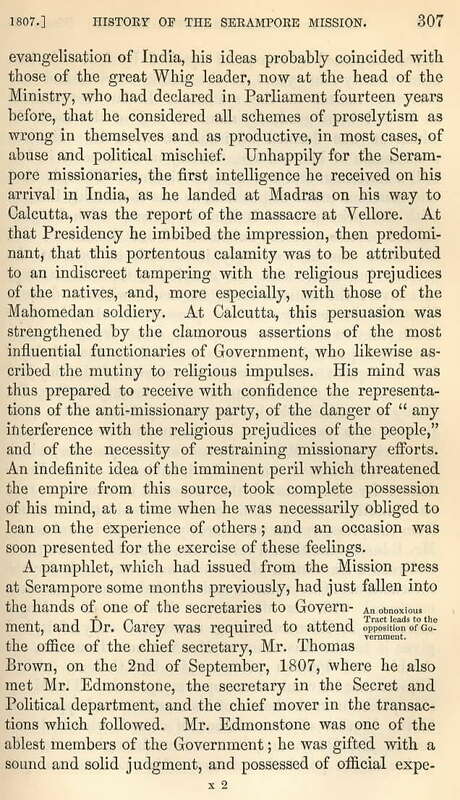 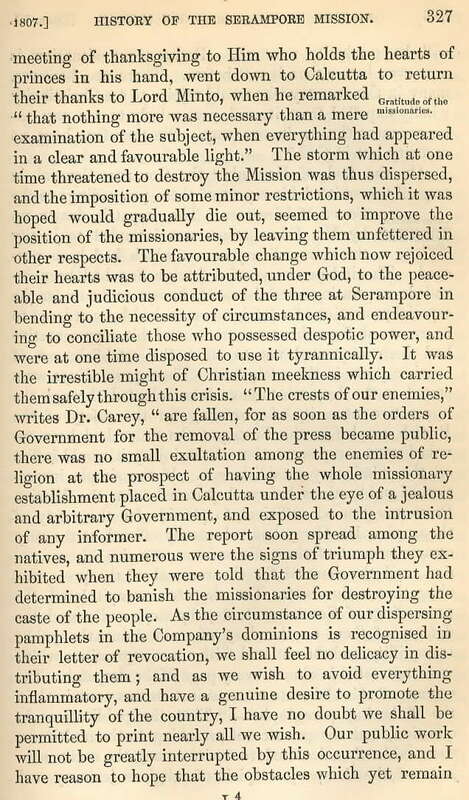 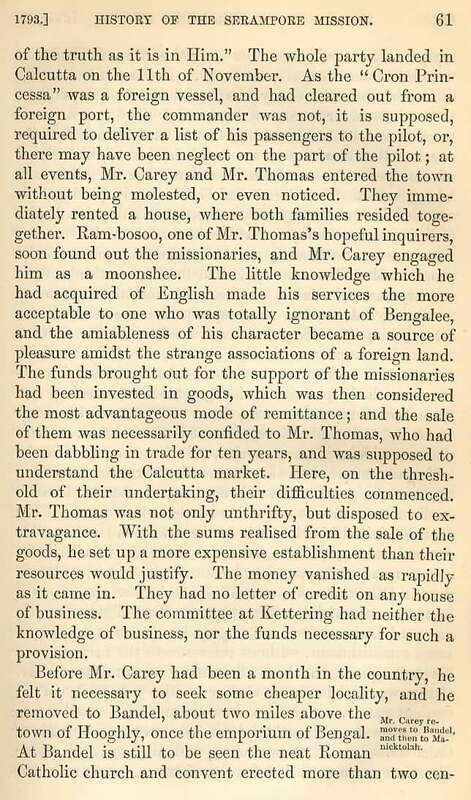 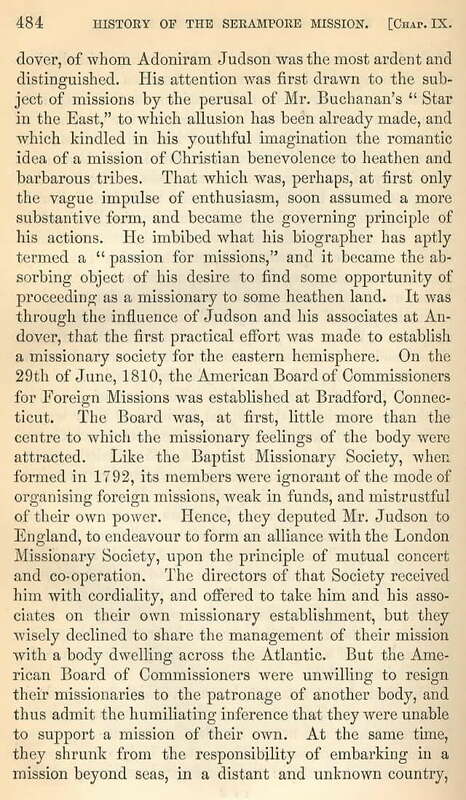 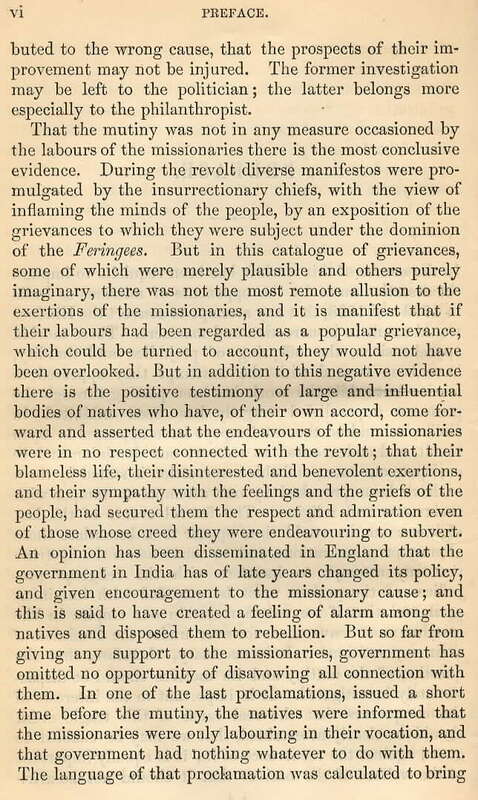 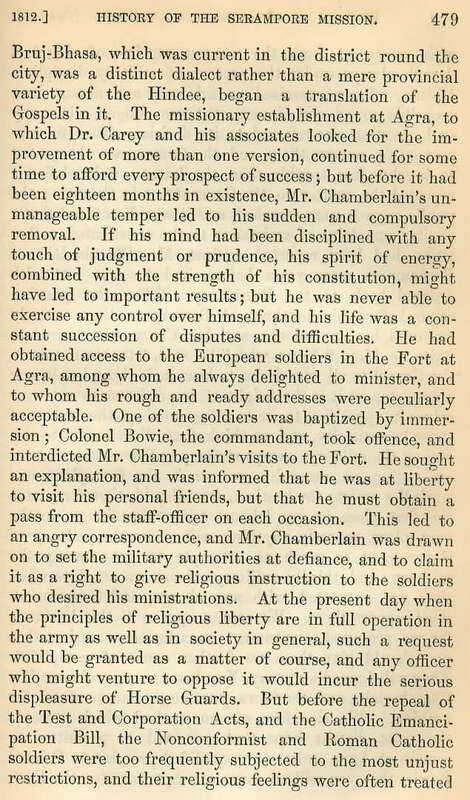 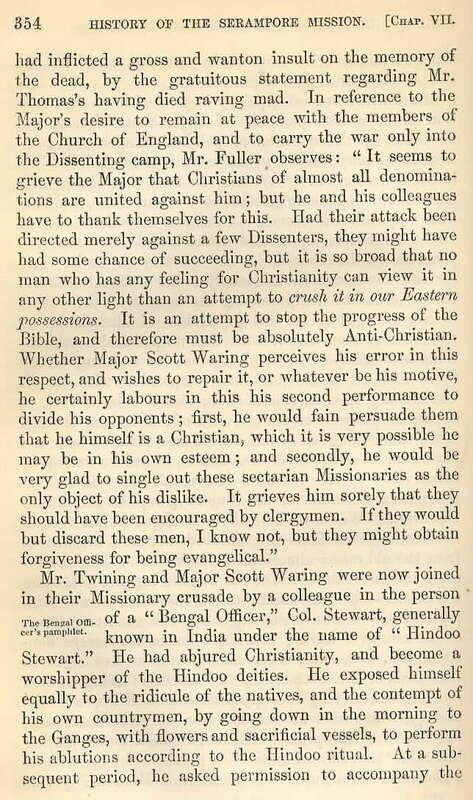 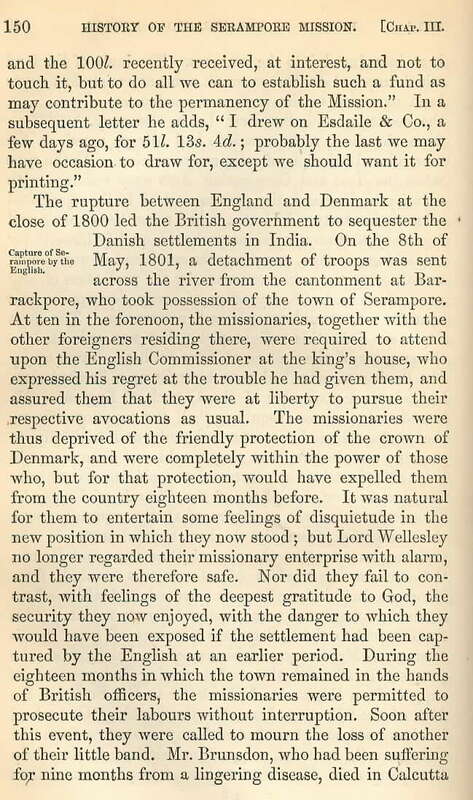 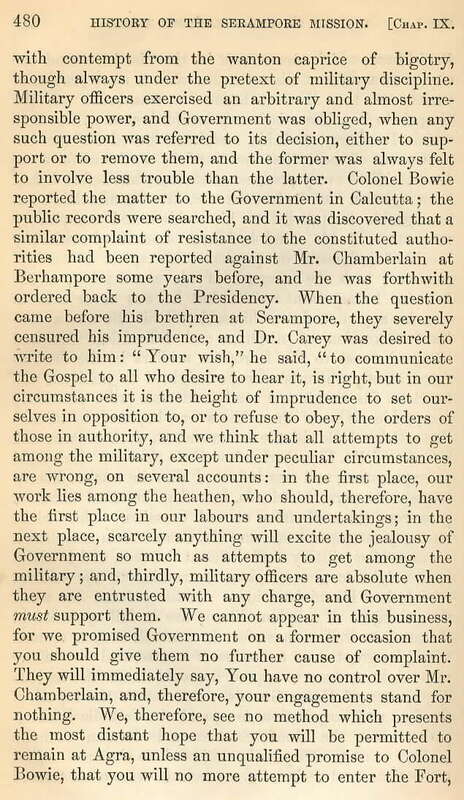 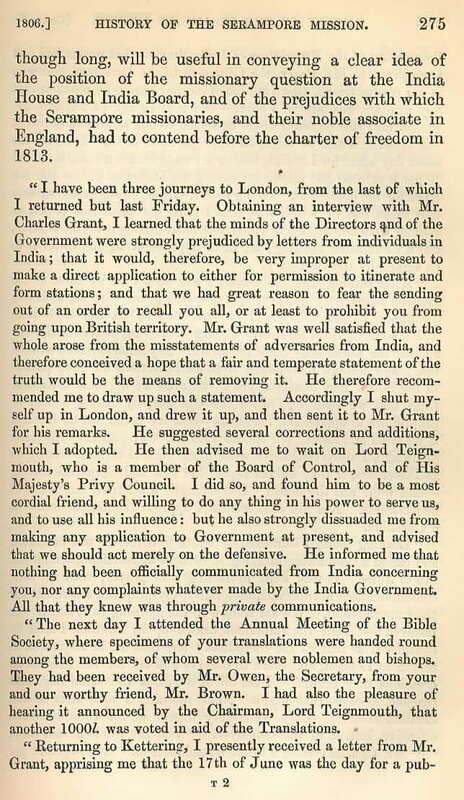 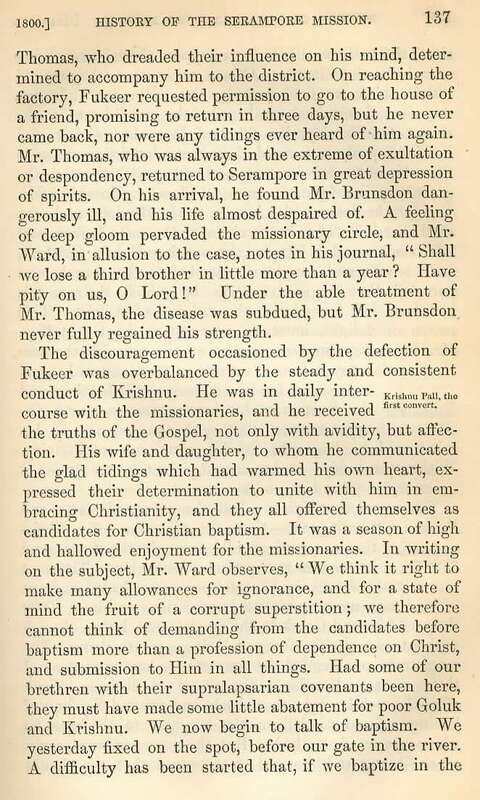 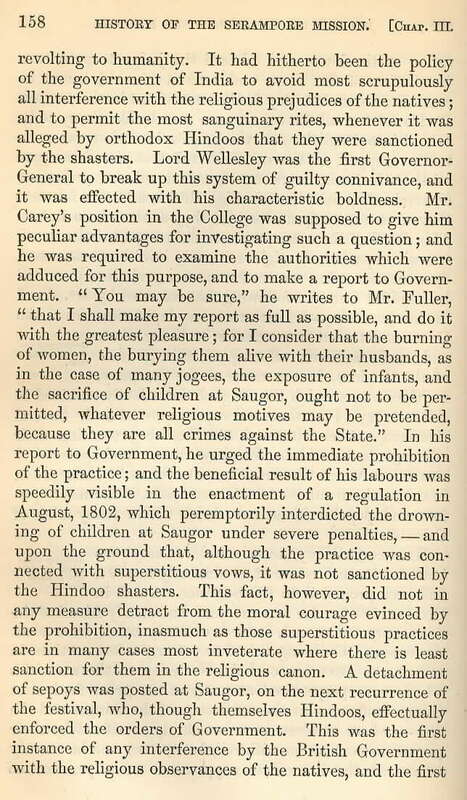 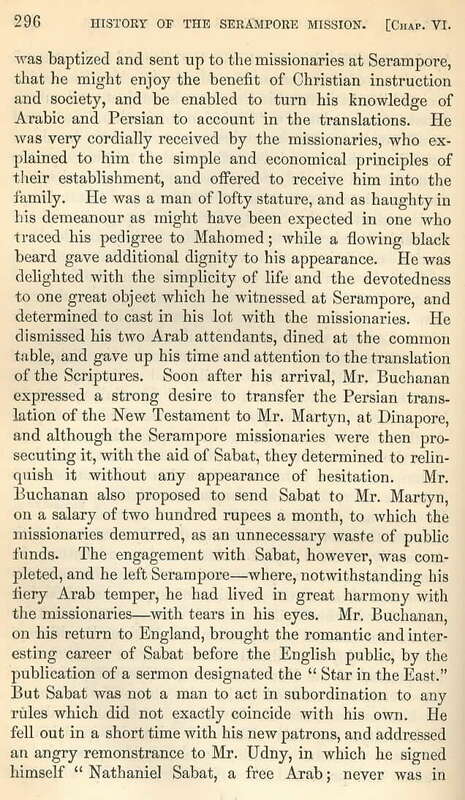 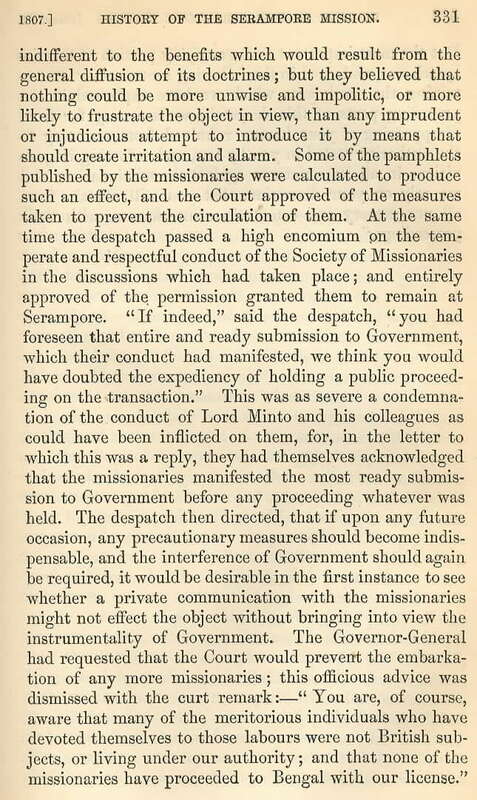 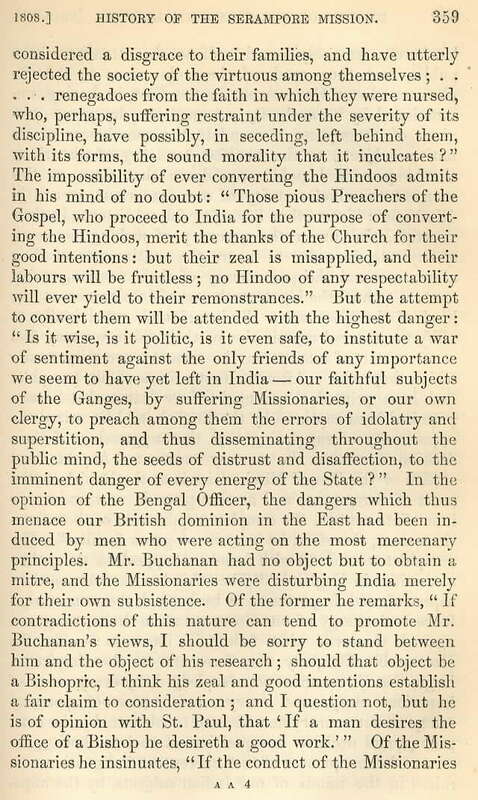 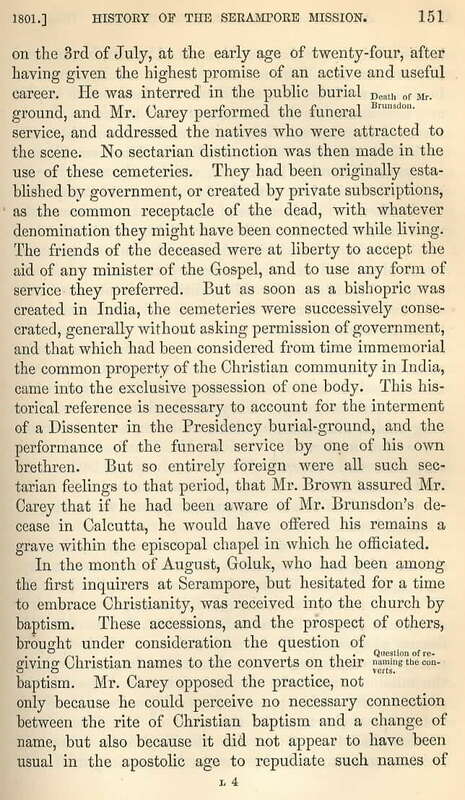 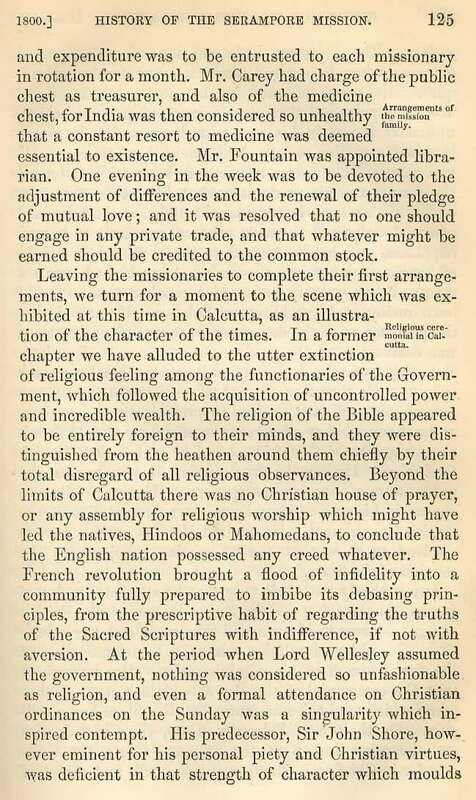 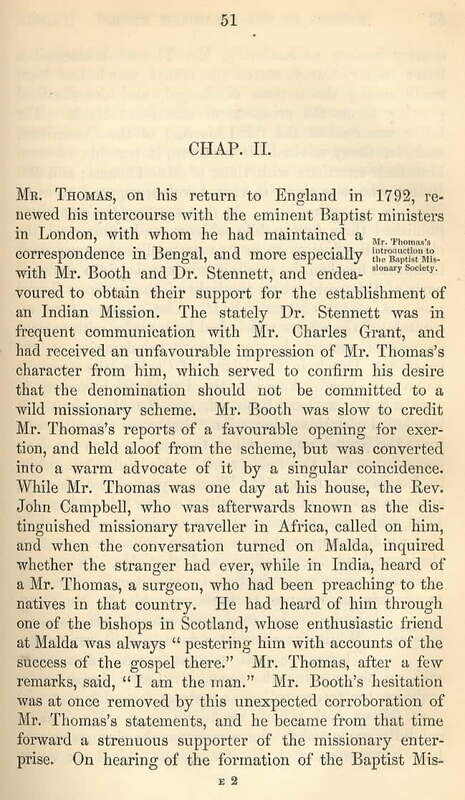 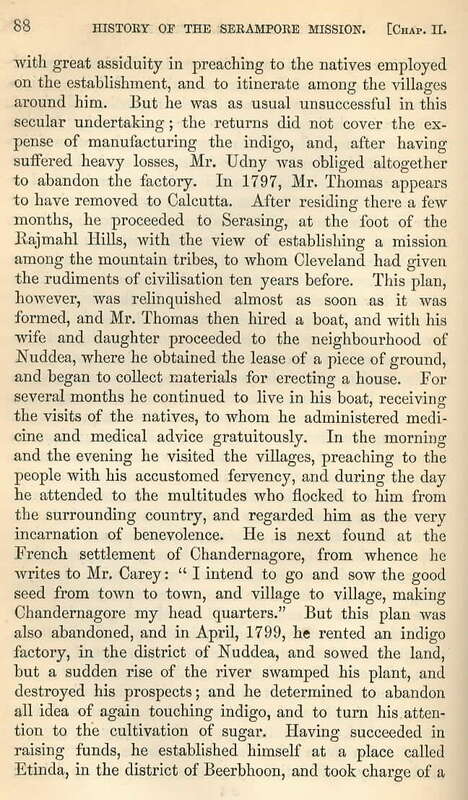 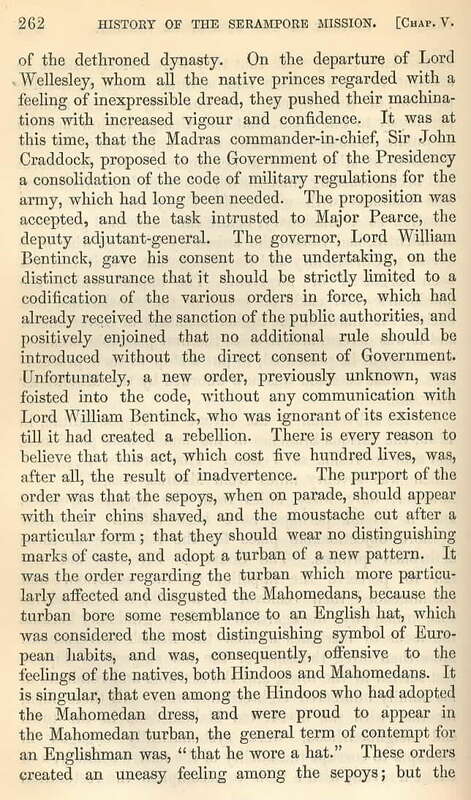 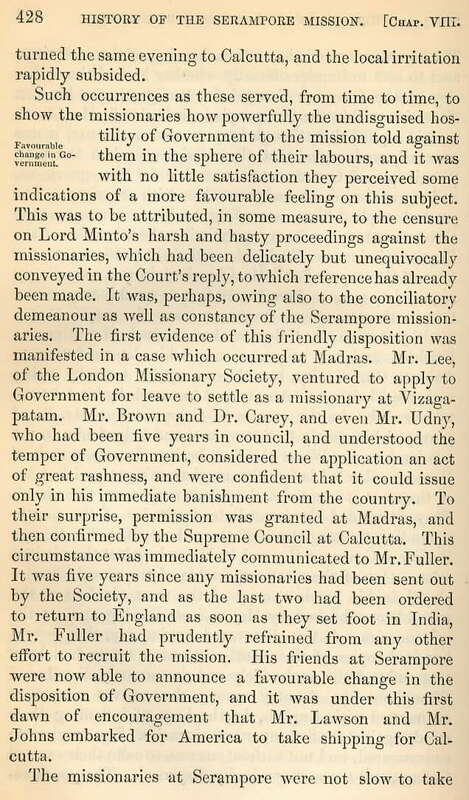 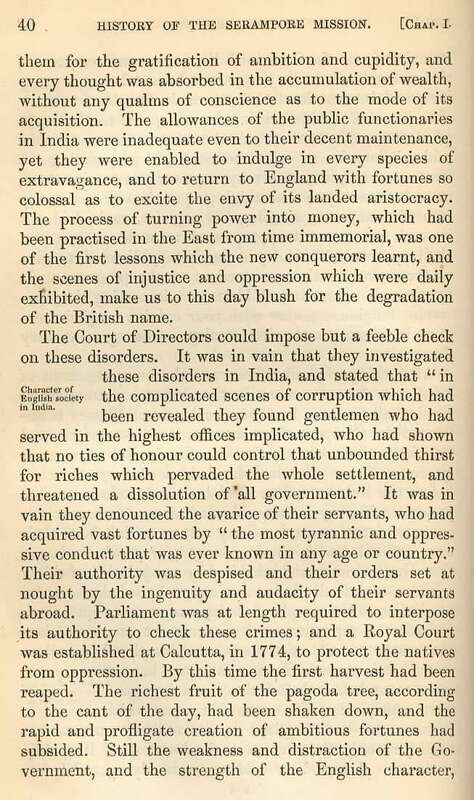 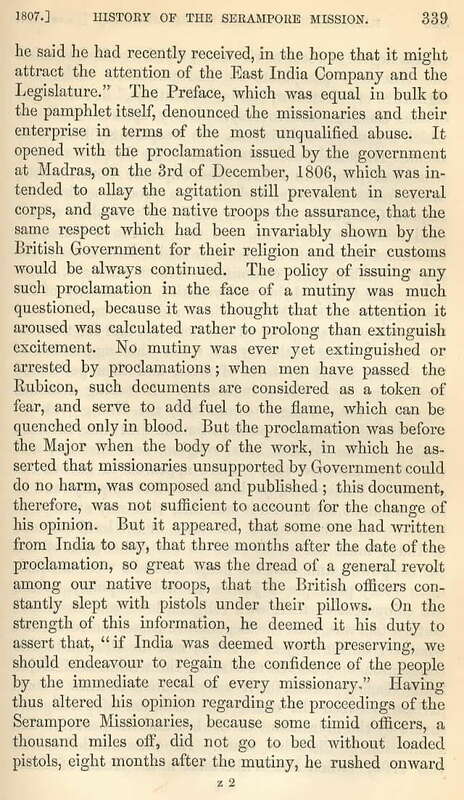 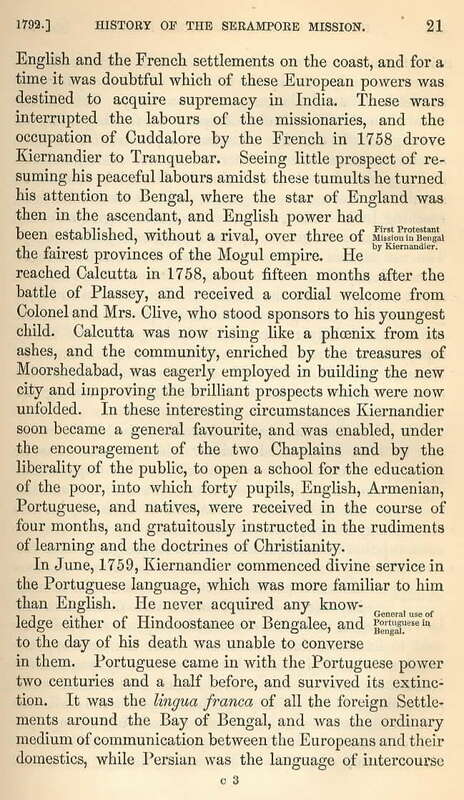 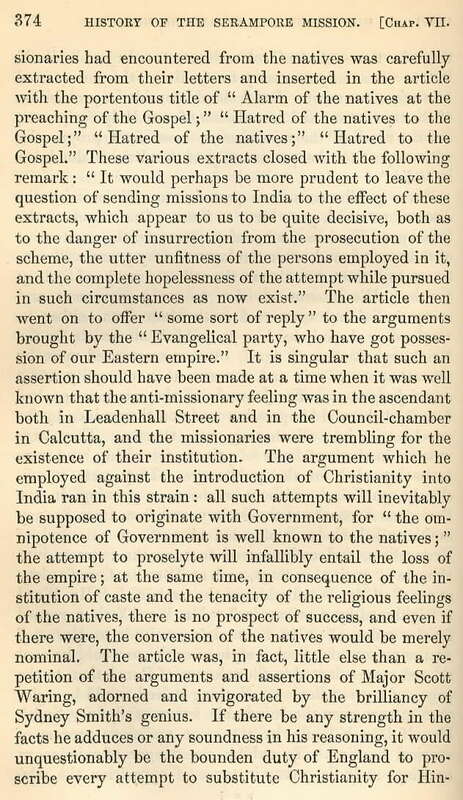 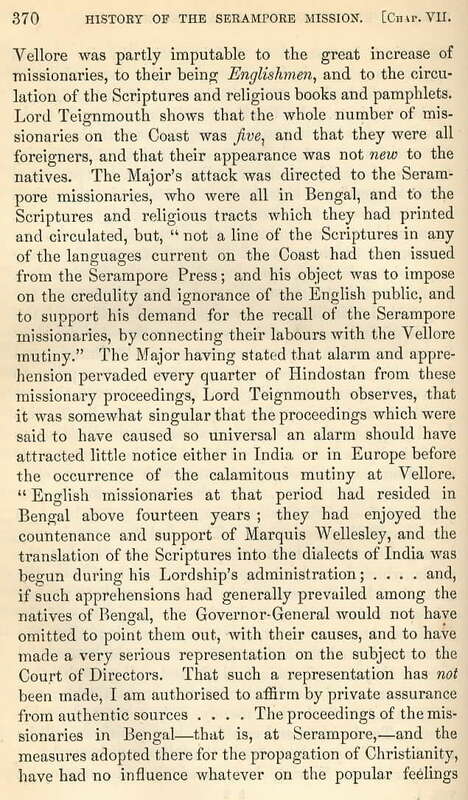 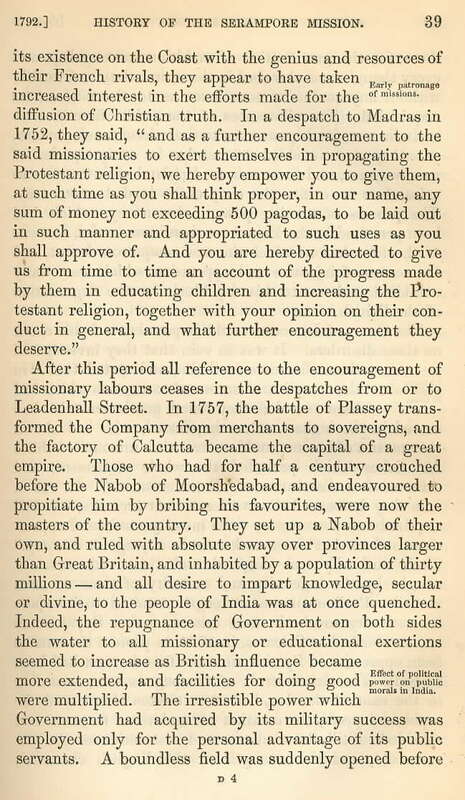 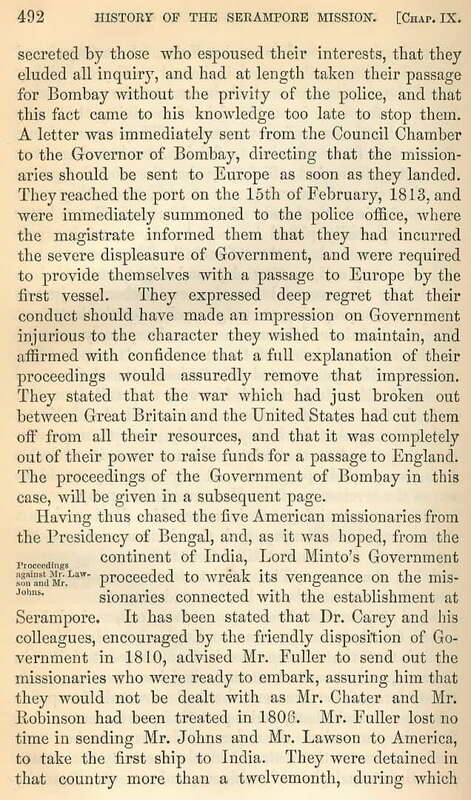 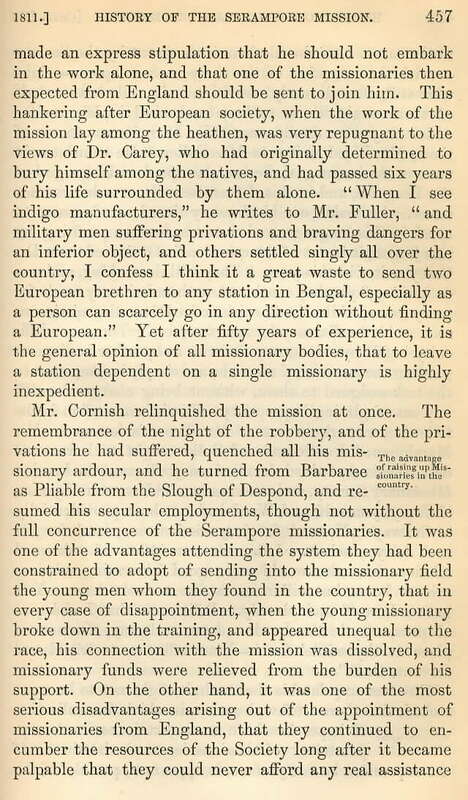 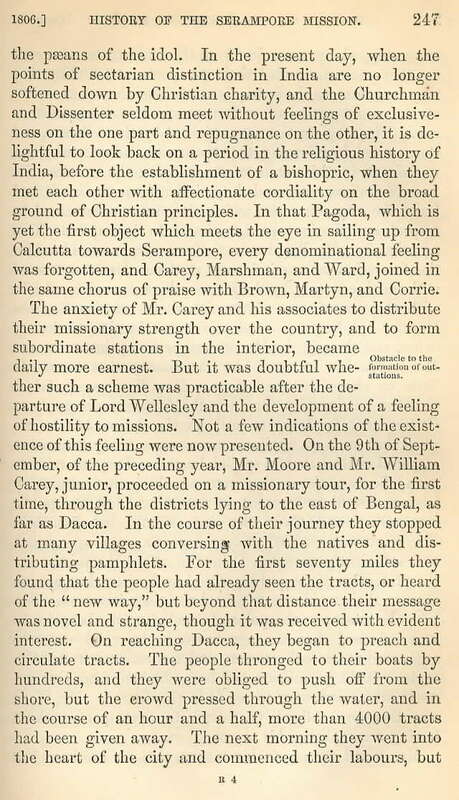 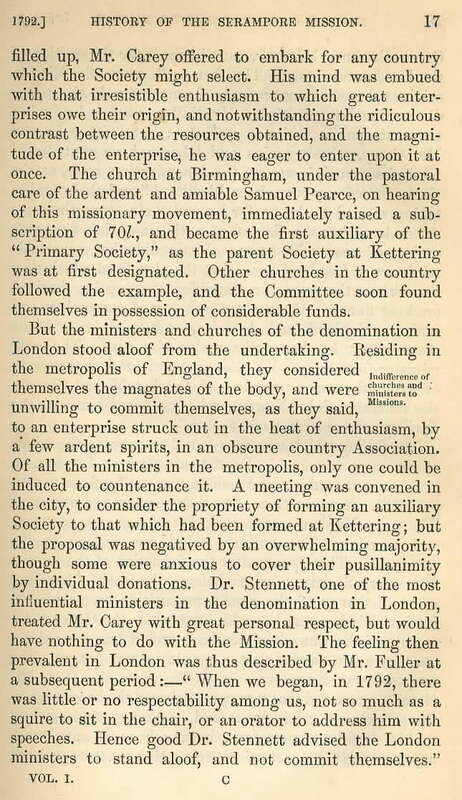 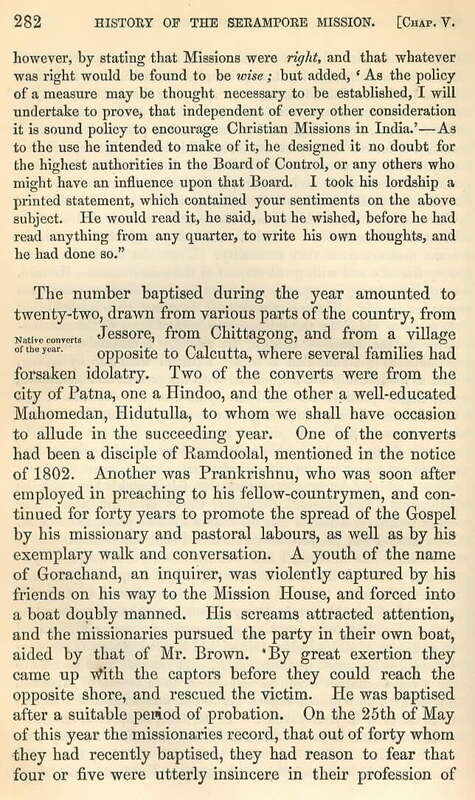 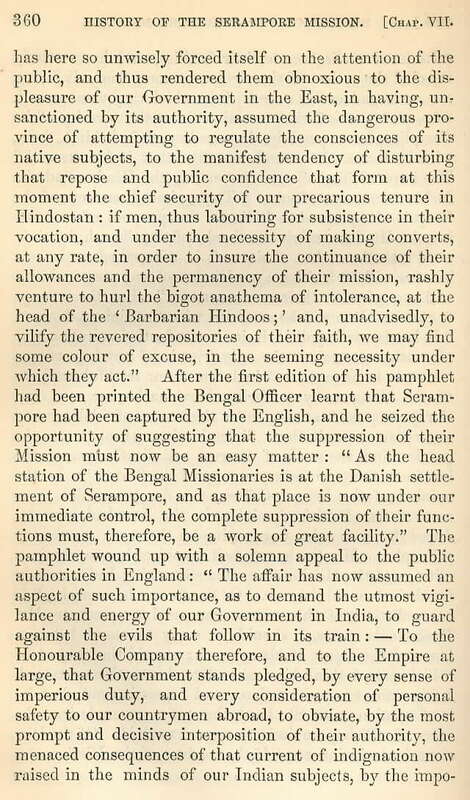 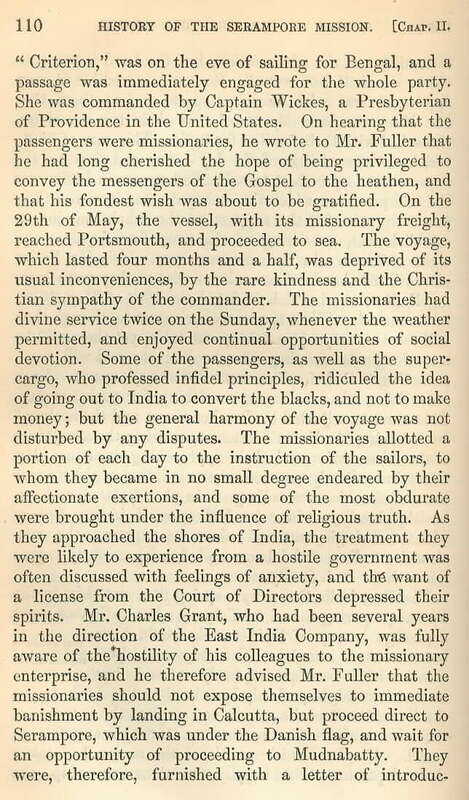 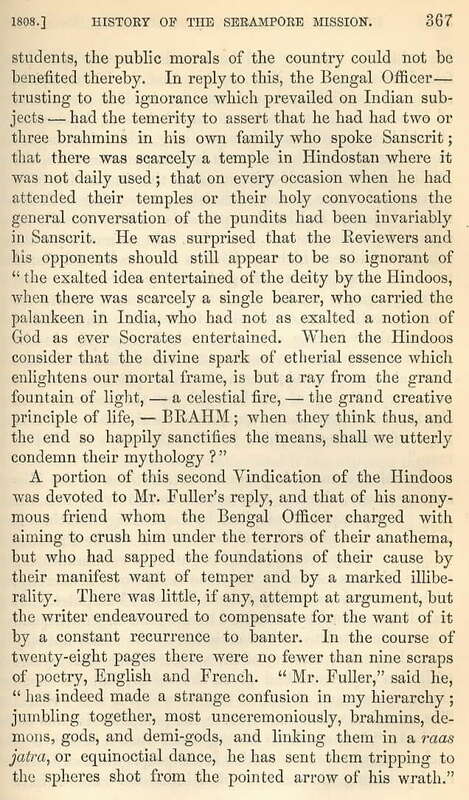 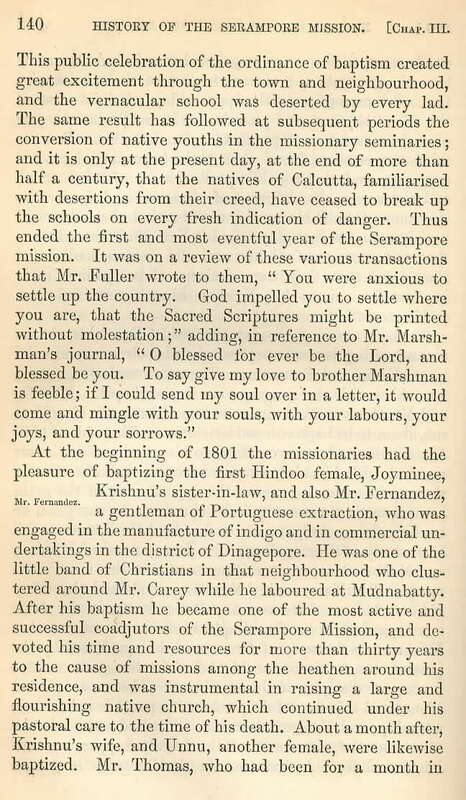 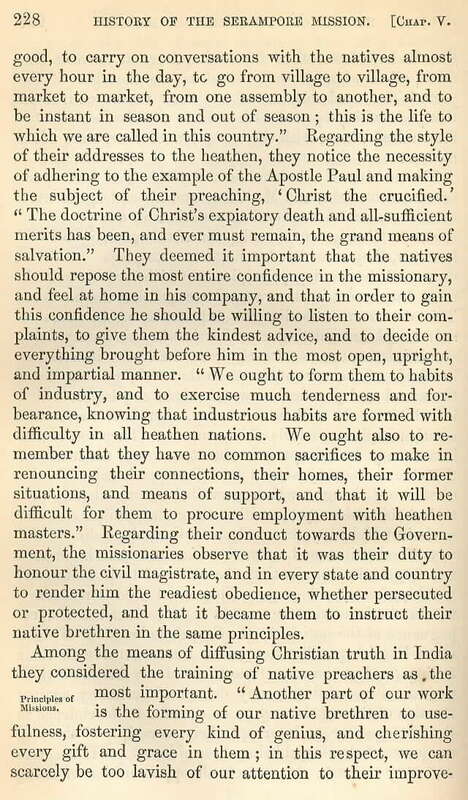 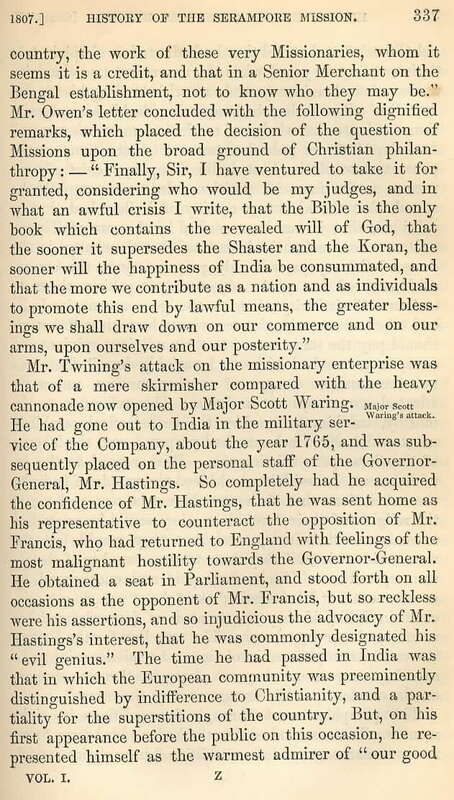 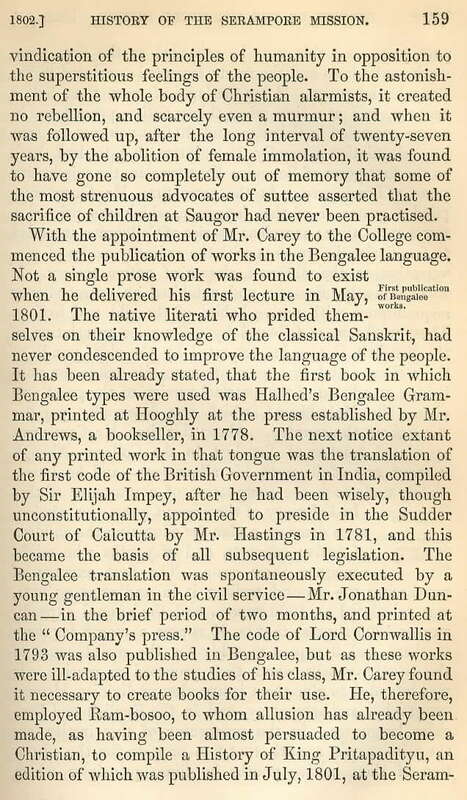 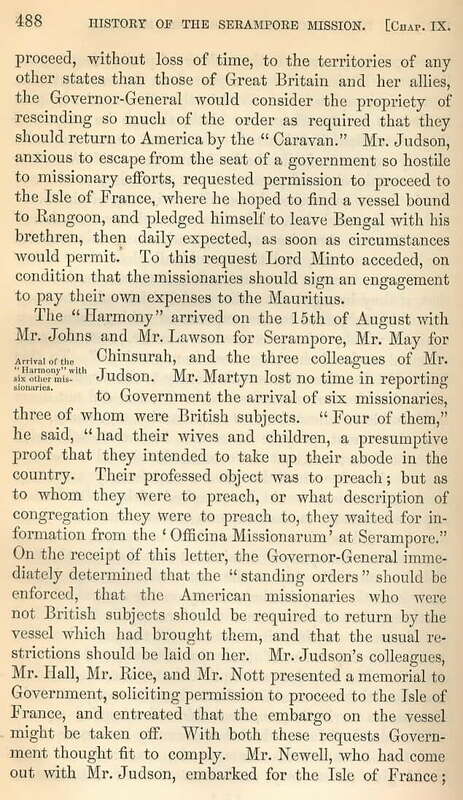 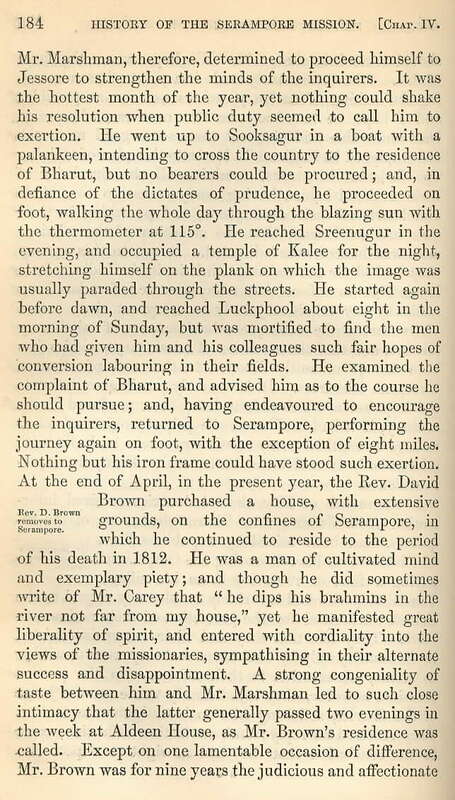 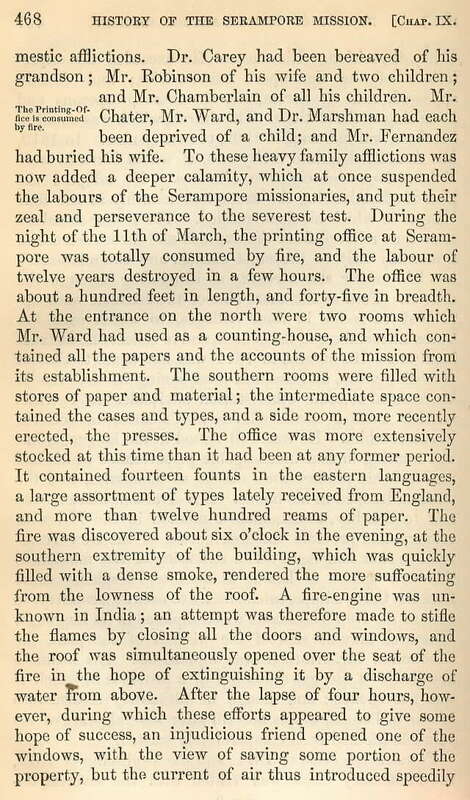 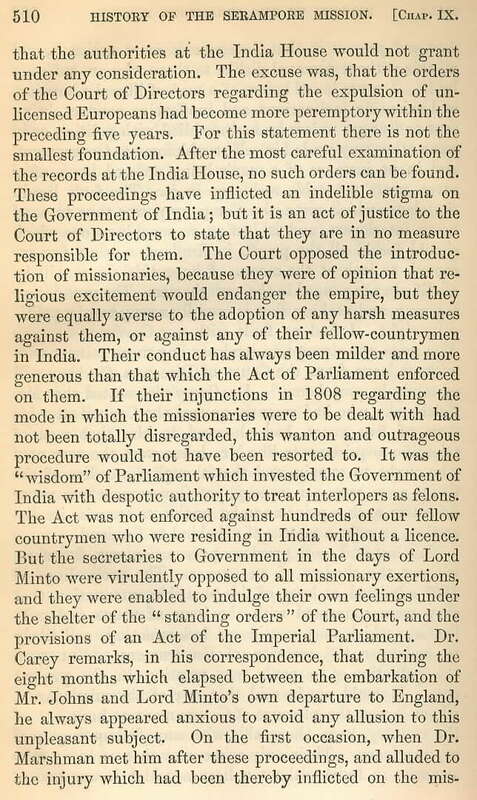 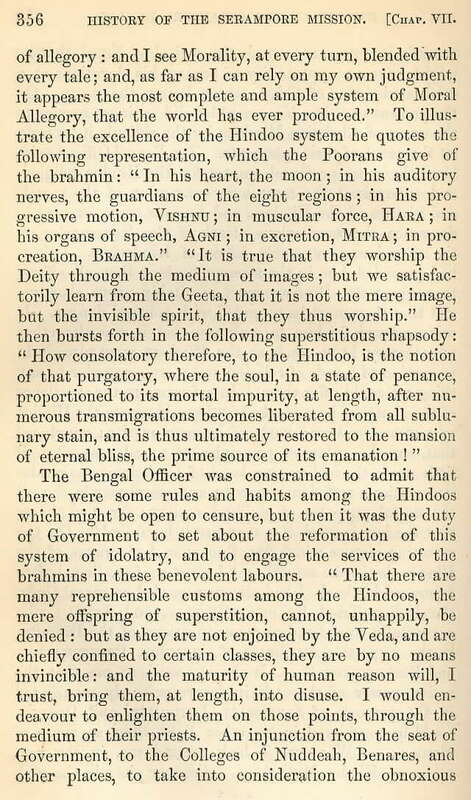 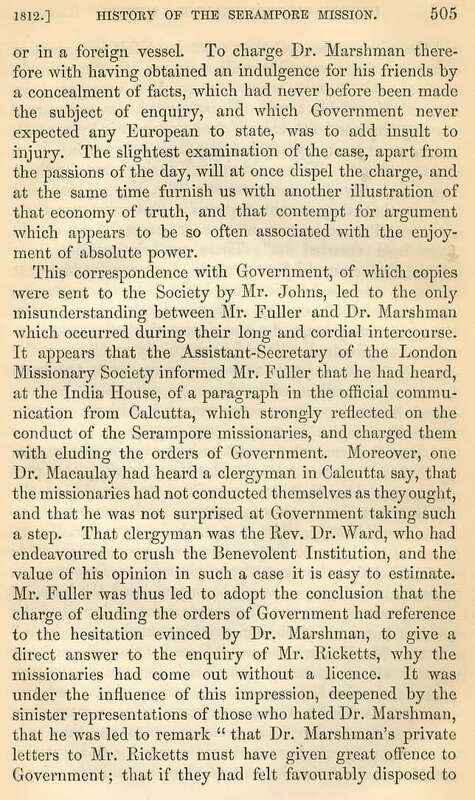 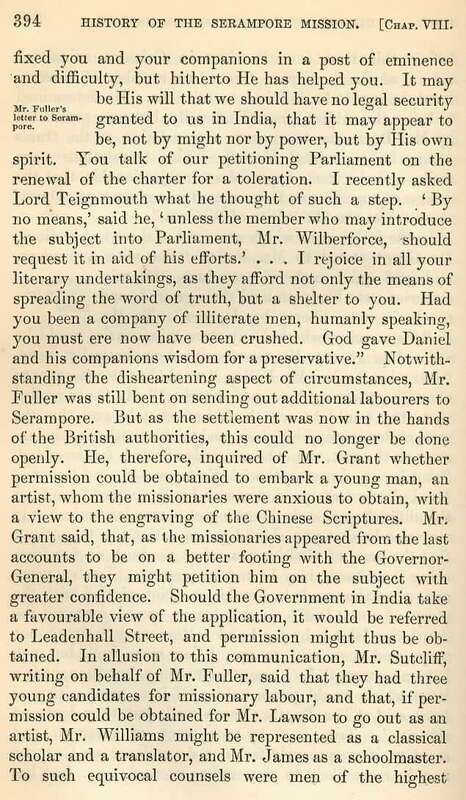 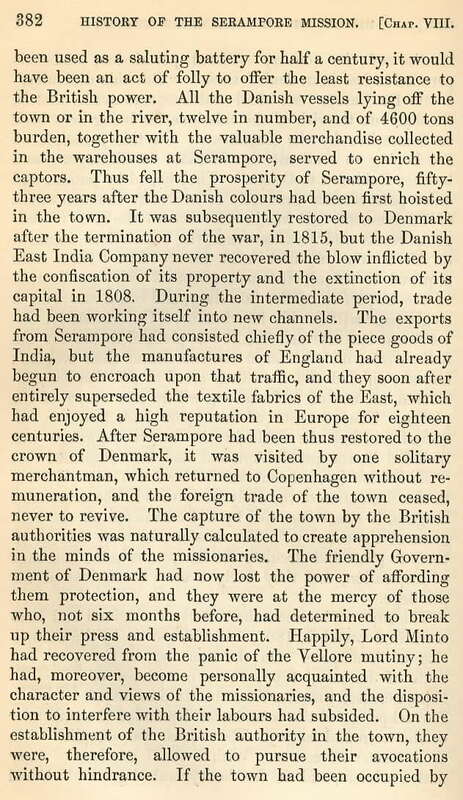 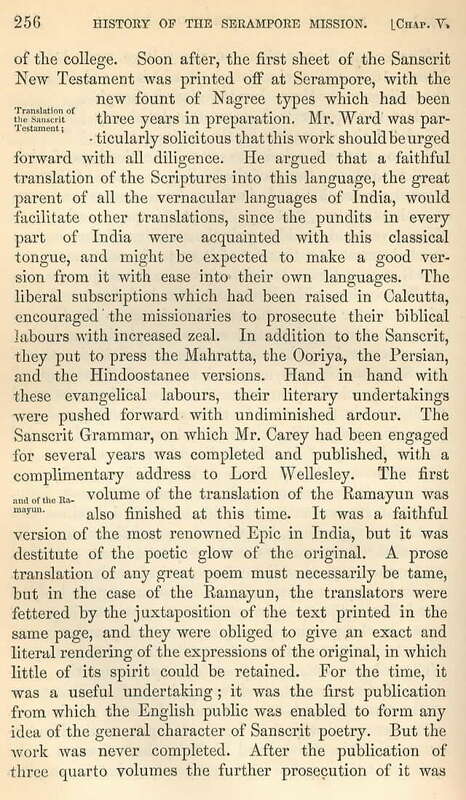 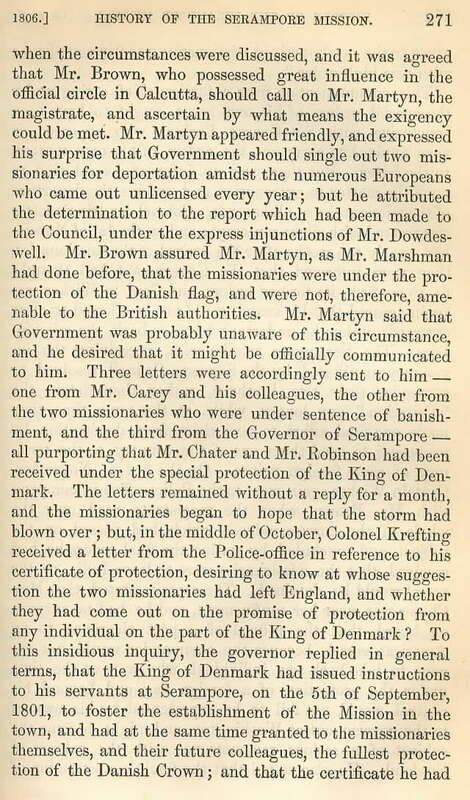 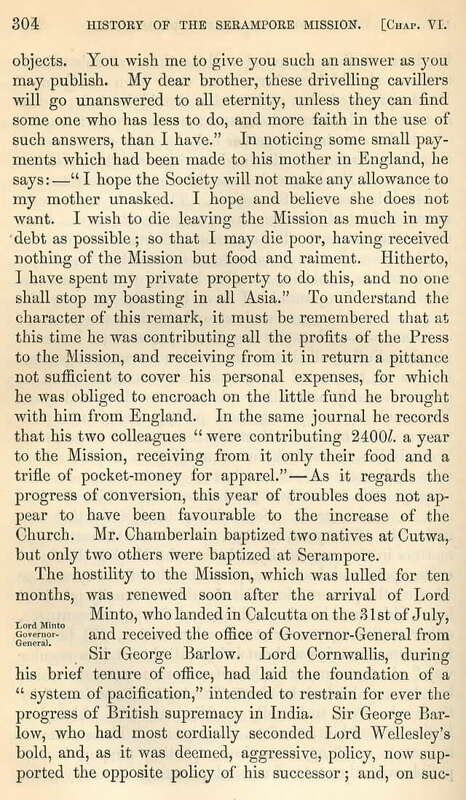 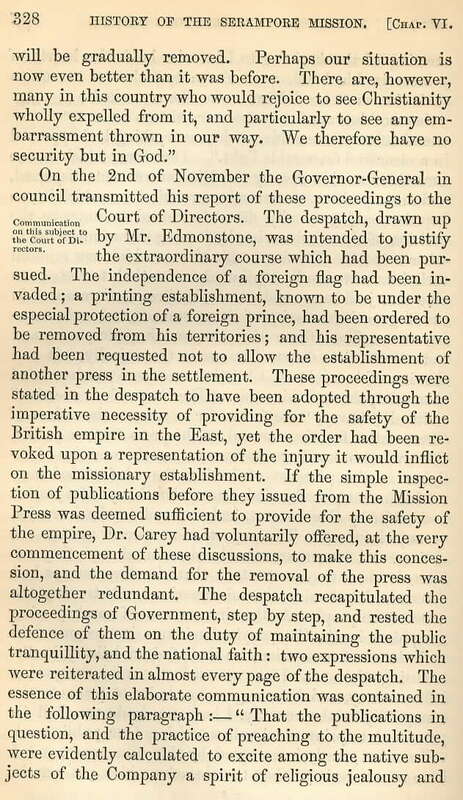 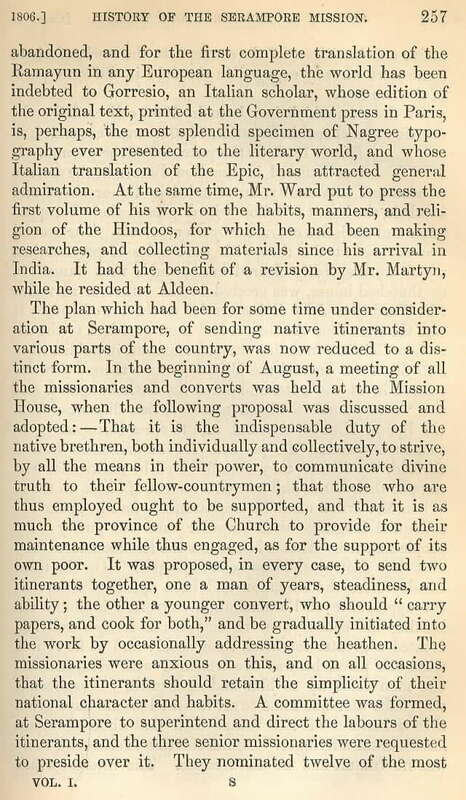 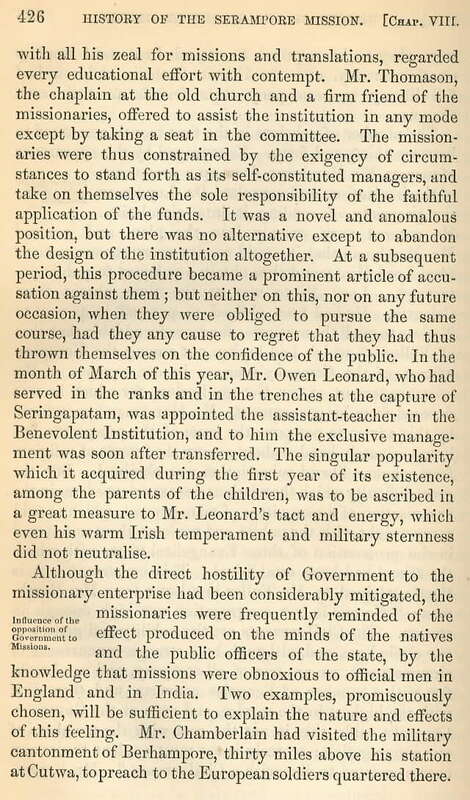 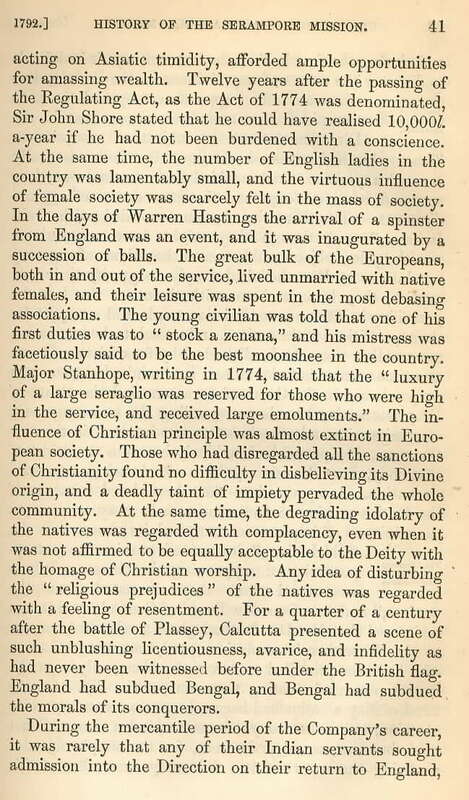 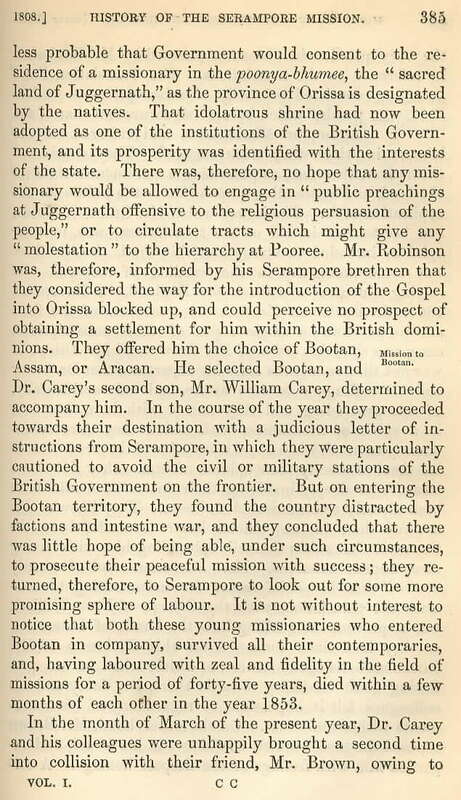 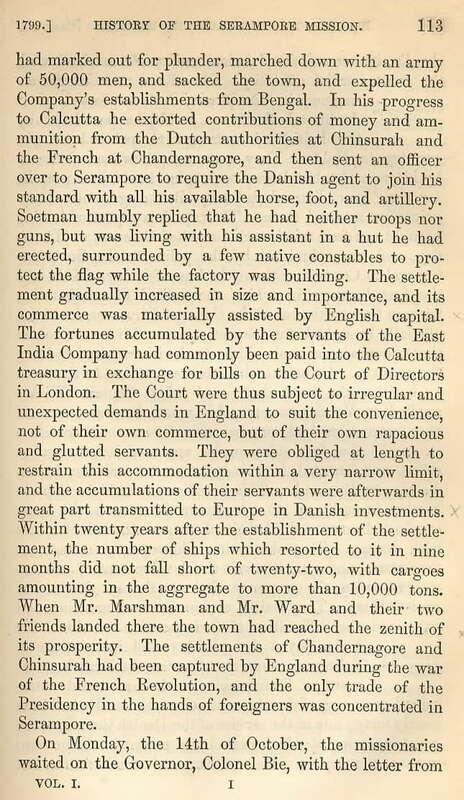 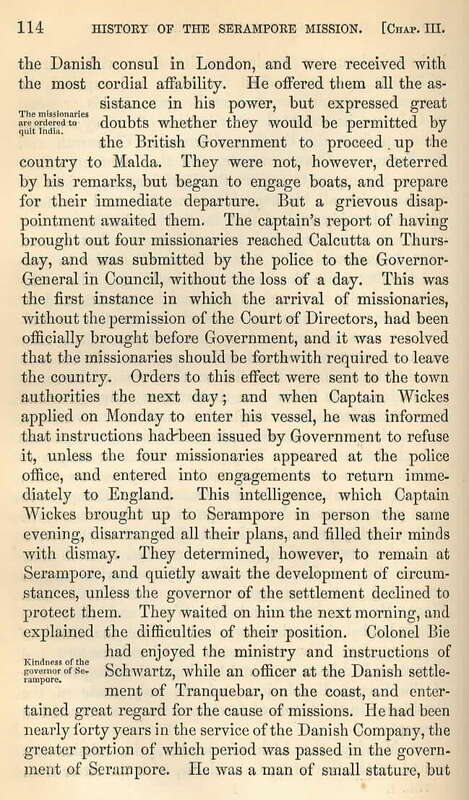 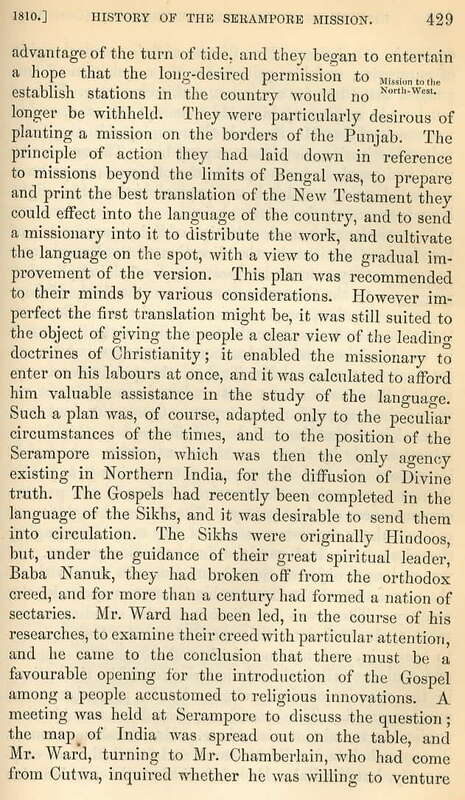 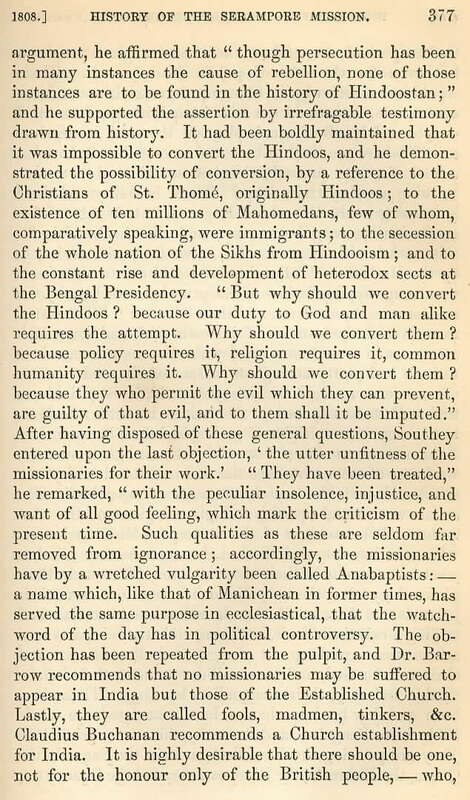 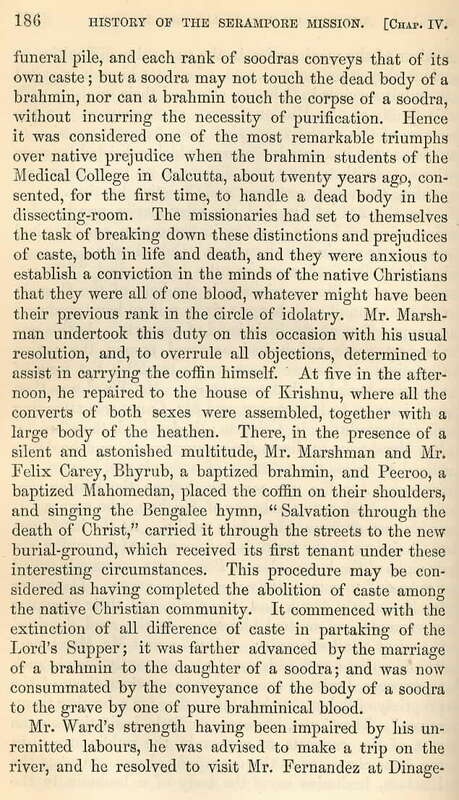 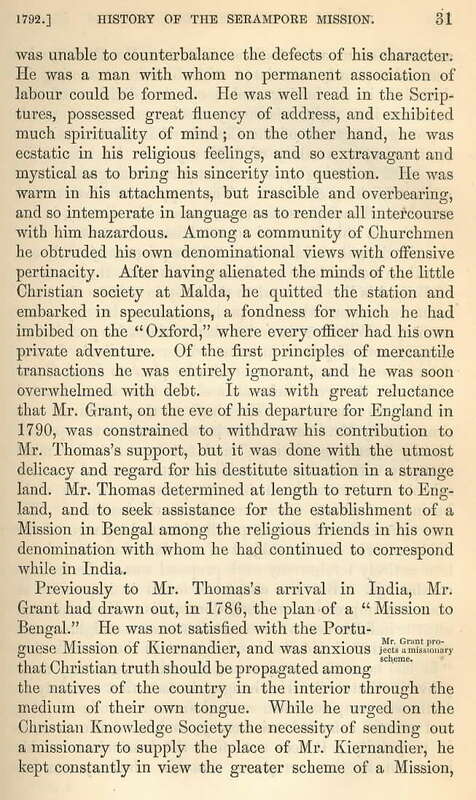 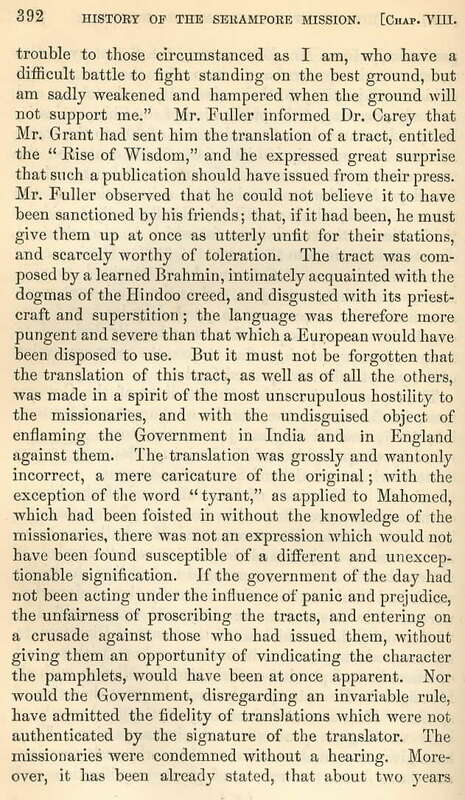 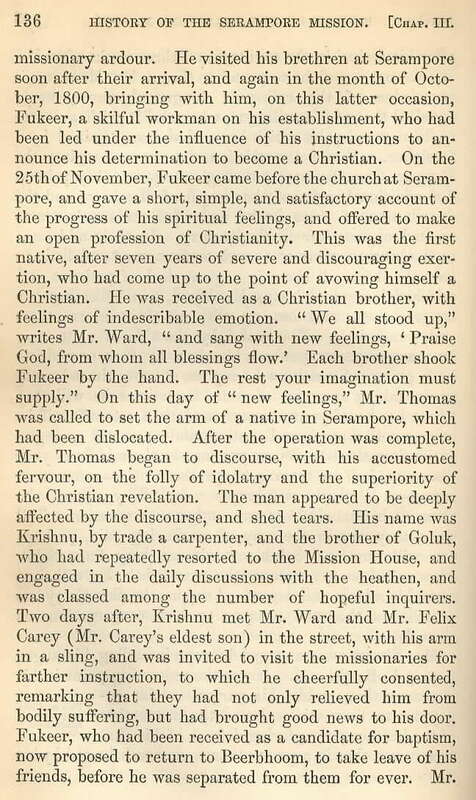 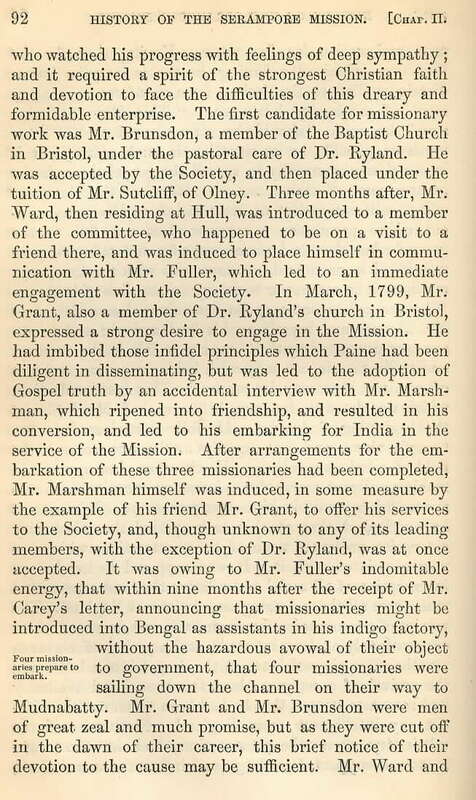 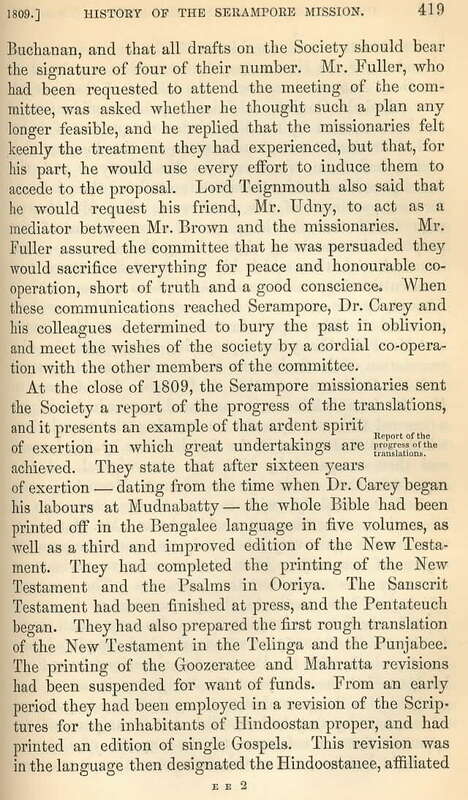 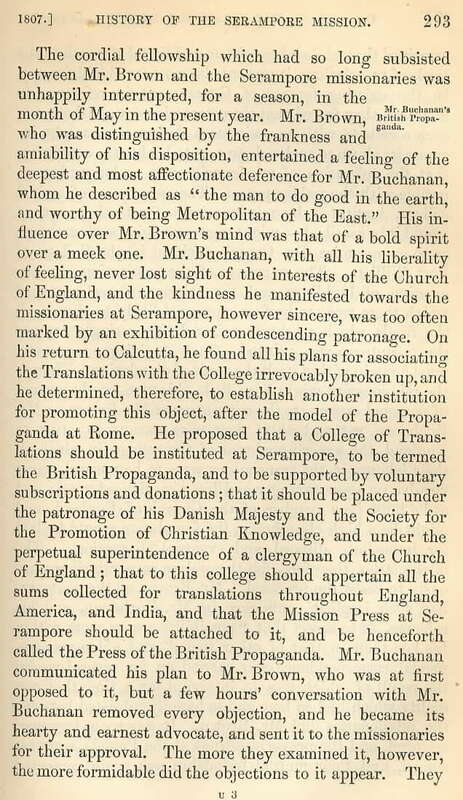 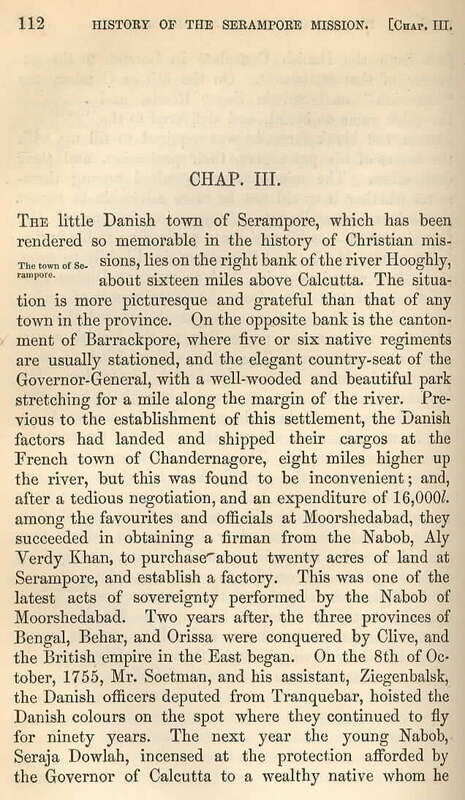 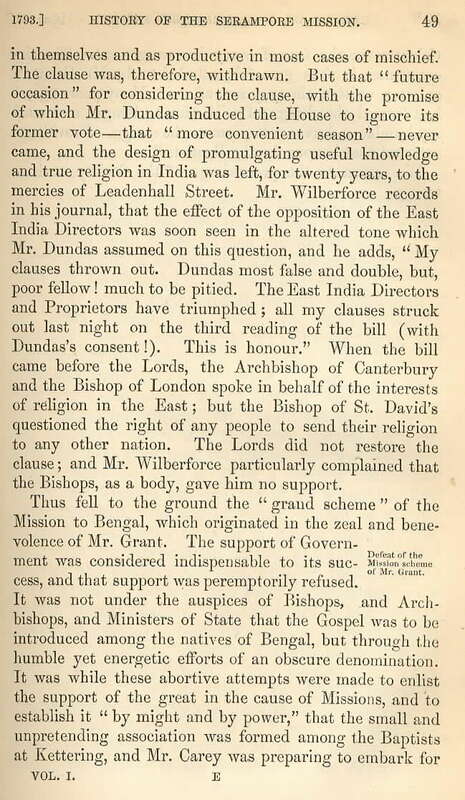 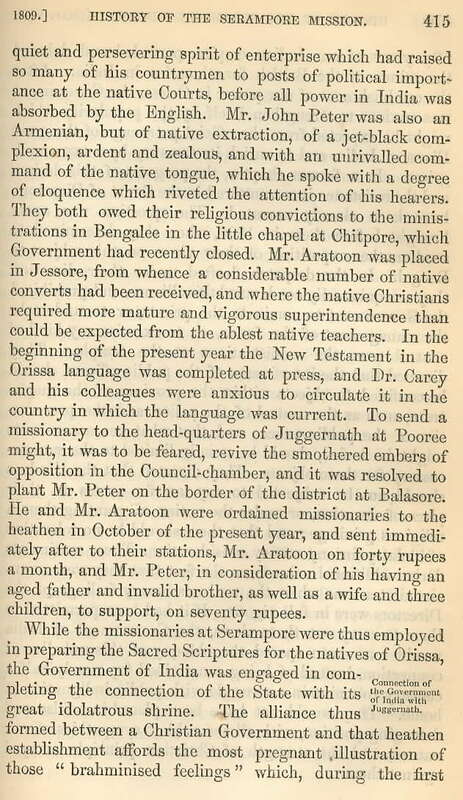 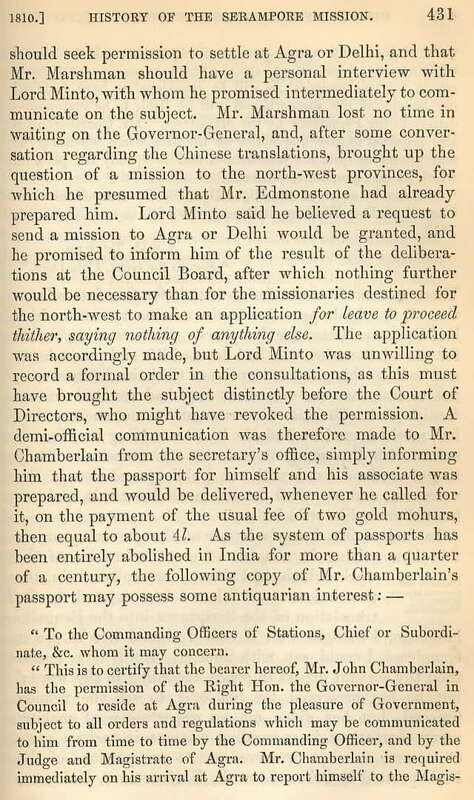 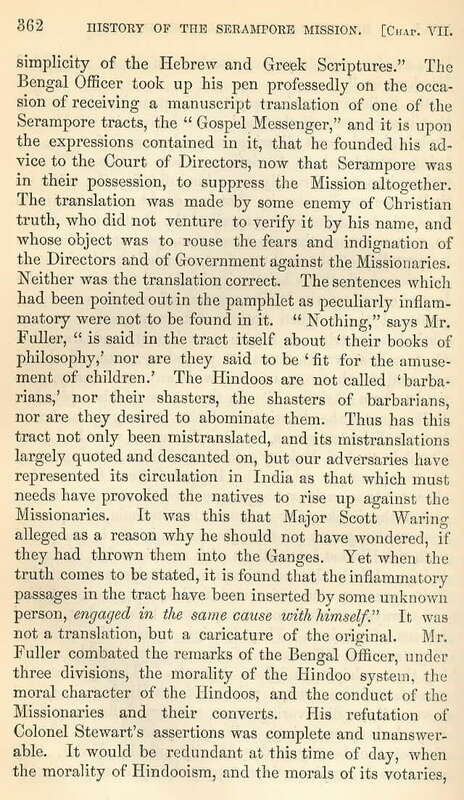 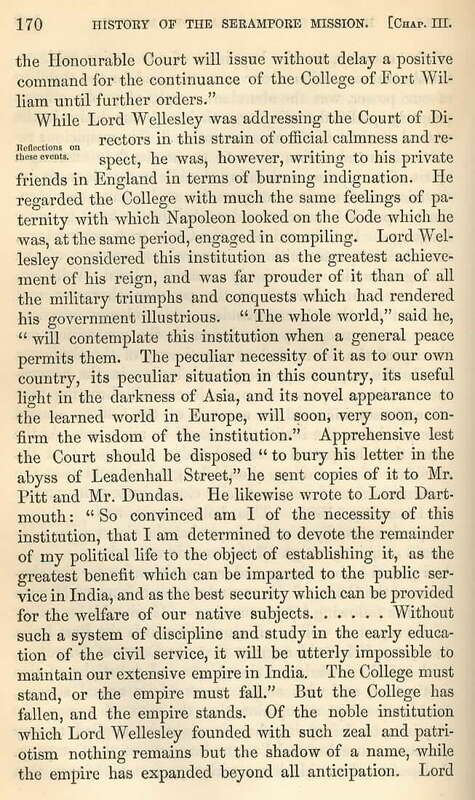 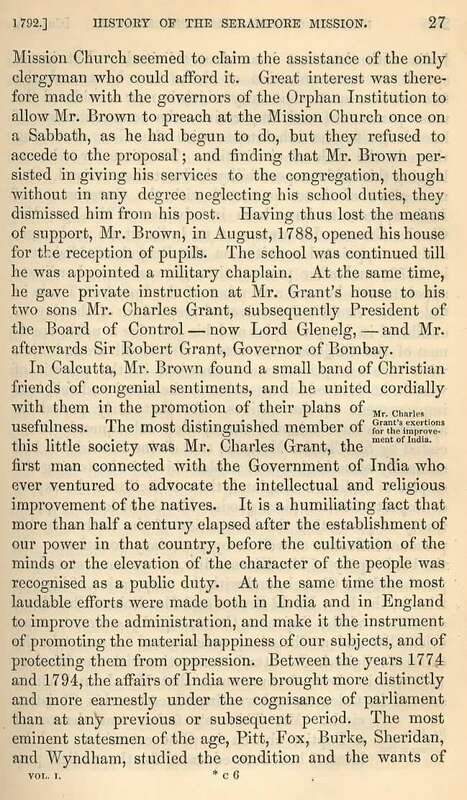 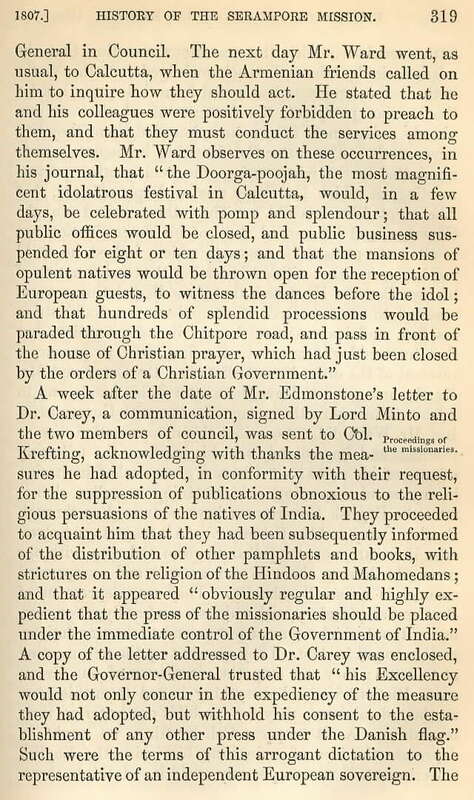 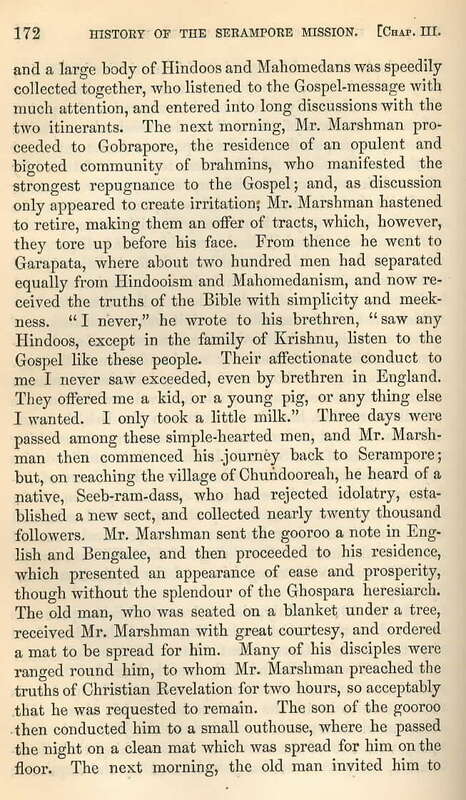 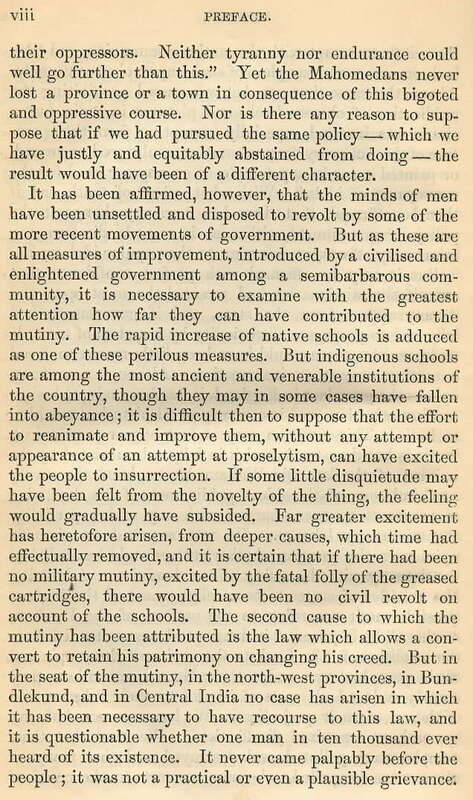 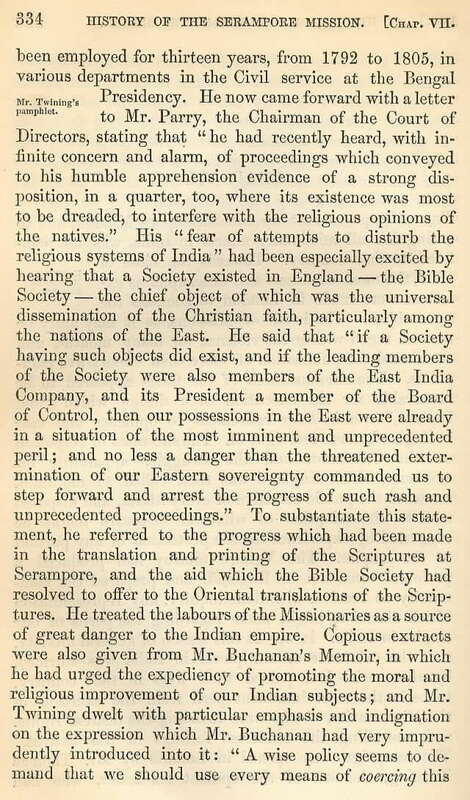 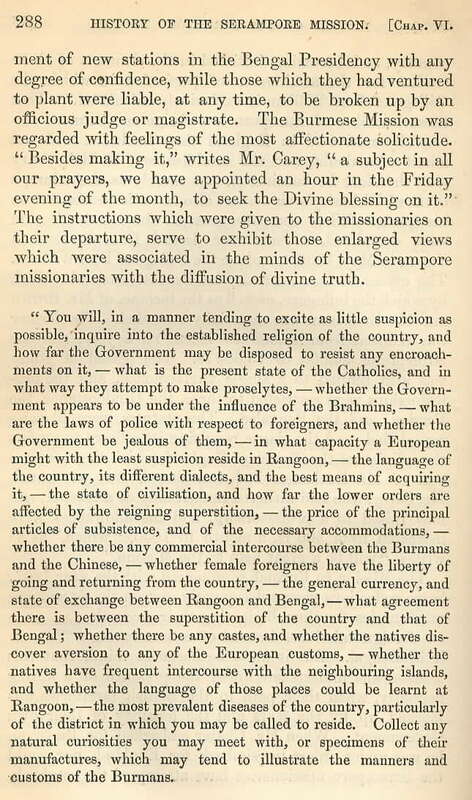 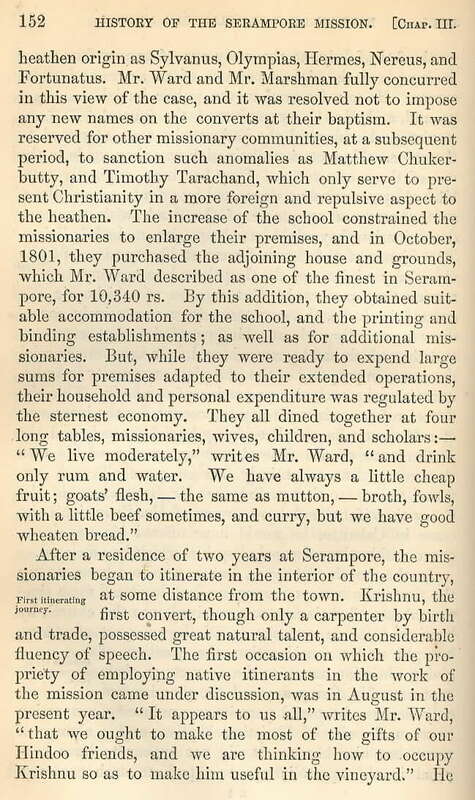 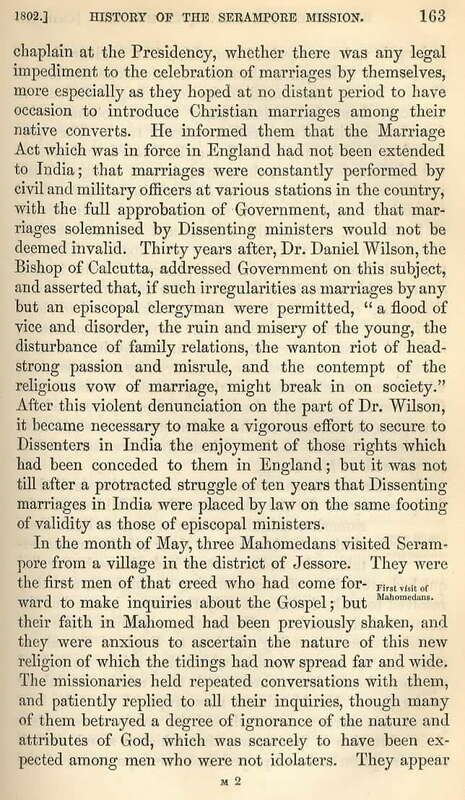 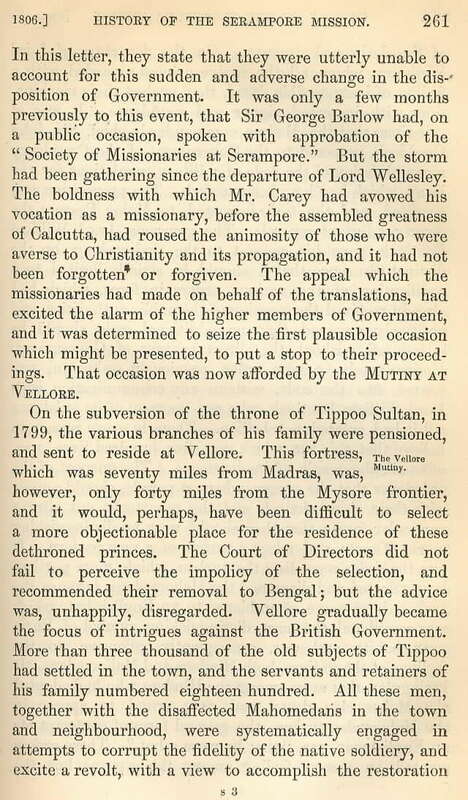 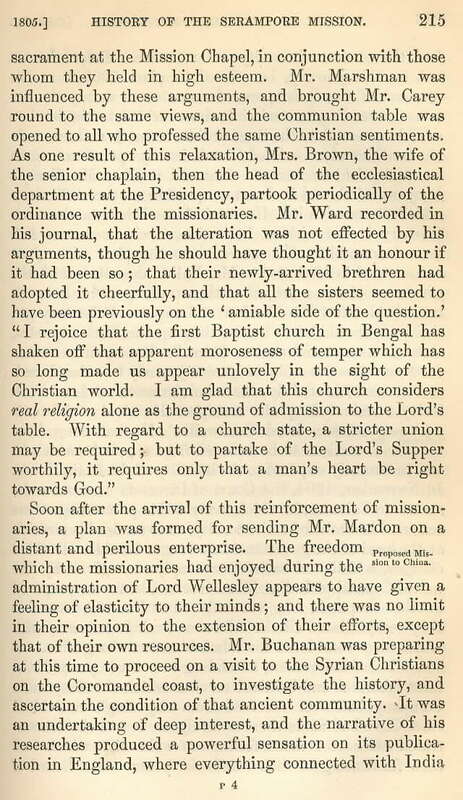 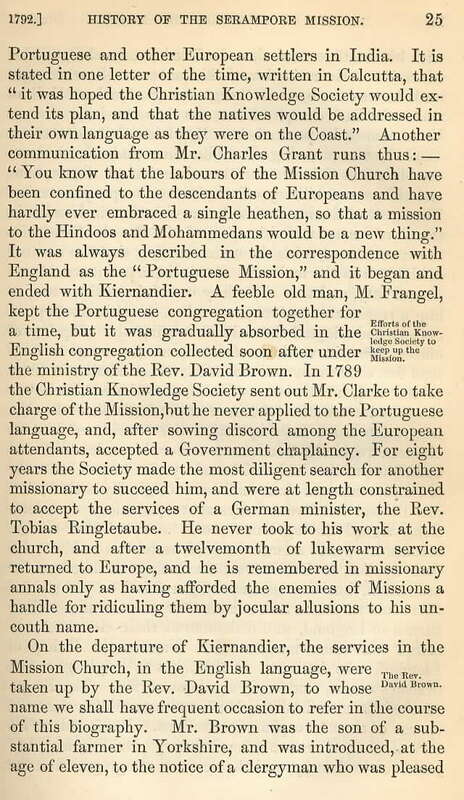 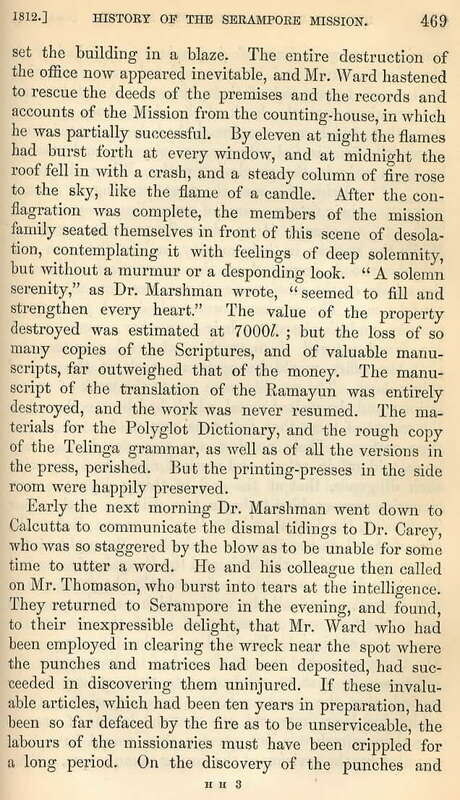 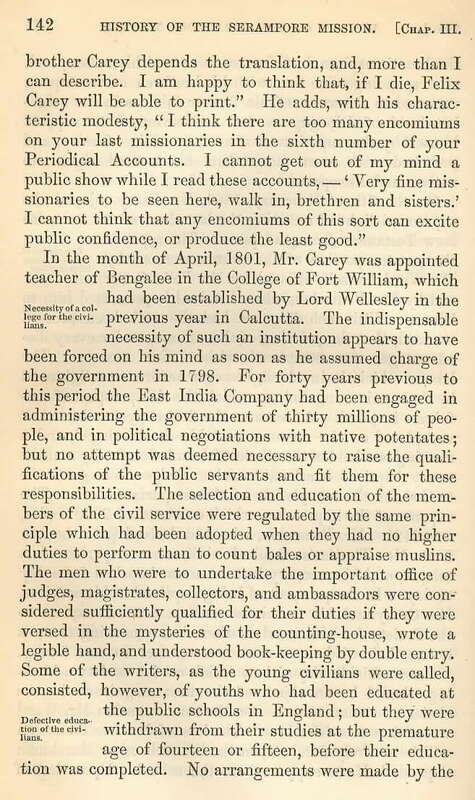 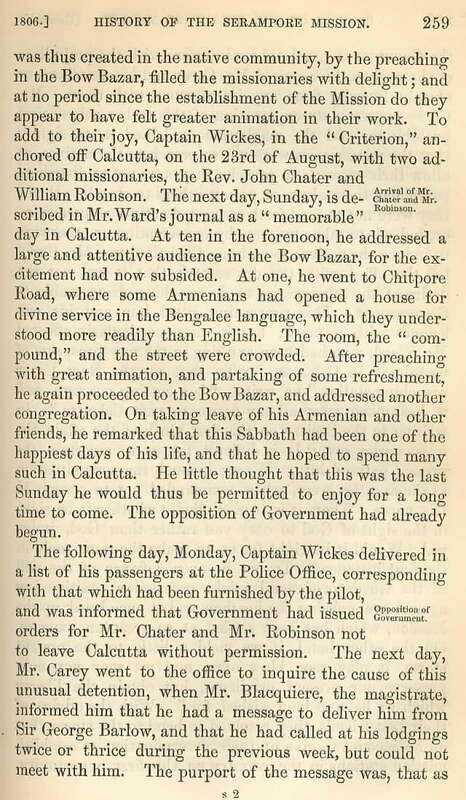 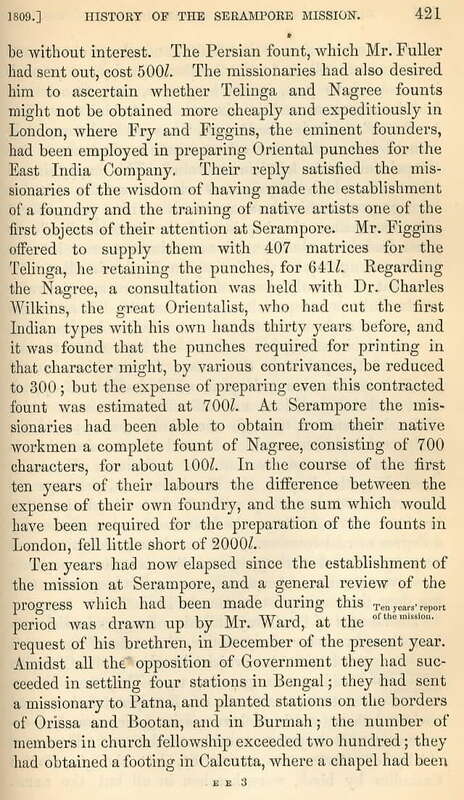 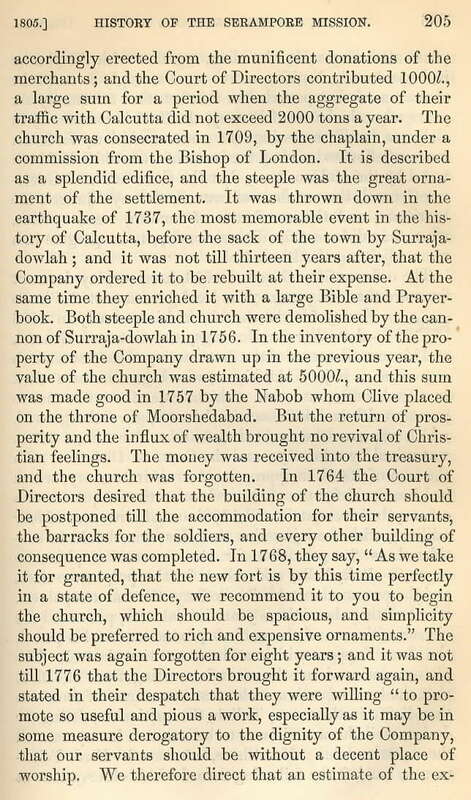 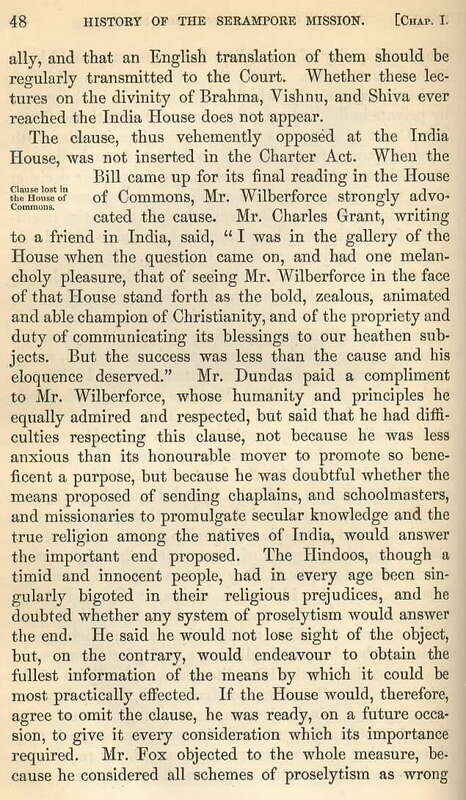 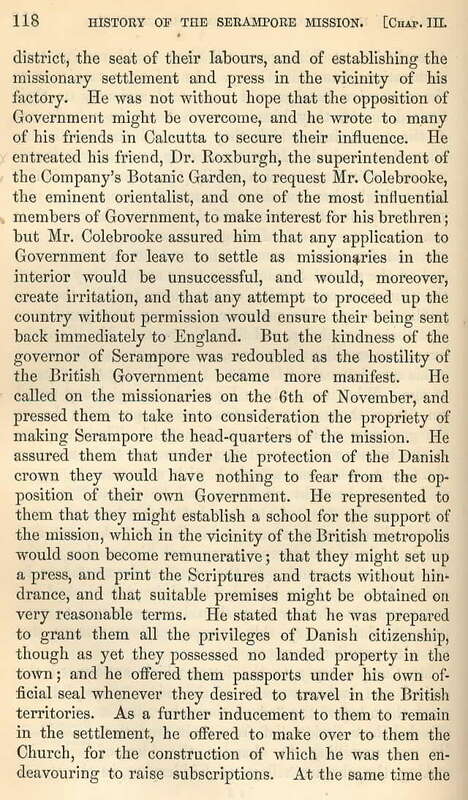 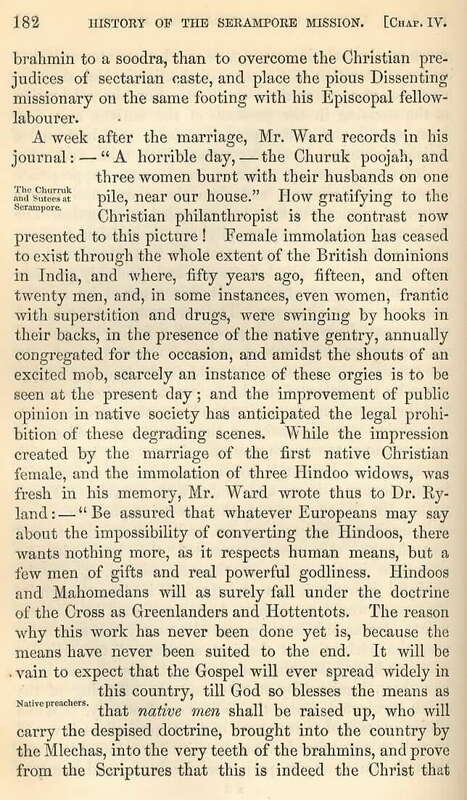 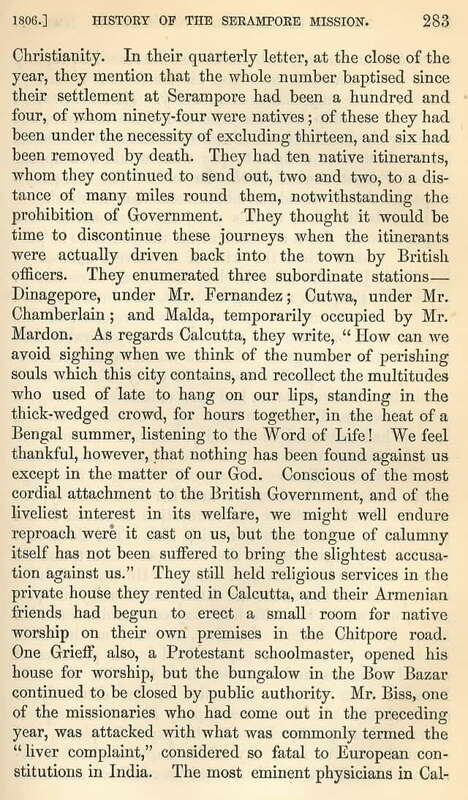 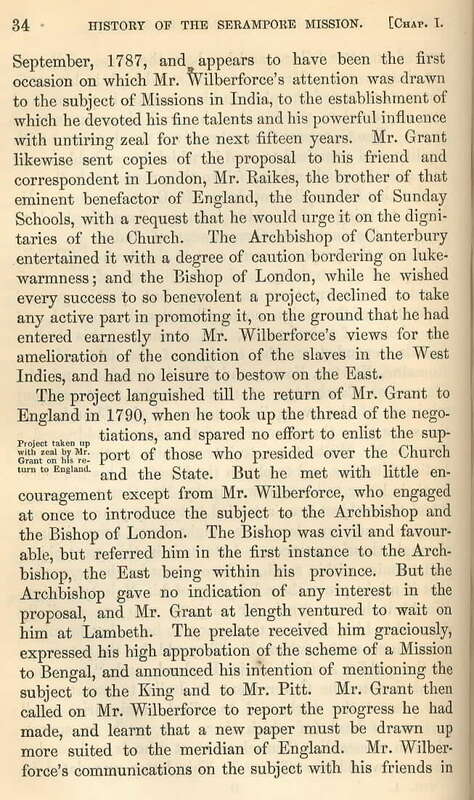 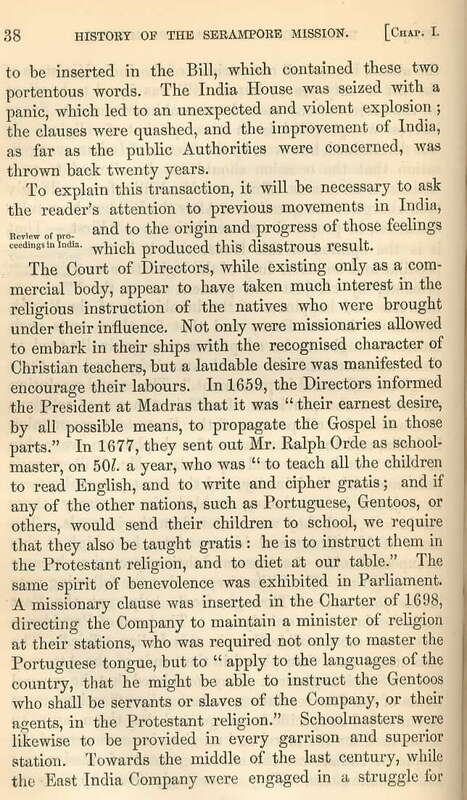 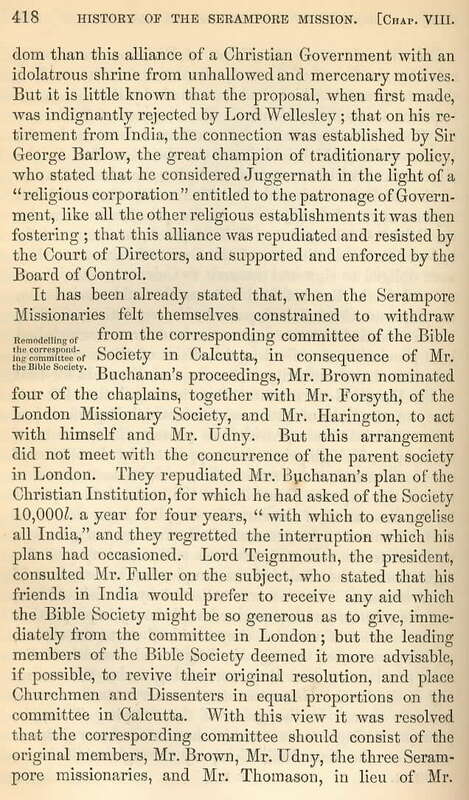 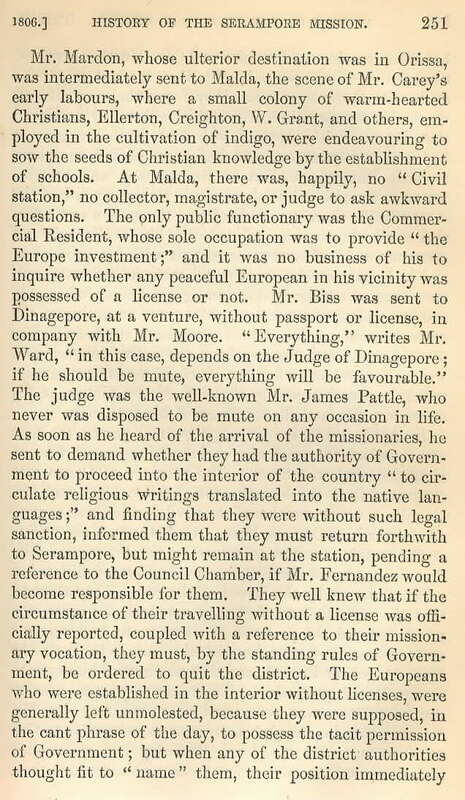 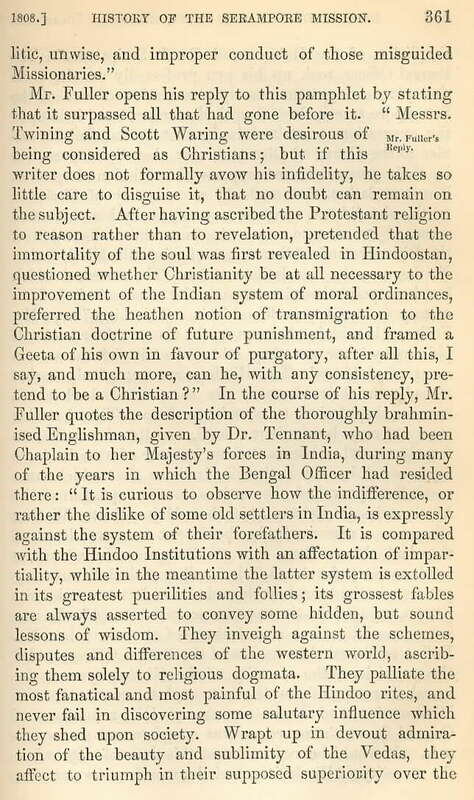 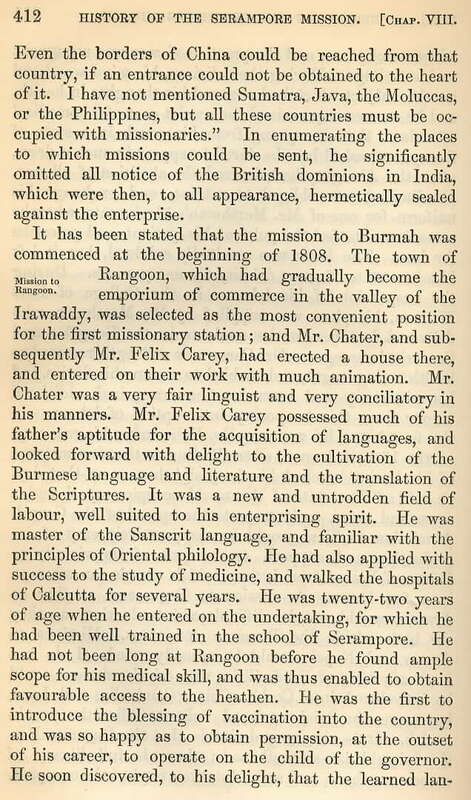 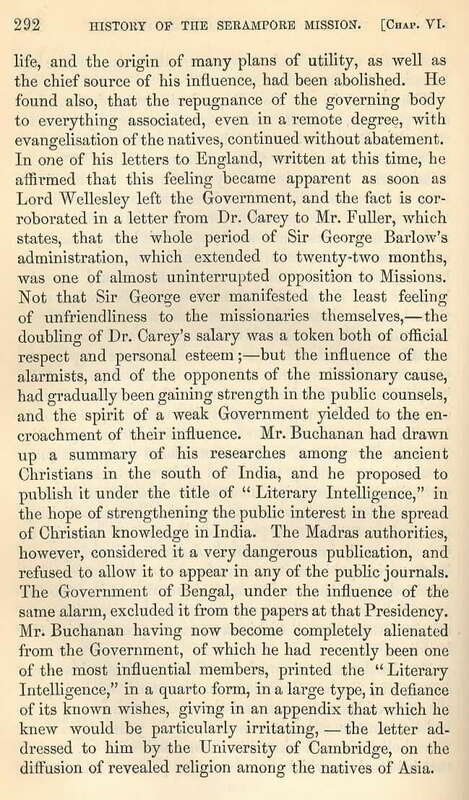 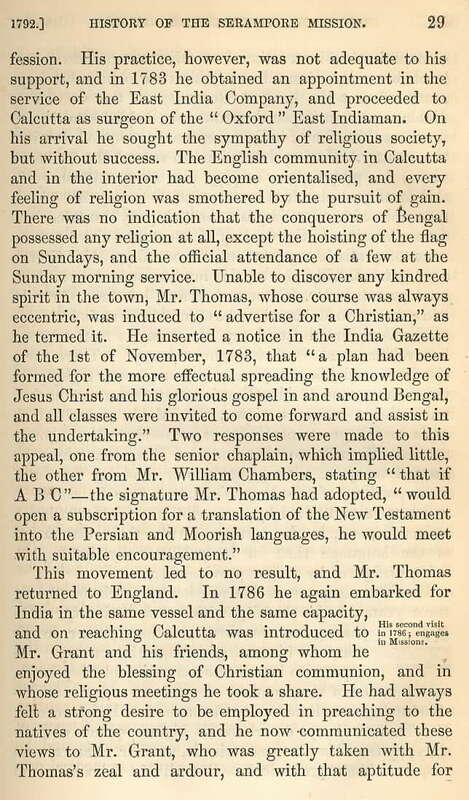 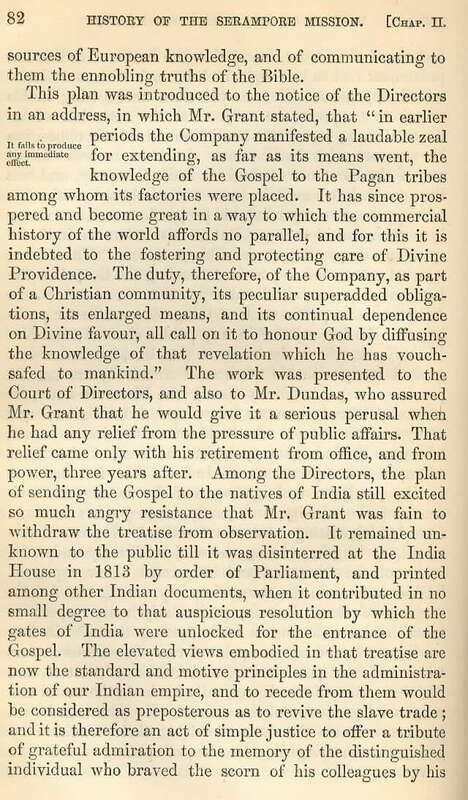 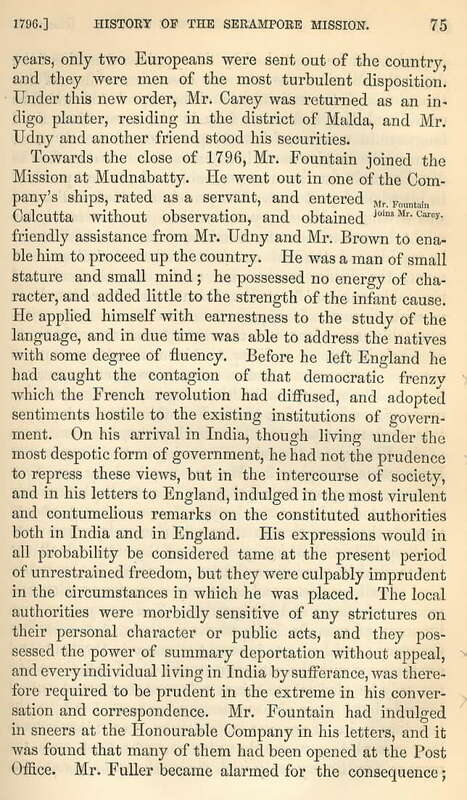 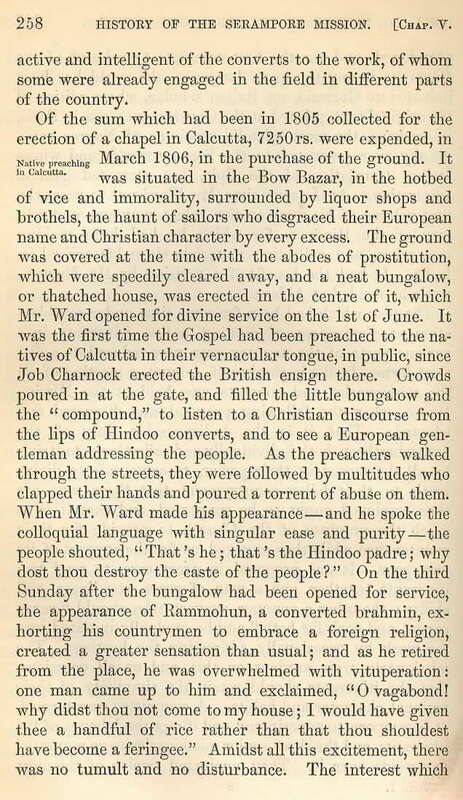 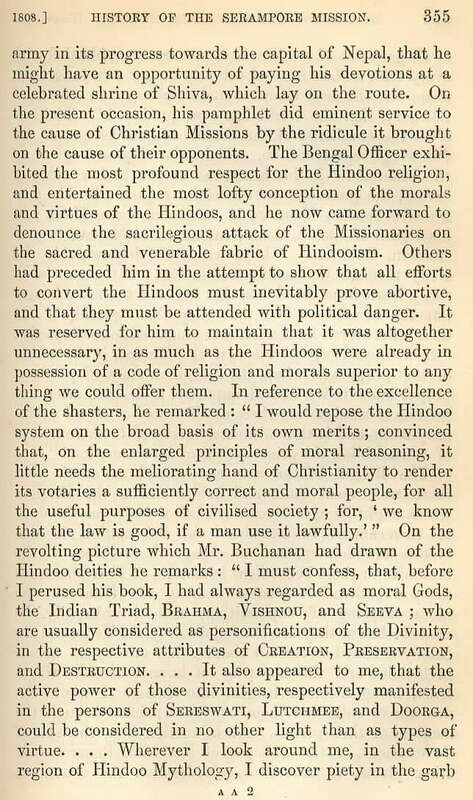 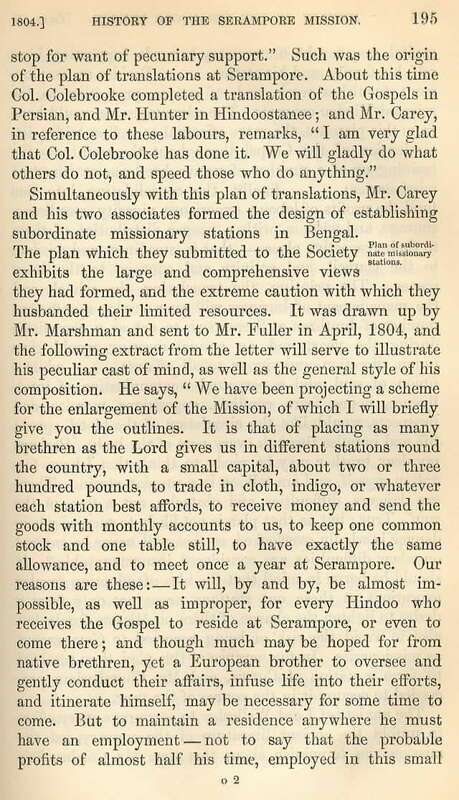 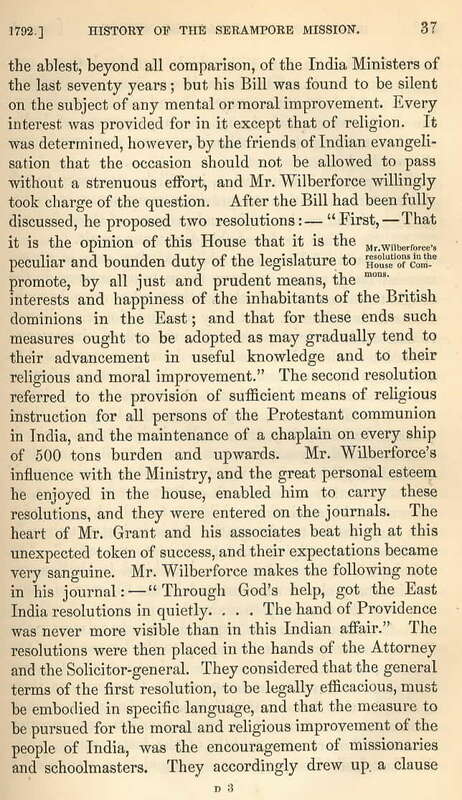 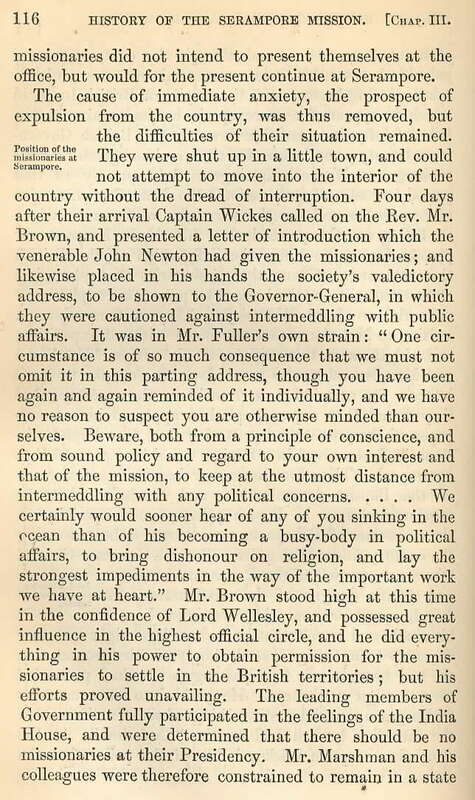 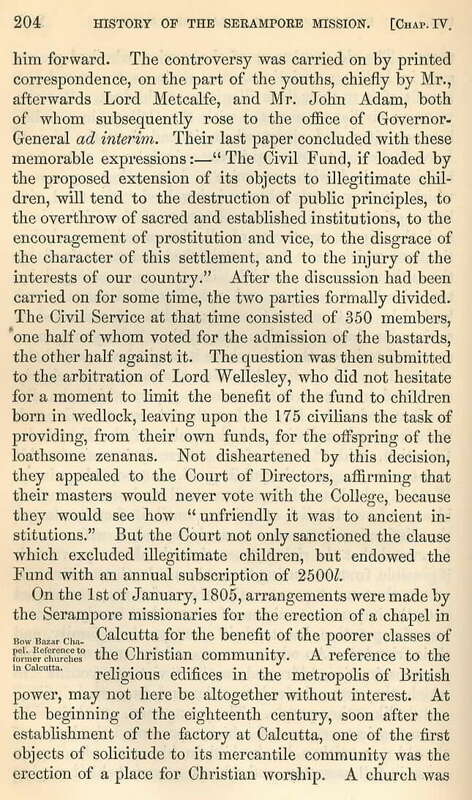 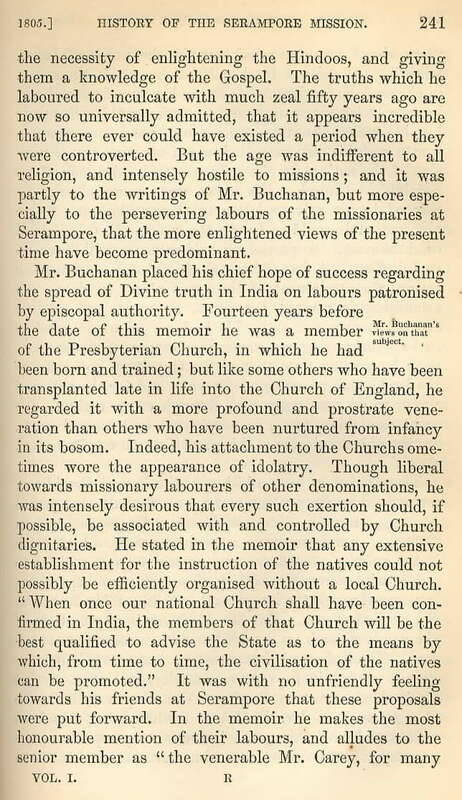 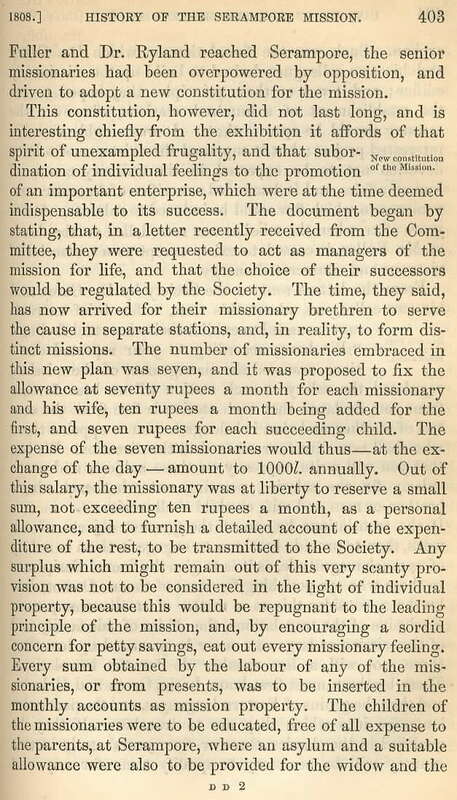 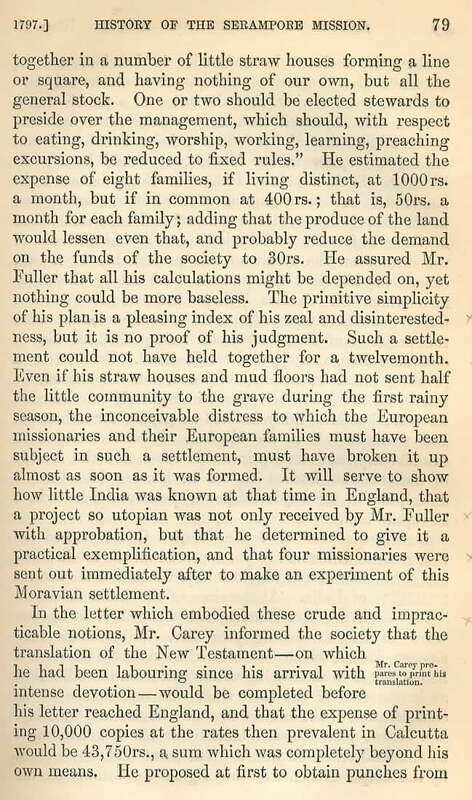 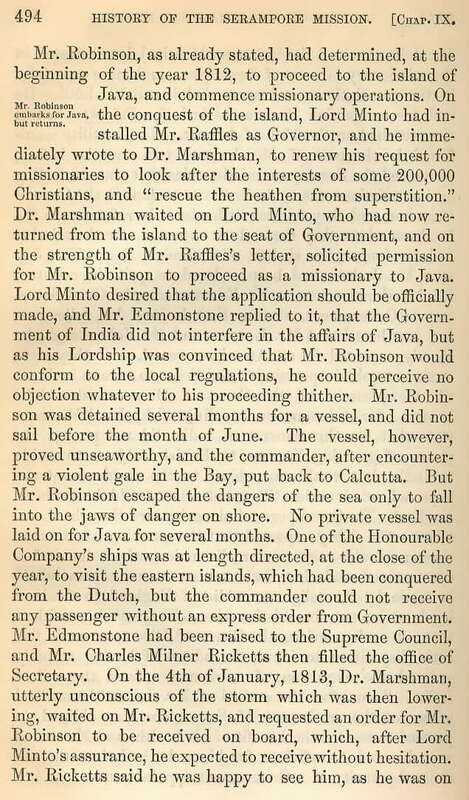 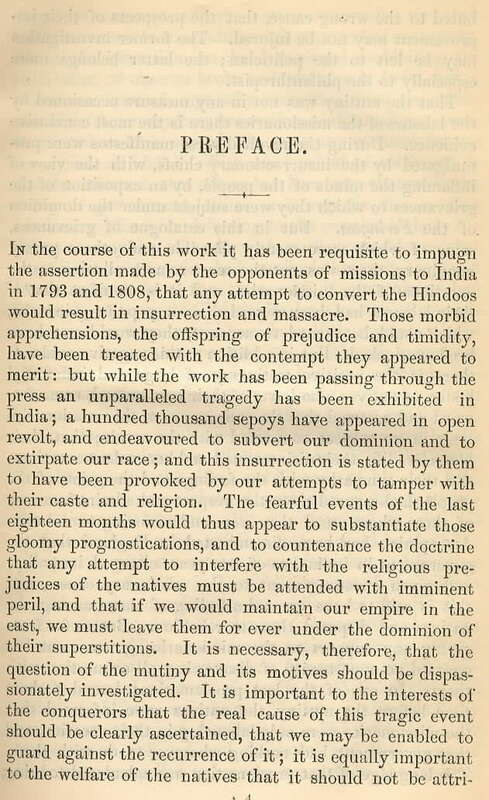 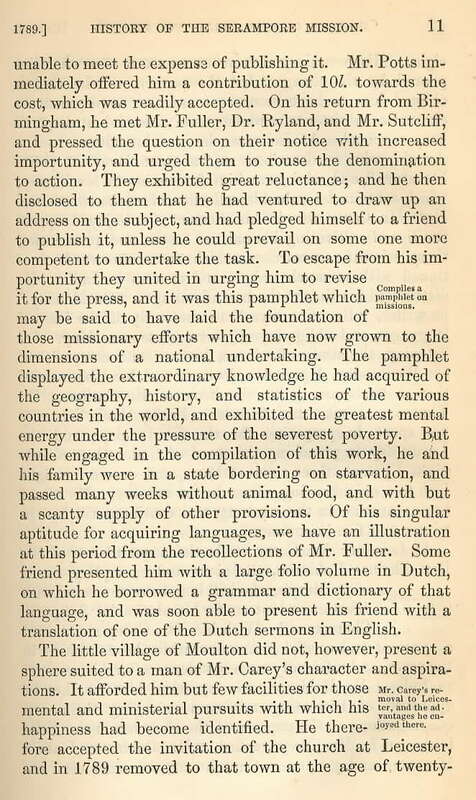 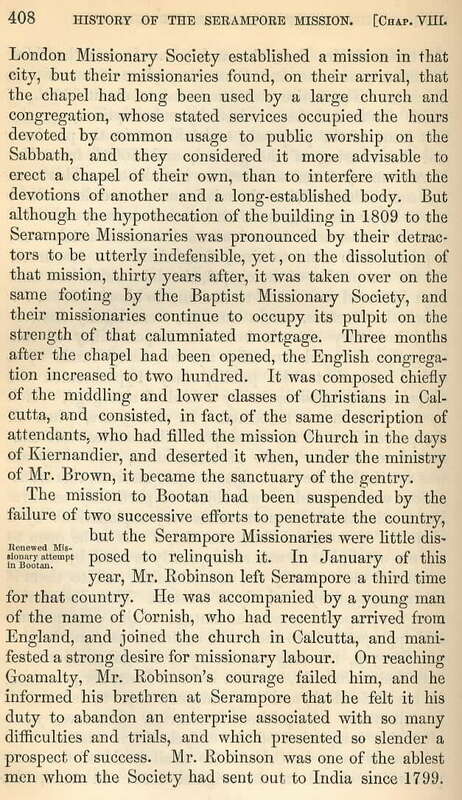 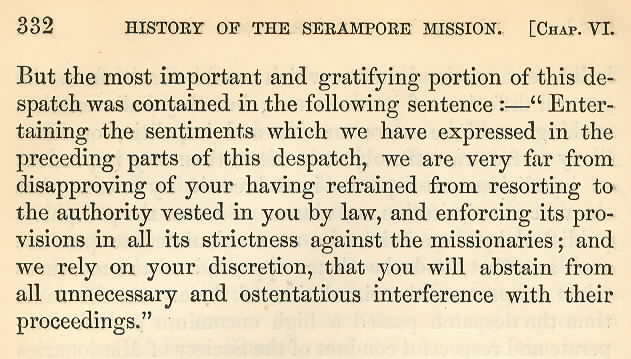 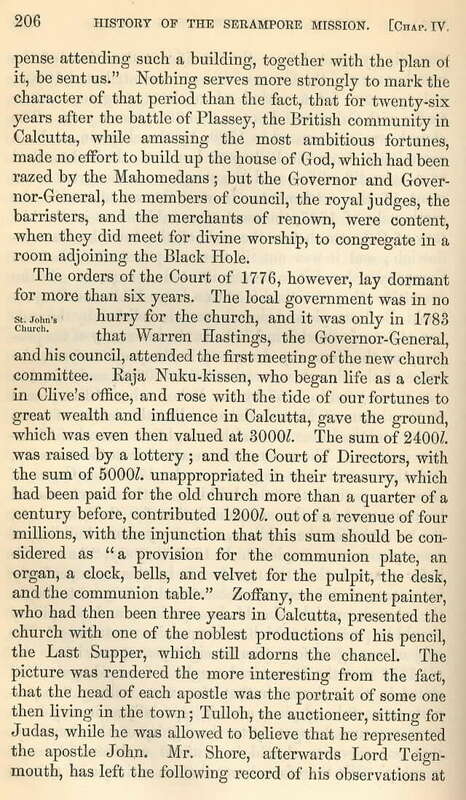 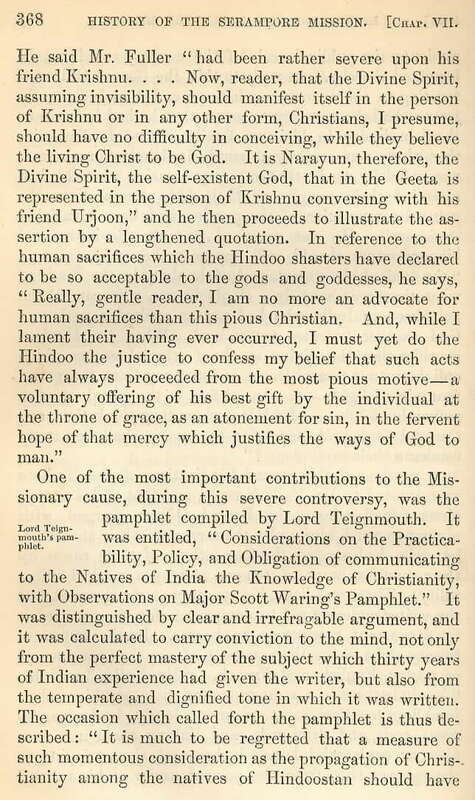 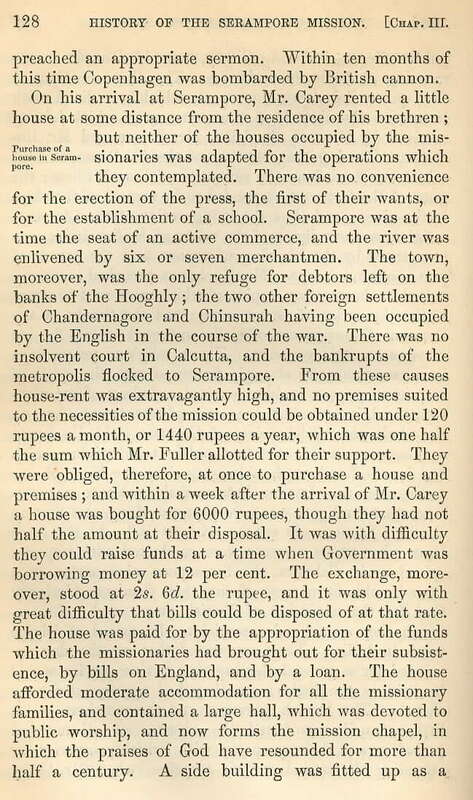 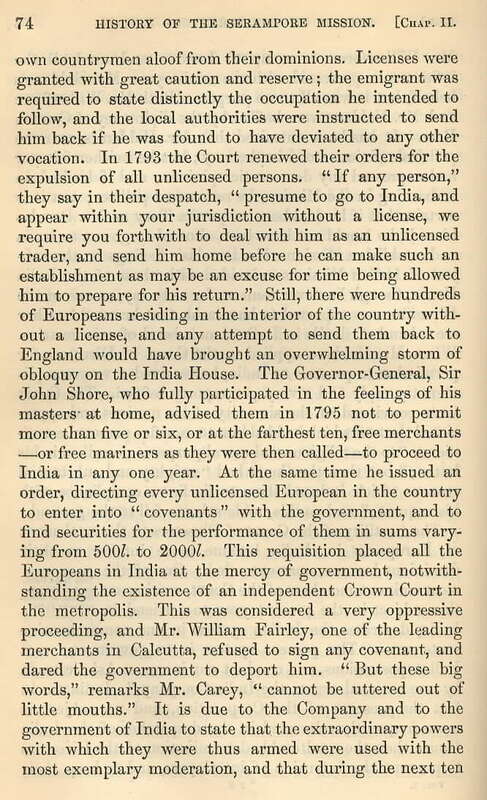 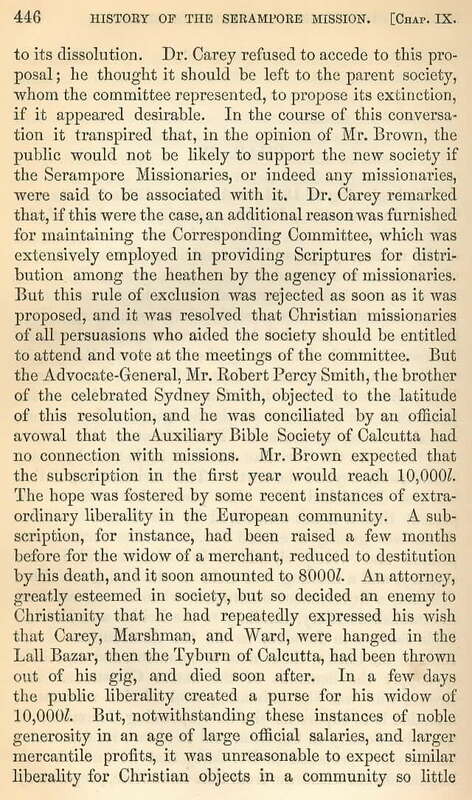 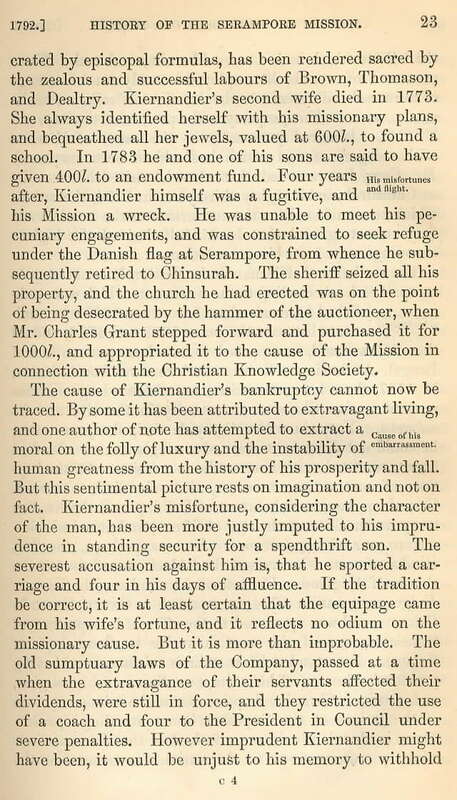 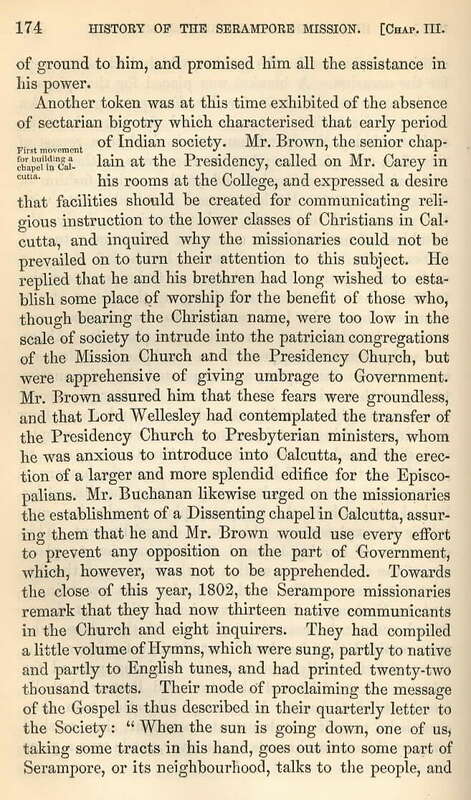 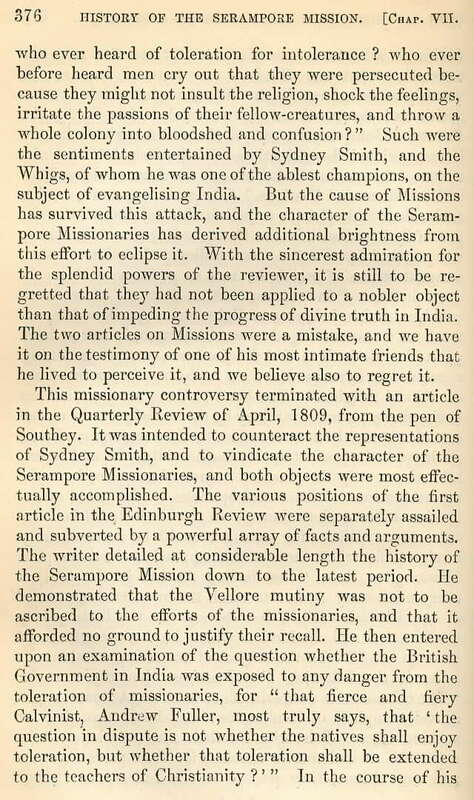 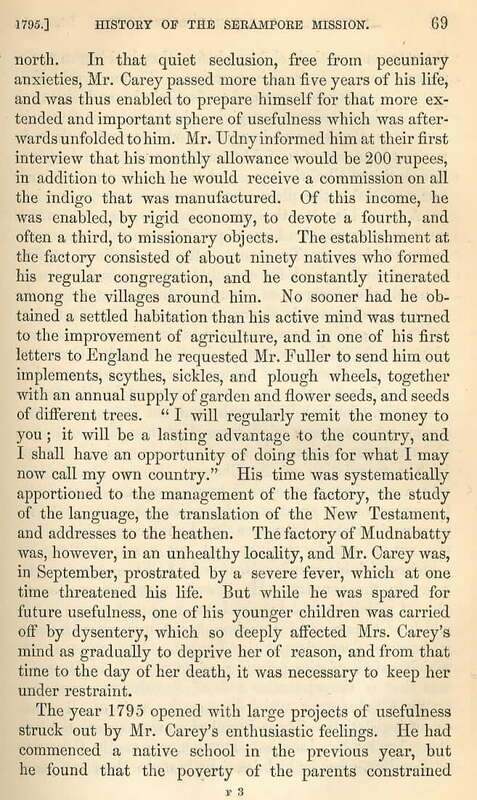 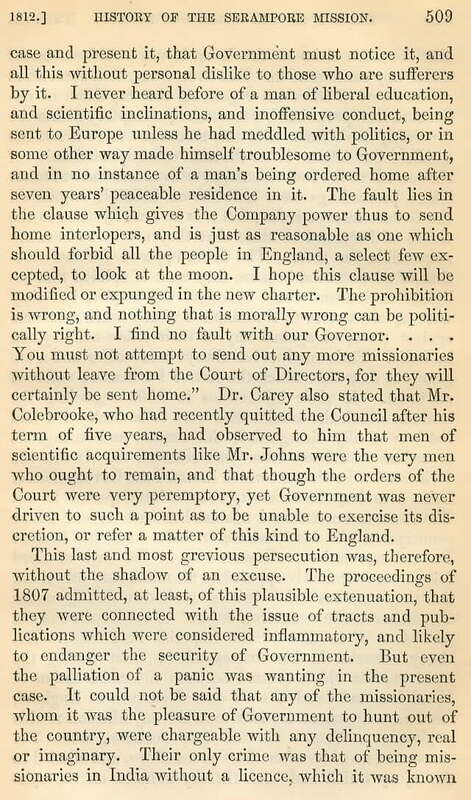 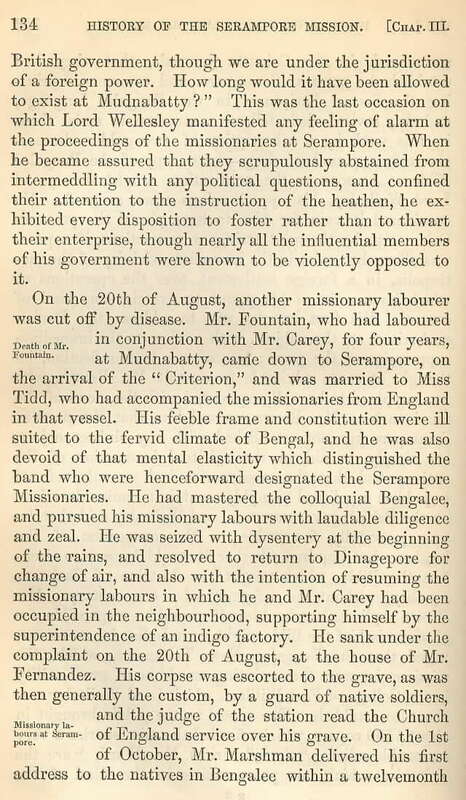 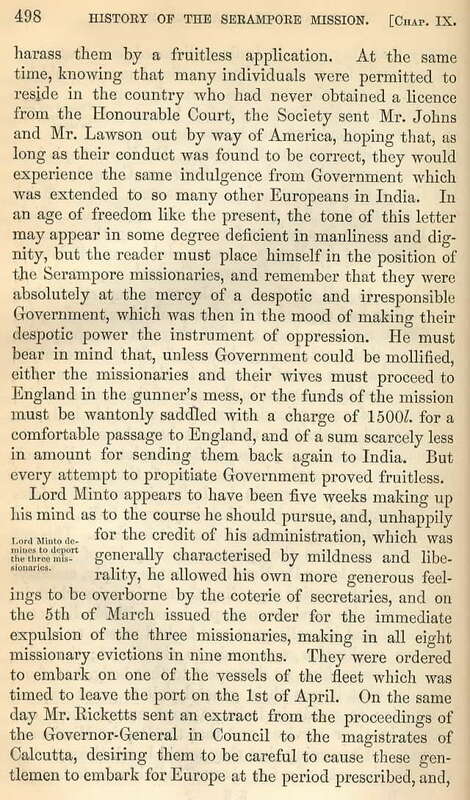 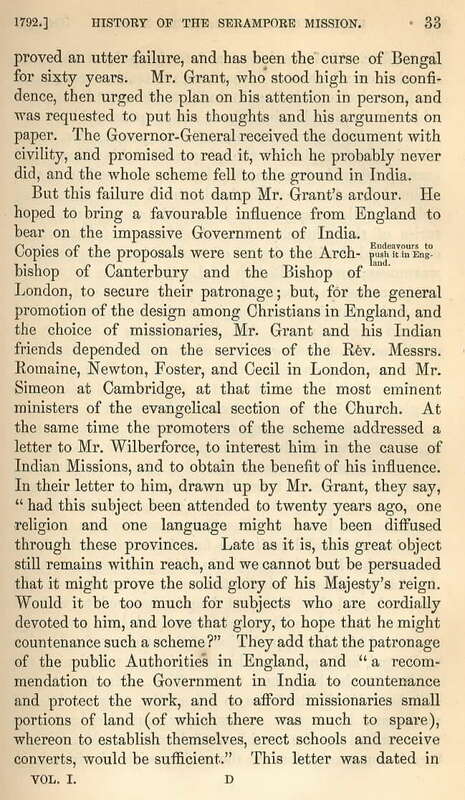 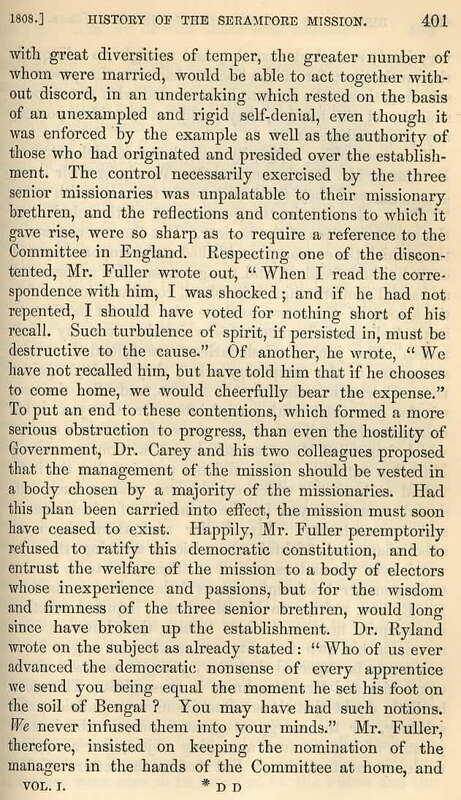 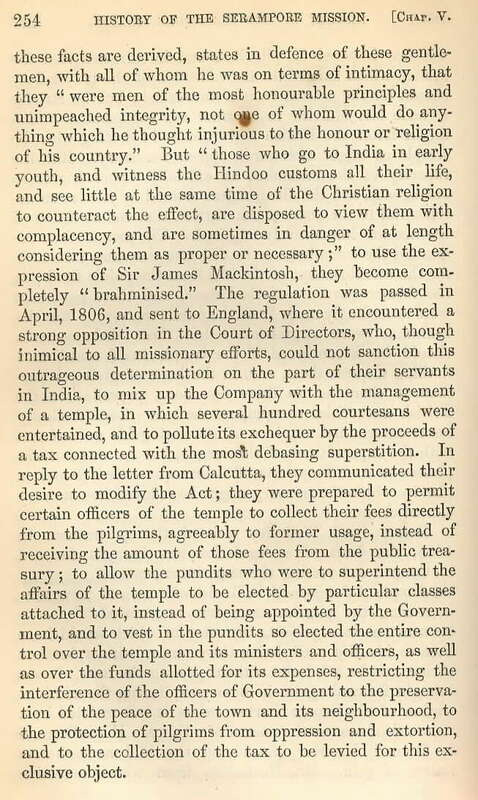 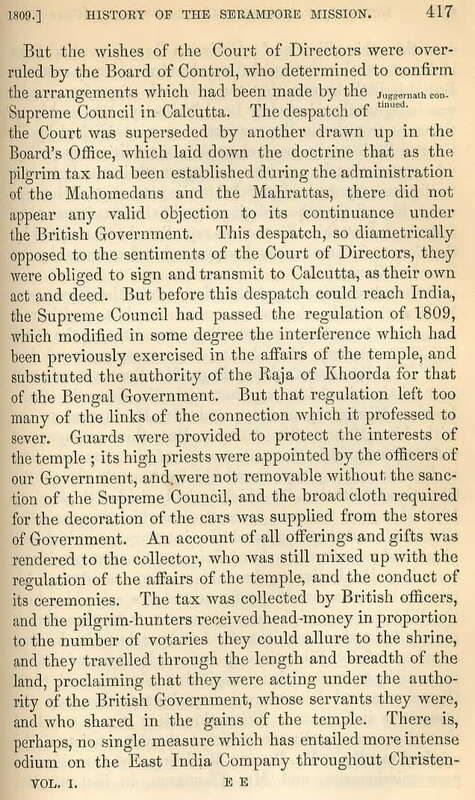 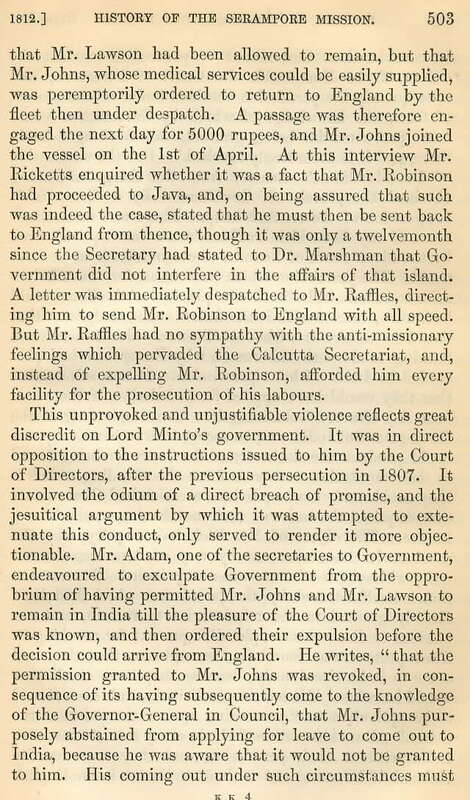 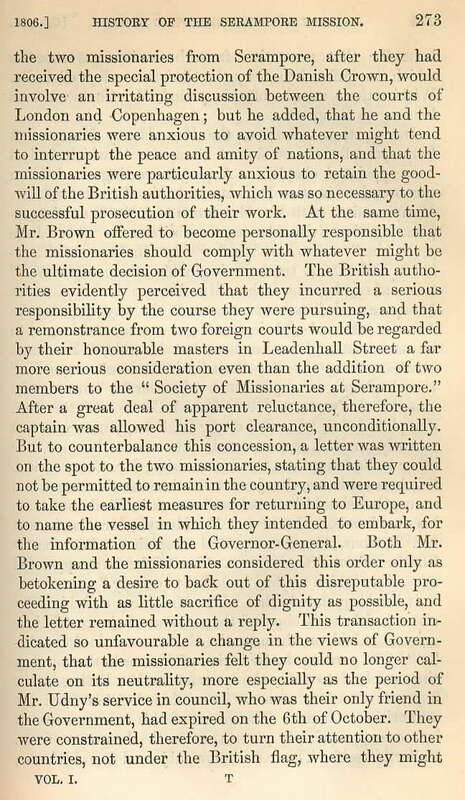 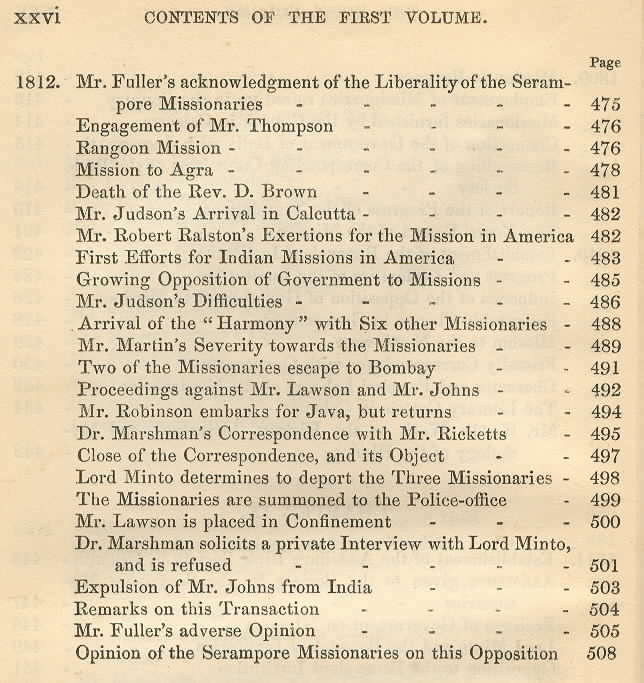 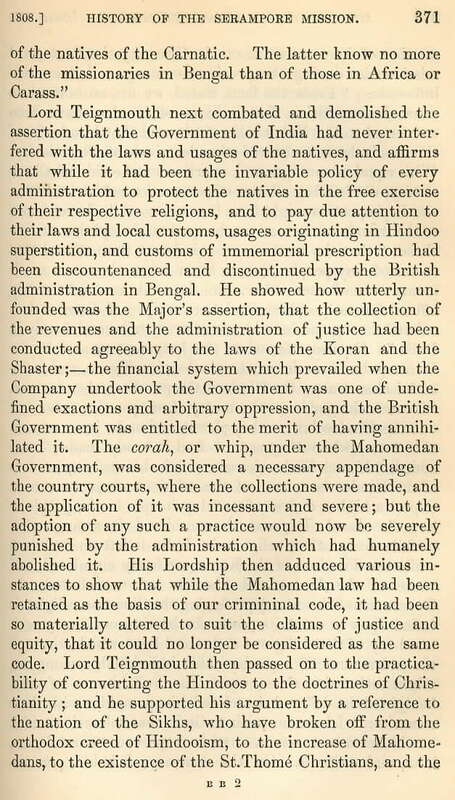 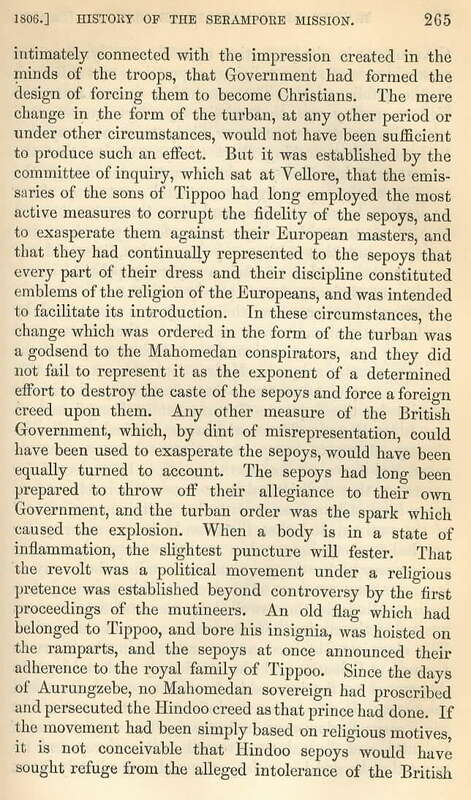 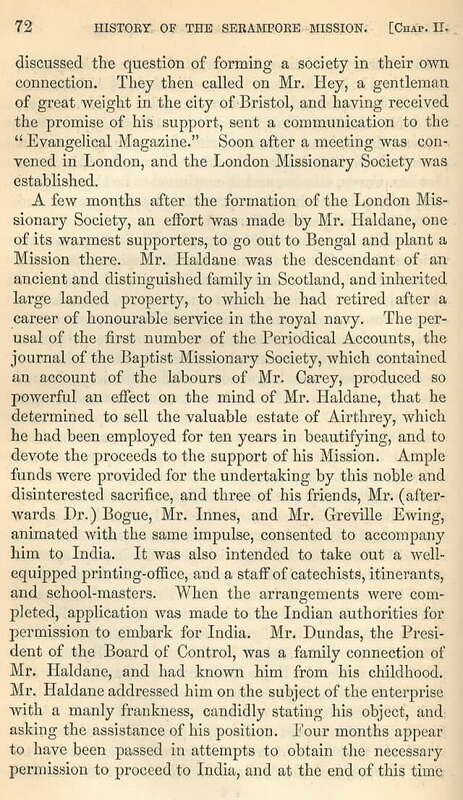 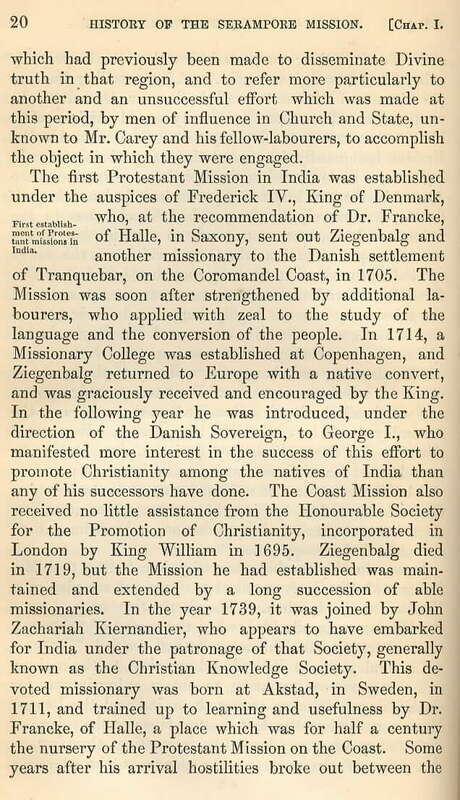 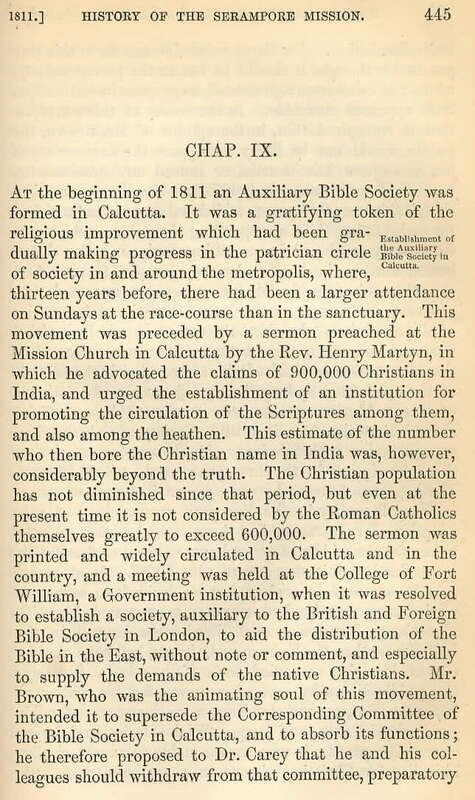 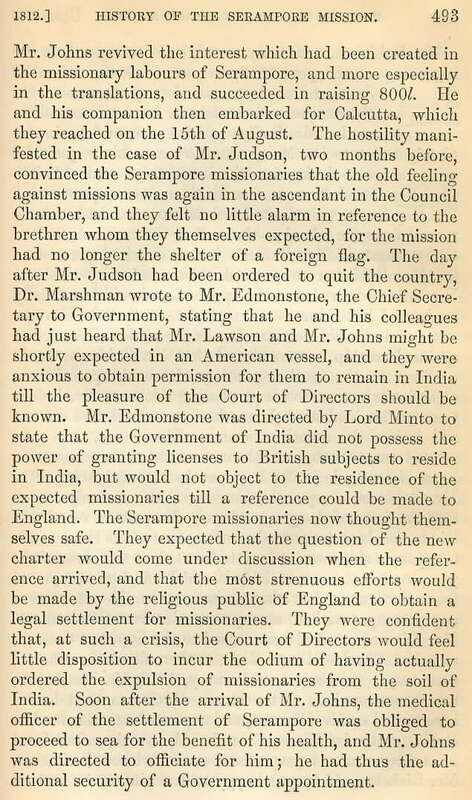 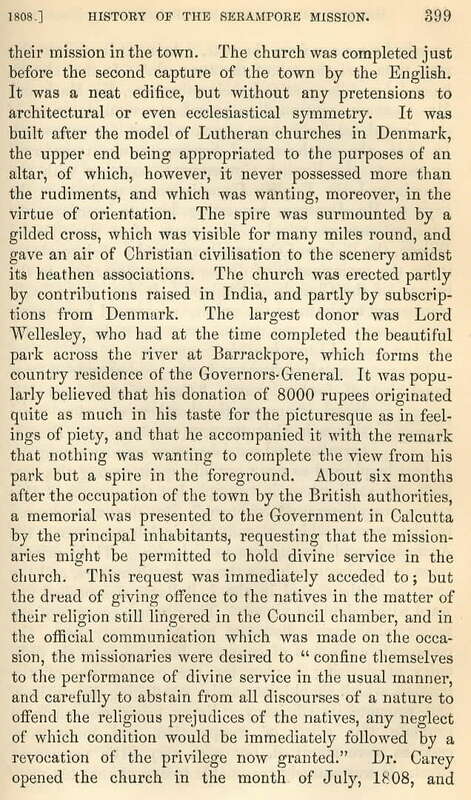 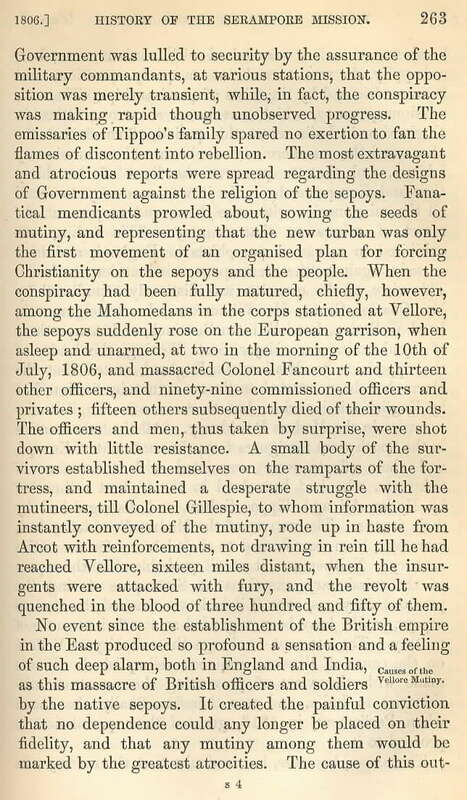 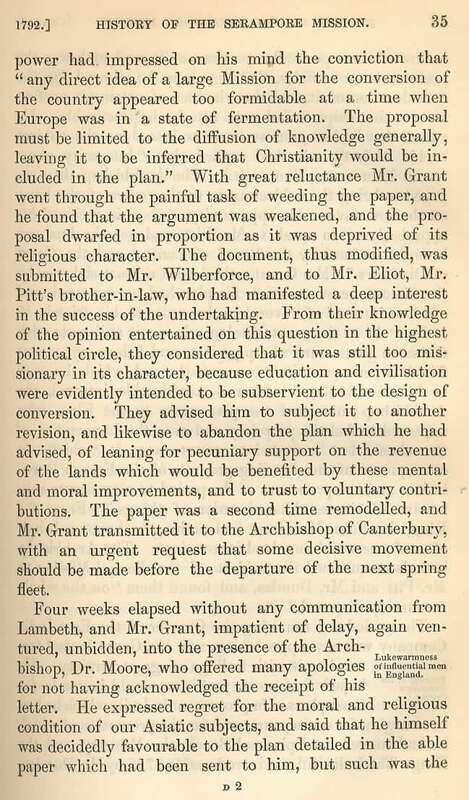 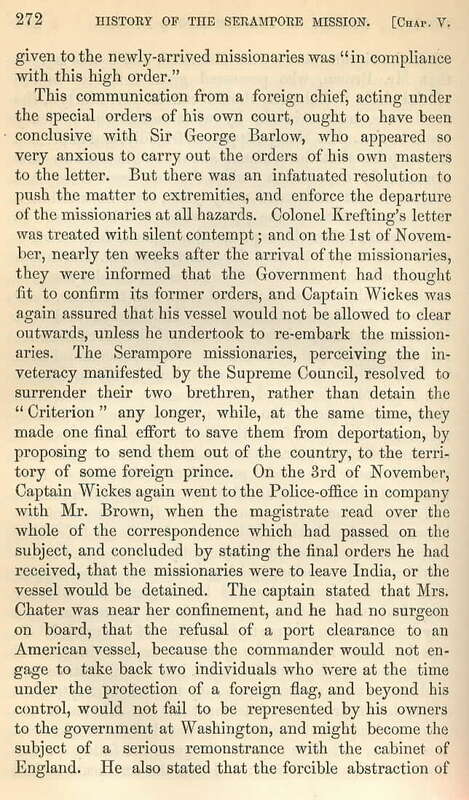 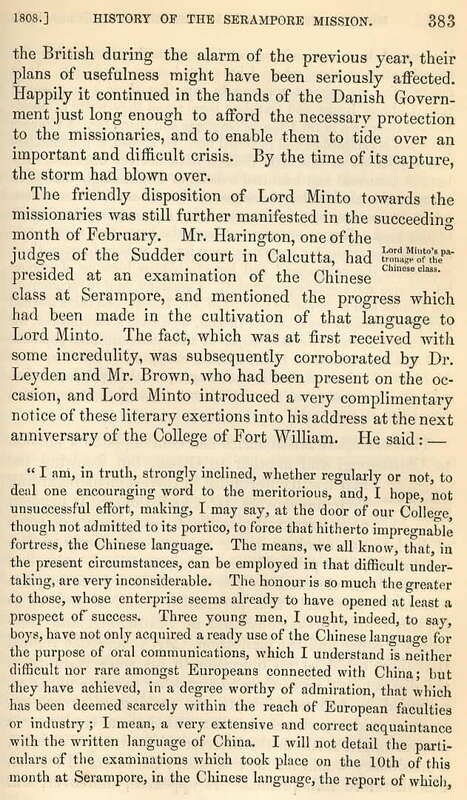 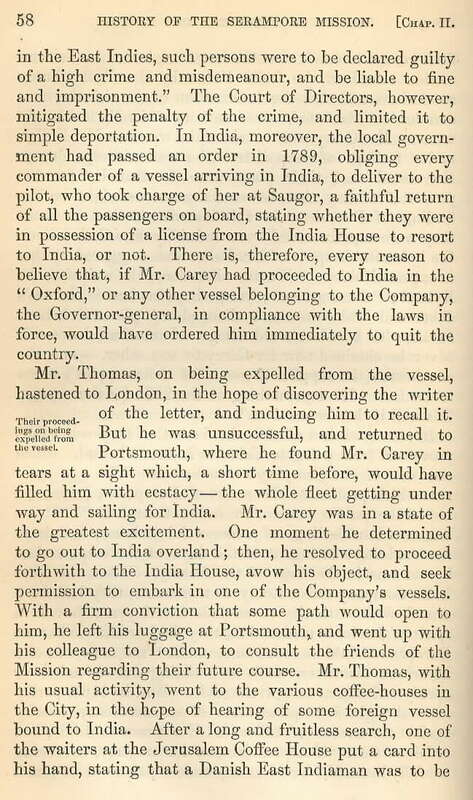 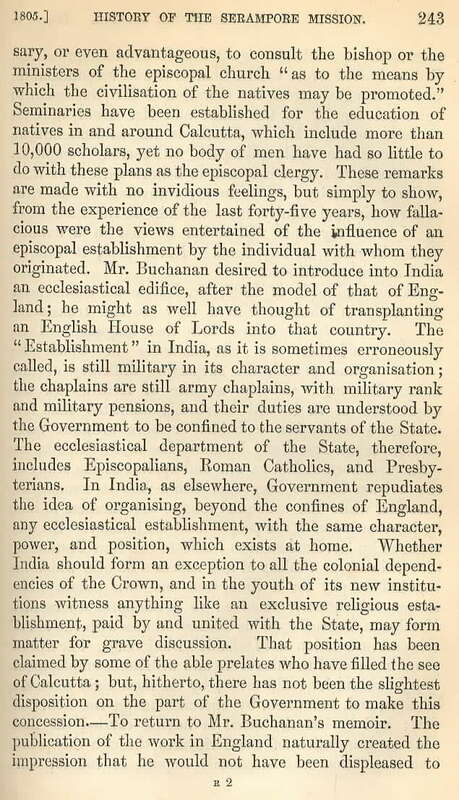 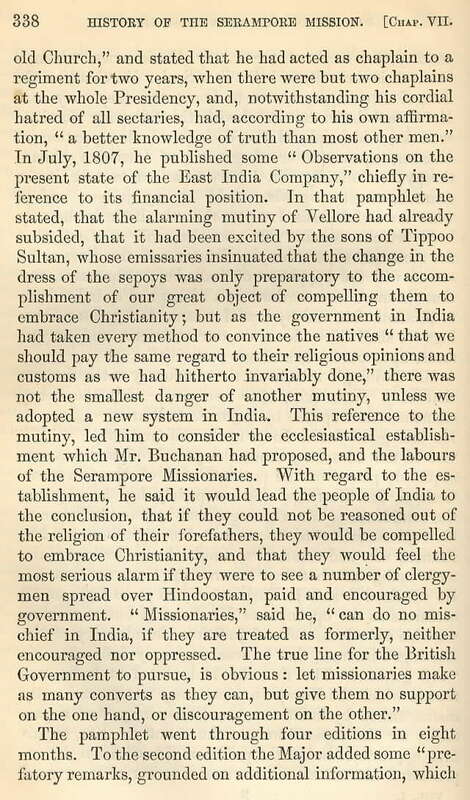 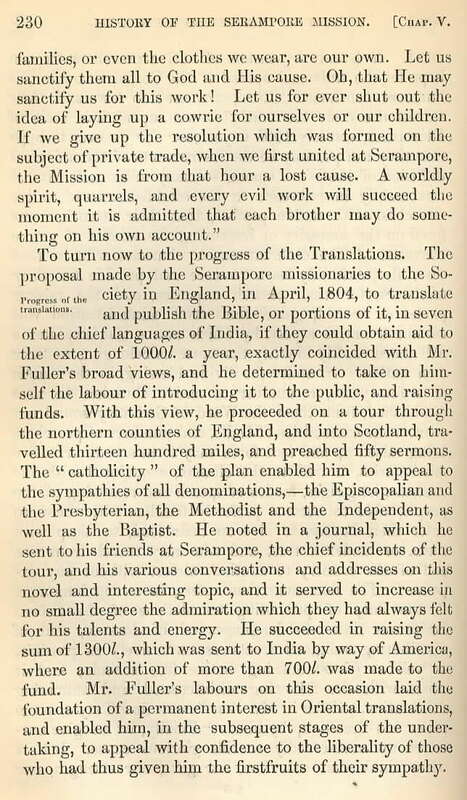 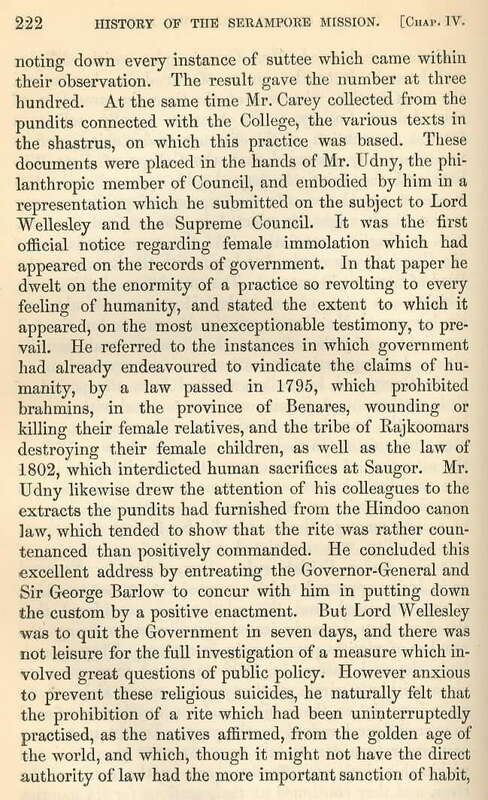 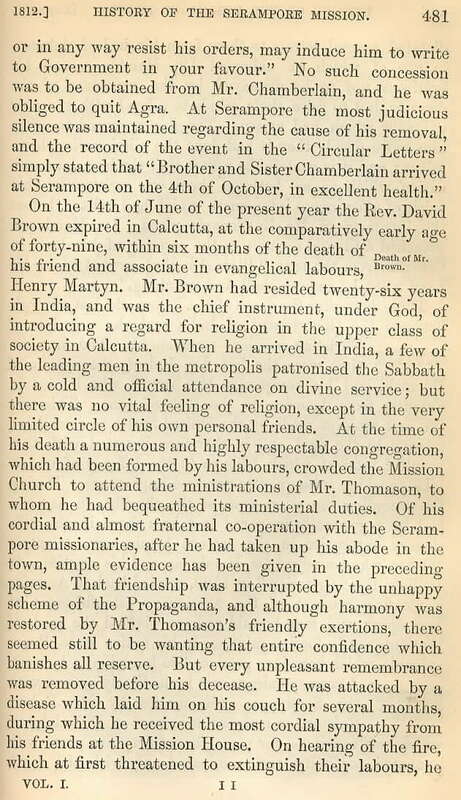 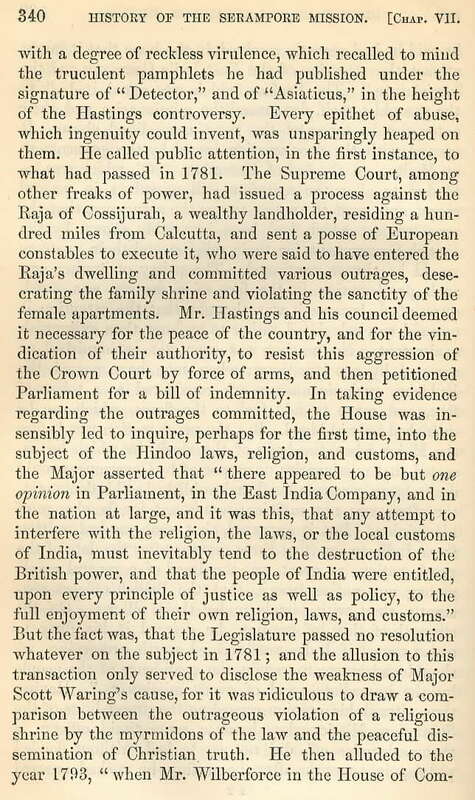 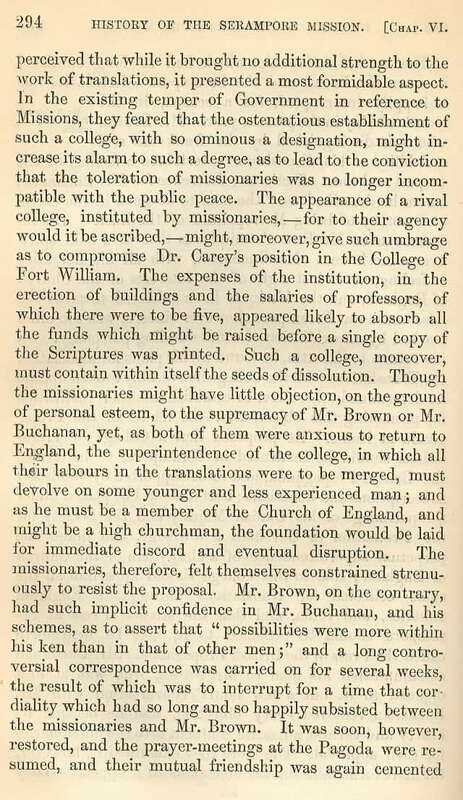 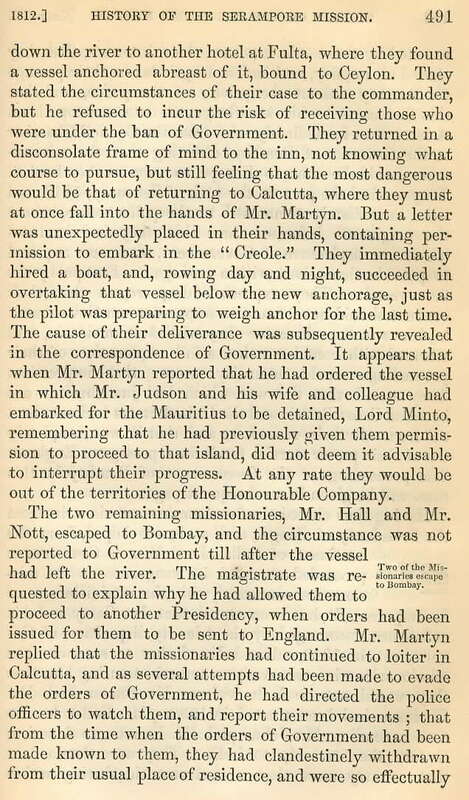 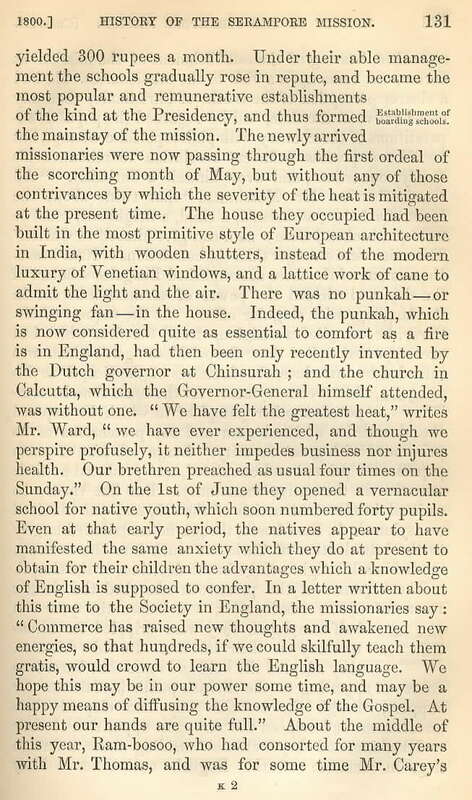 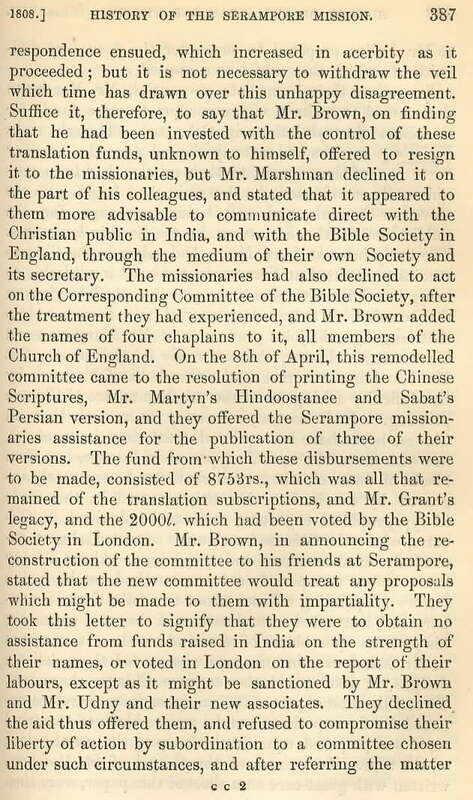 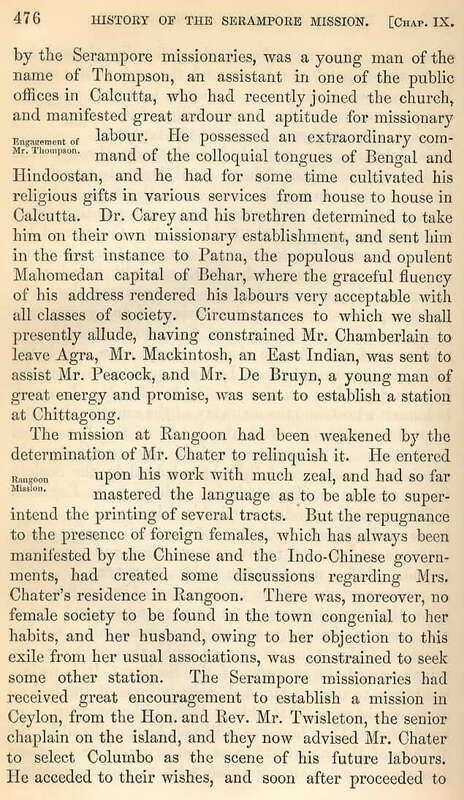 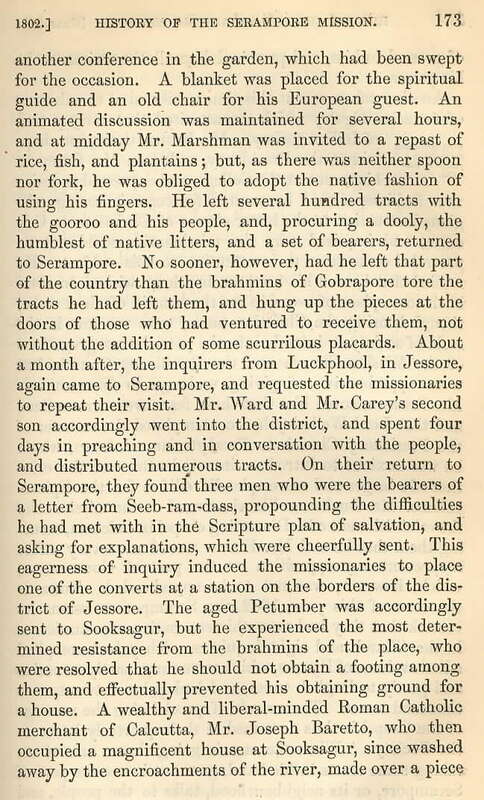 Embracing the History of the Serampore Mission, 2 vols., (London: Longman, Brown, Green, Longmans & Roberts, 1859). 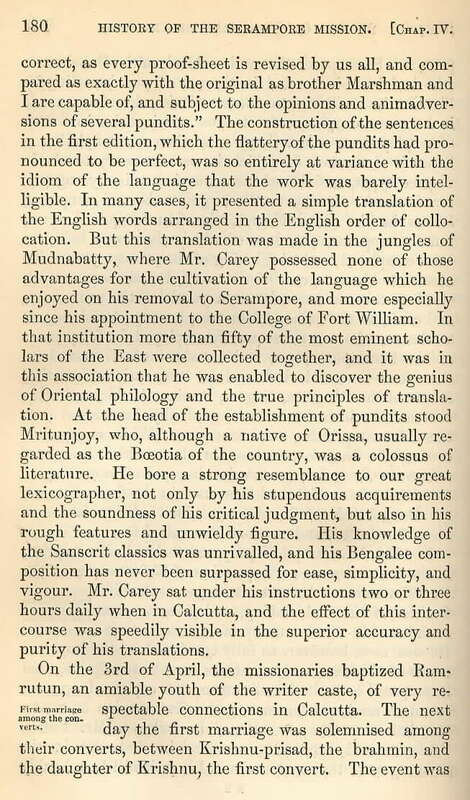 To read this review, click on the following links: 145 146-147 148-149 150 .